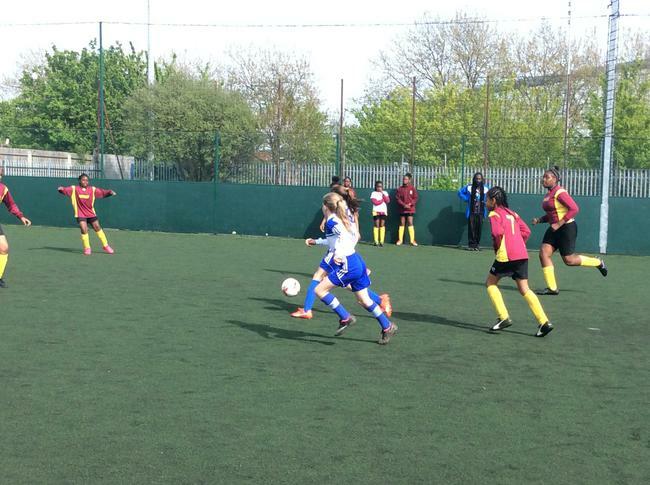 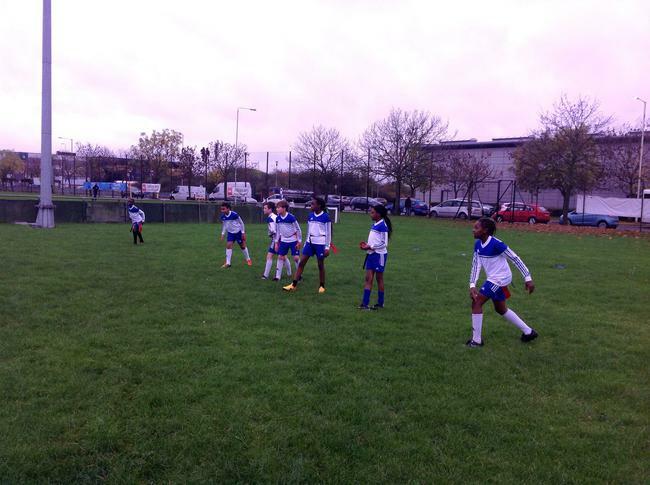 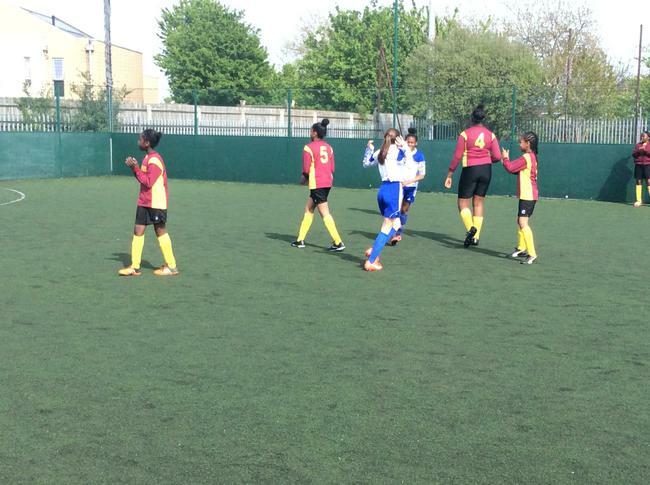 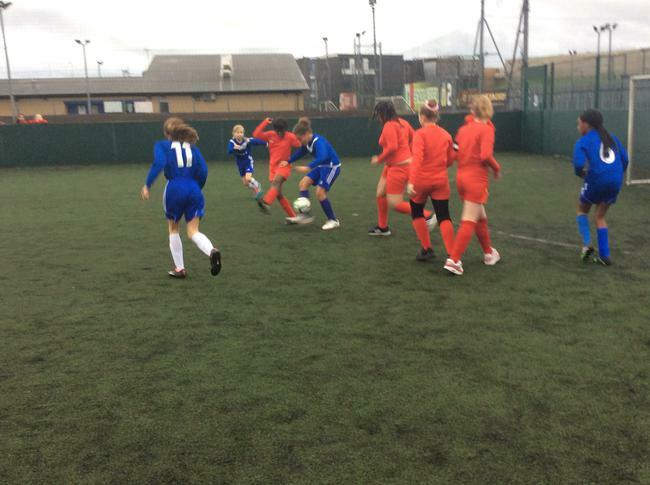 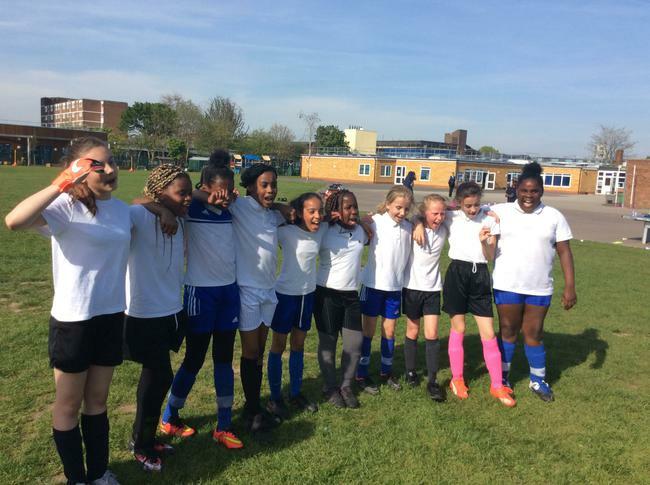 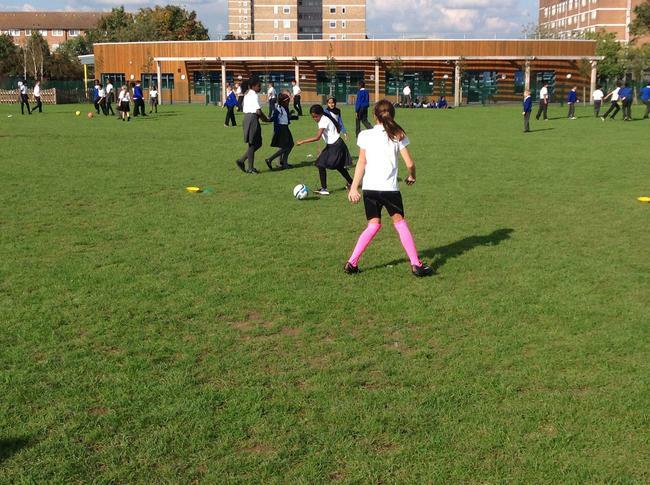 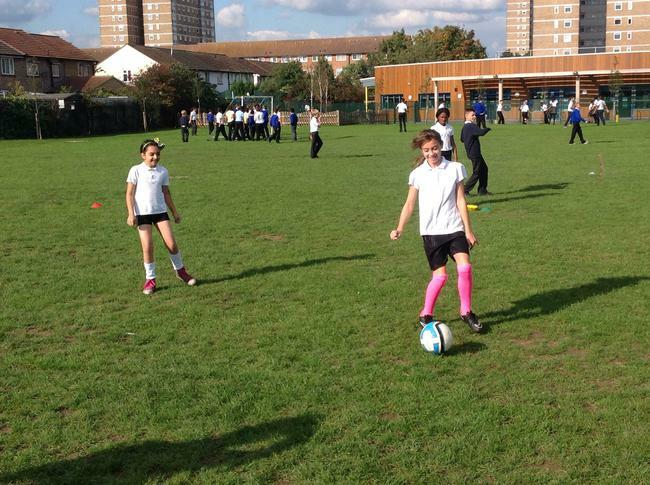 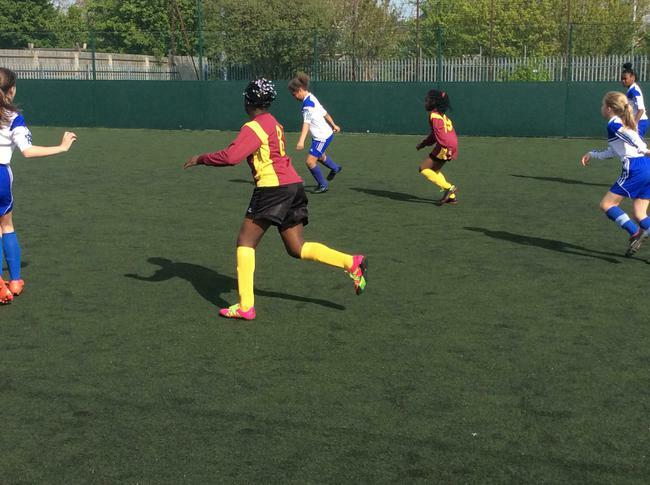 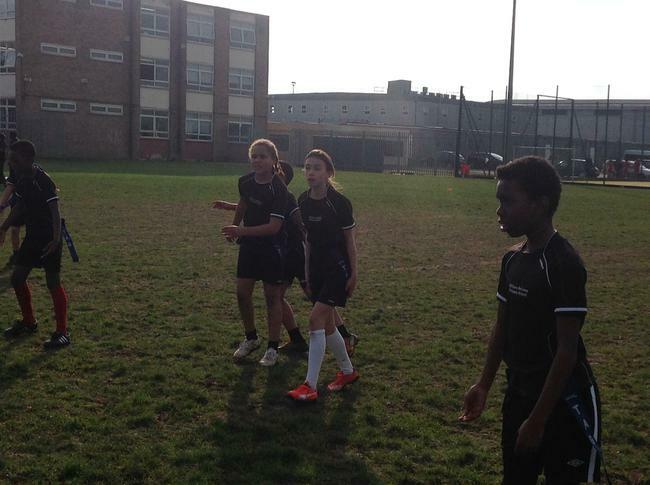 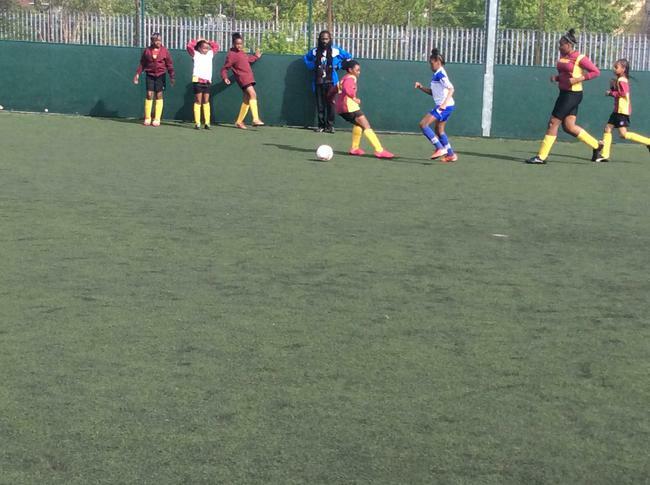 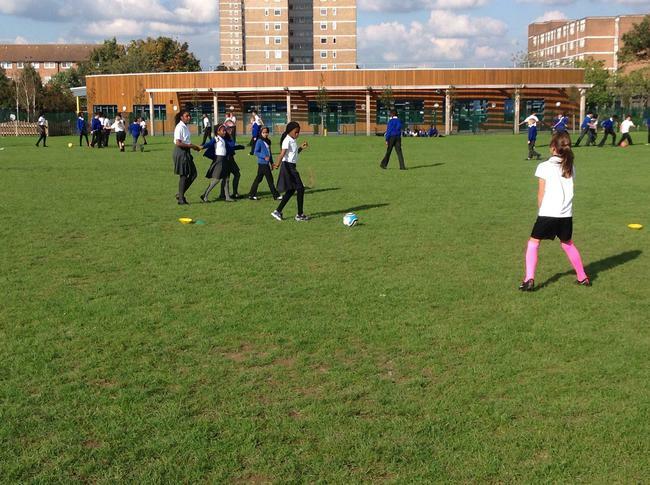 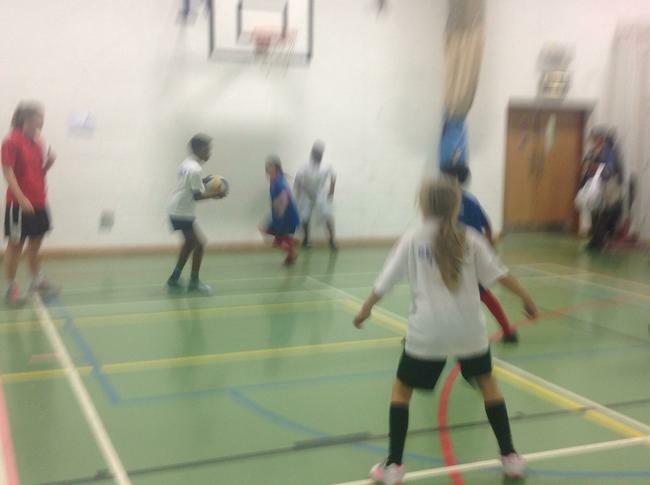 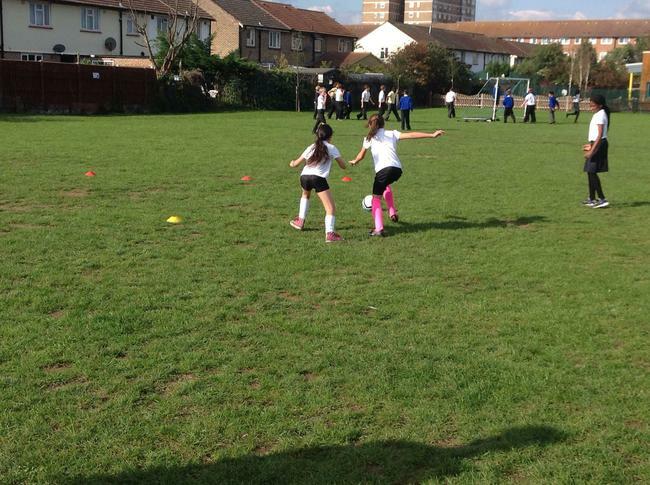 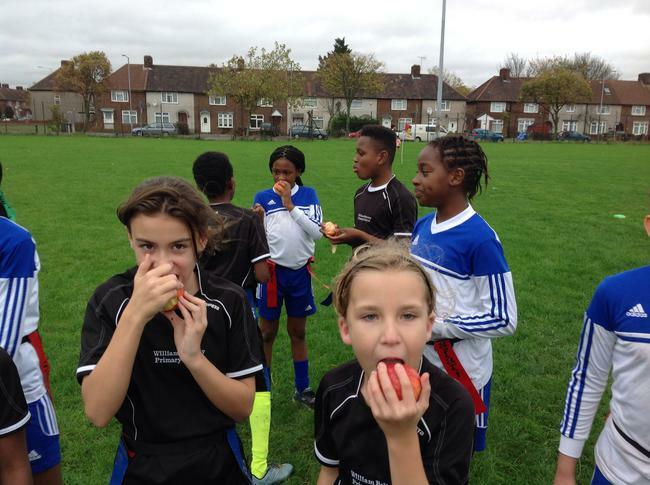 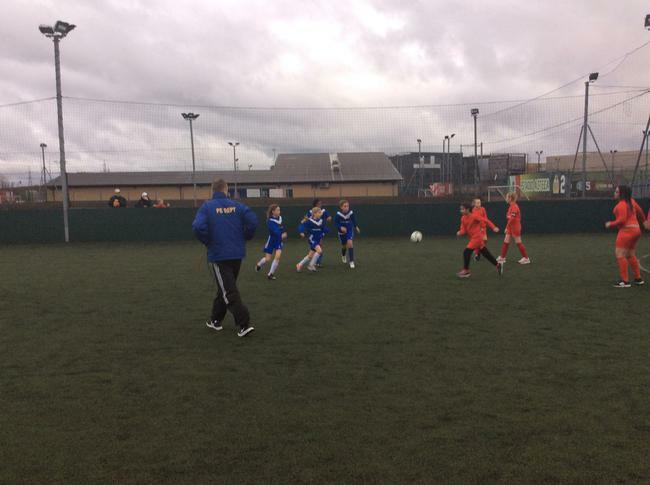 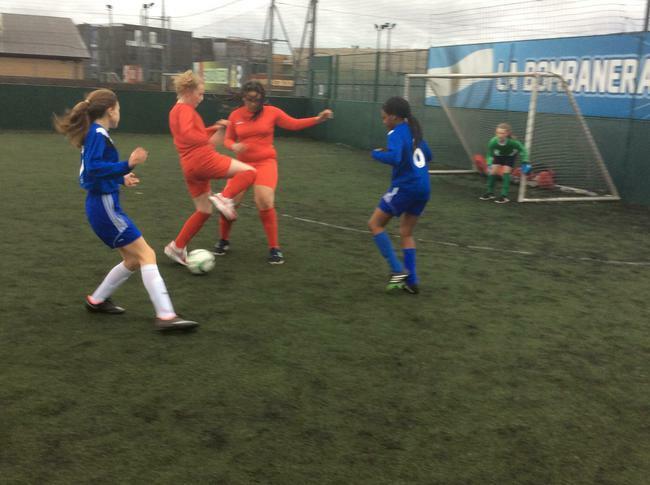 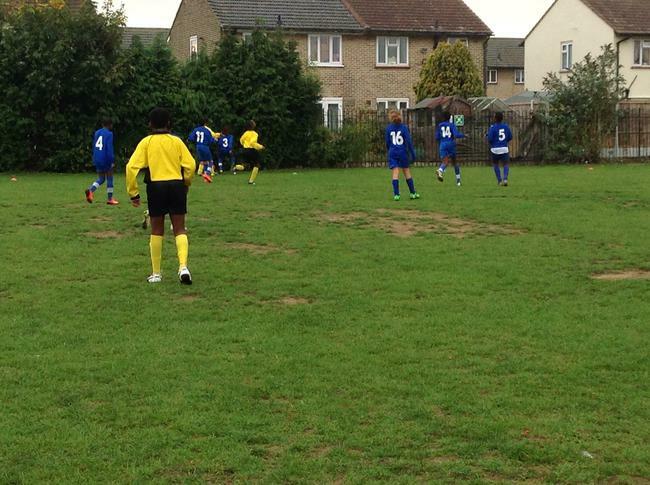 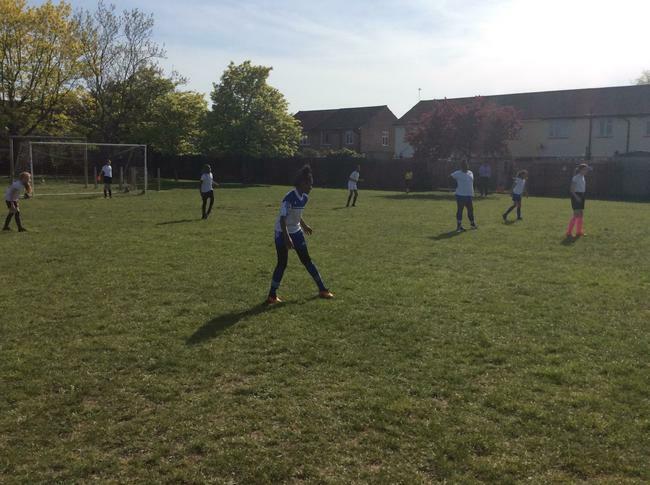 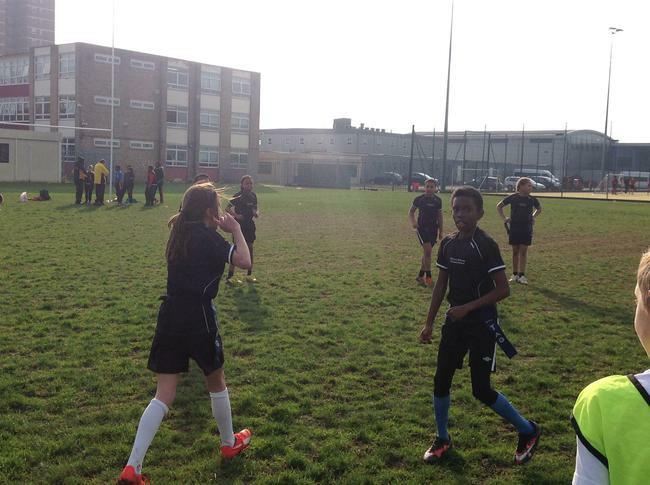 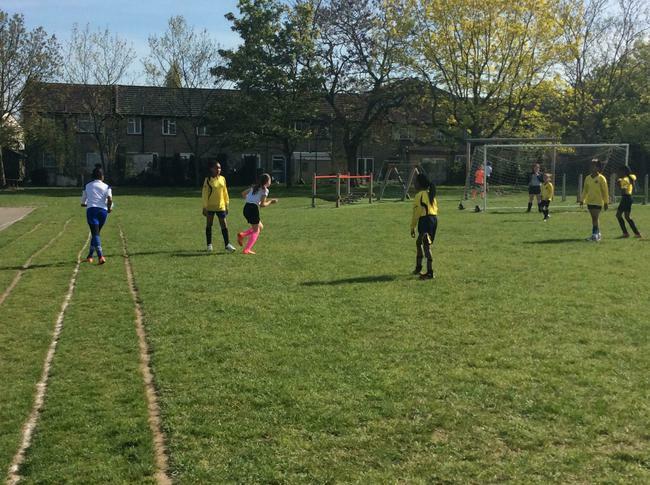 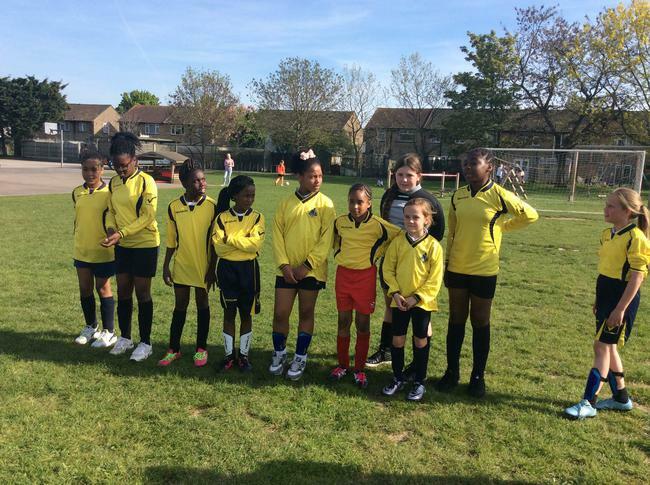 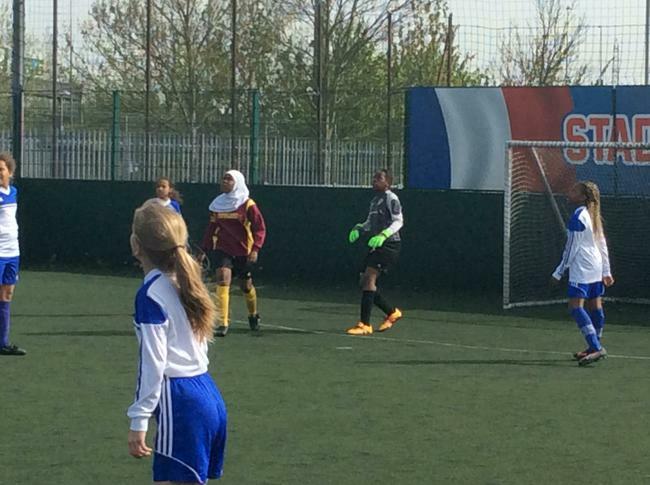 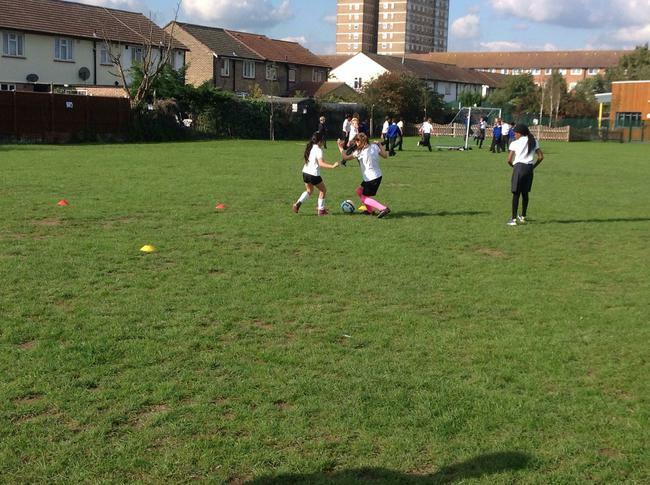 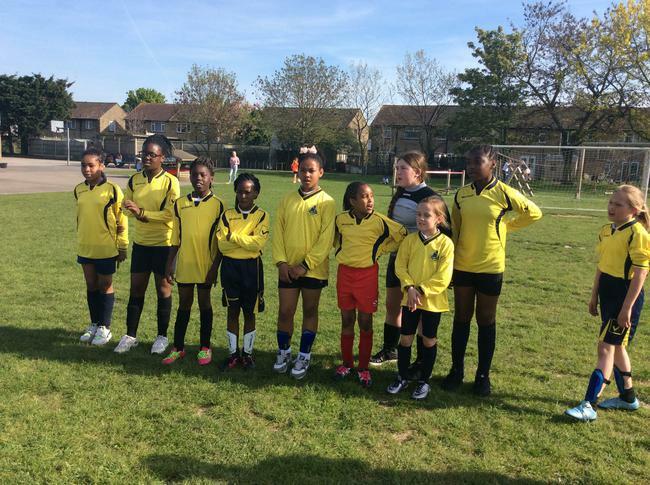 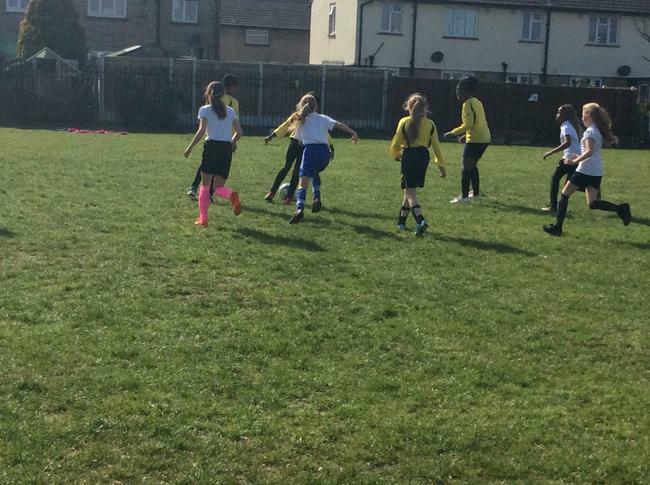 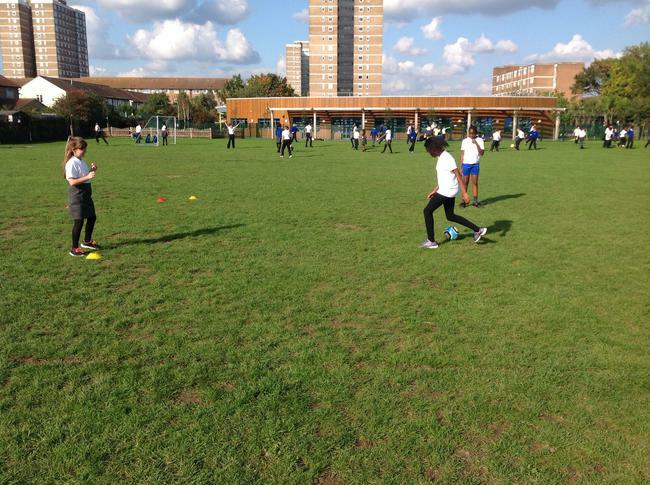 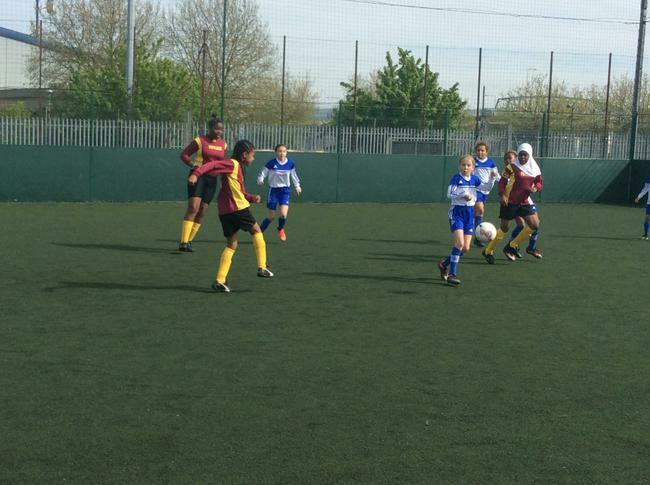 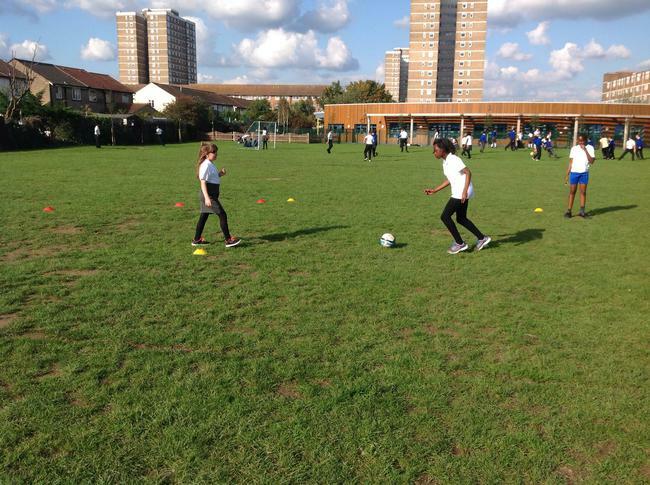 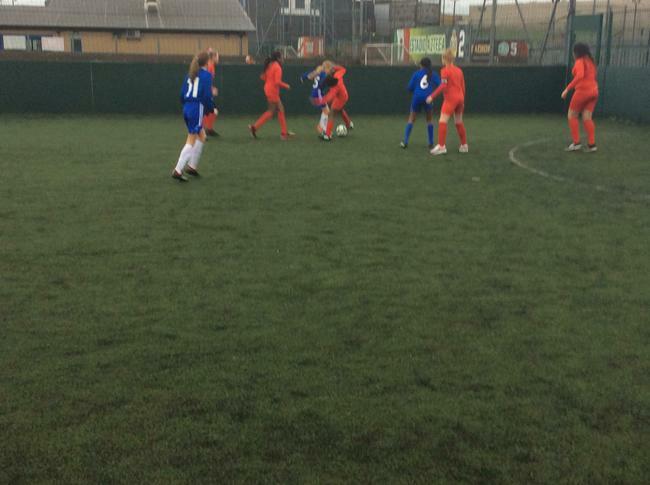 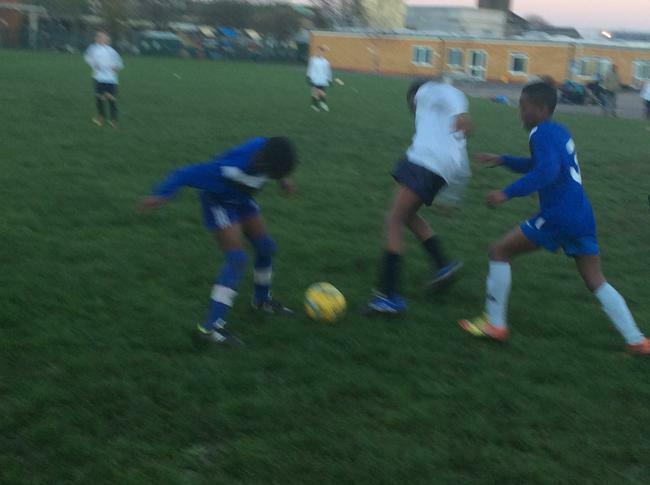 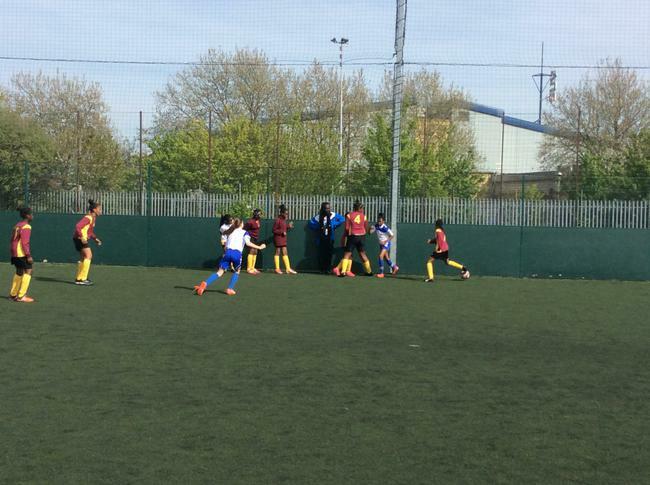 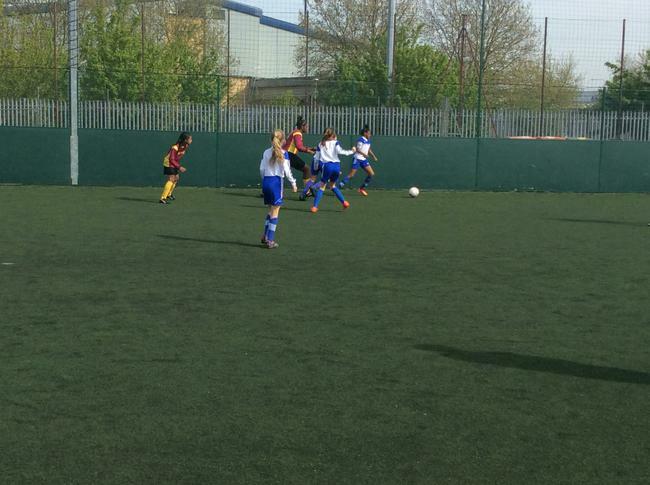 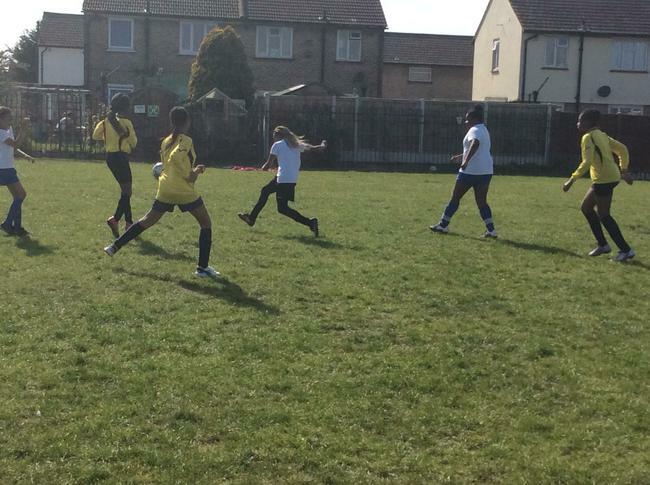 B Team Girls football match. 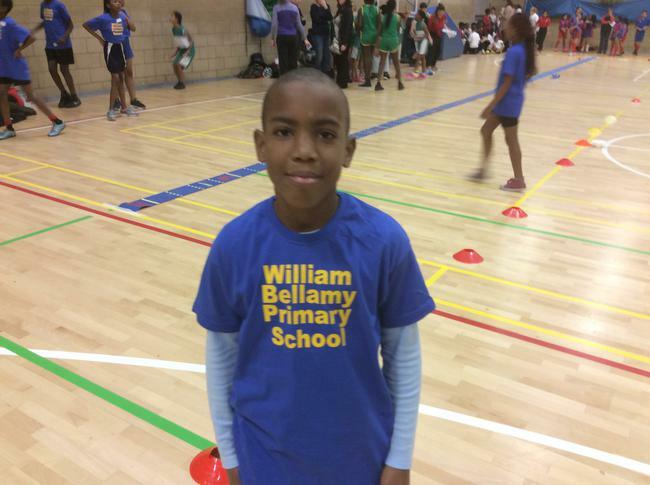 Transition match William Bellamy VS Souhtwood. 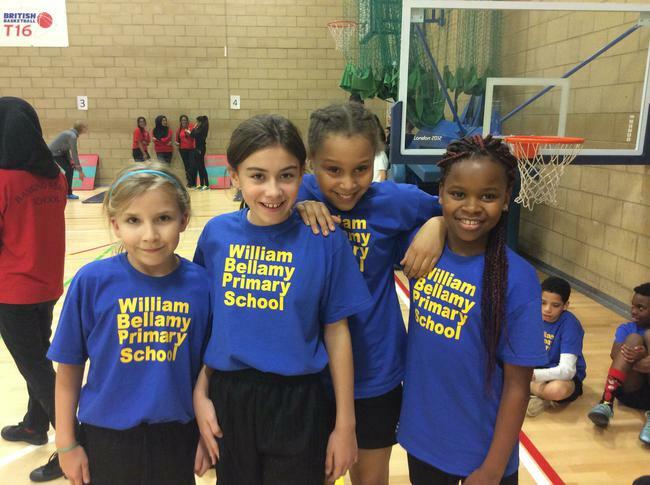 William Bellamy Girls VS George Carey. 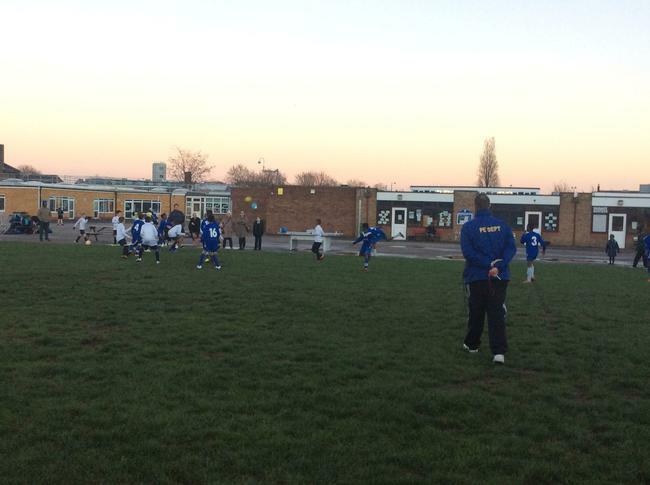 Boys quarter final VS Themes View. 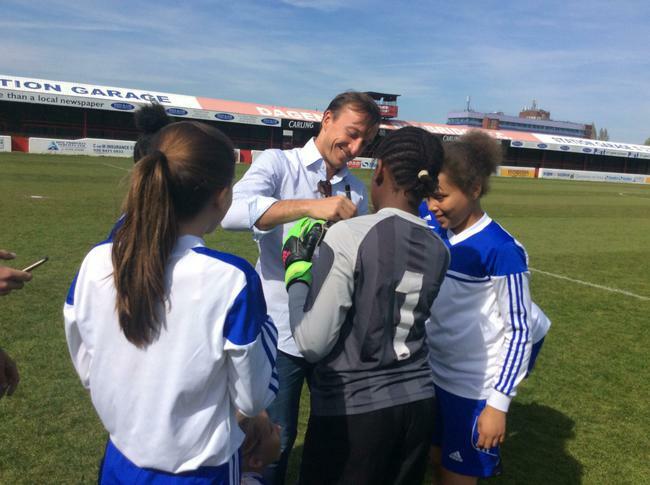 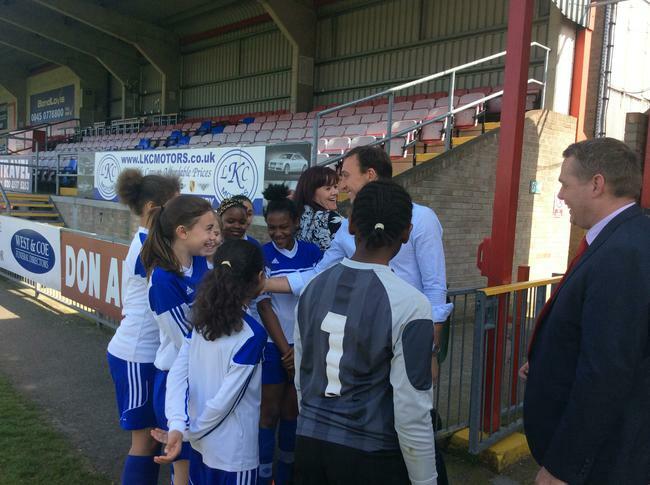 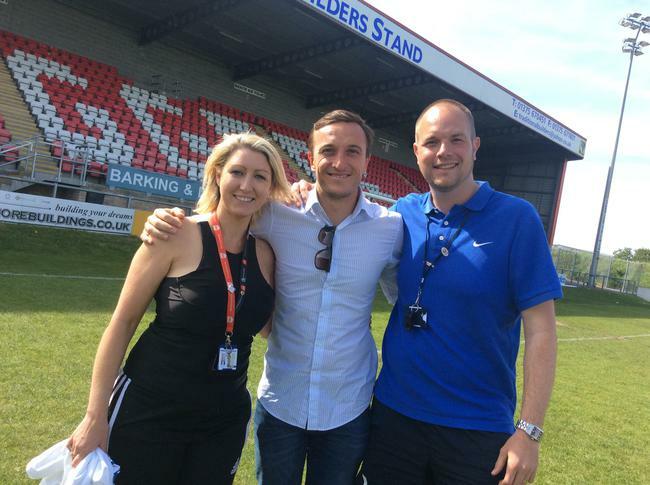 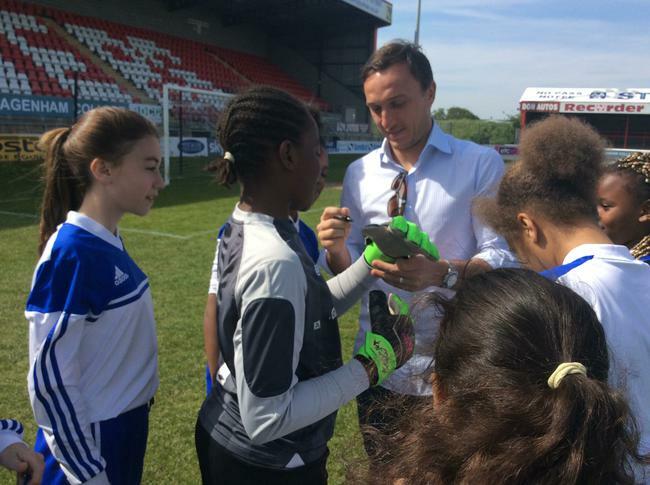 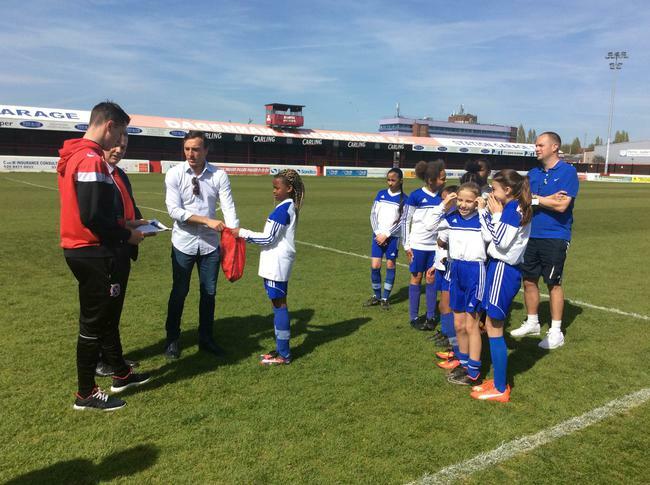 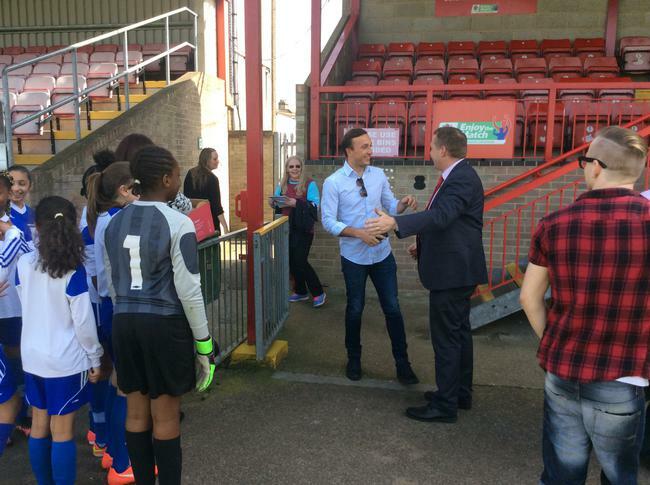 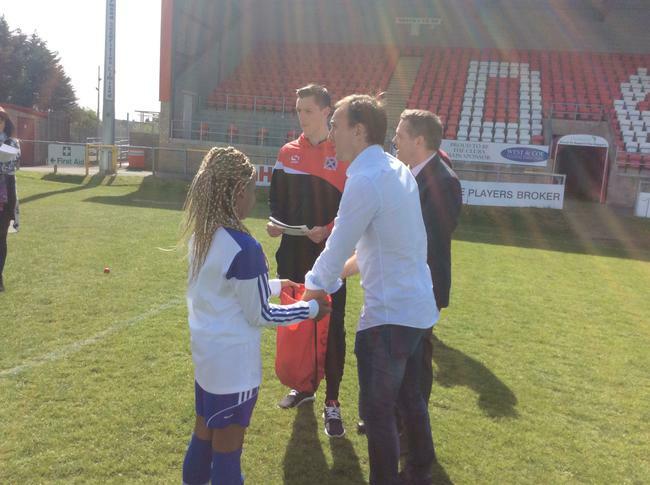 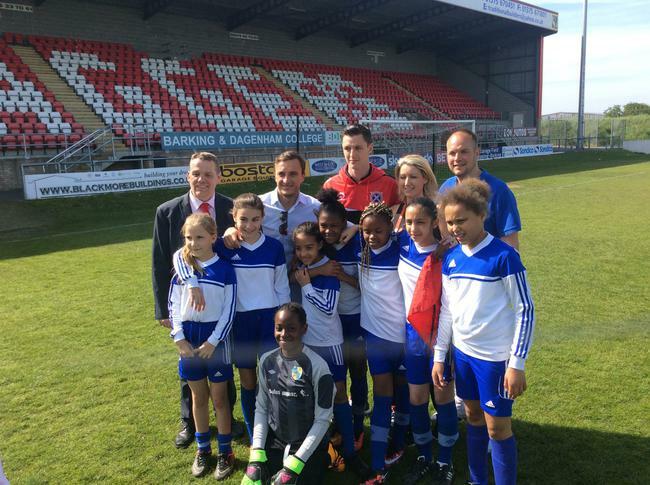 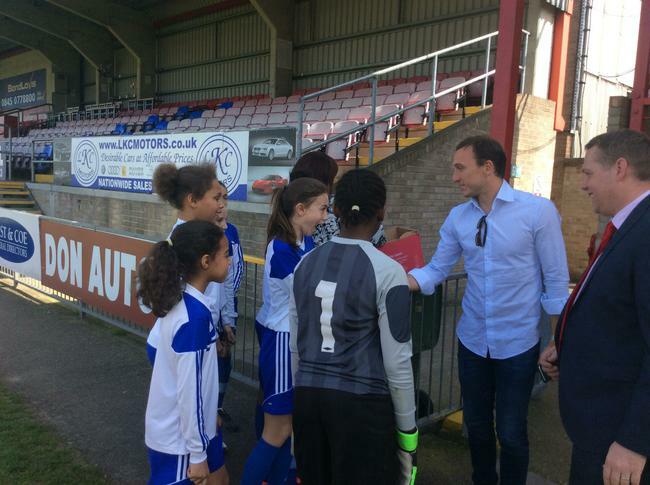 Meeting West Ham captain Mark Noble doing the draw for the borough World Cup tournament! 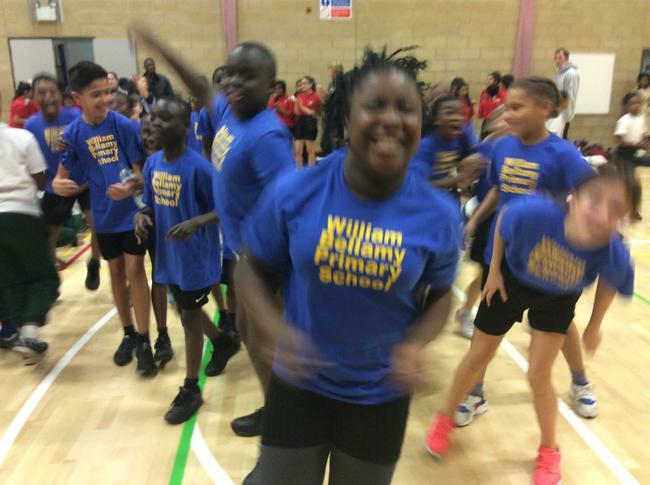 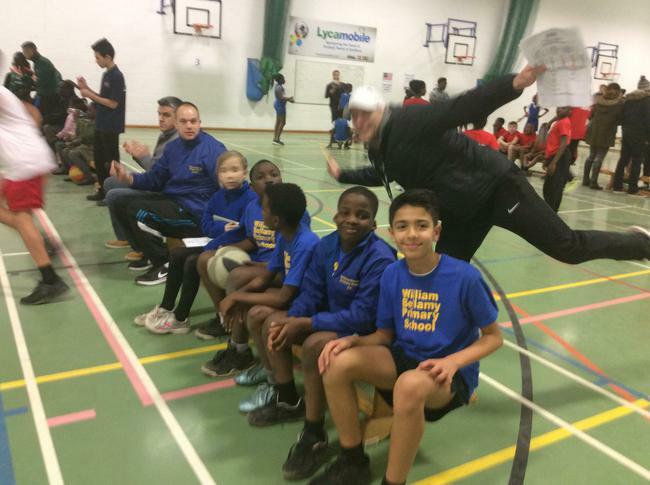 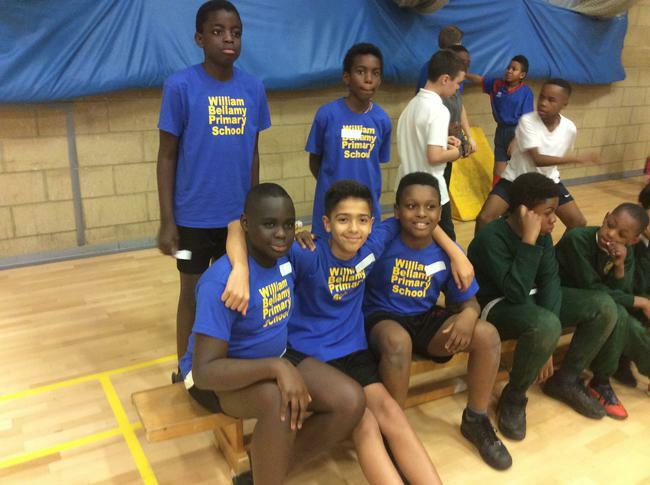 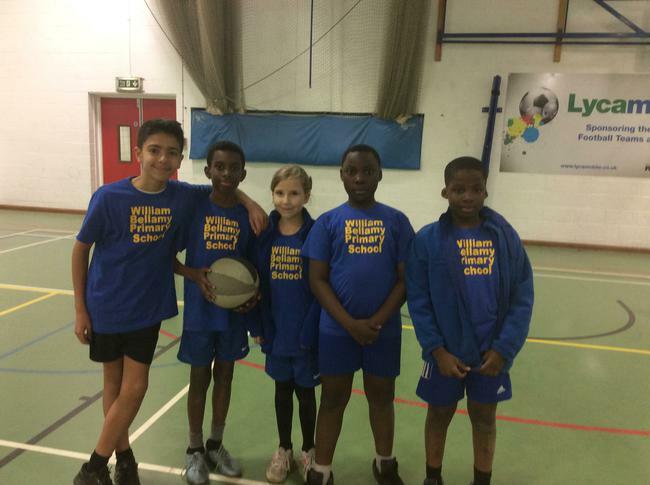 William Bellamy School have qualified for the East of England Primary Panathlon Final in April by winning the Barking and Dagenham event in January. 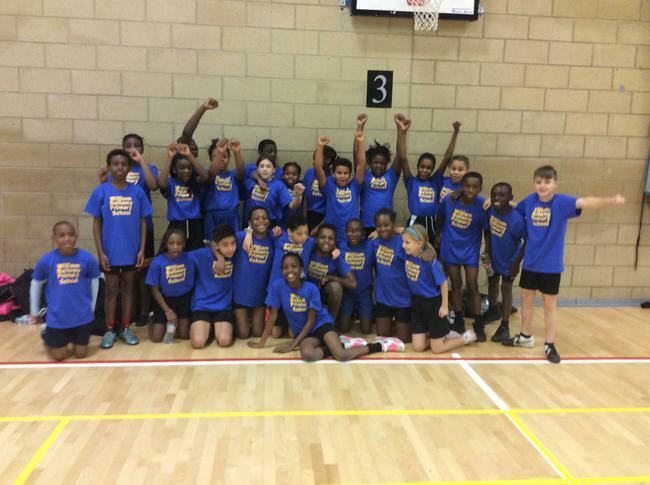 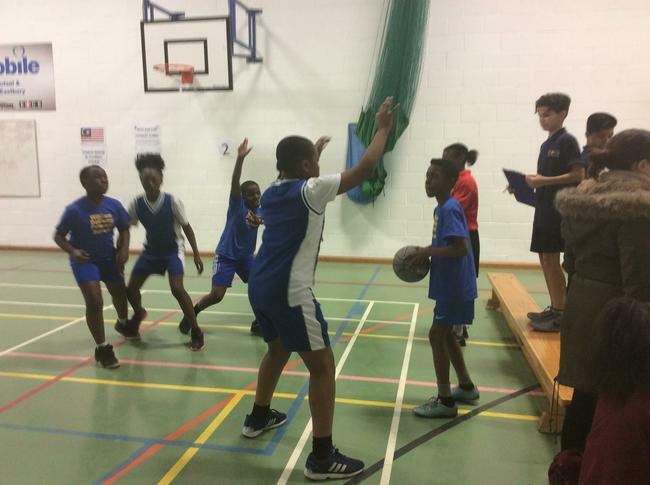 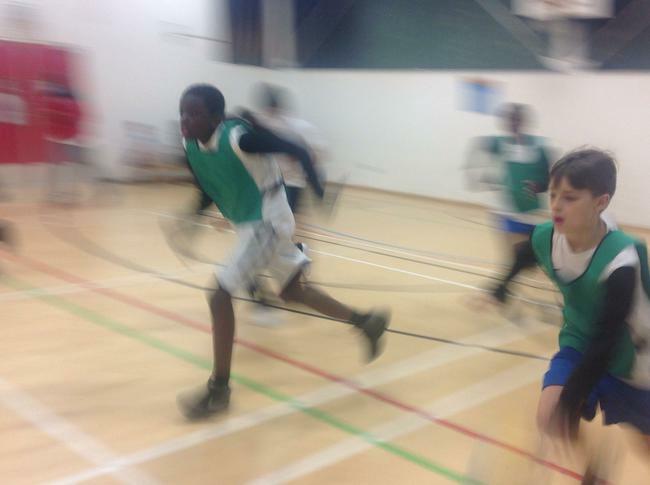 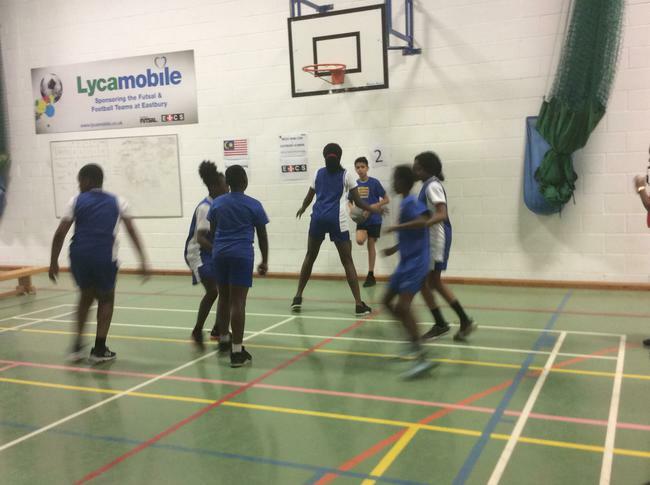 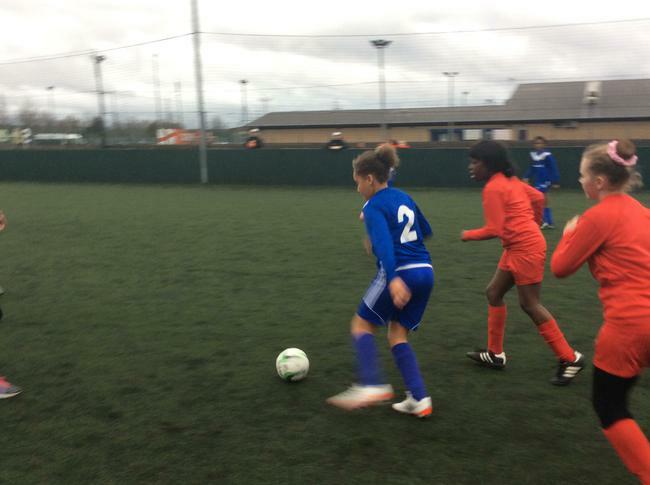 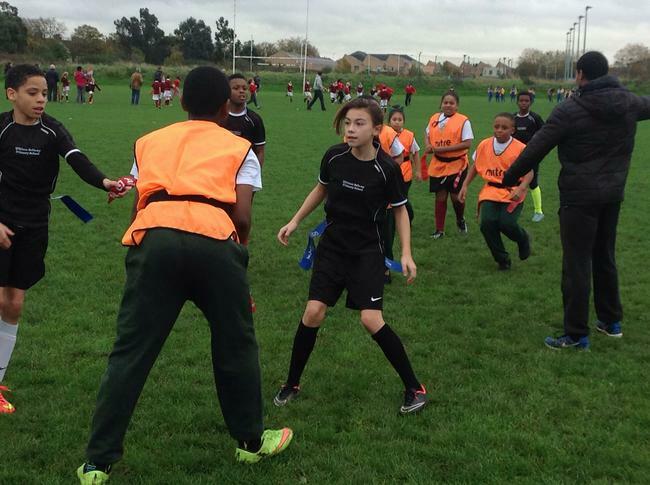 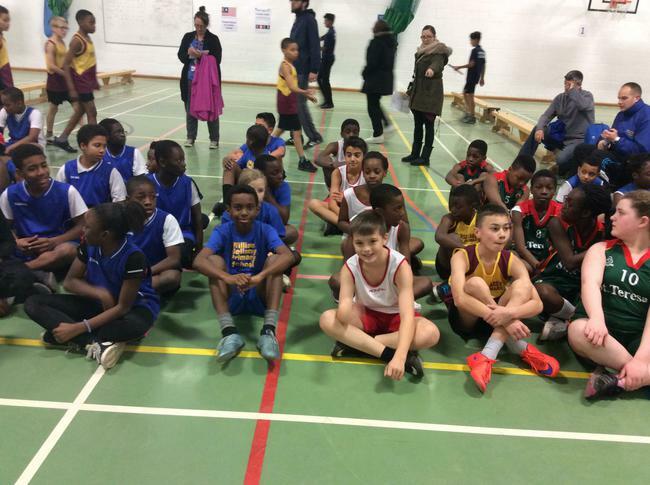 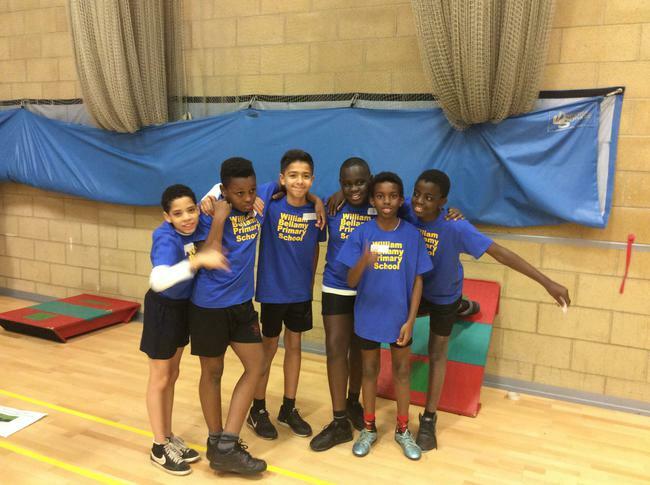 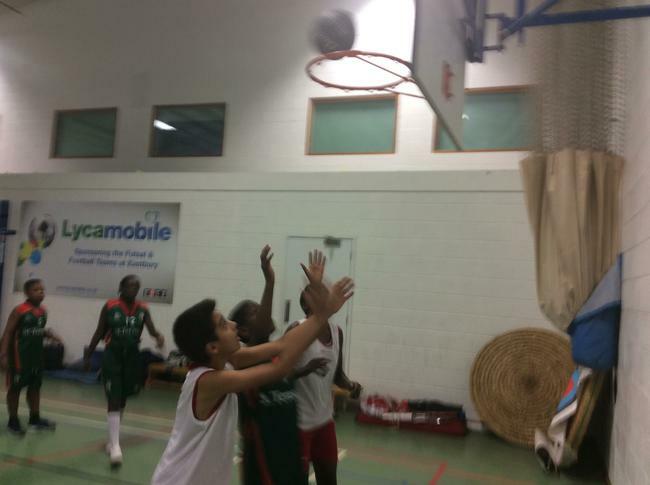 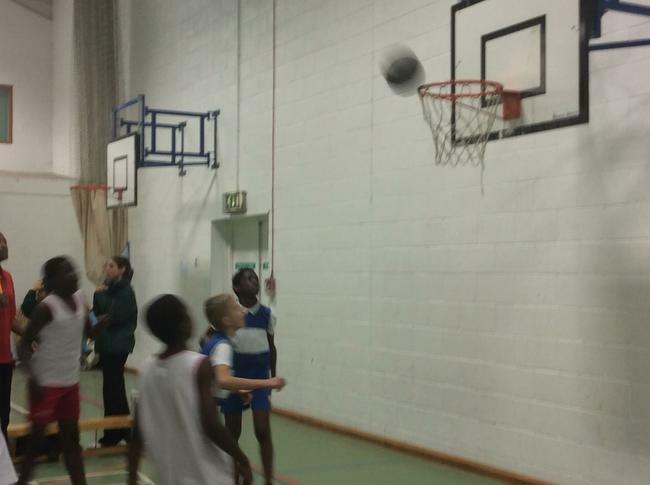 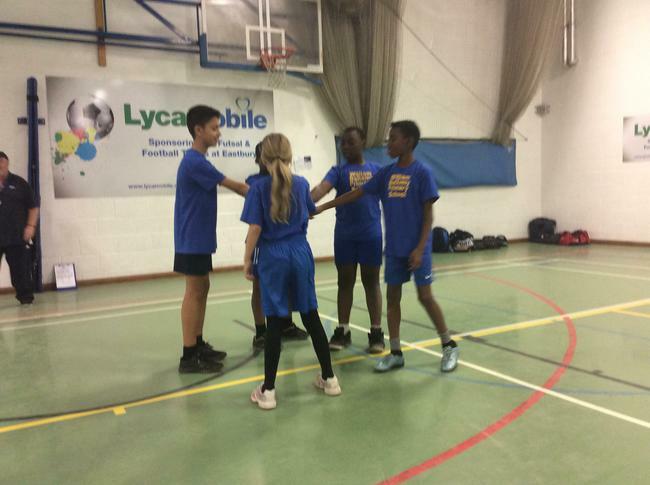 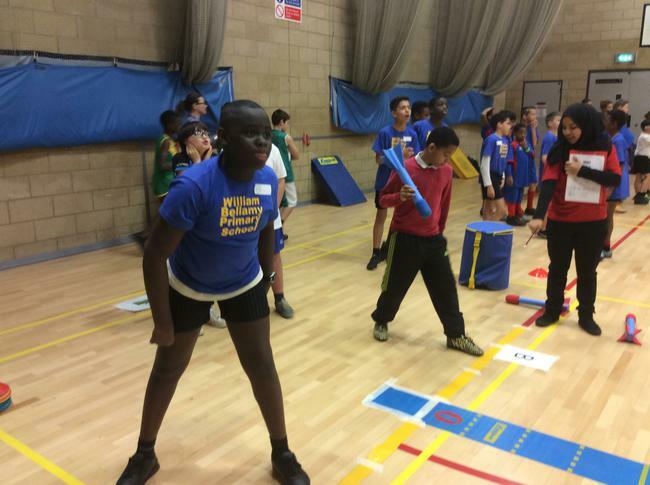 They will join teams from Essex, North Suffolk, South Suffolk and Cambridgeshire at the Great Dunmow Leisure Centre on April 14, after beating 10 other schools at the Becontree Heath Leisure Centre in Dagenham on January 27, when more than 100 children took part. 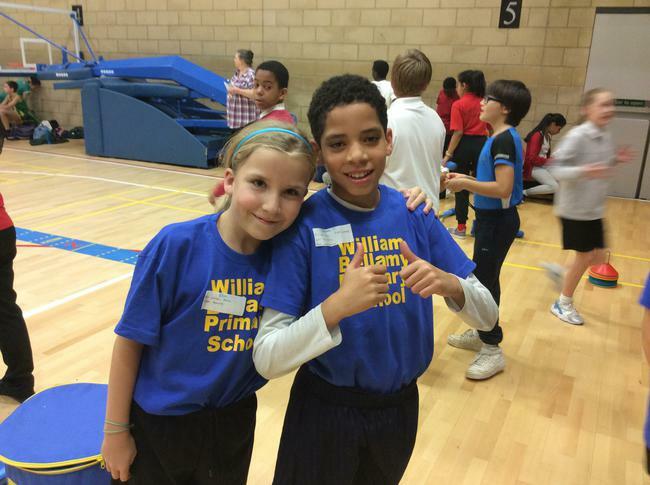 William Bellamy claimed victory with their total of 76 points, pipping Valence by two points. 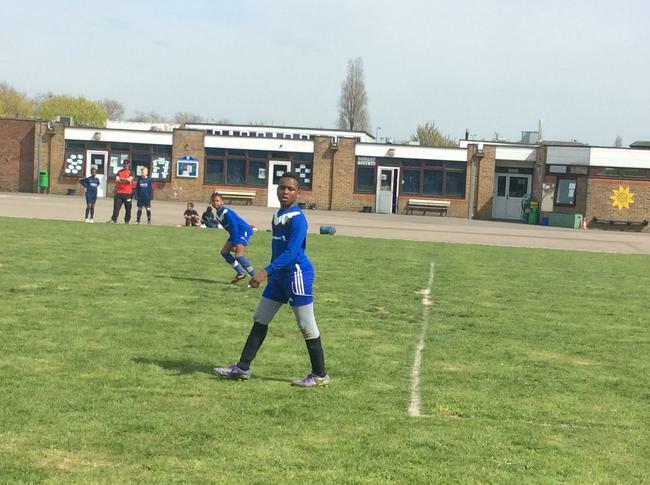 Southwood were third on 72. 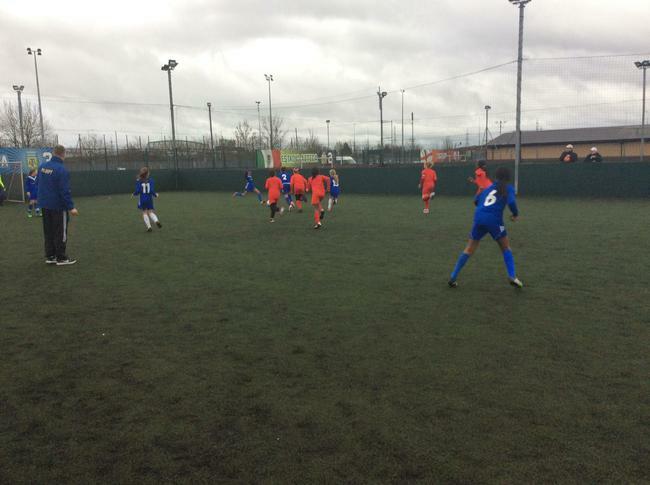 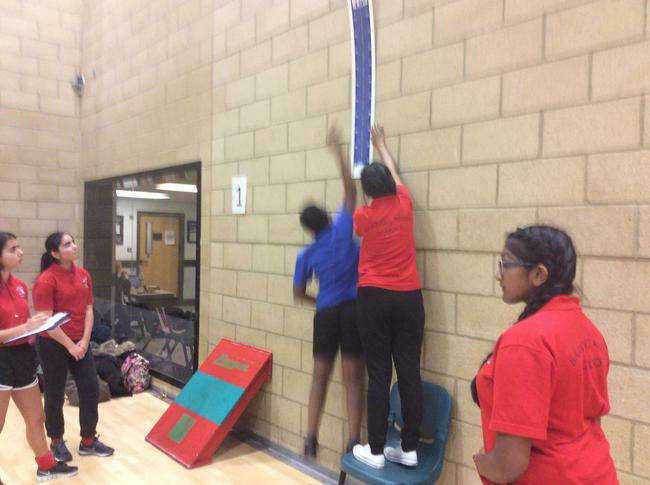 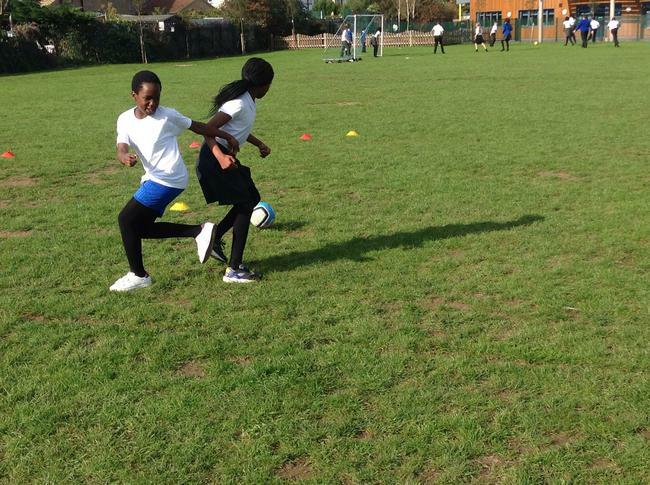 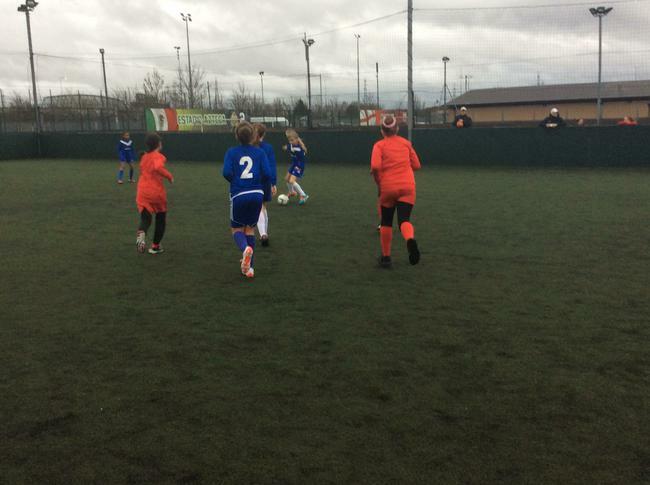 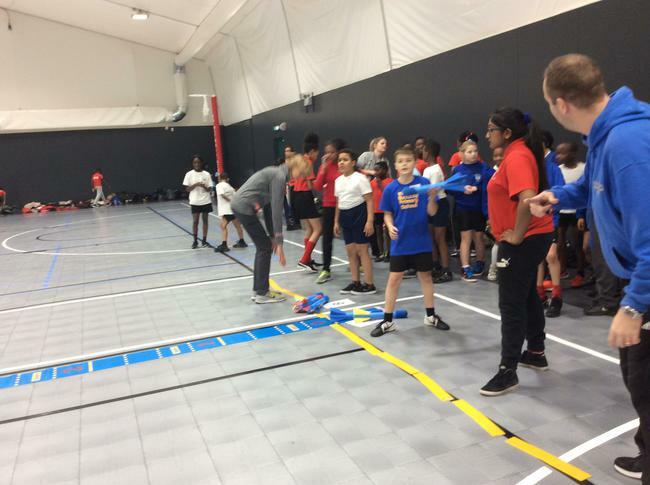 The competition used a series of team challenges to develop sporting skills in five to 11-year-olds with a range of special educational needs. 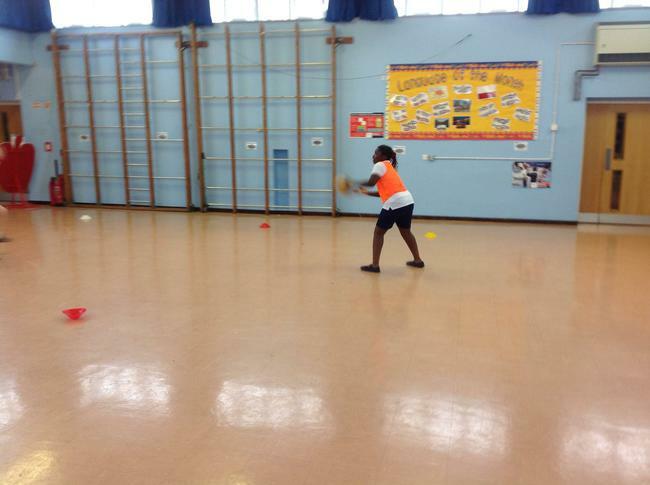 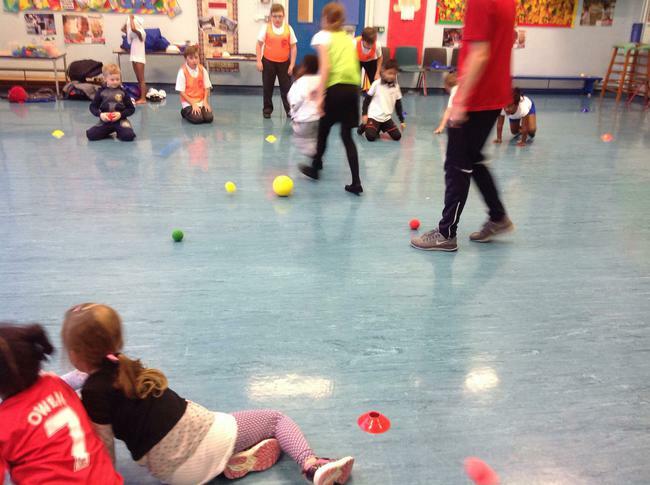 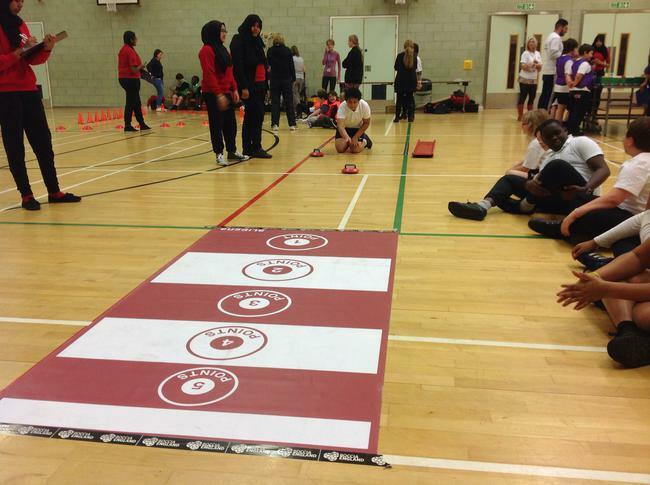 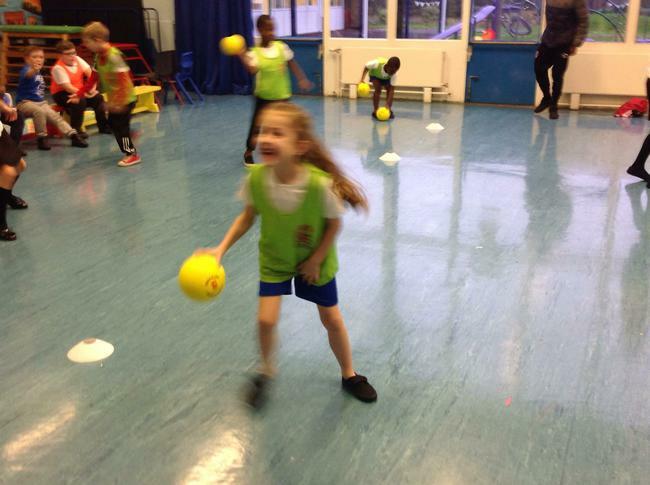 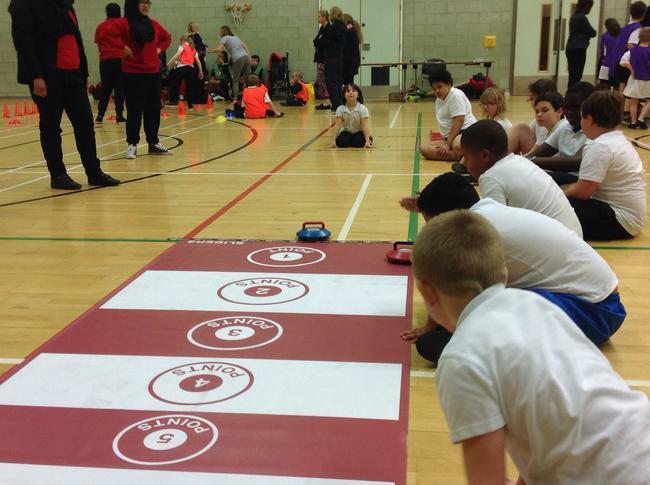 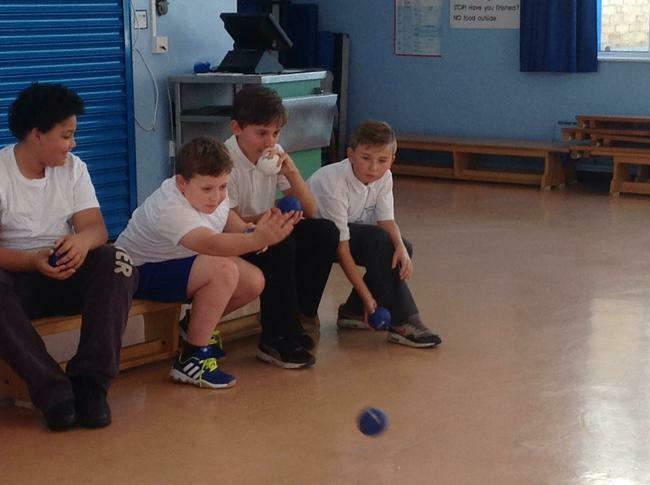 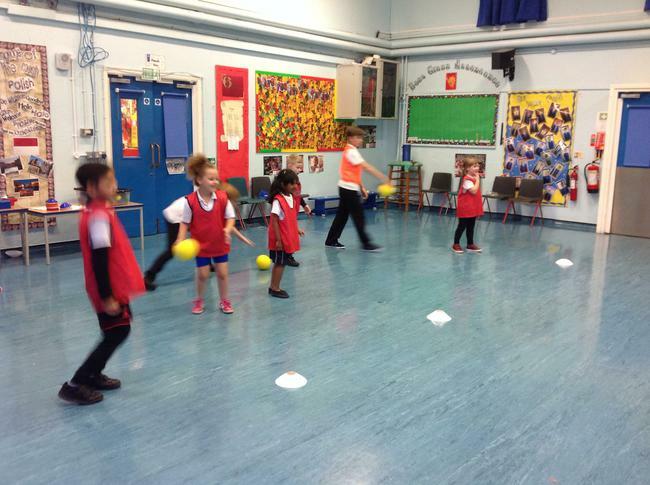 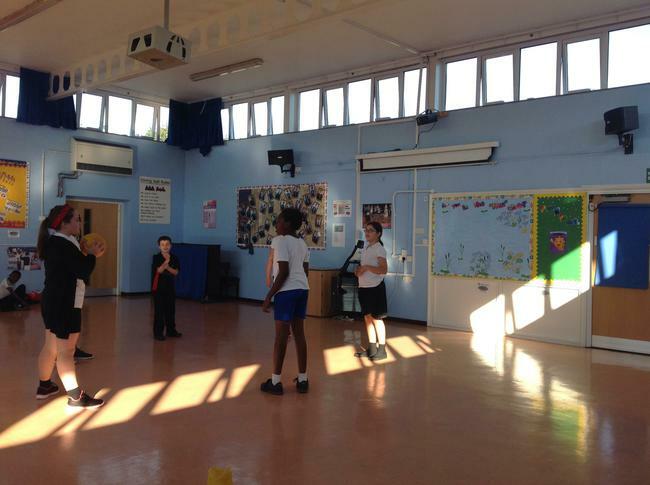 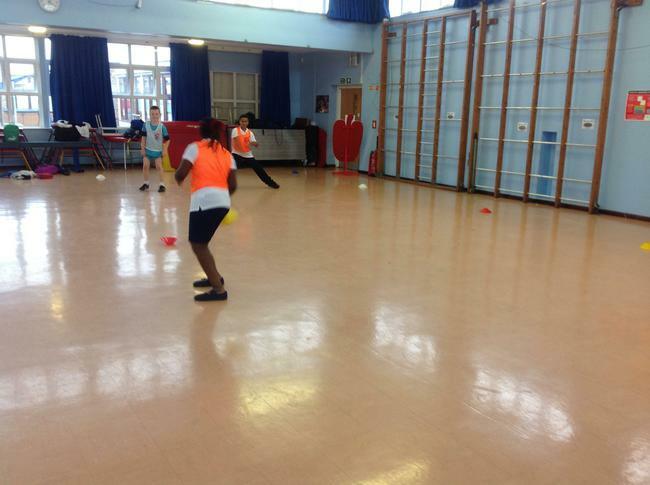 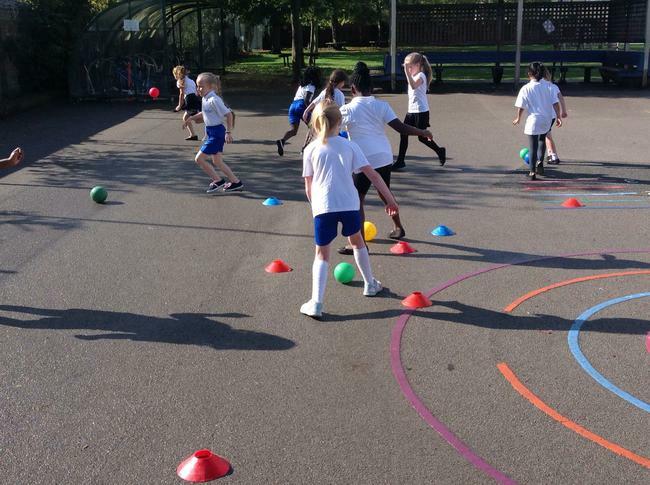 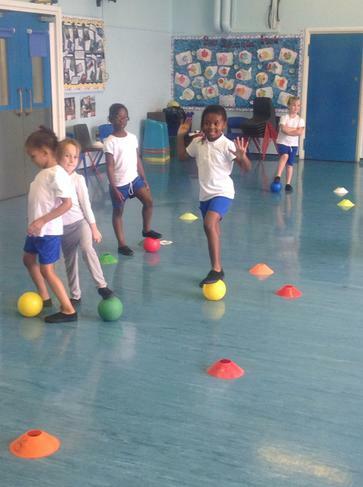 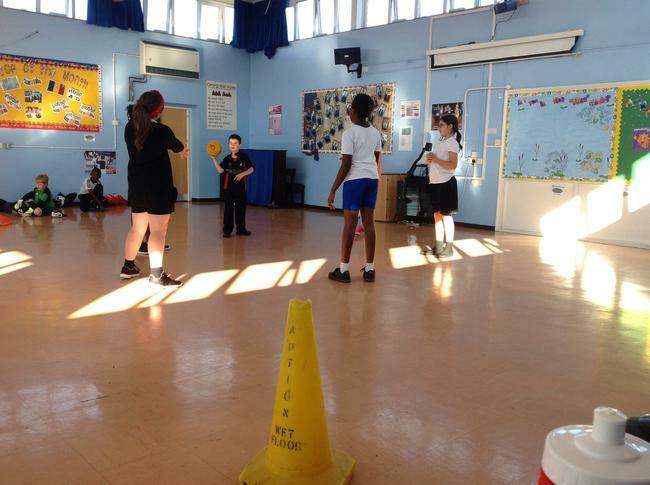 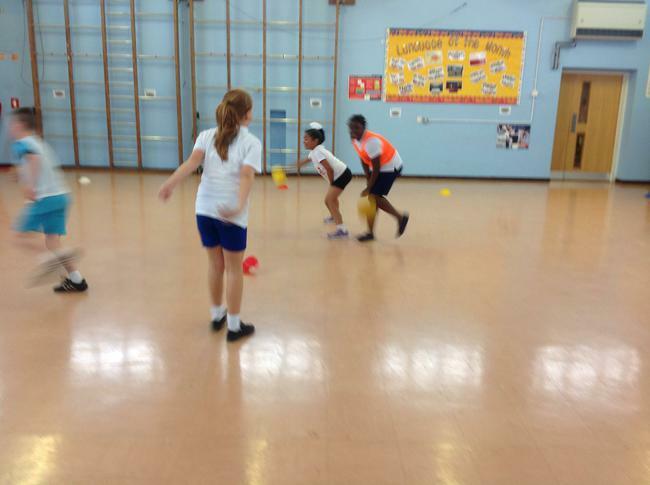 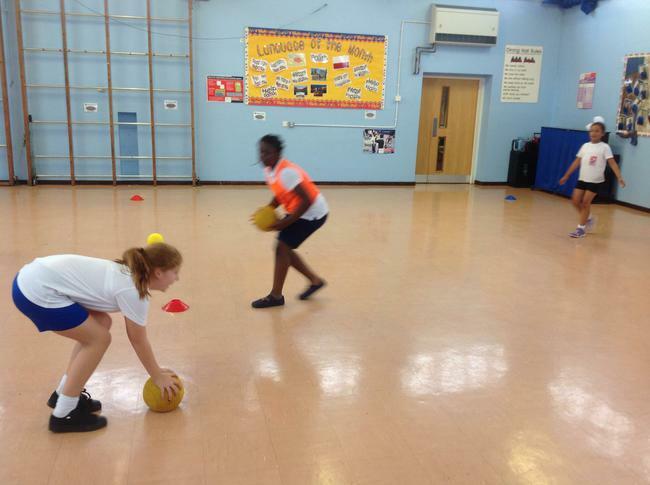 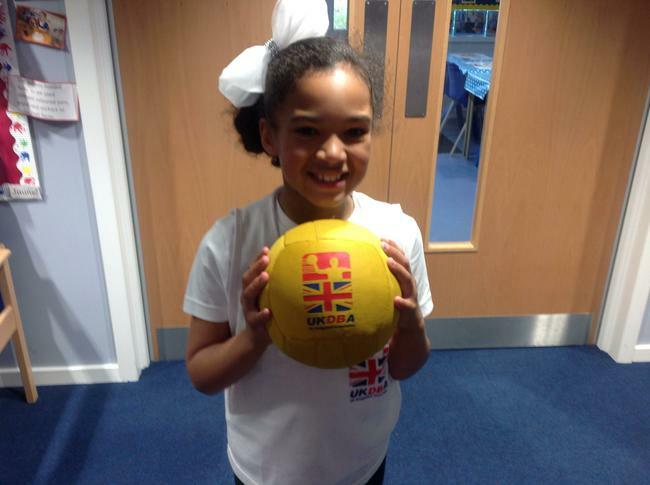 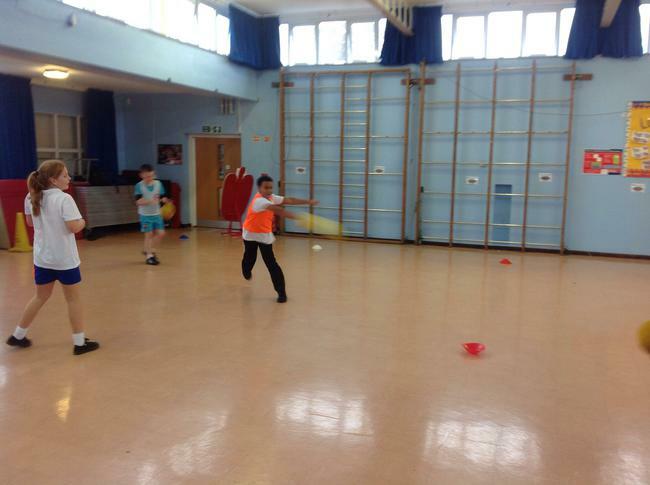 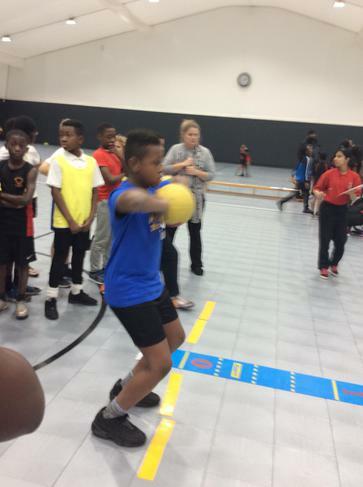 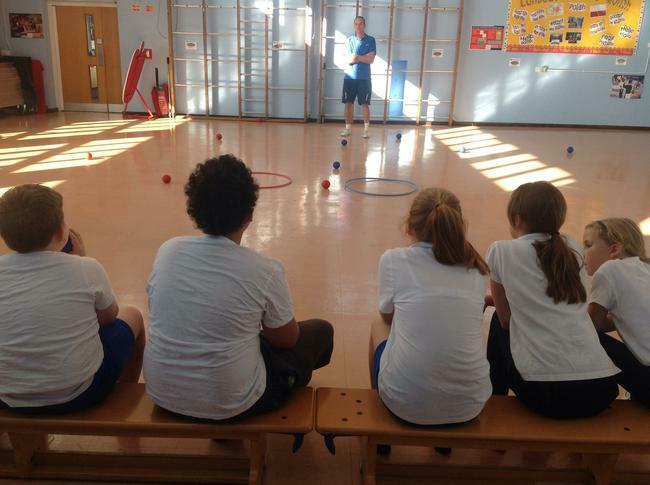 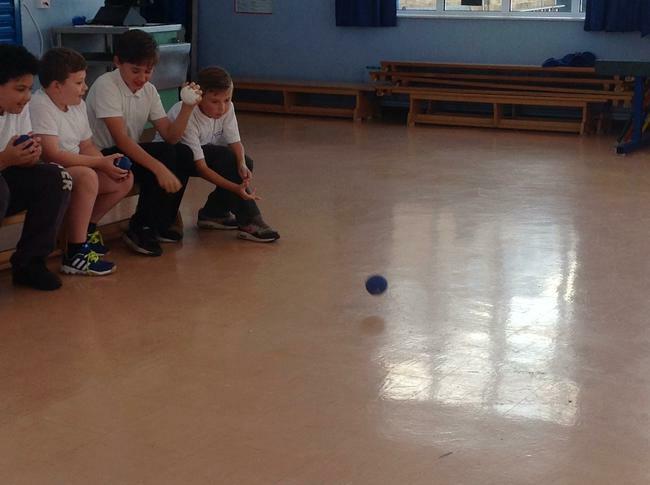 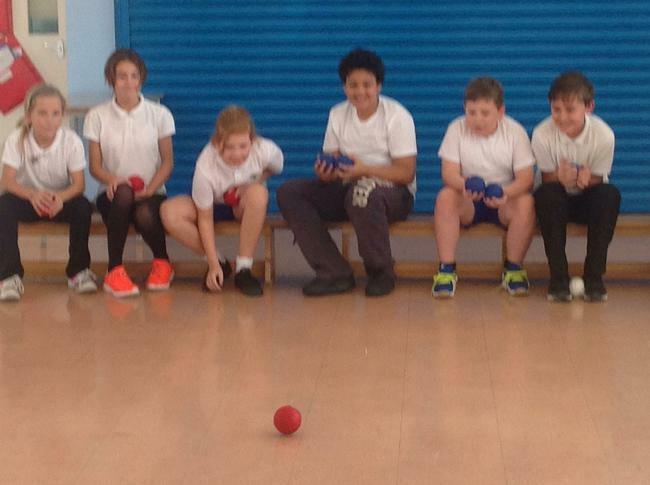 Back-to-back morning and afternoon sessions meant the pupils got an introduction to Panathlon and the chance to build foundation skills in a range of sports, including new-age kurling, precision beanbag, flight path, polybat and basketball shoot. 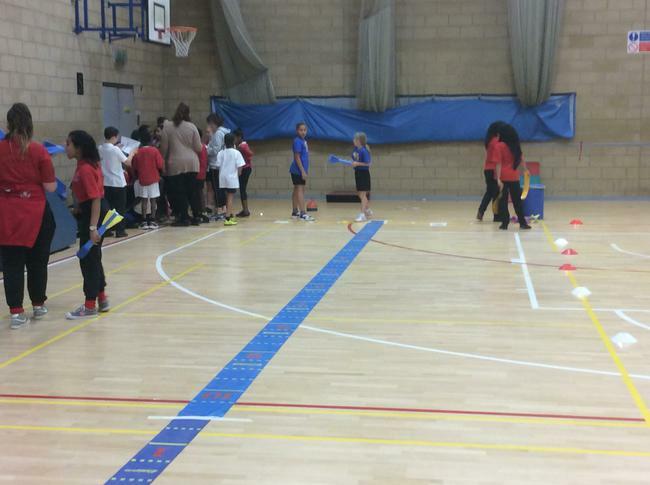 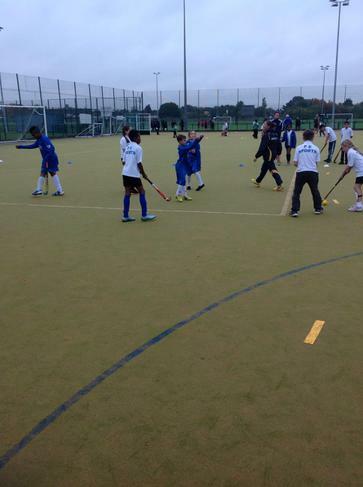 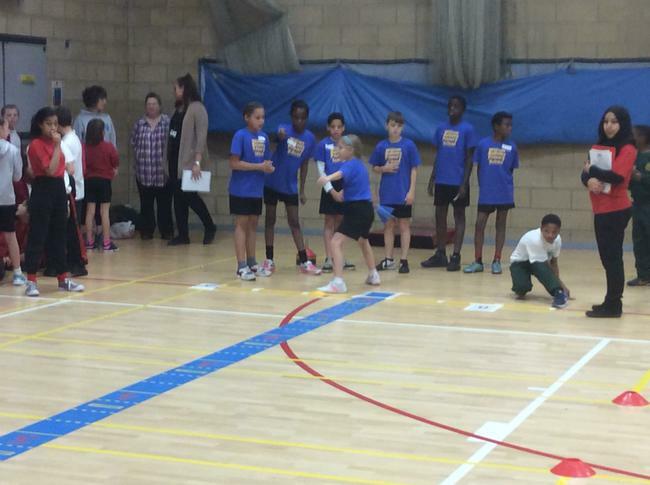 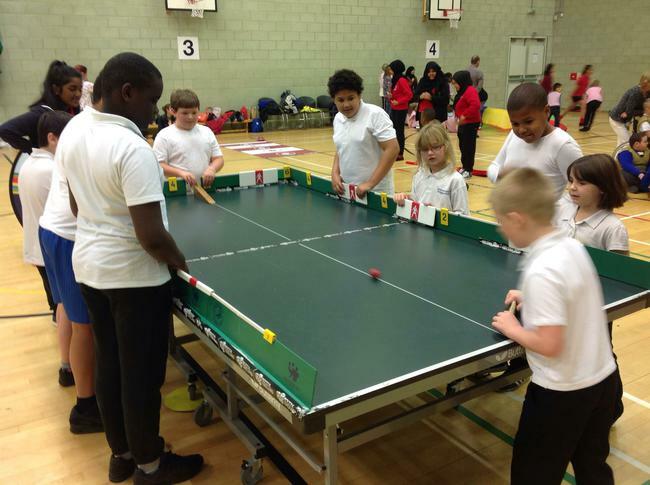 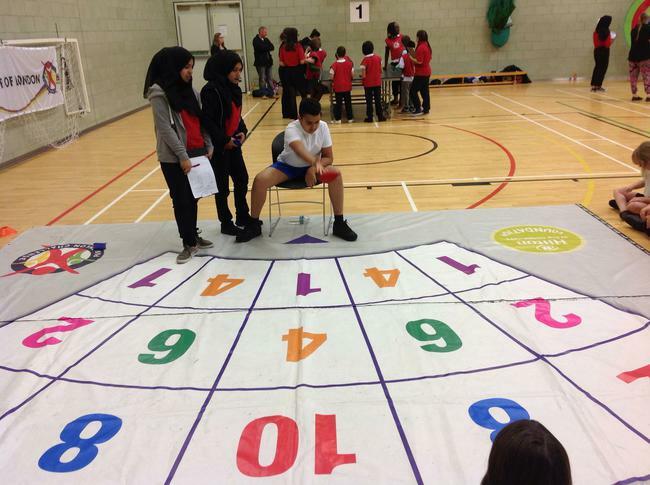 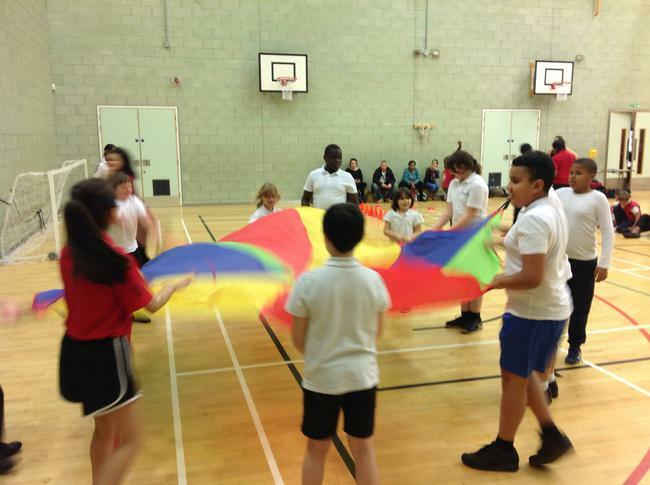 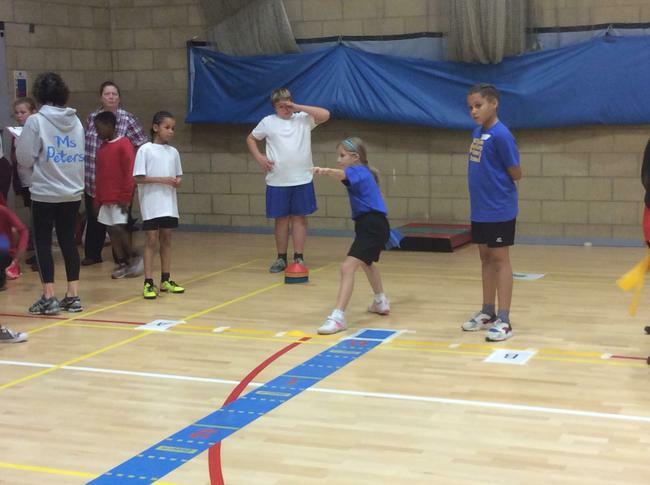 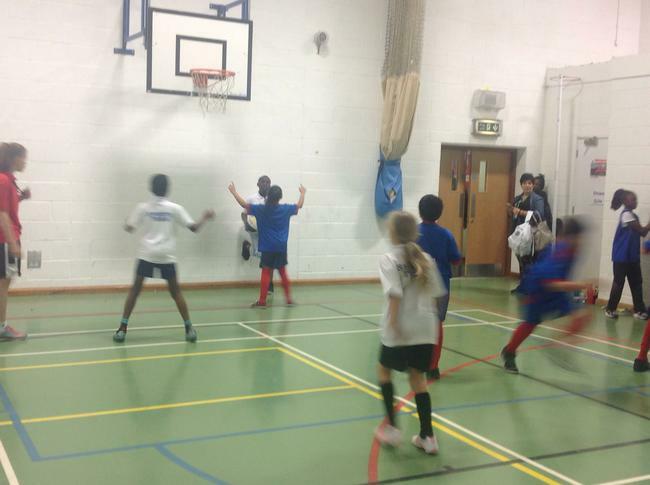 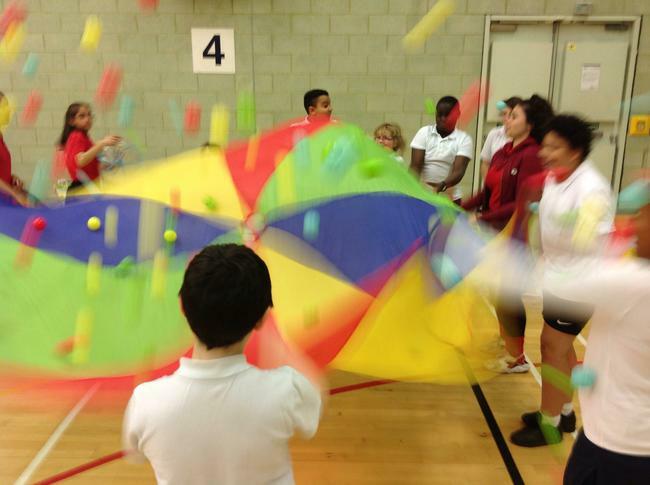 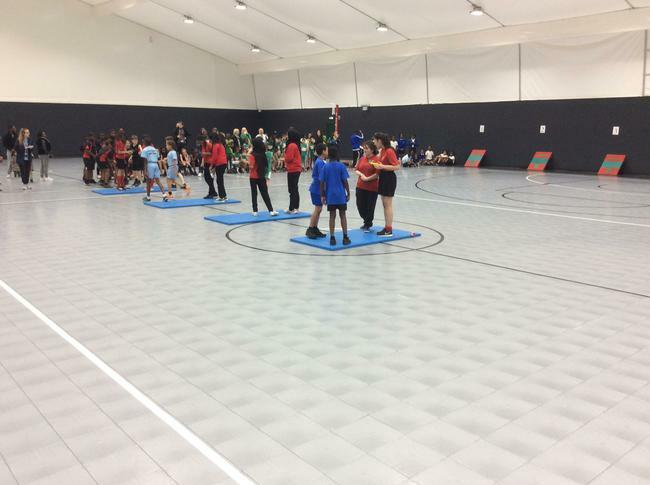 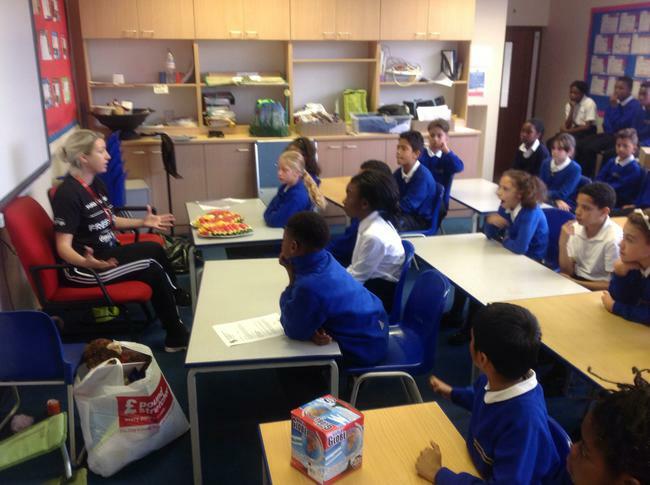 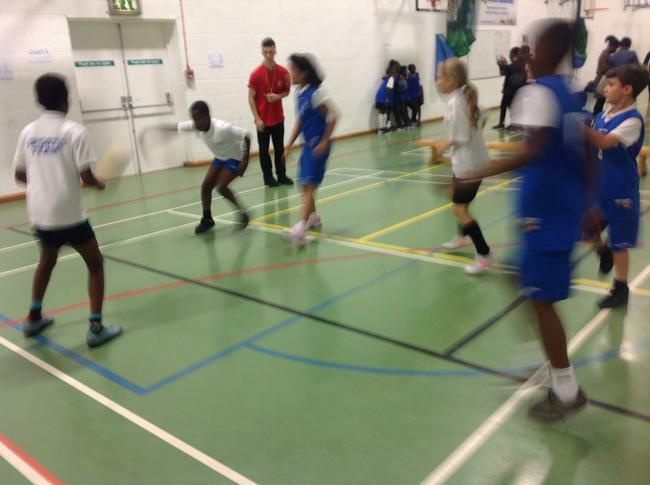 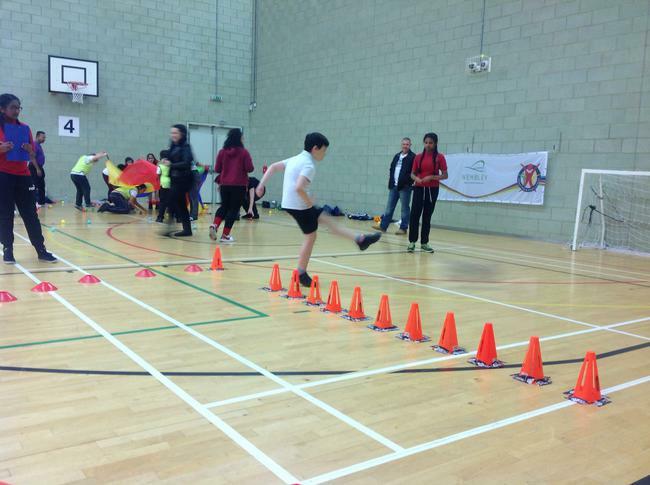 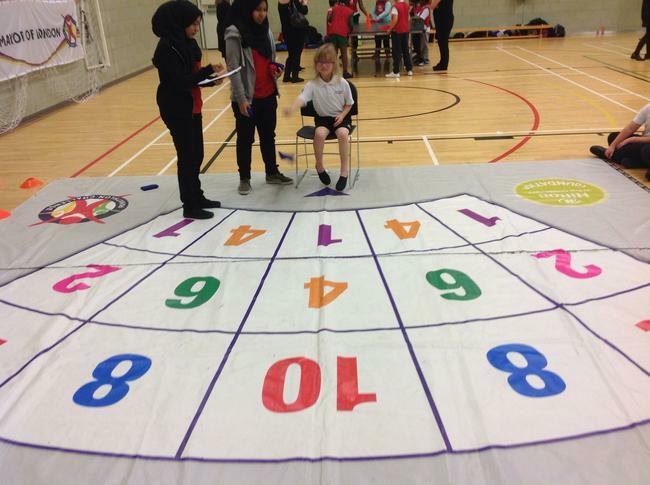 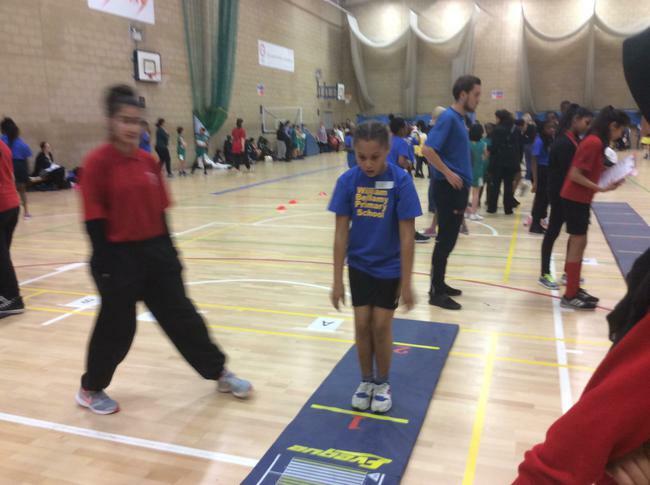 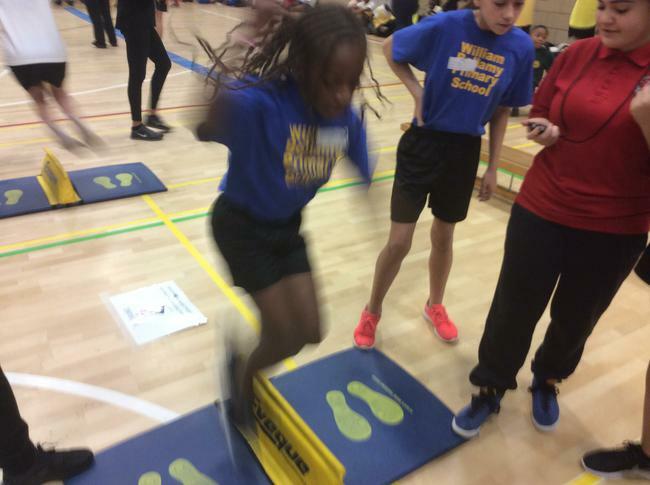 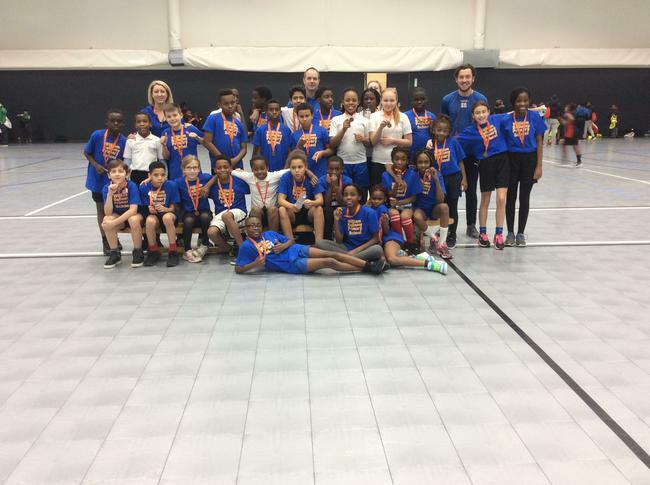 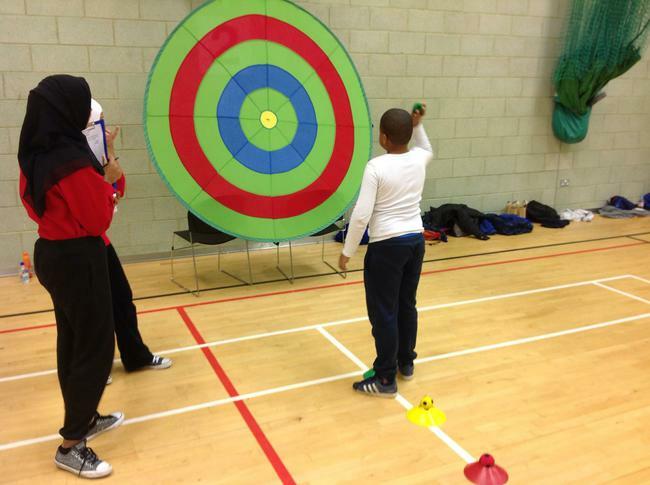 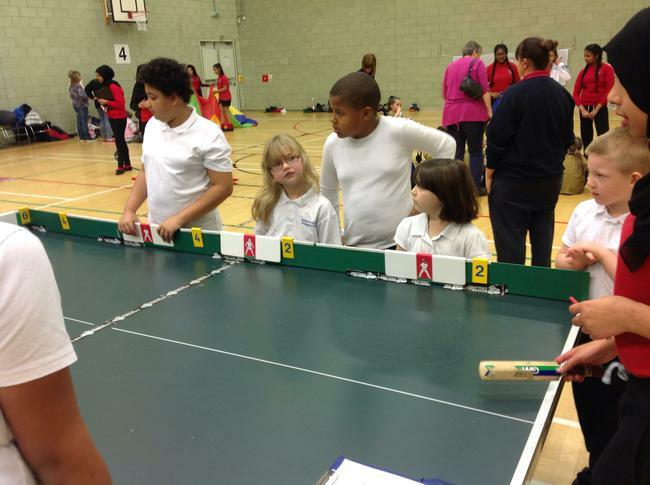 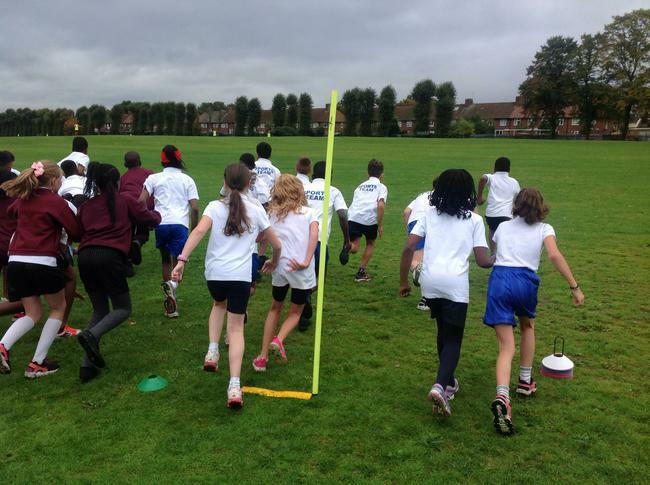 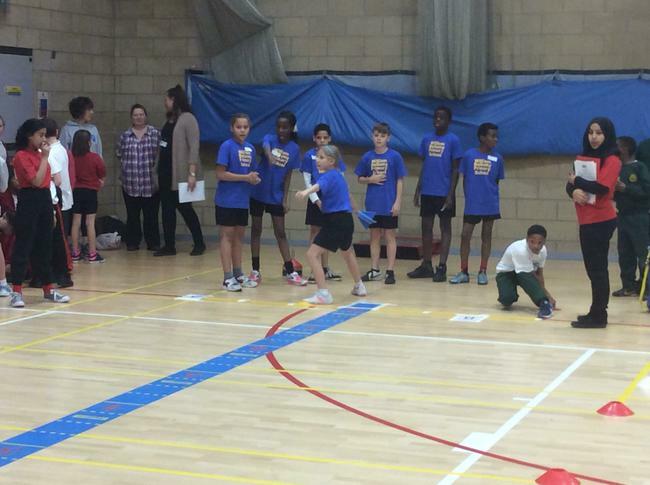 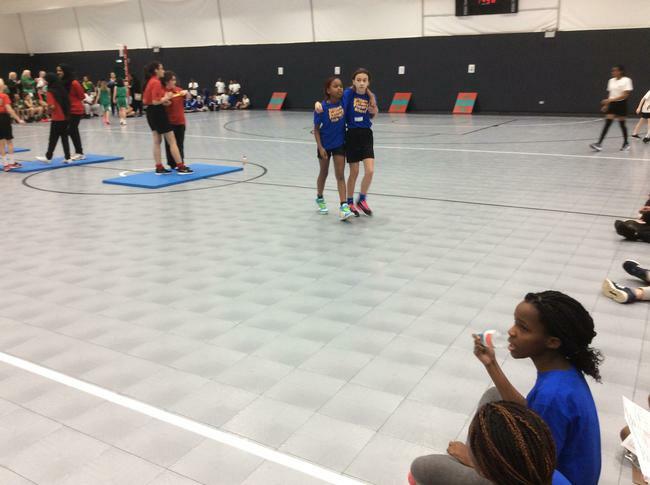 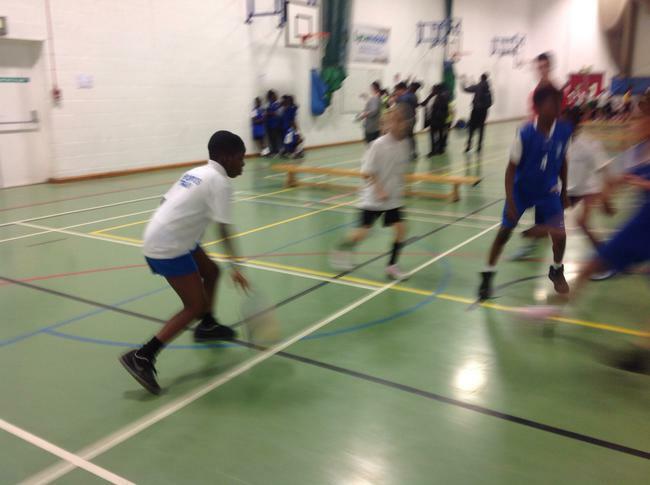 Barking and Dagenham’s School Games Manager, Elaine Burgess, said: “We now hold three Primary Panathlon Festivals a year. 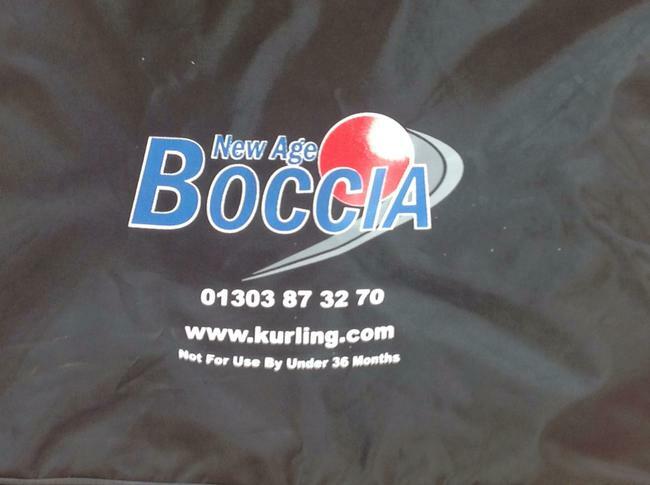 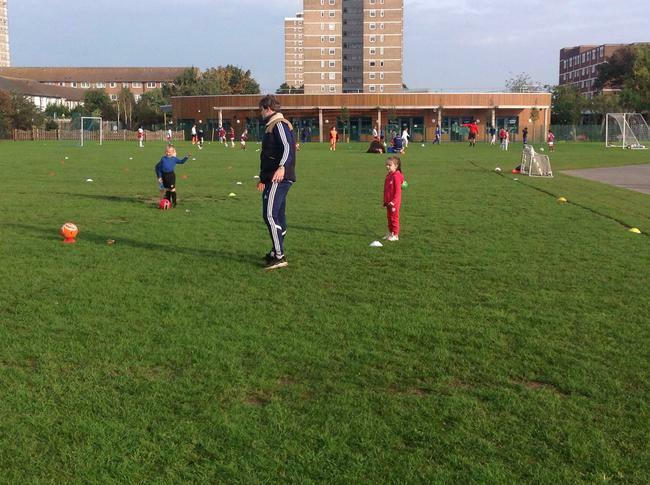 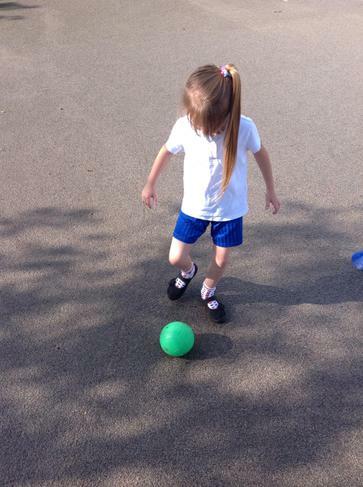 They are brilliant for boosting the children’s confidence. 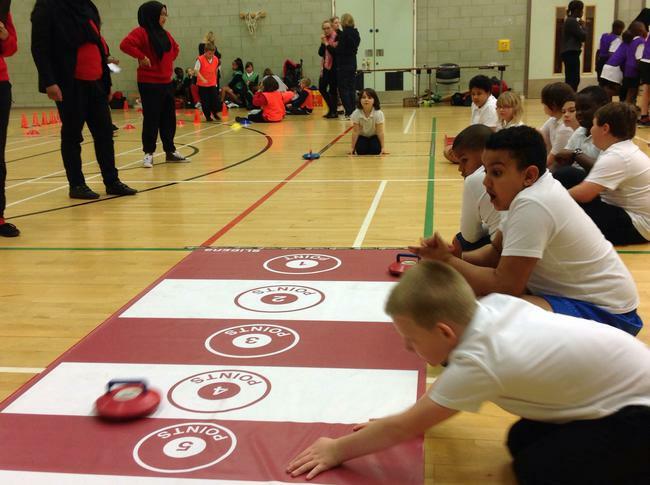 Panathlon COO Tony Waymouth explained that the Primary Panathlons had developed from the main Panathlons and were now being taken up widely by primary schools. 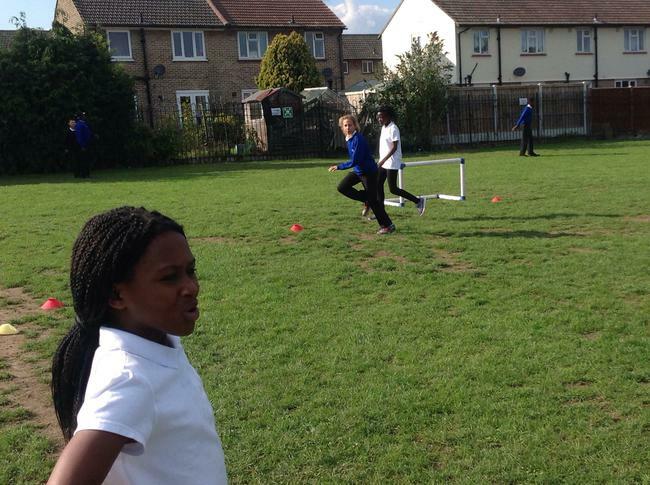 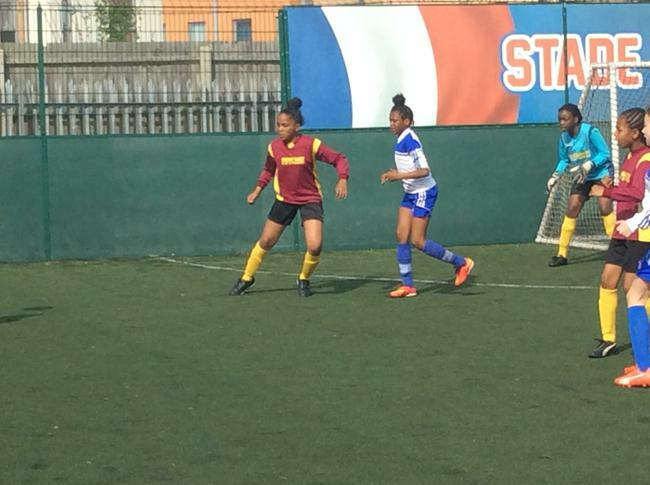 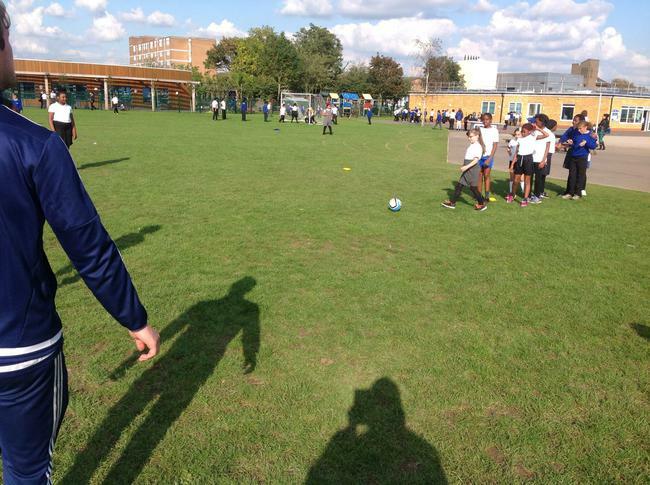 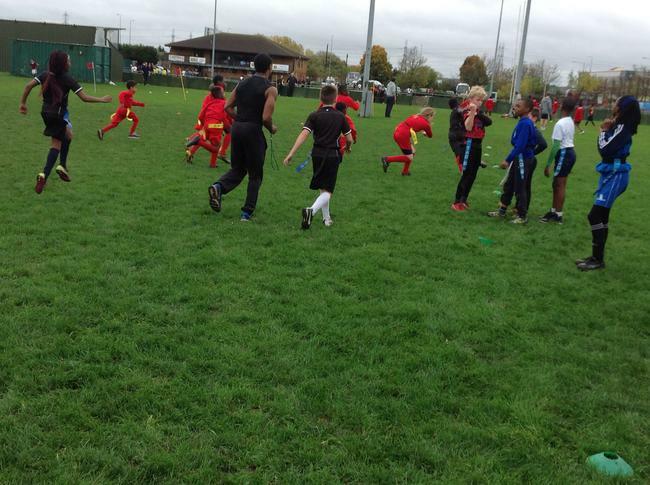 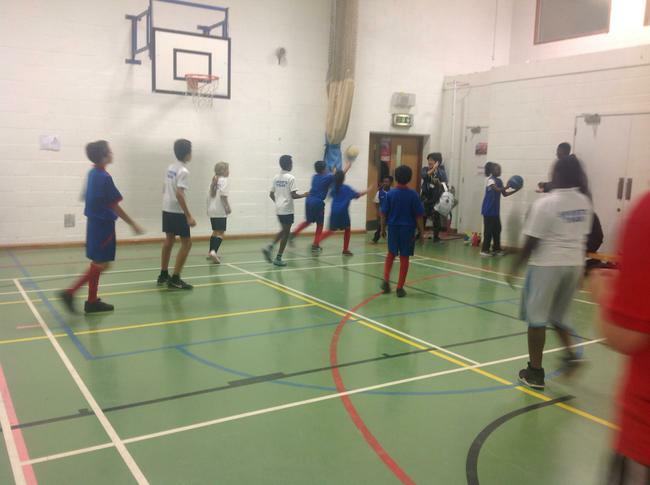 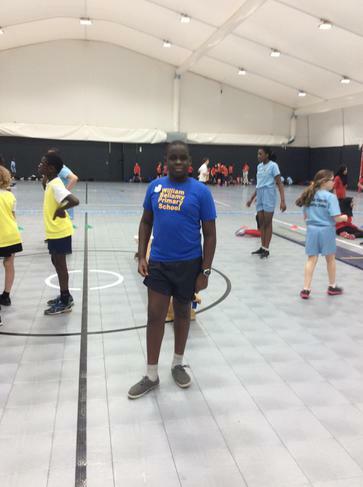 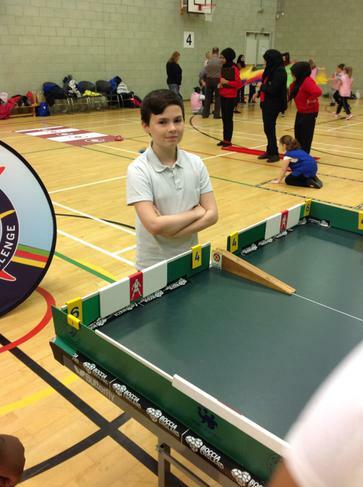 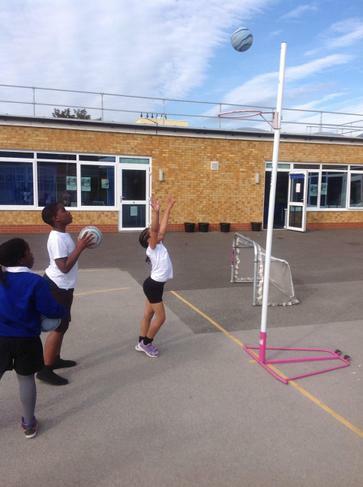 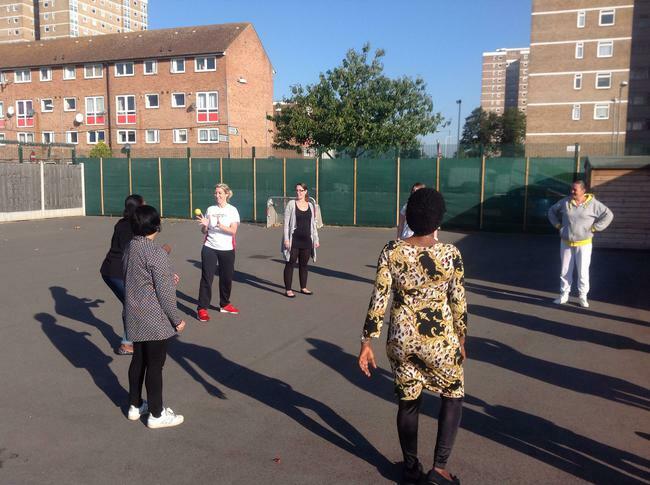 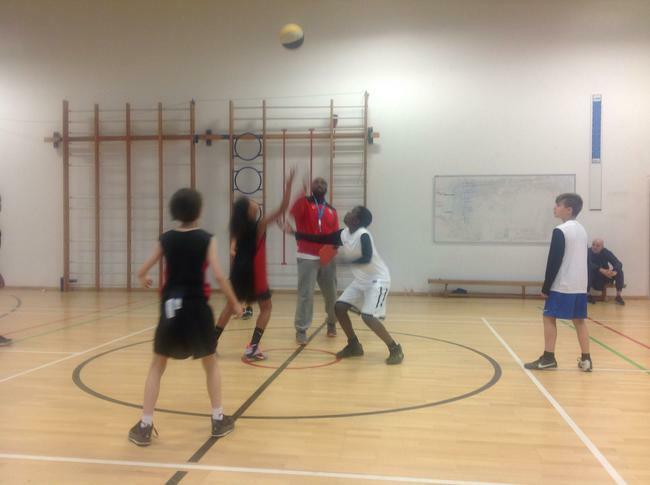 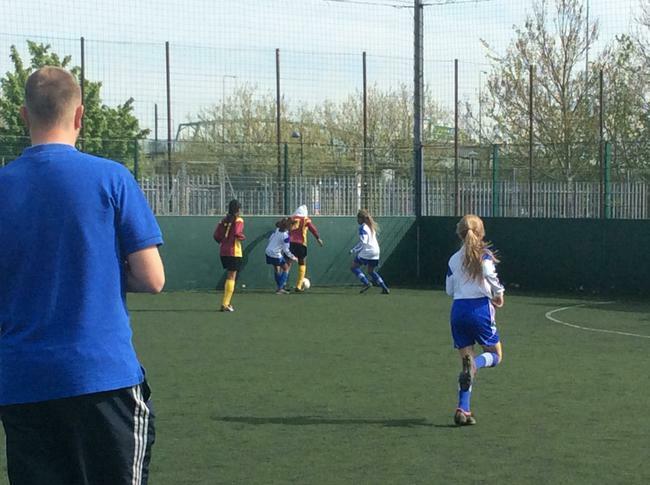 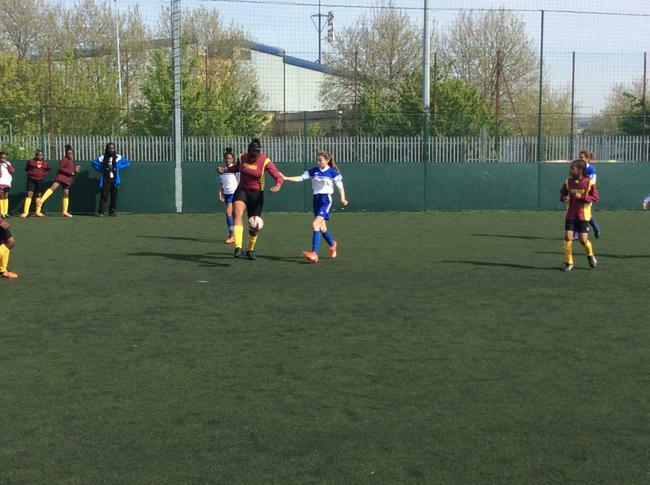 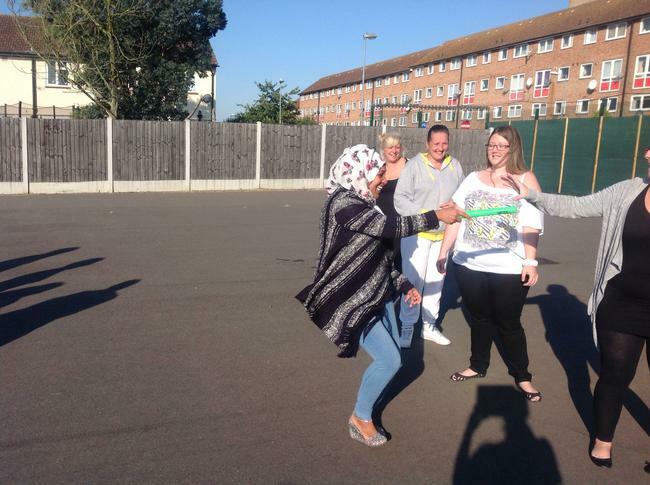 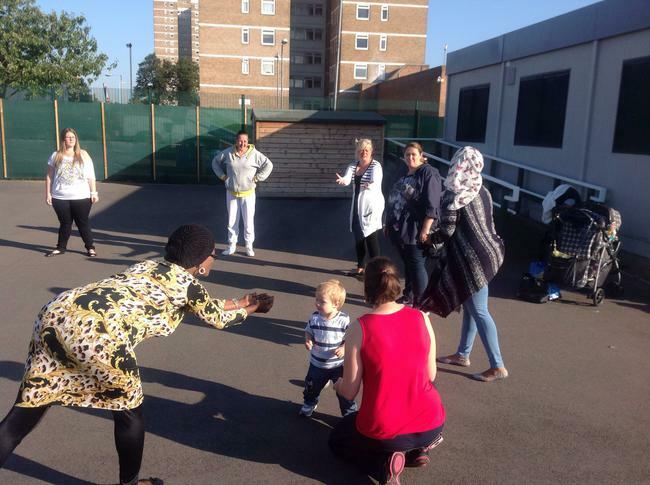 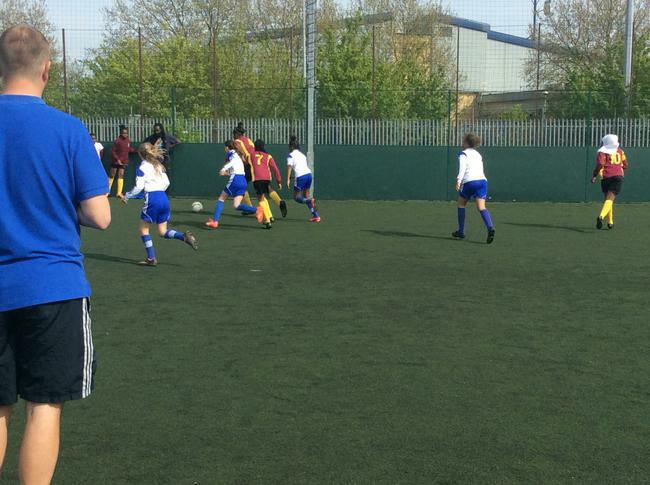 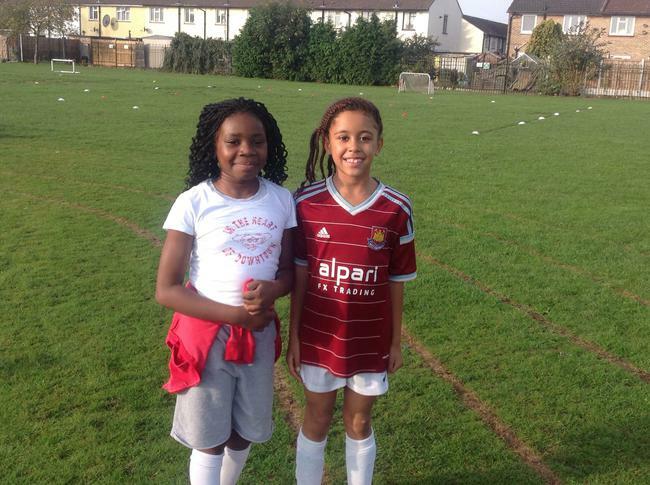 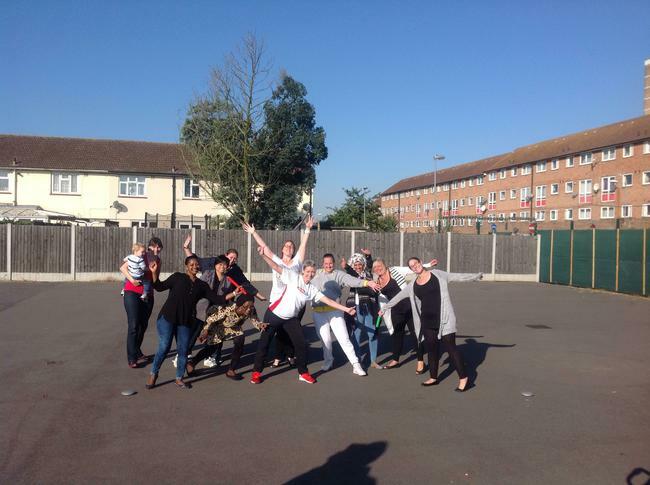 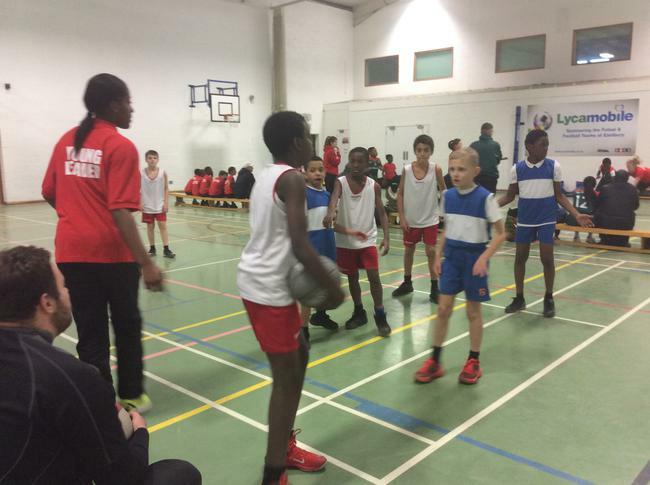 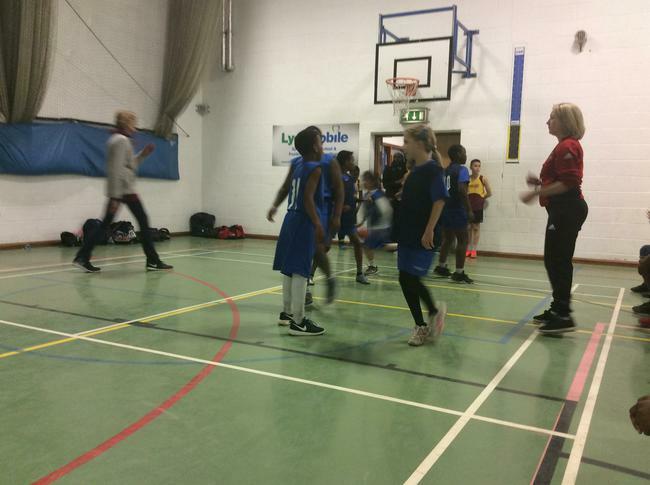 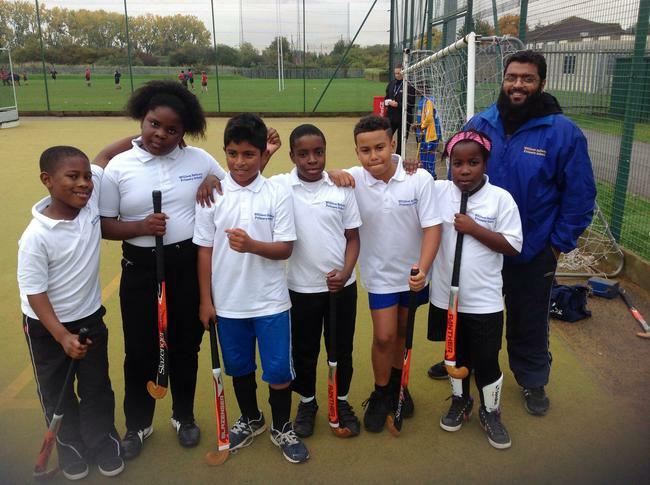 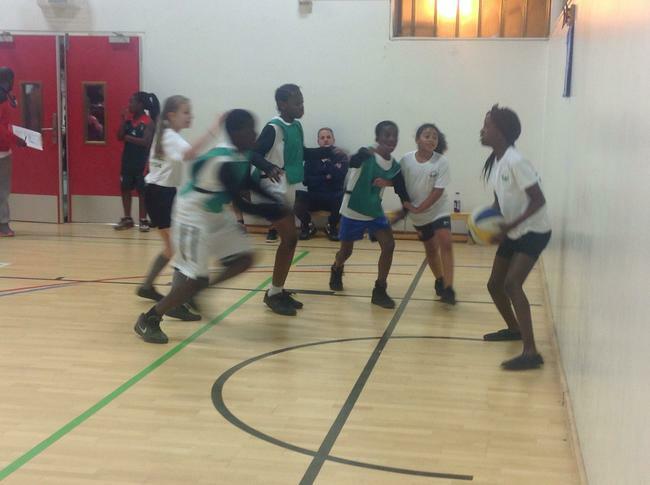 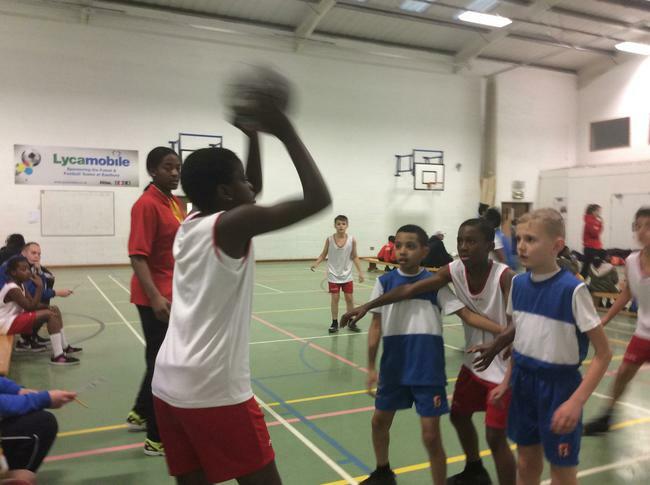 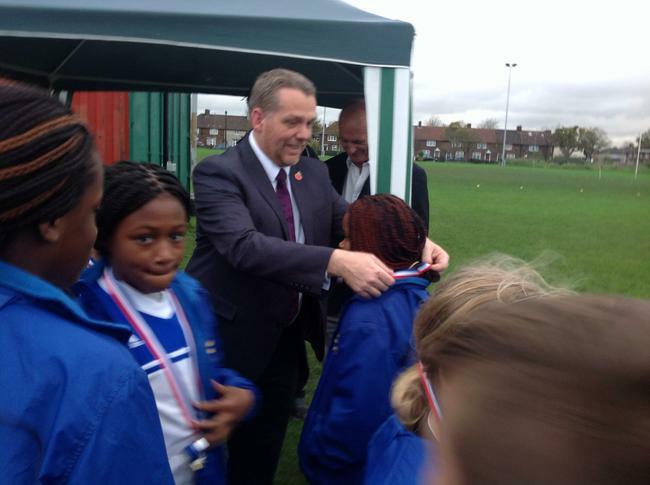 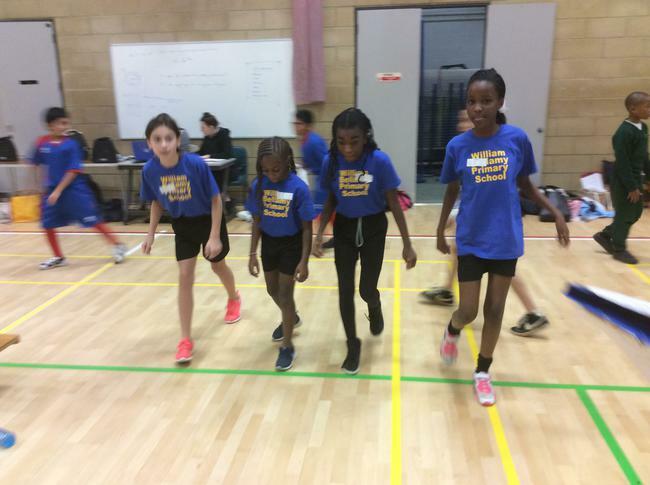 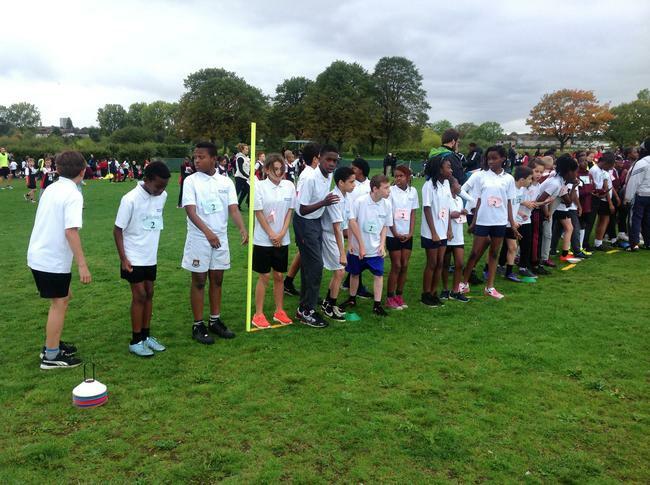 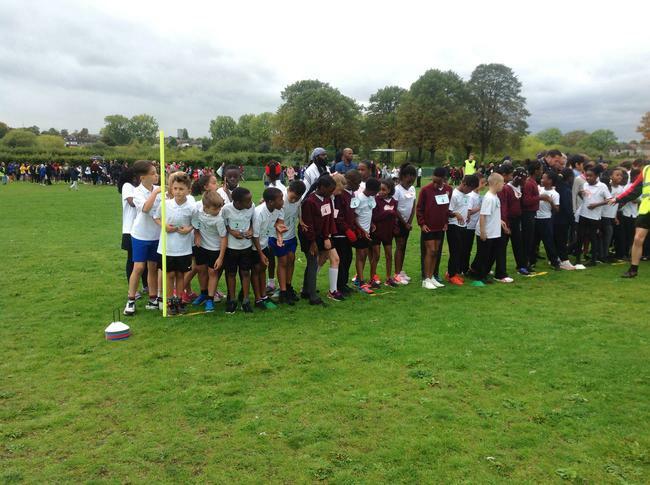 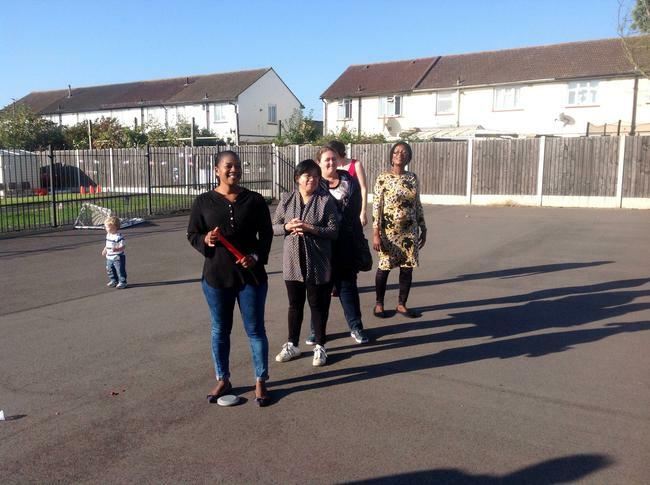 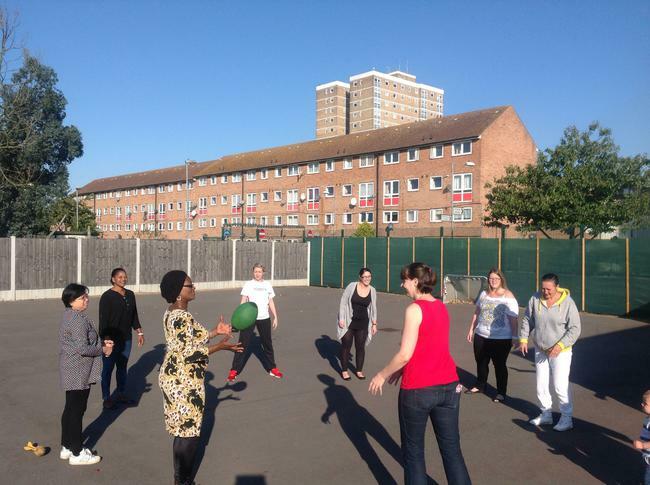 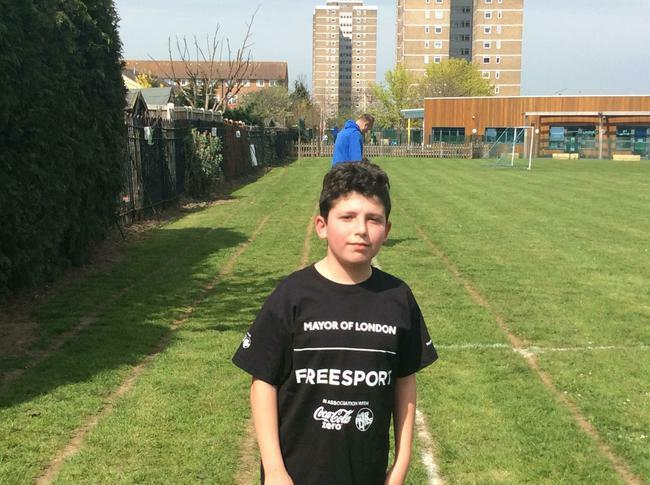 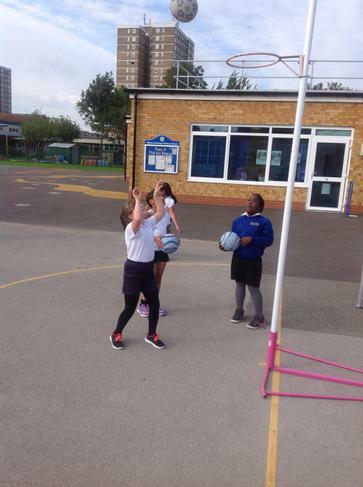 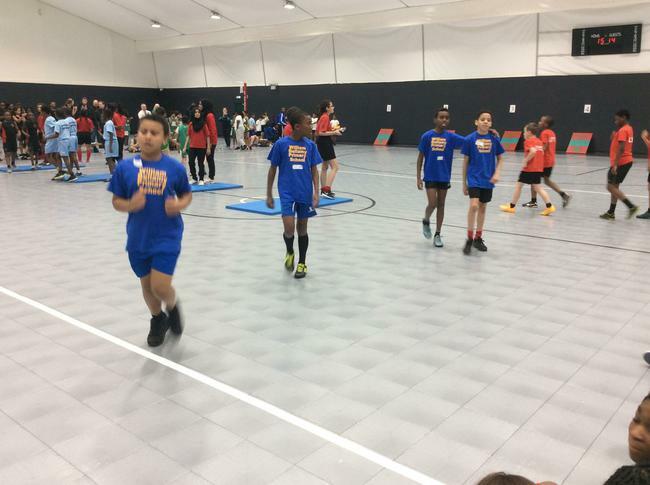 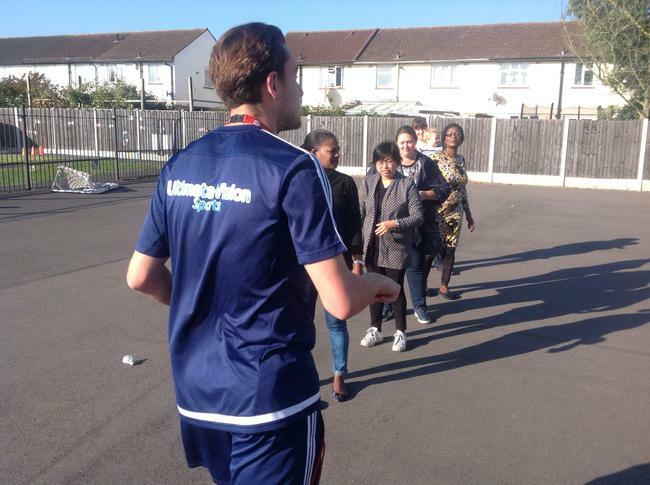 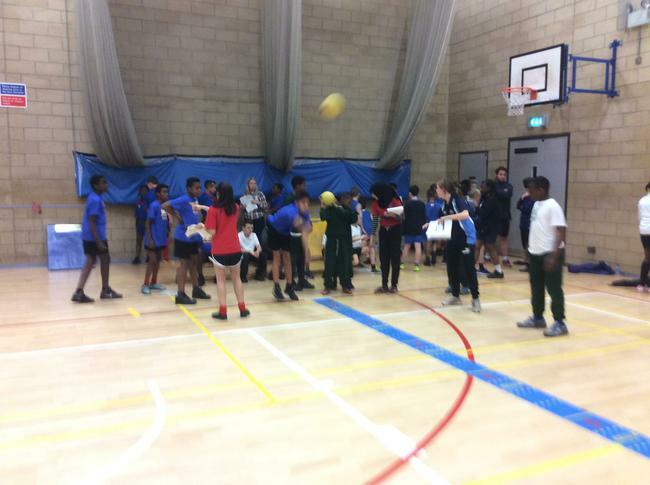 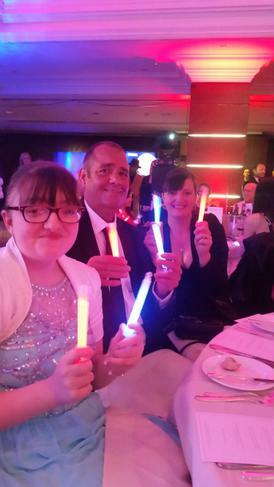 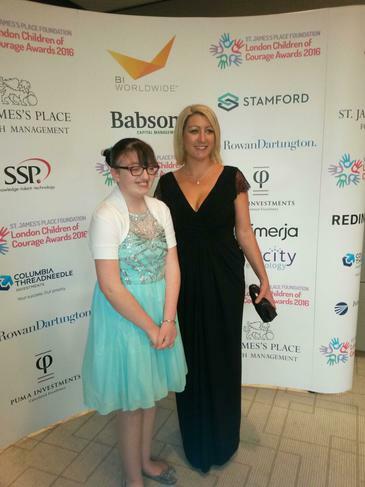 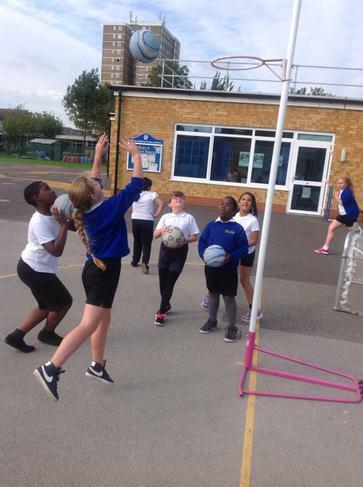 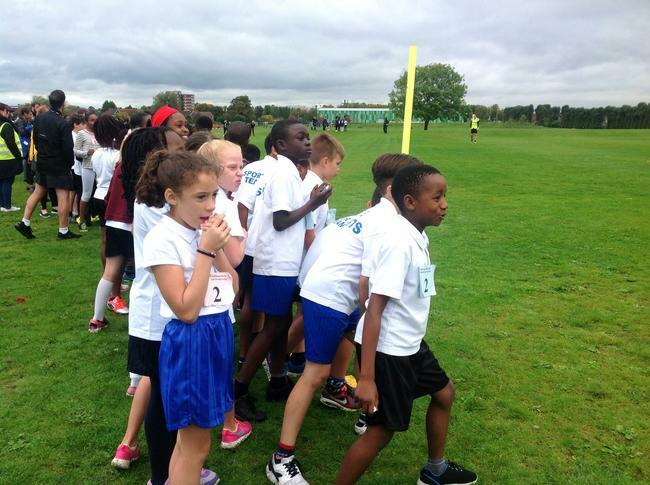 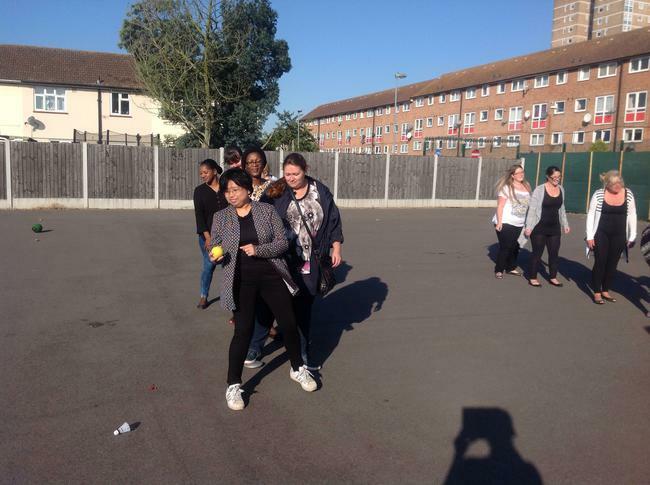 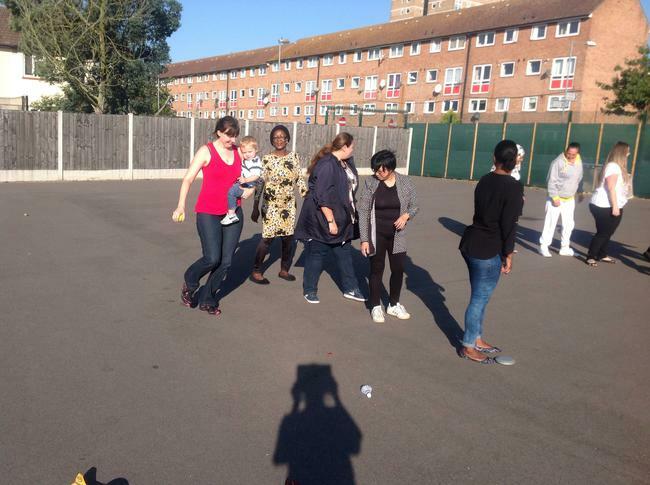 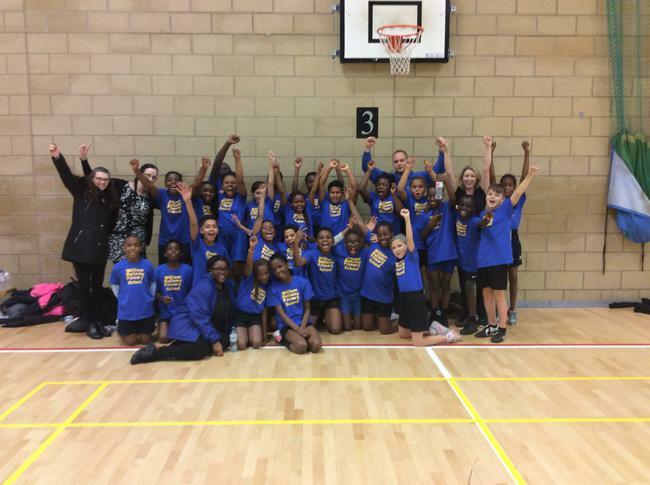 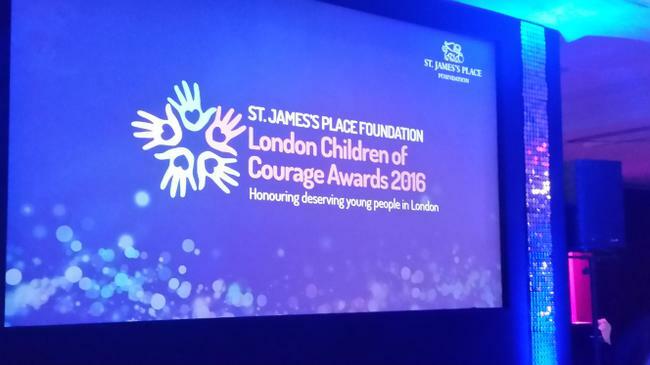 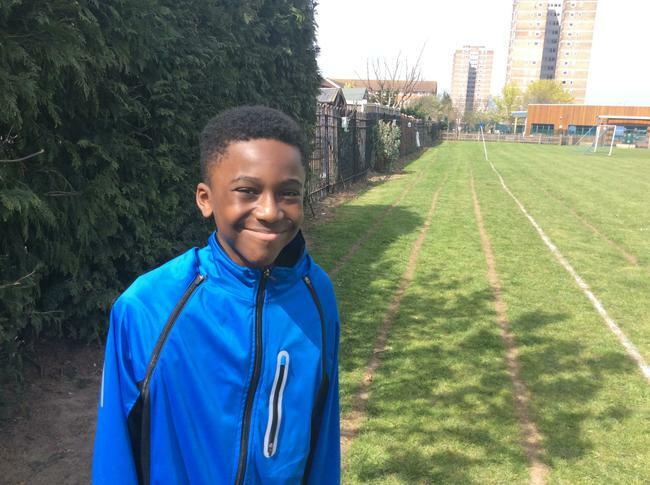 “This is a great step forward for Barking and Dagenham, and the new schools involved with an impact on existing schools and a whole borough approach to Panathlon,” he added. 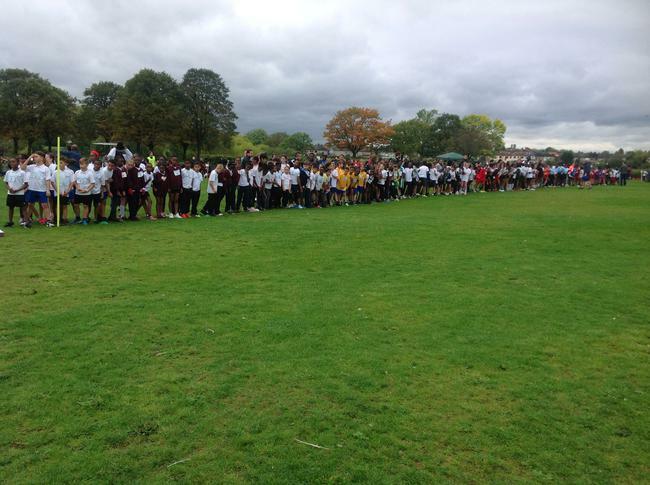 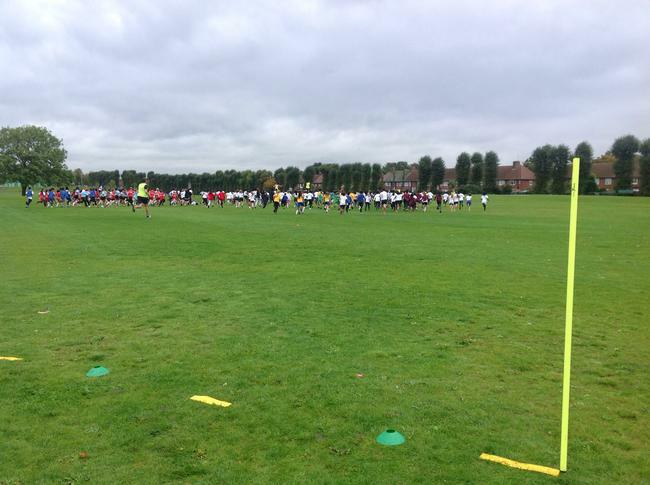 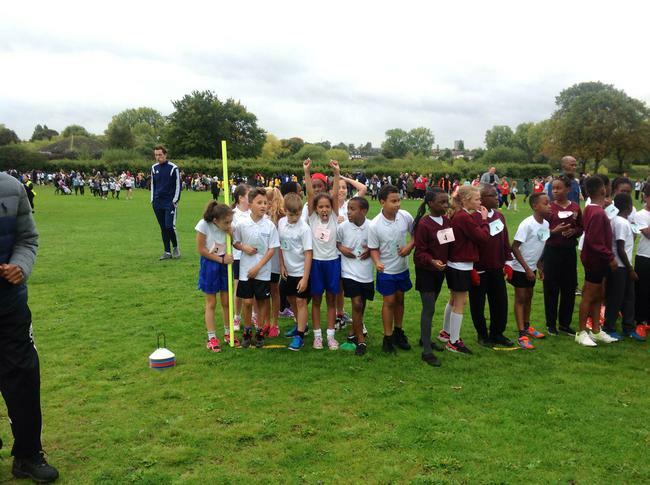 The schools which took part were Five Elms, Trinity, Beam, St Peter’s, Grafton, Ripple, James Cambell, St Margaret’s, Valence St George, Southwood and William Bellamy. 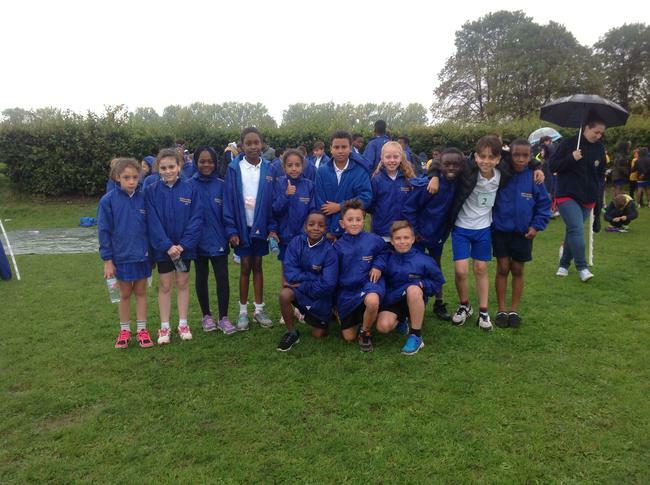 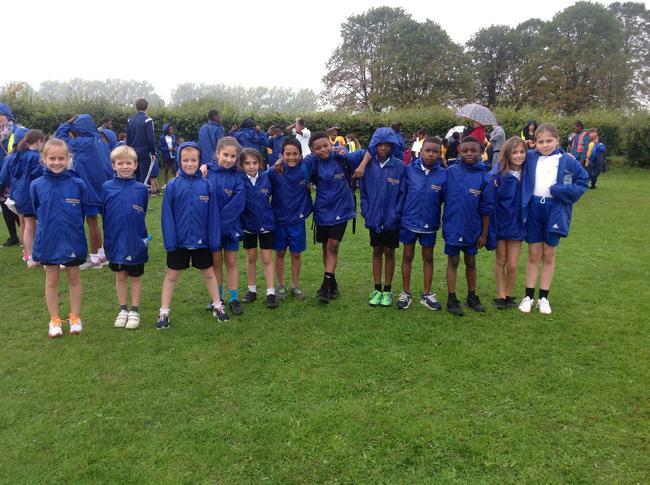 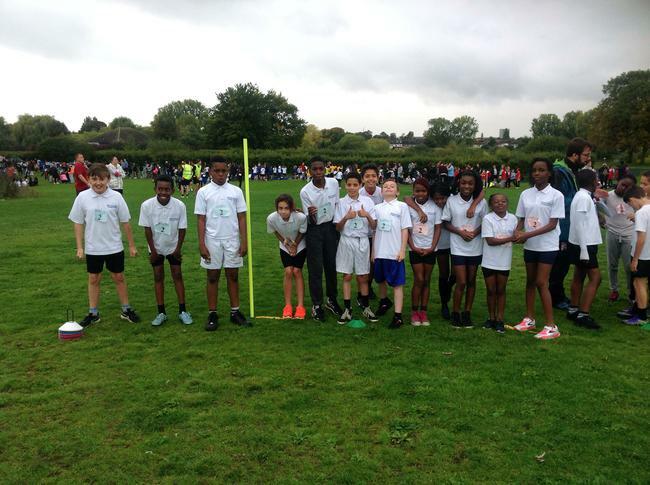 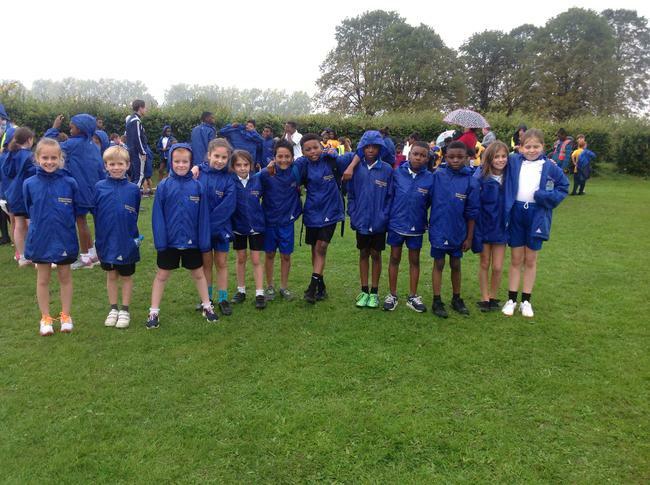 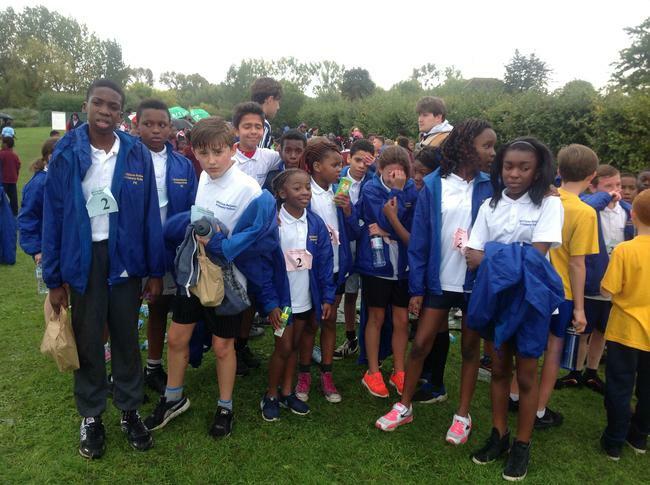 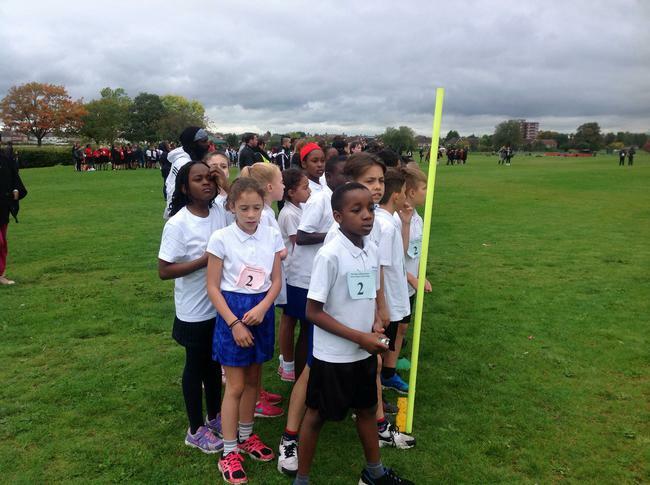 The year 5 and 6 athletics team had a fantastic day at the athletics finals. 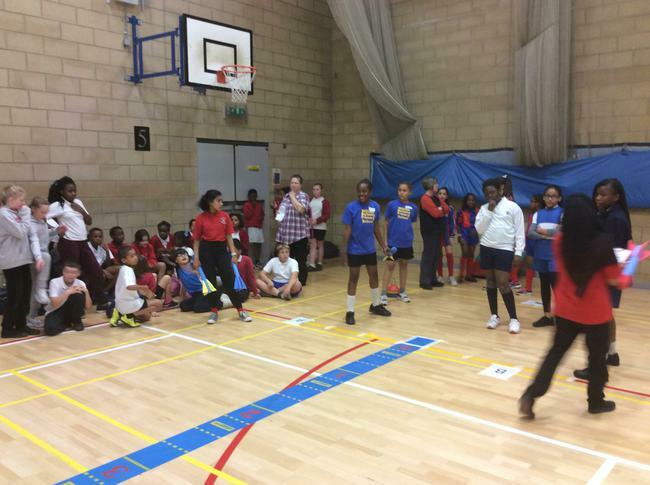 8 teams made it through to the final stage. 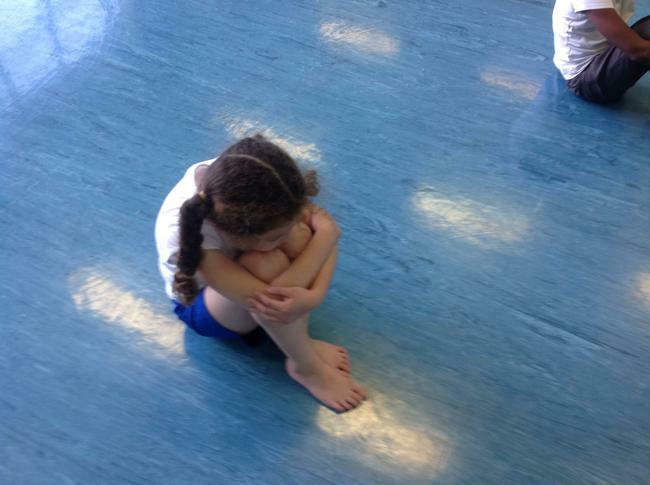 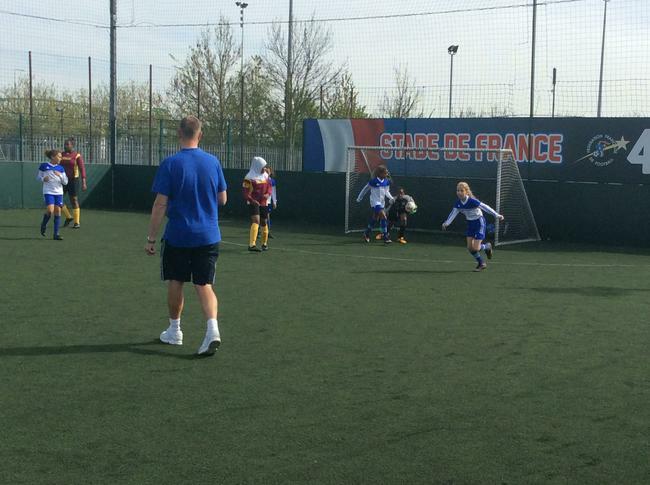 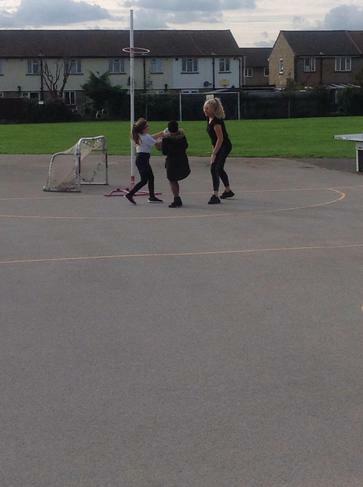 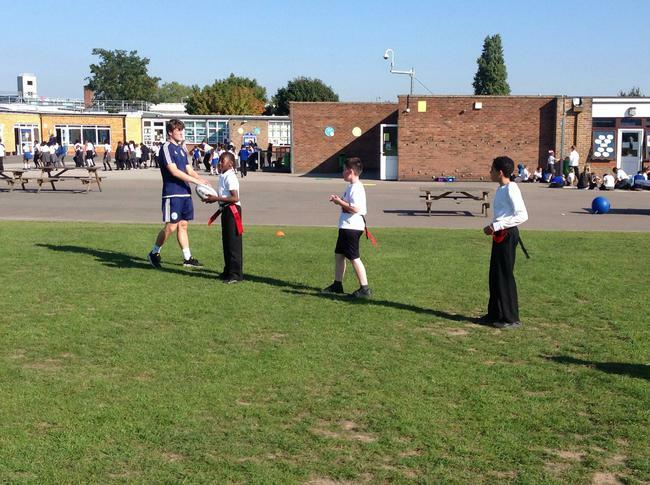 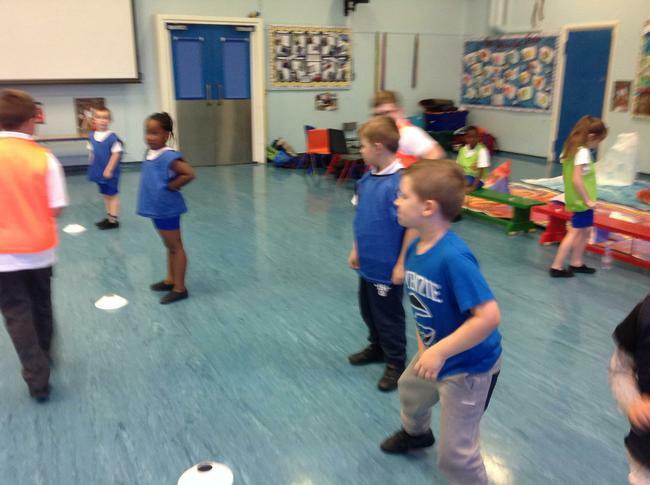 The pupils had to participate in a range of activities. 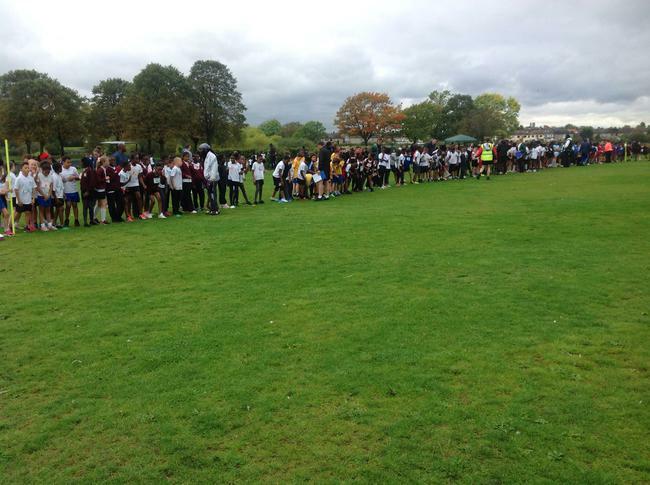 The competition was amazing, the standard of the schools were so high. 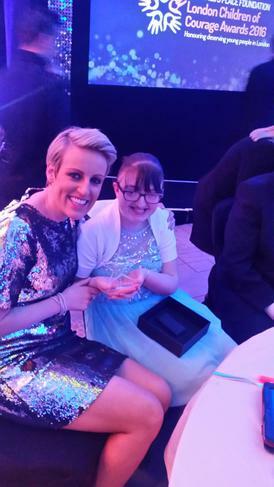 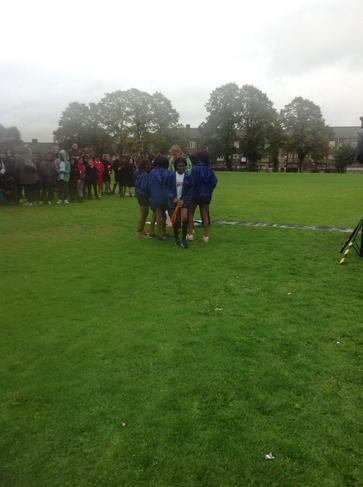 Our team were so positive, they cheered each other on and supported each other through the nerves and anxiety. 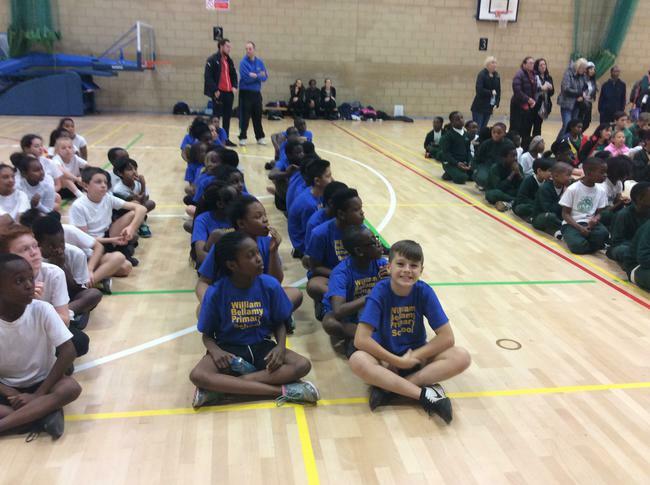 When the results were announced, we could not believe how close the top 3 schools were. 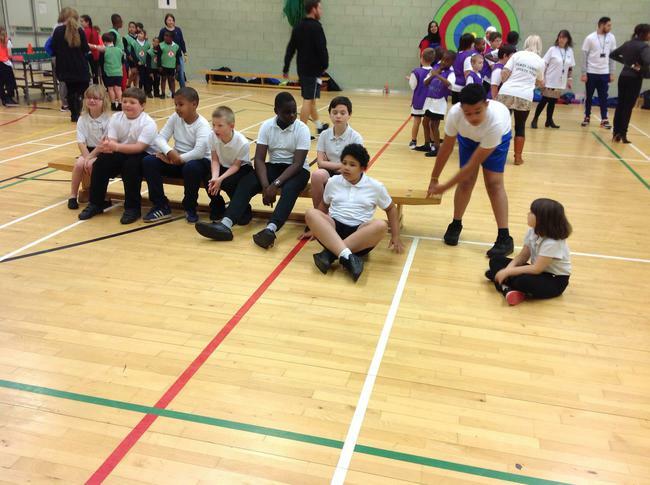 The winners of the competition only had 8 more points than us and the second place school only had 2 more points than us. 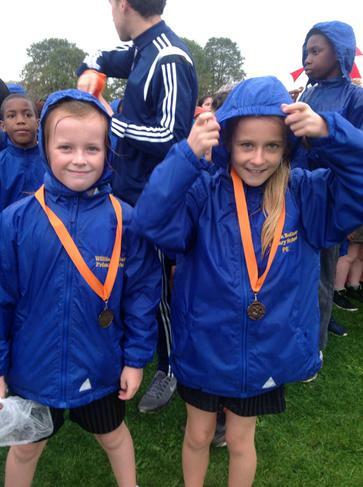 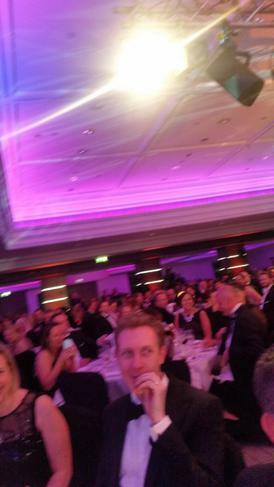 We were very happy with 3rd place but couldn't believe how close we were to the winners. 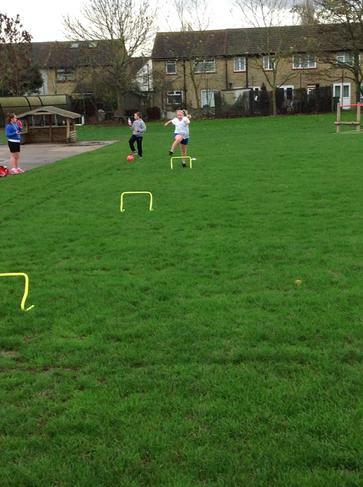 Our training definitely paid off. 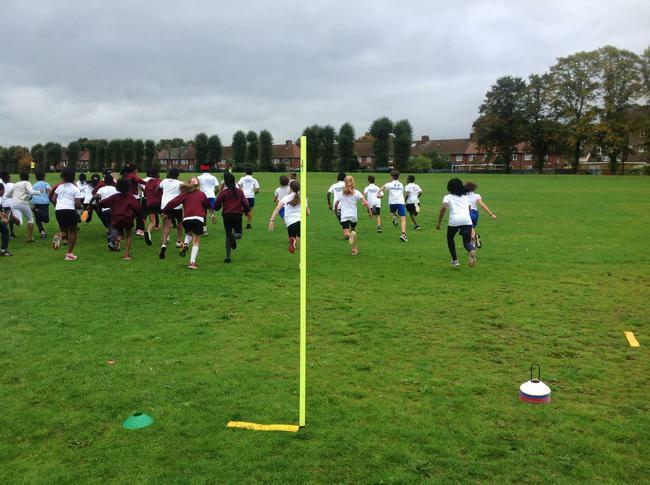 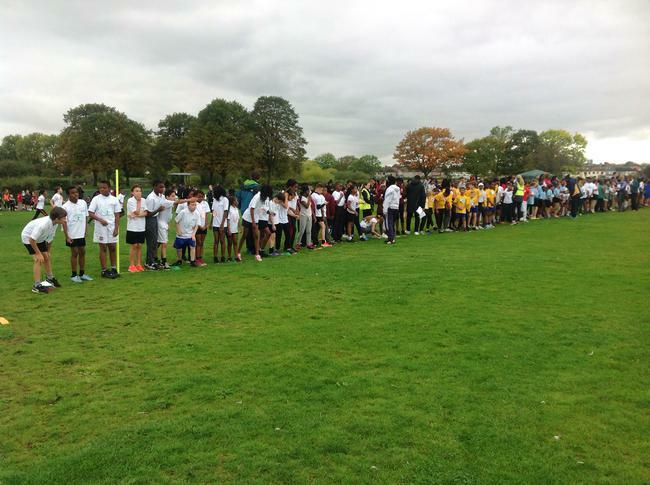 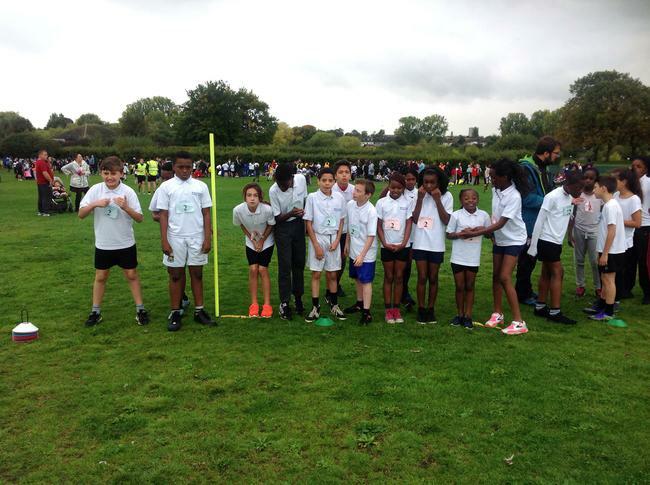 All teaching and support staff were so proud of all the athletics that took part, they demonstrated fantastic sportsmanship to all other participants. 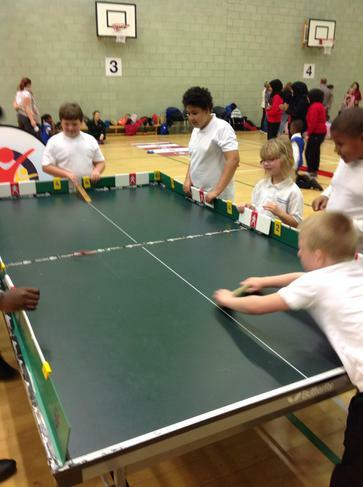 Our Primary Panathlon Team had an amazing time at the borough Panathlon Challenge. 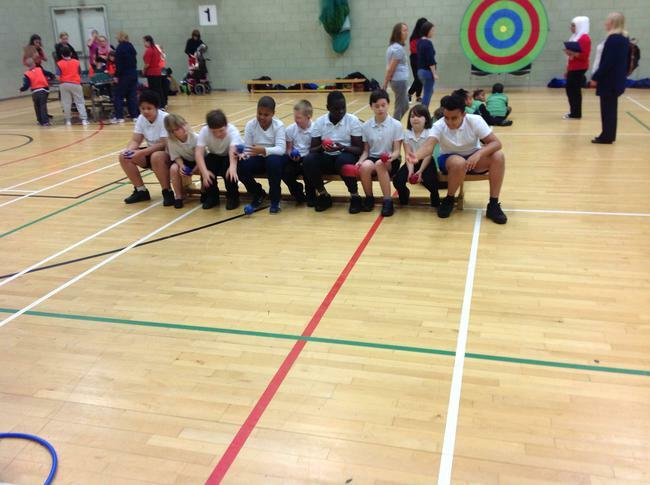 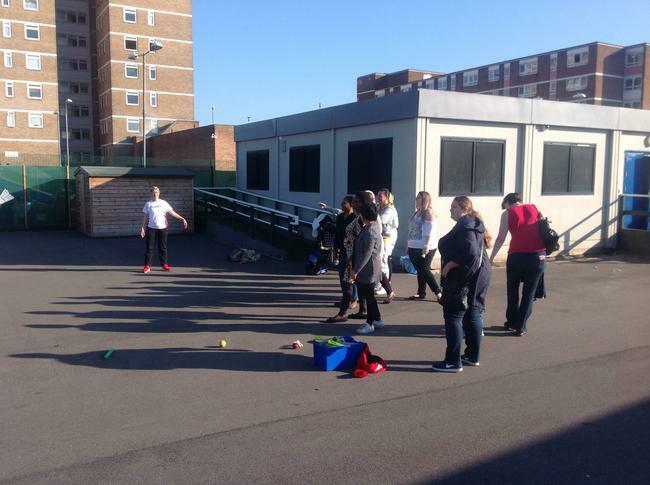 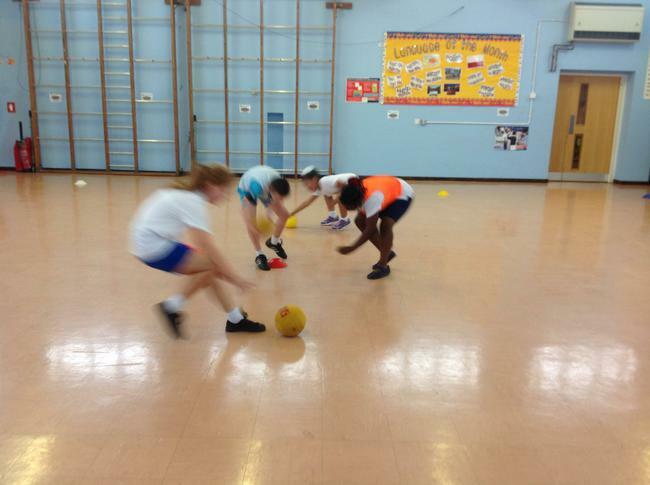 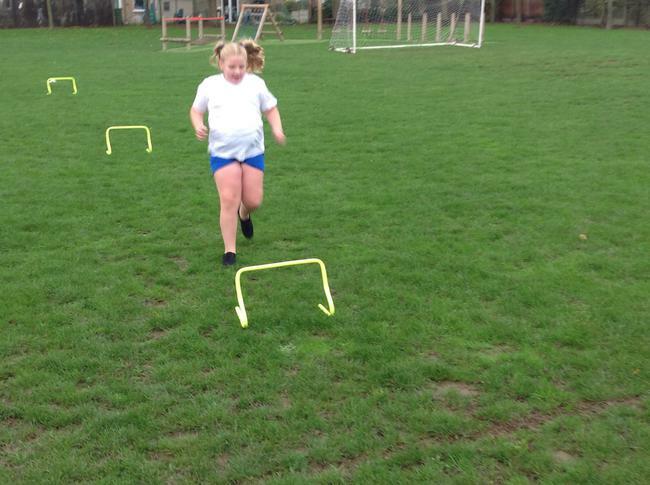 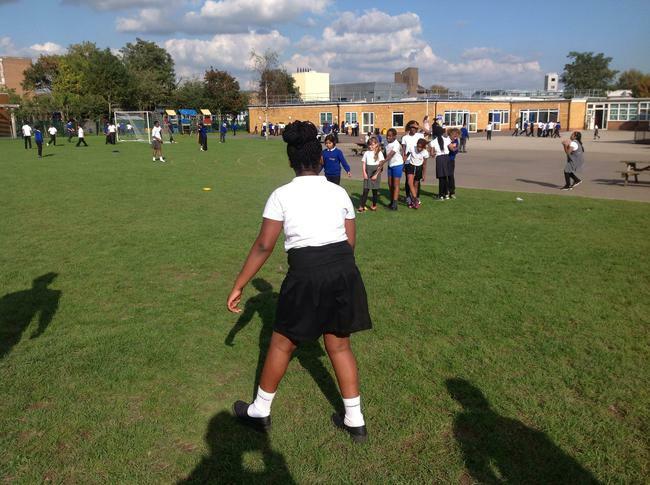 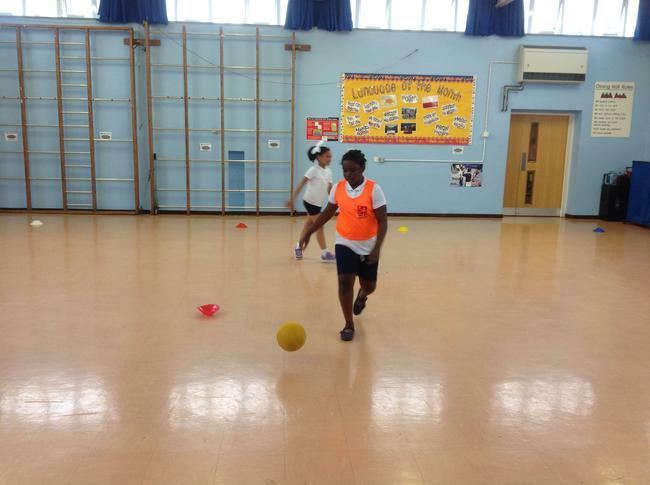 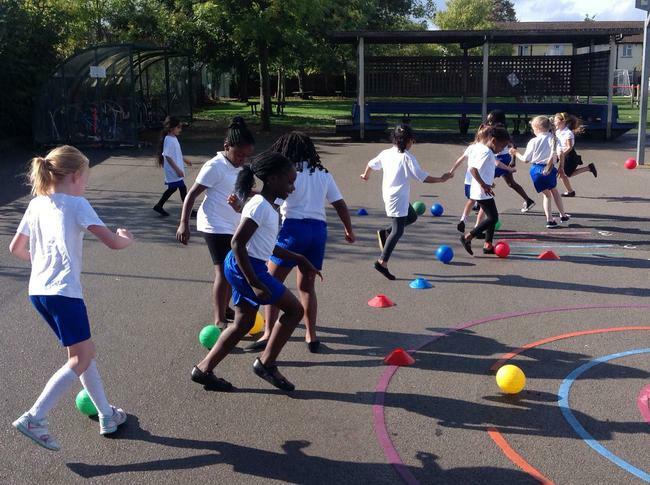 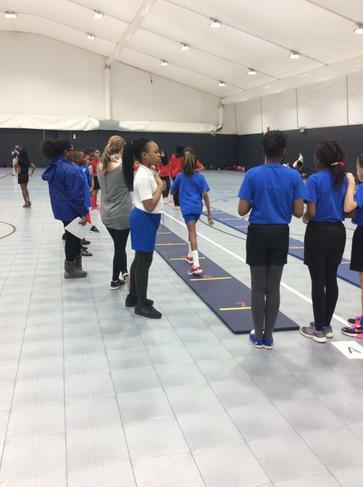 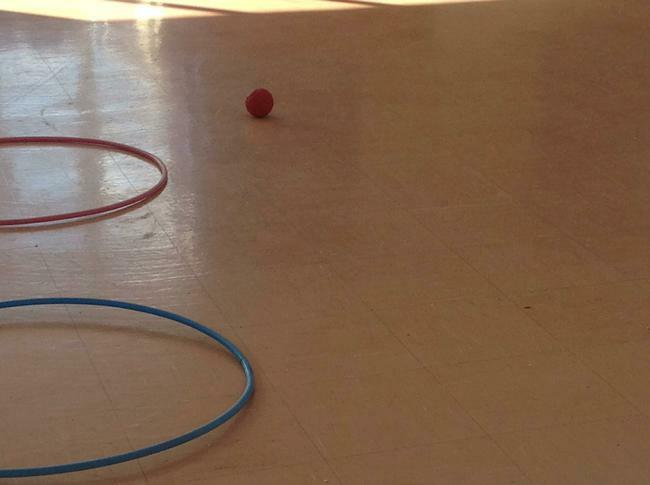 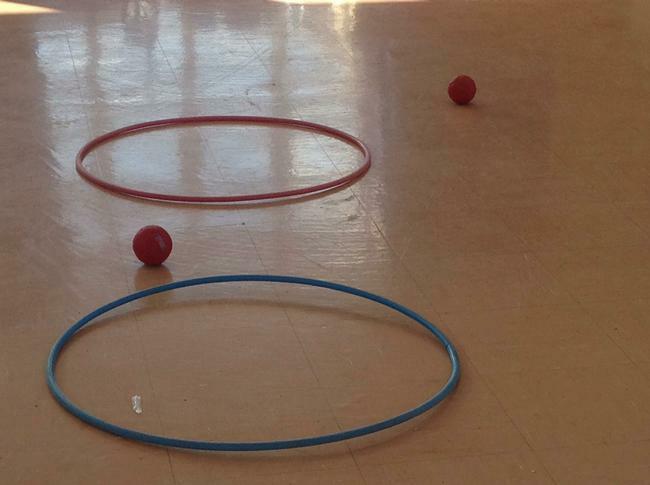 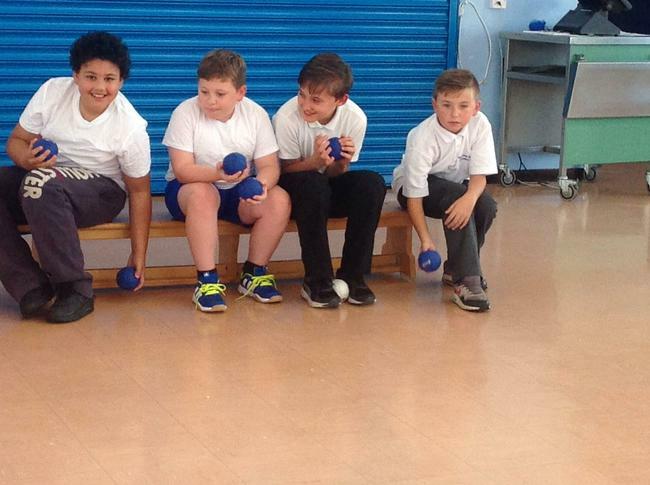 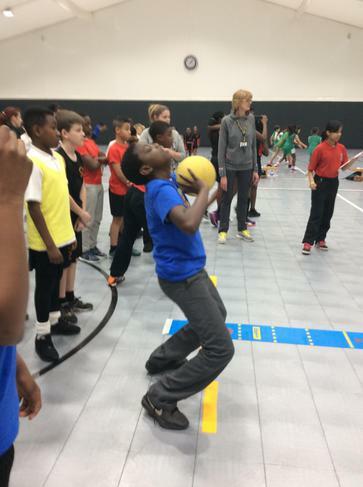 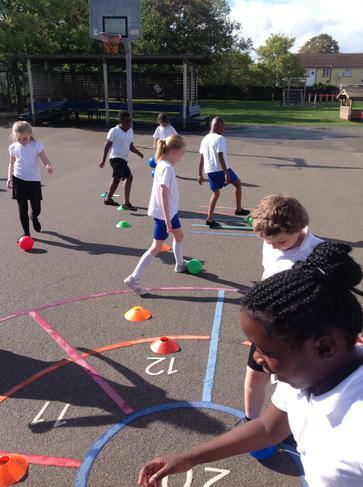 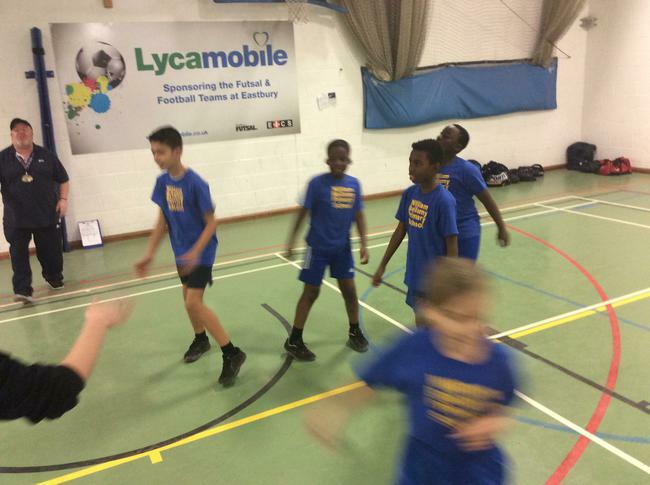 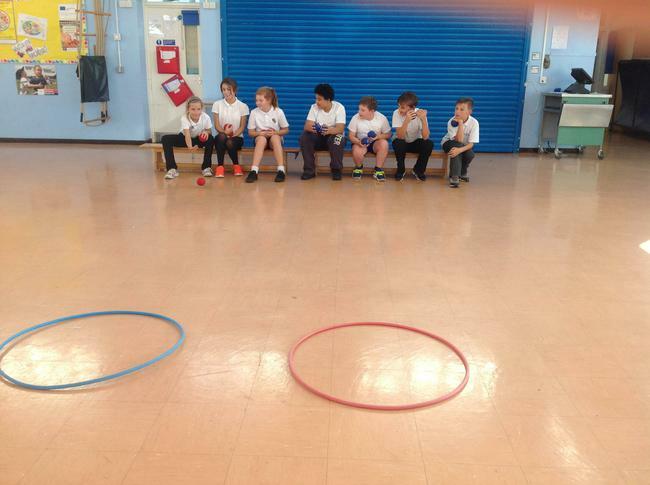 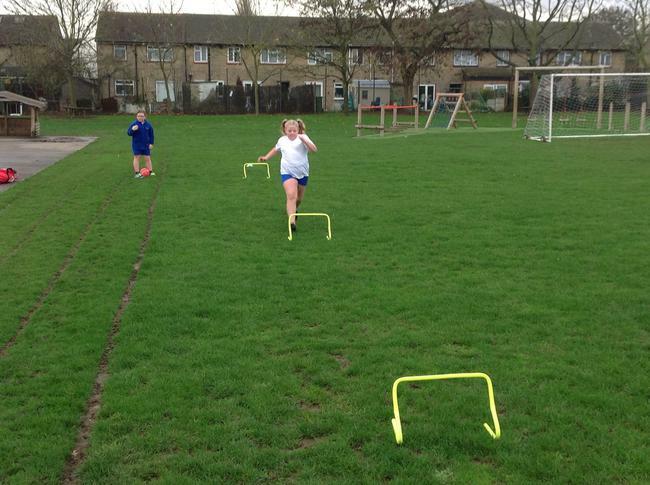 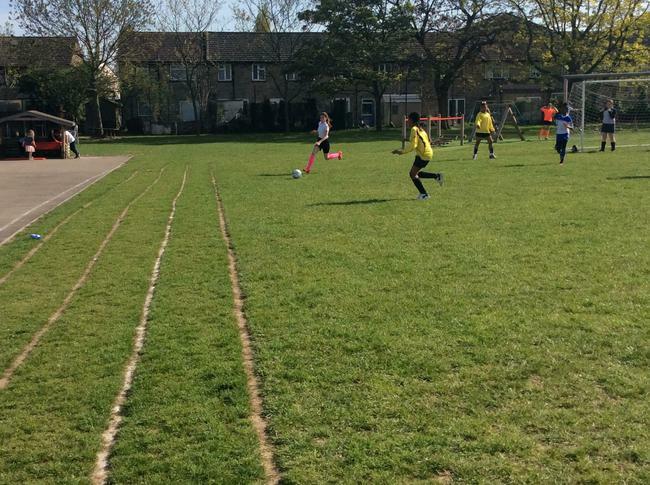 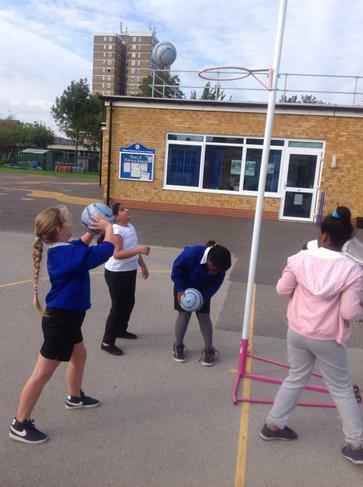 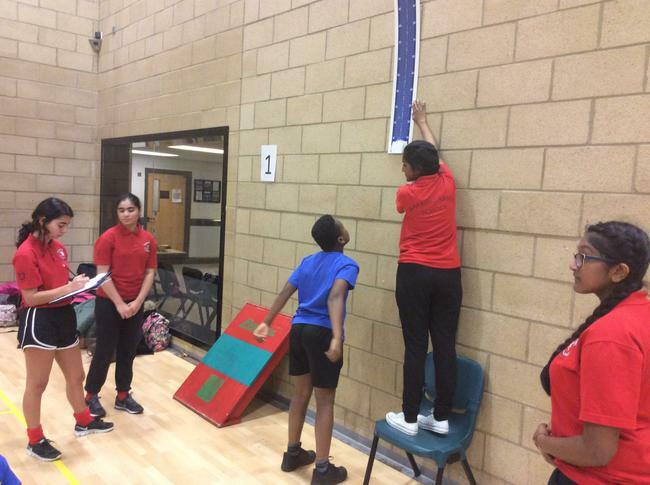 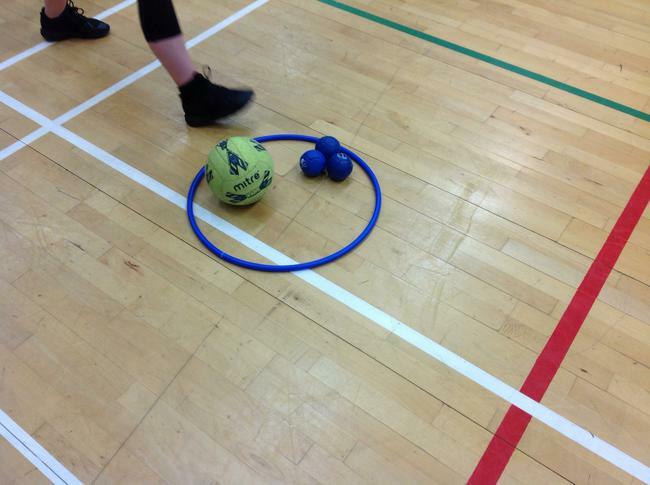 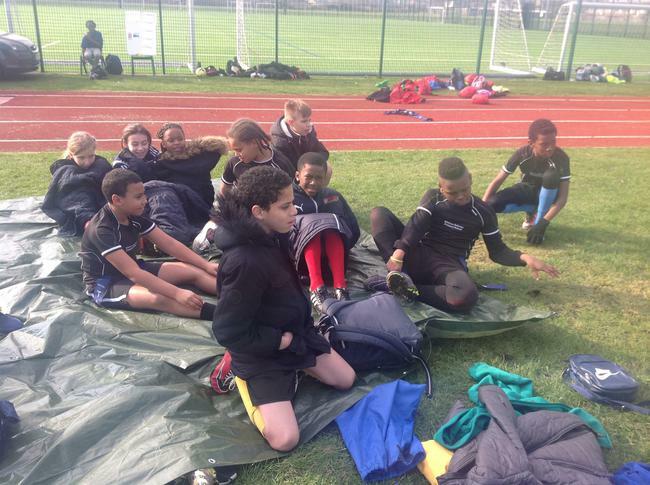 KS2 pupils from different year groups joined together to try different adapted sports, they competed together in target focussed activities, speed focussed activities and team building activities. 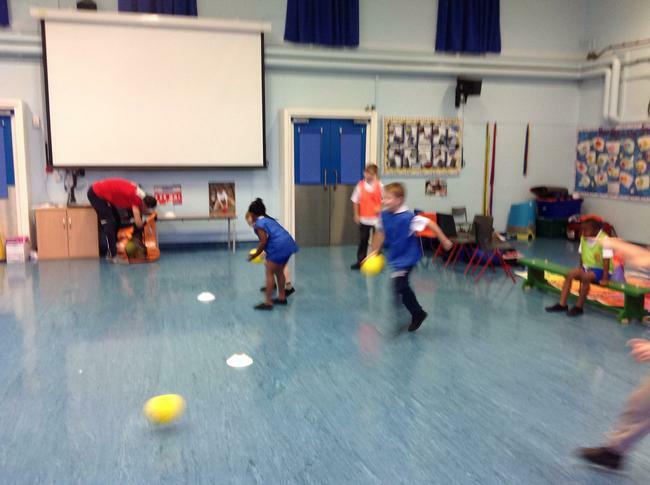 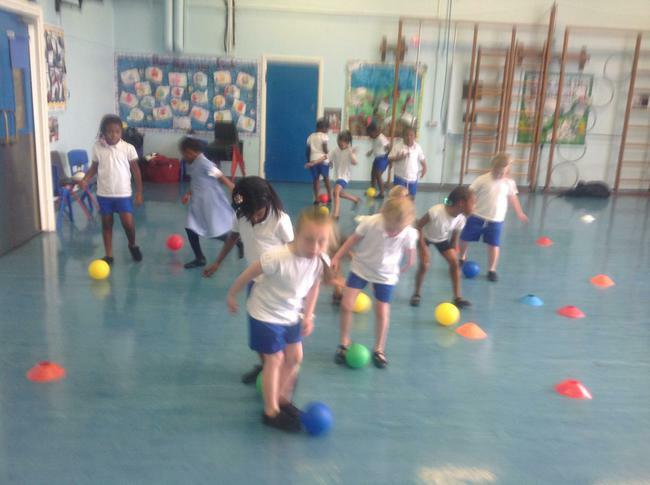 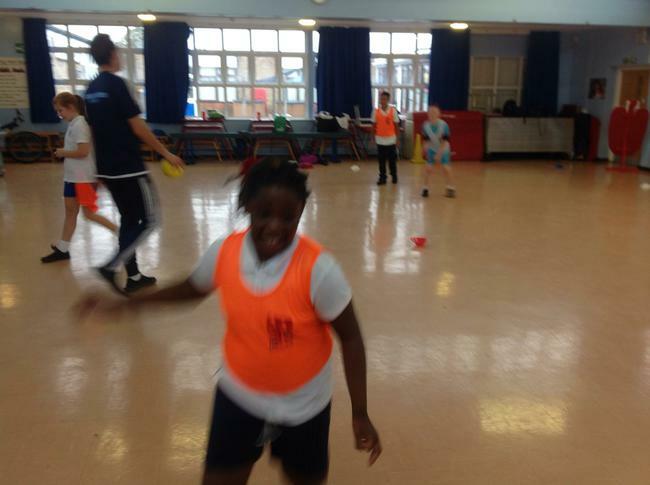 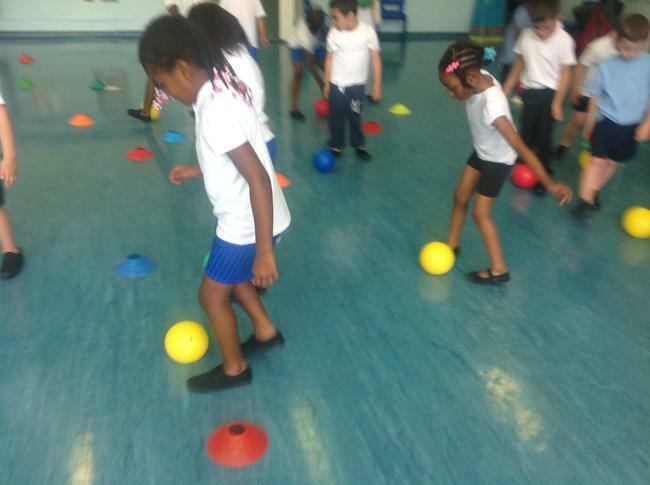 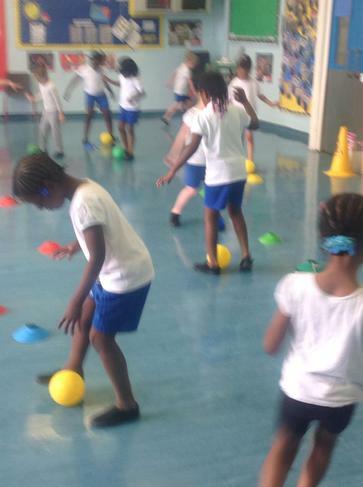 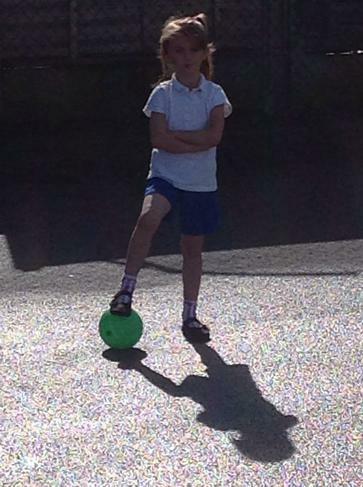 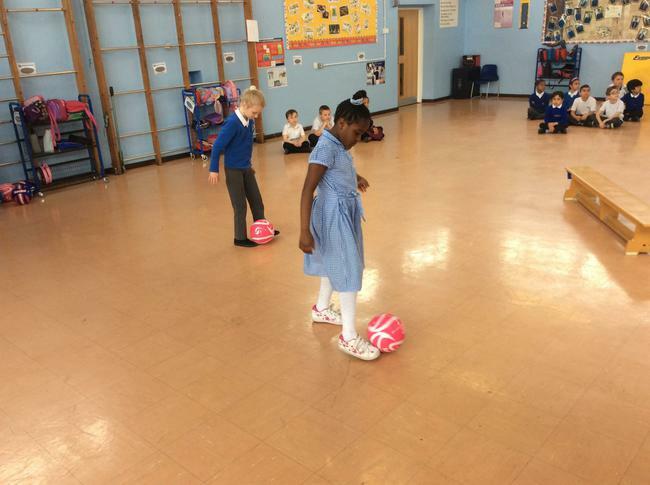 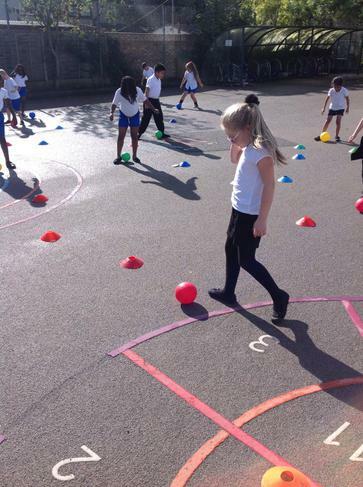 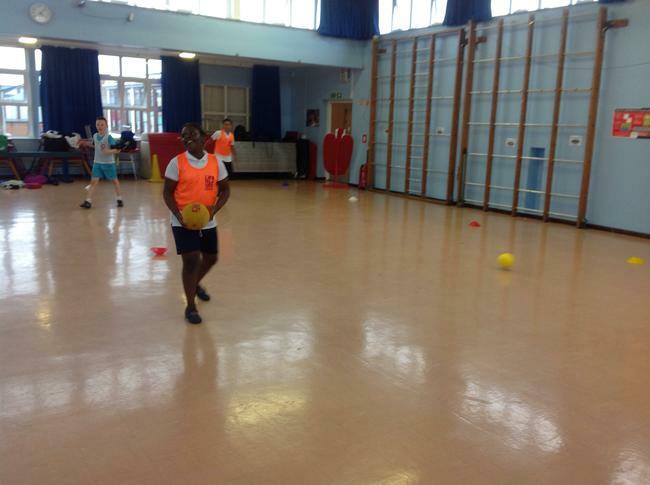 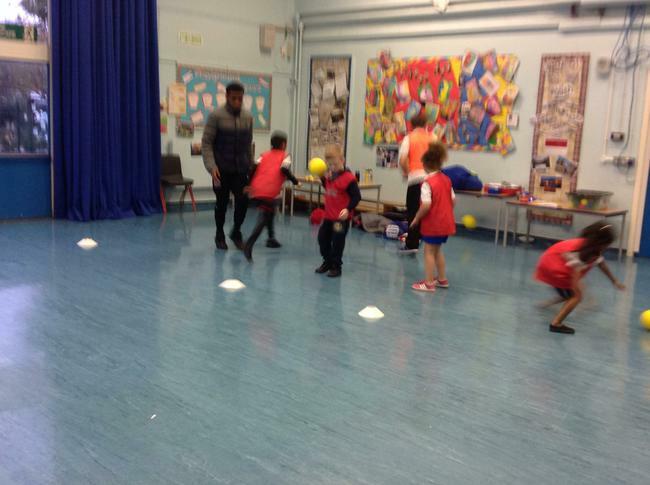 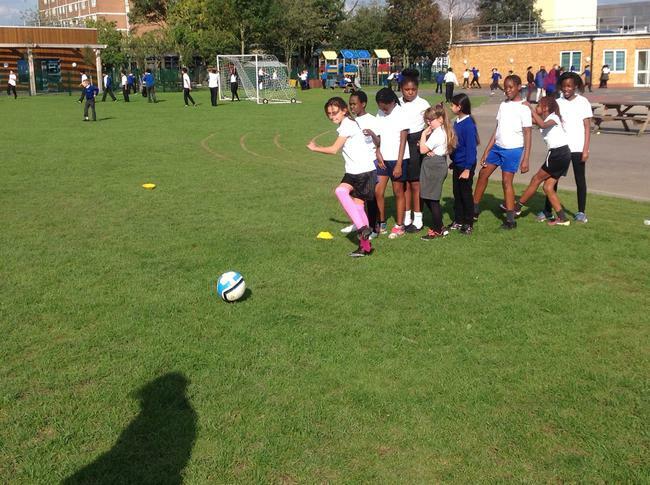 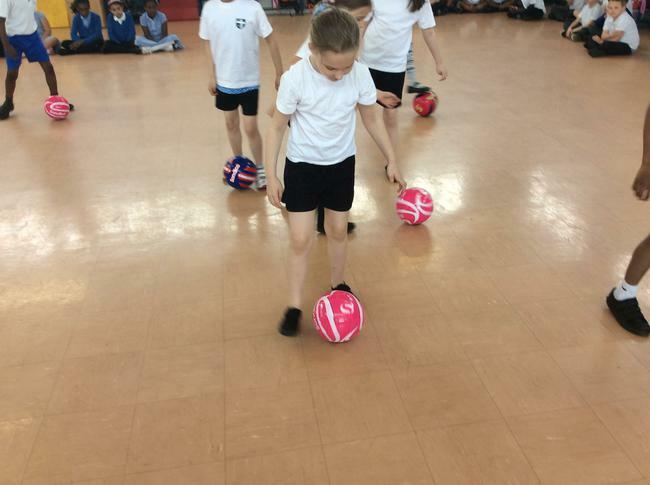 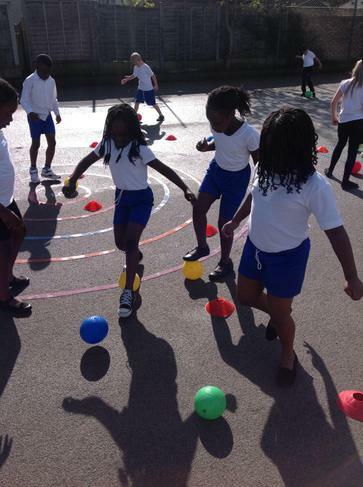 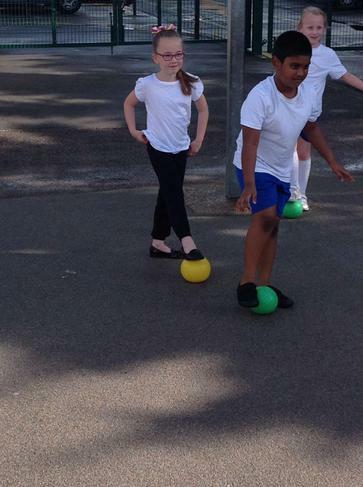 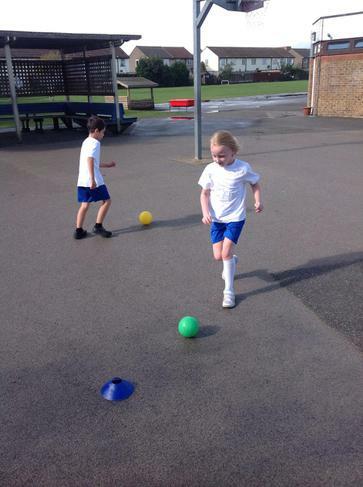 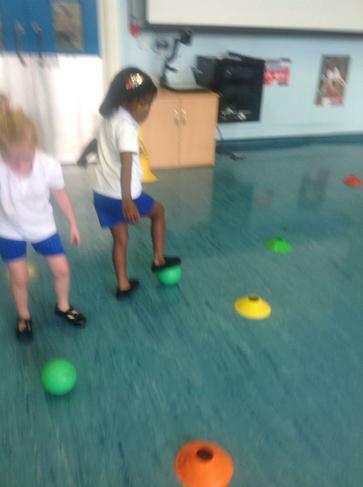 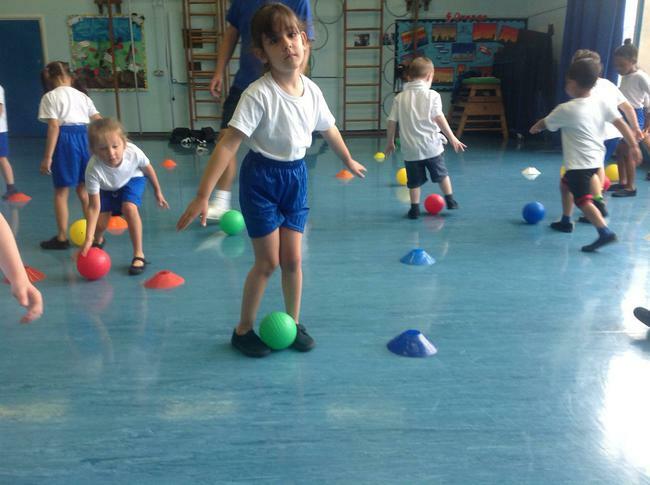 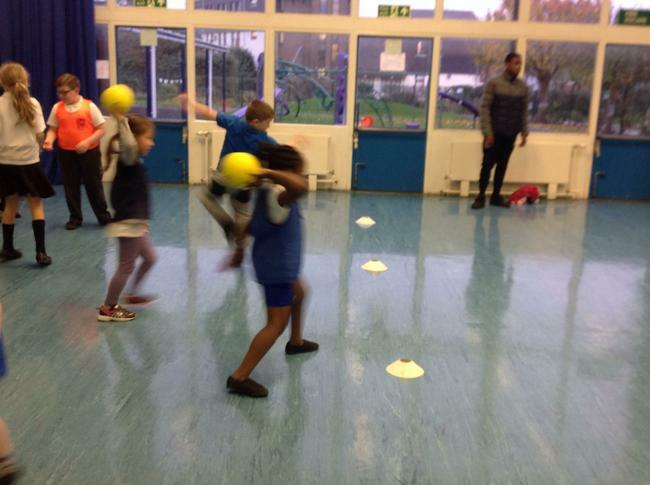 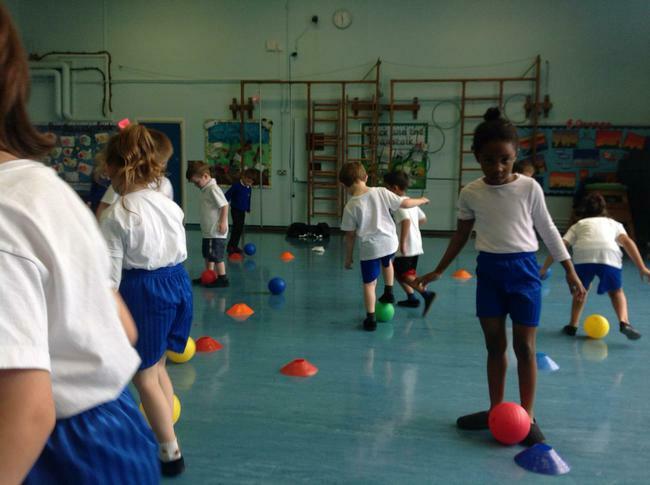 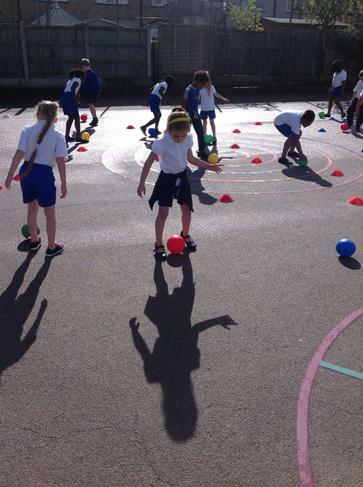 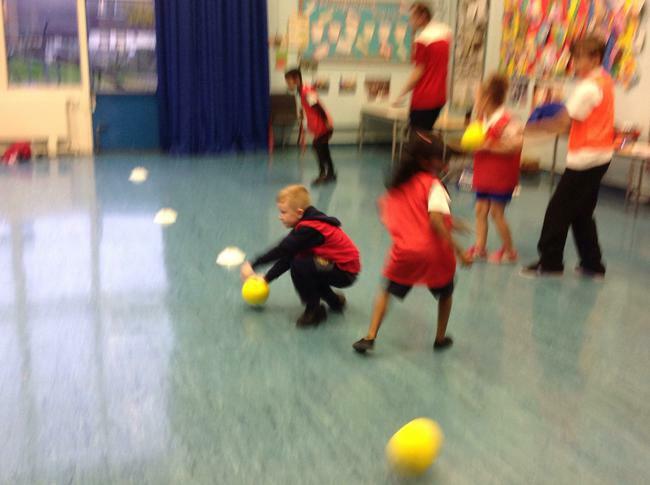 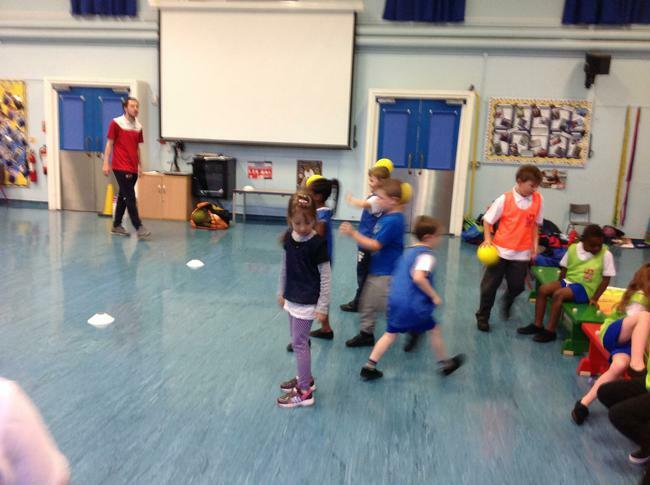 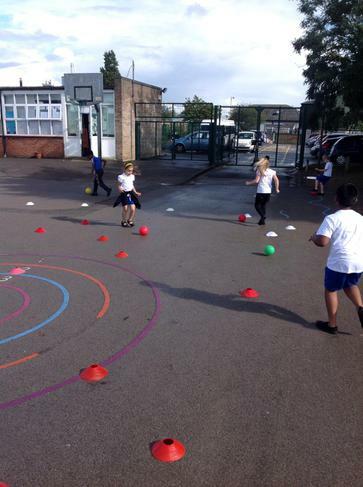 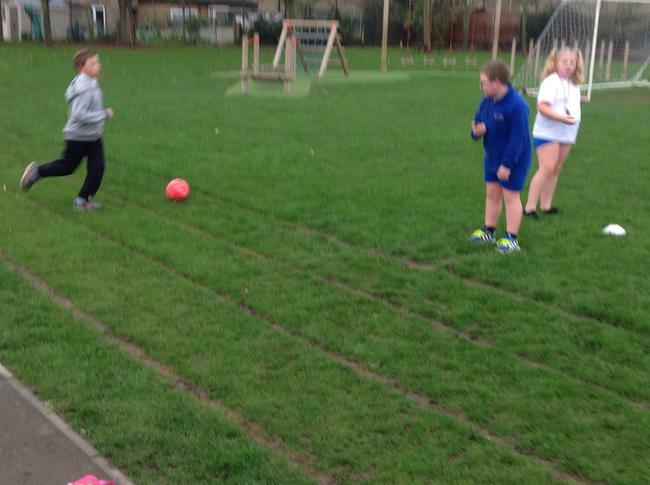 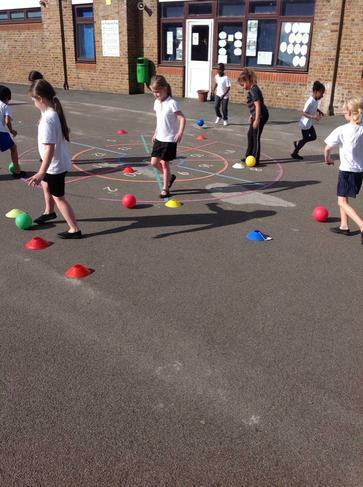 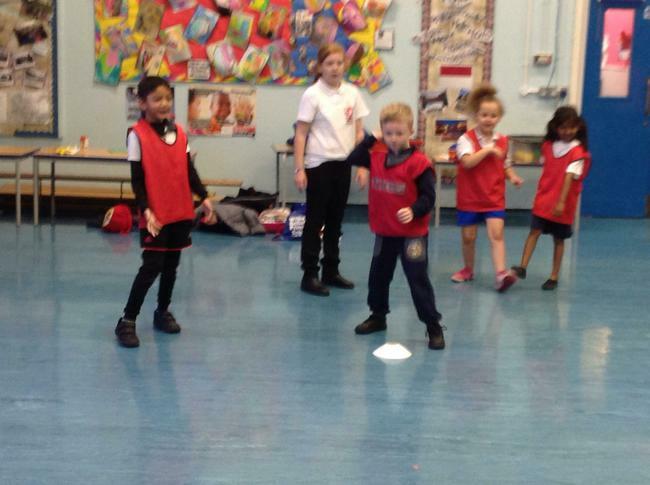 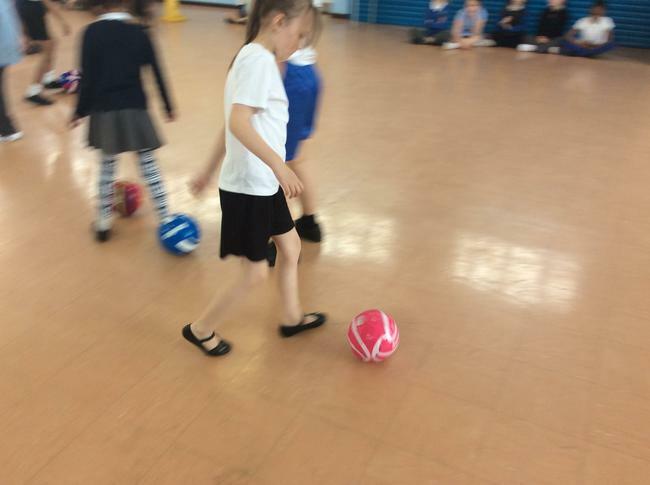 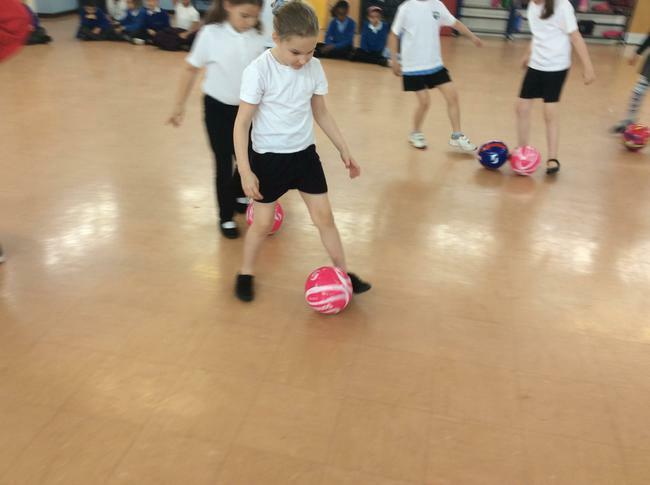 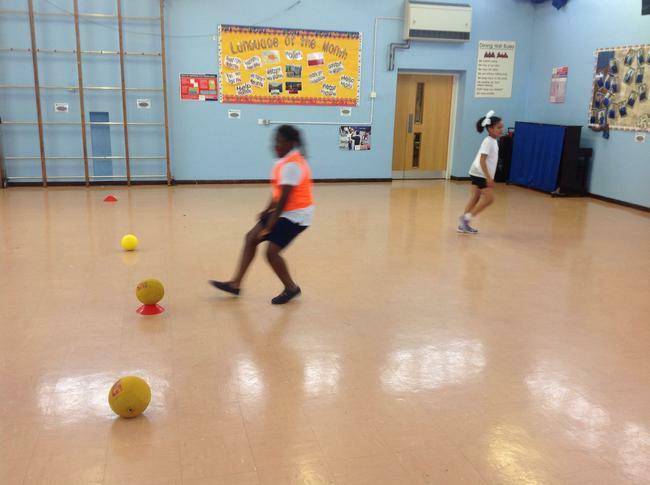 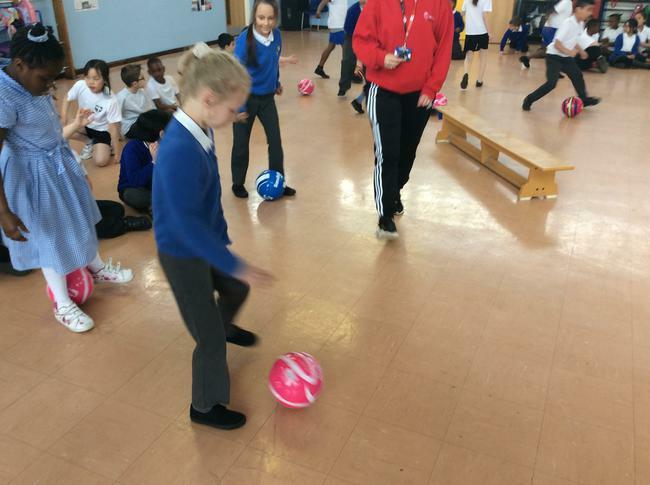 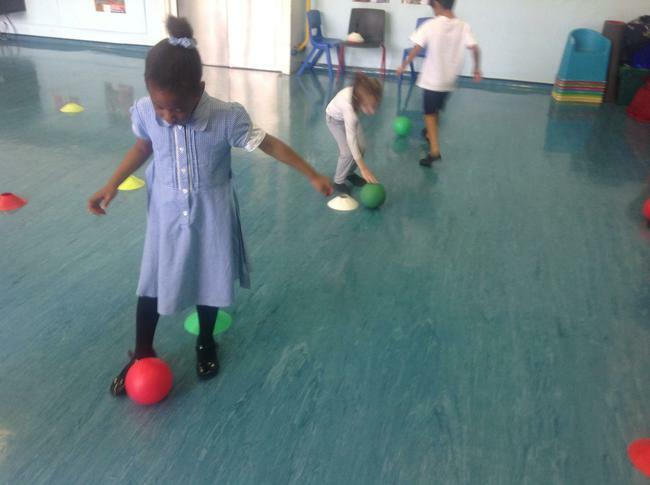 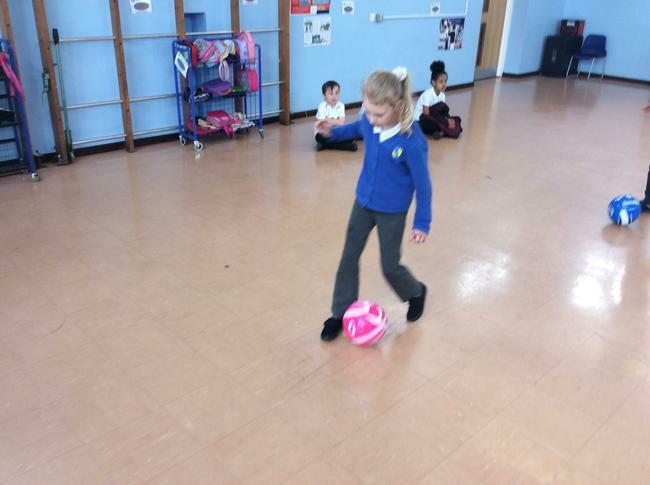 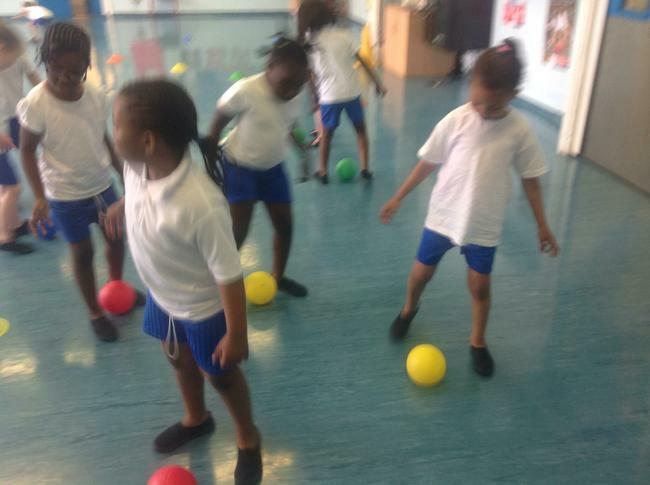 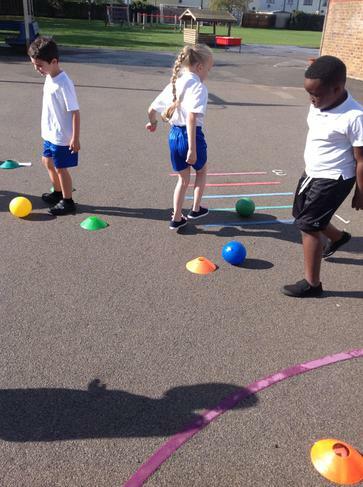 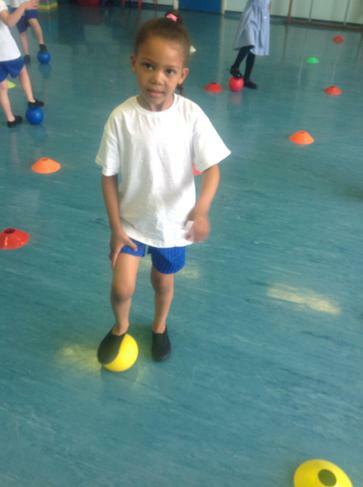 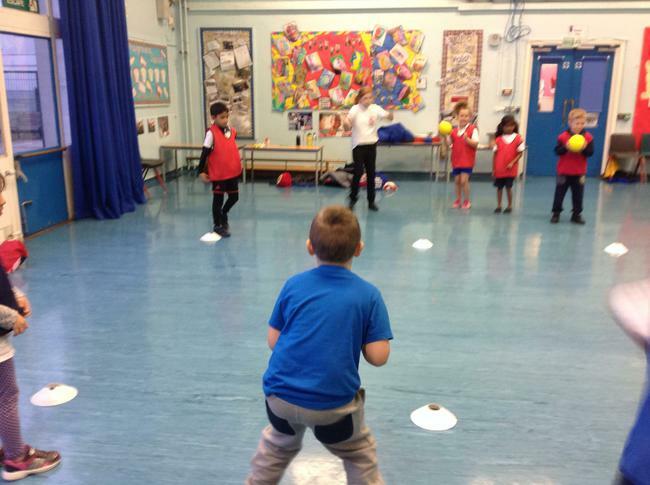 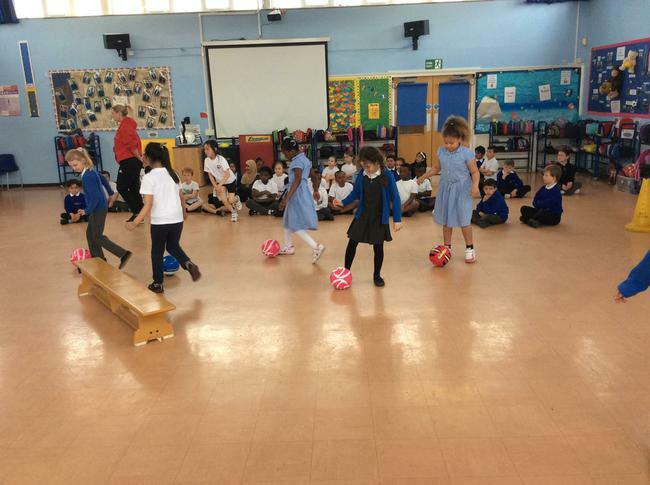 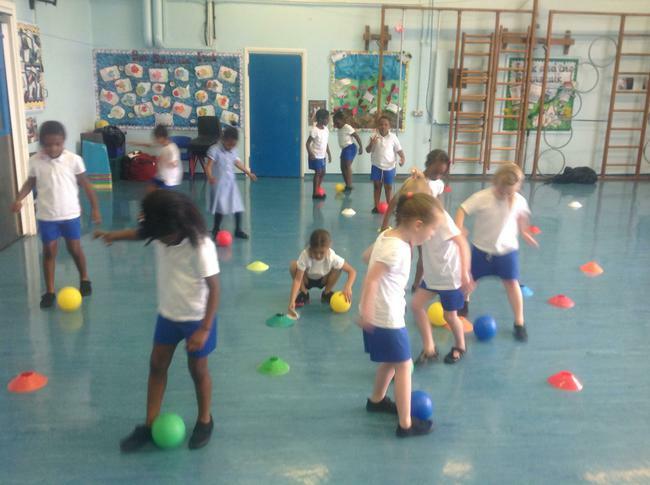 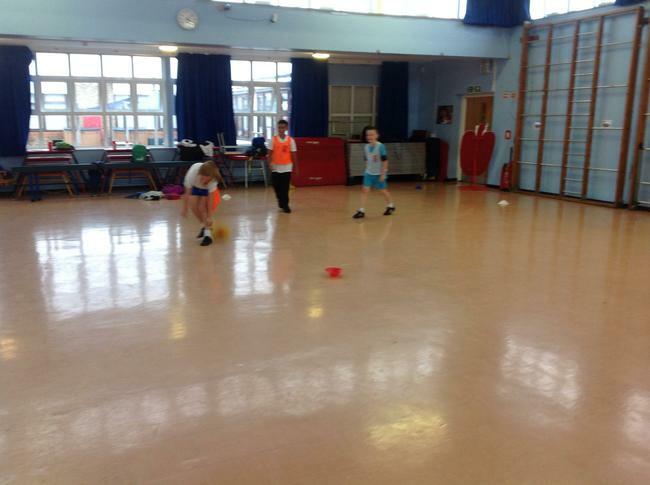 The children really enjoyed the football, boccia and kurling activities. 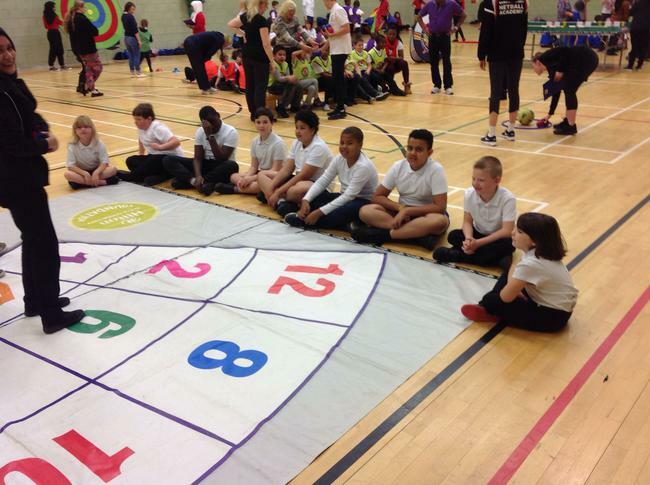 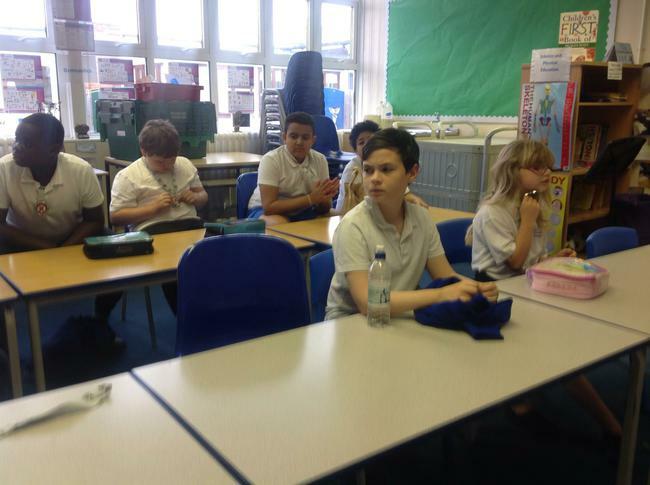 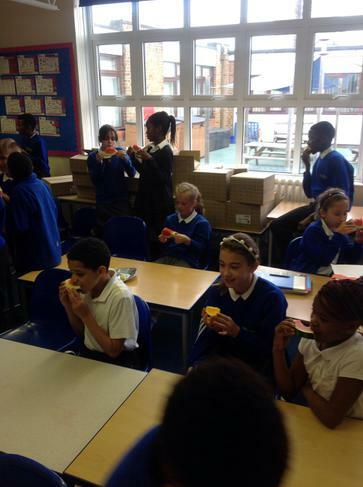 When we went back to school they pupils discussed all the positive aspects of the Panathlon and 100% of the pupils enjoyed the activities and have requested that we hold a lunch time Panathlon Challenge club. 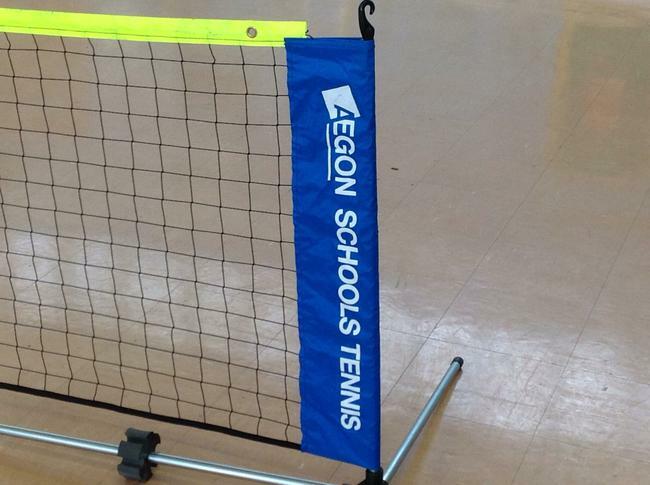 We will be introducing this over the next few weeks. 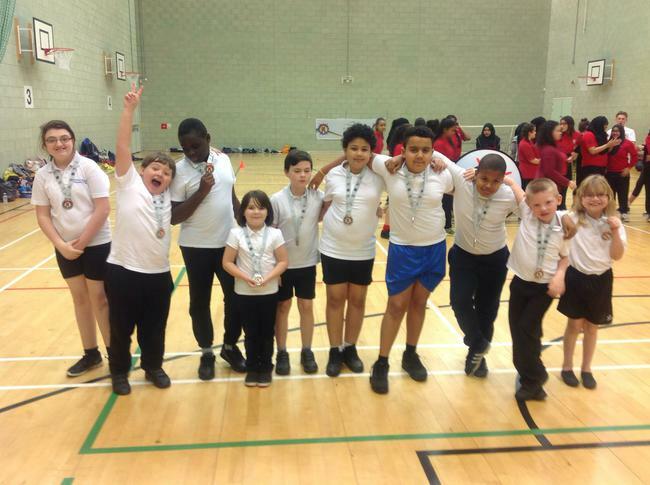 To top off a wonderful experience at the Panathlon Challenge, the team came second place and won silver medals. 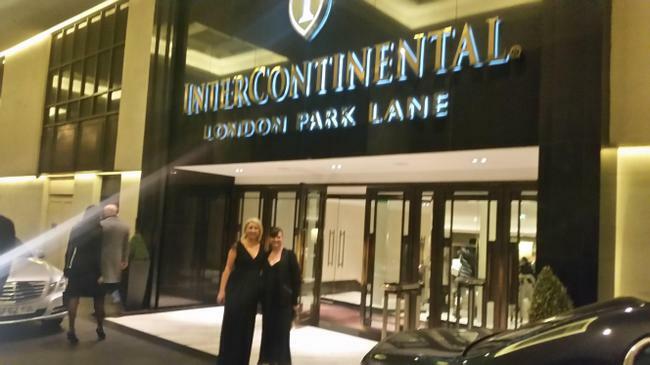 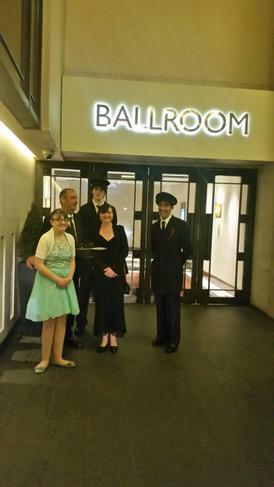 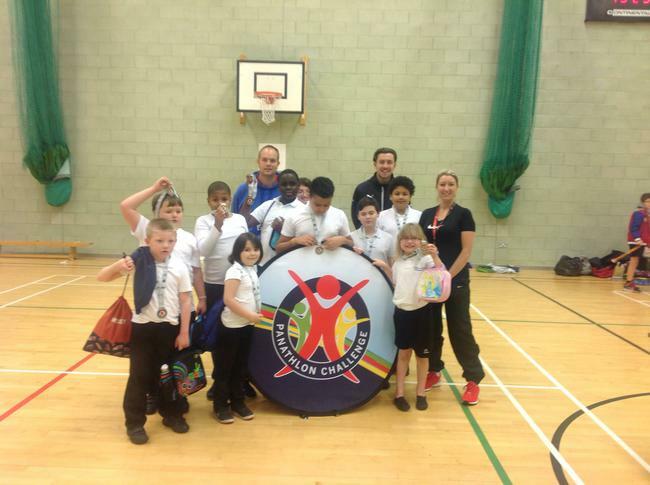 Well done to the November 2015 Panathlon Challenge Team! 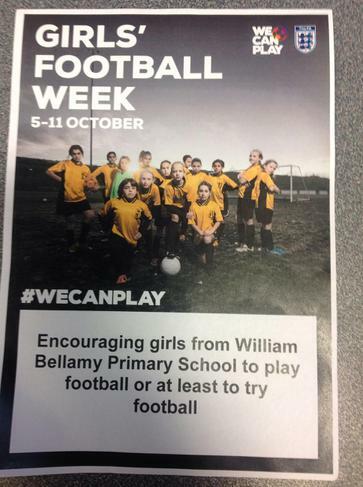 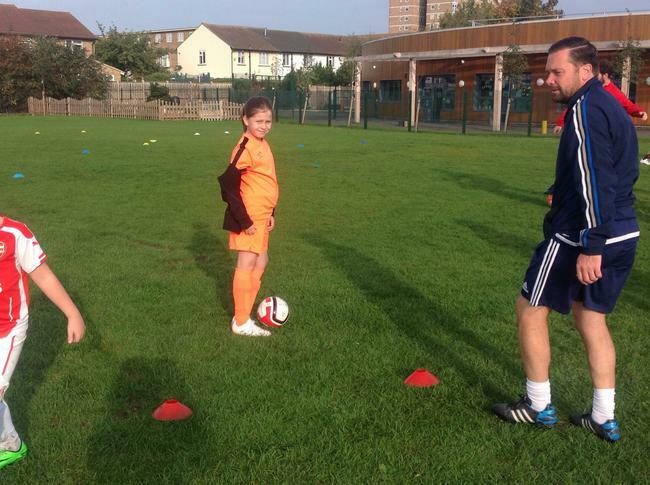 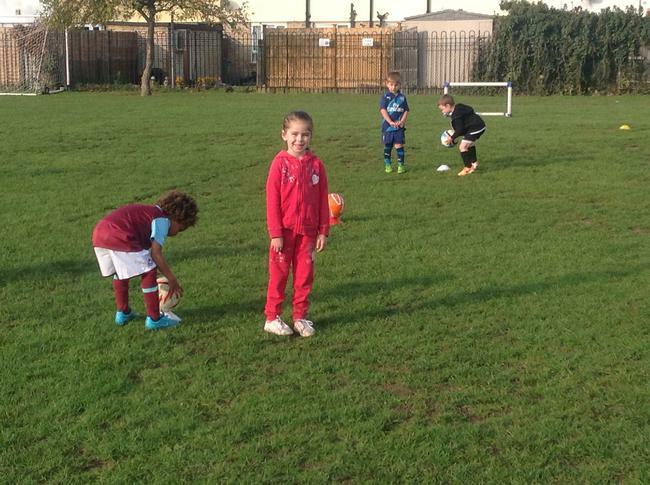 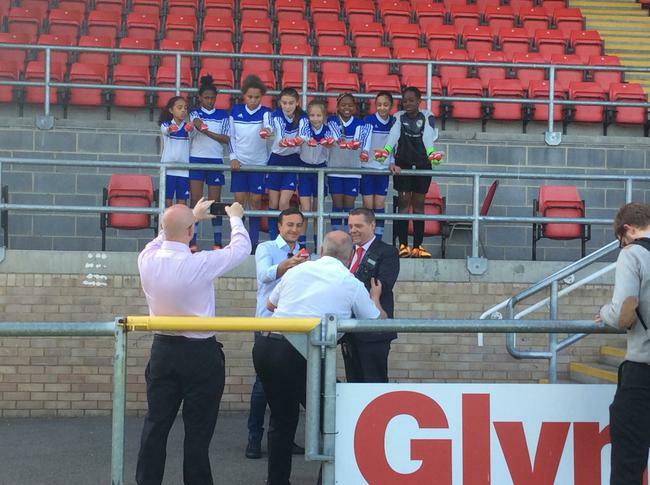 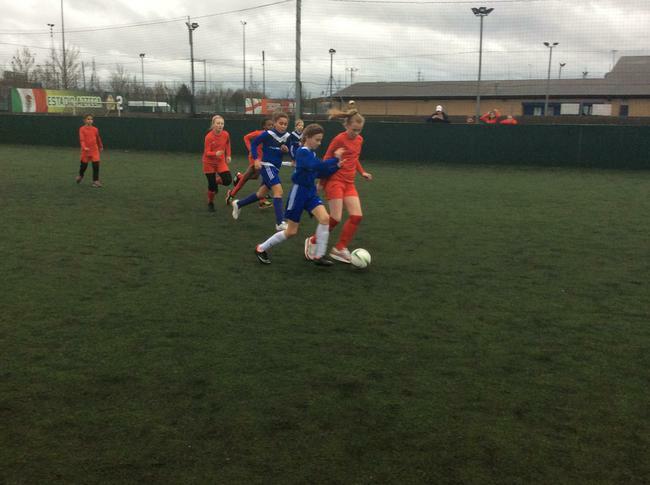 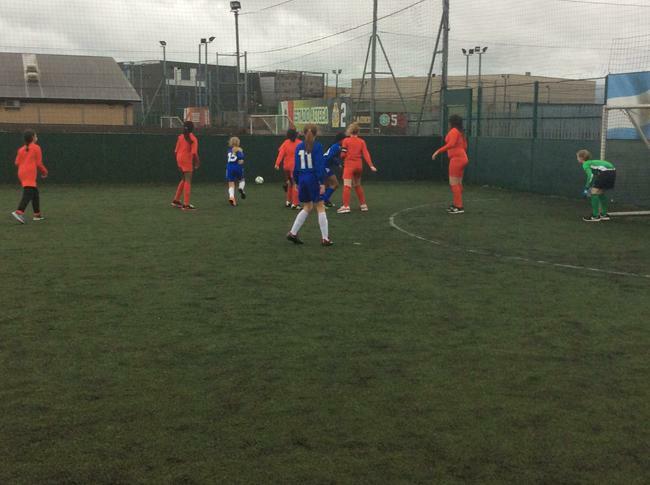 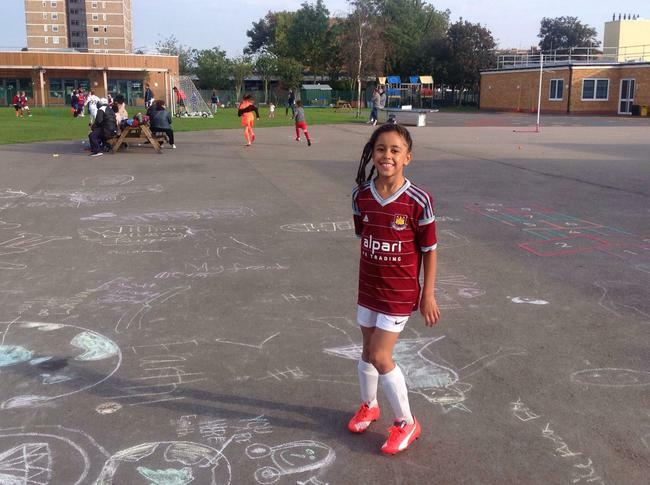 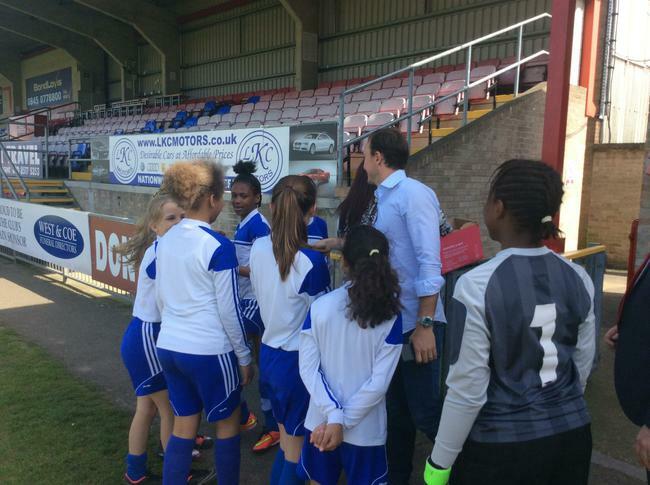 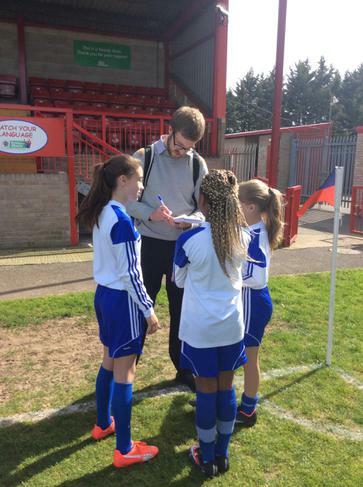 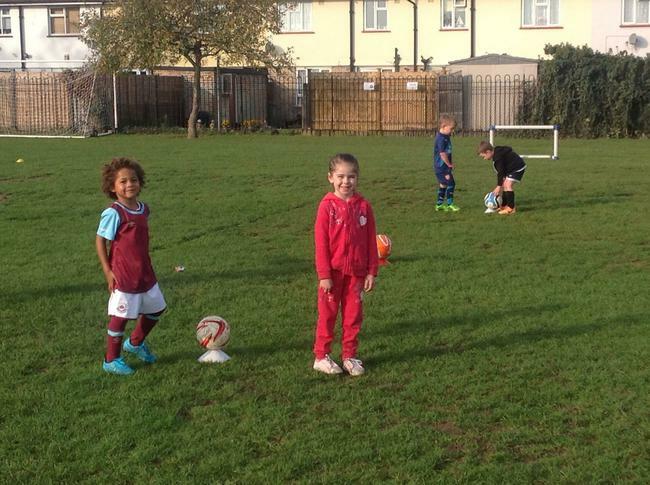 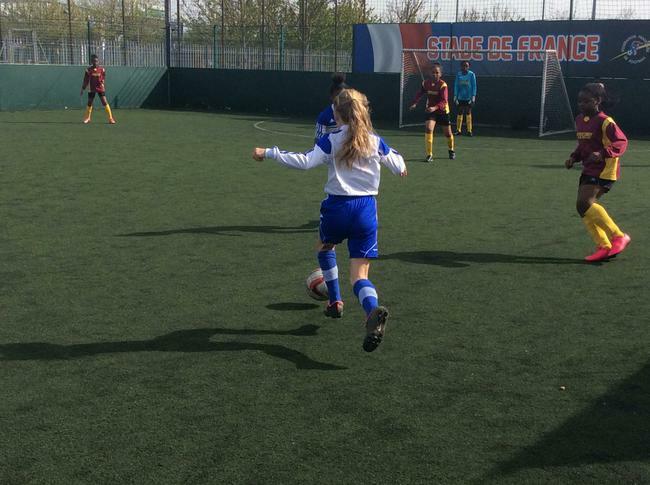 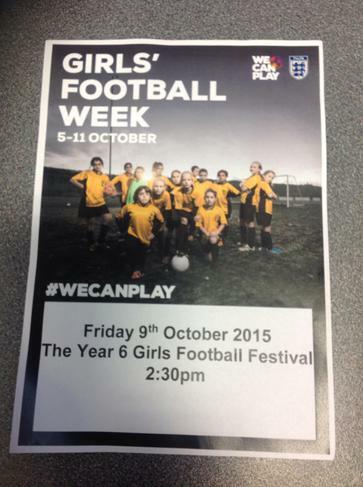 Girls Football Week. 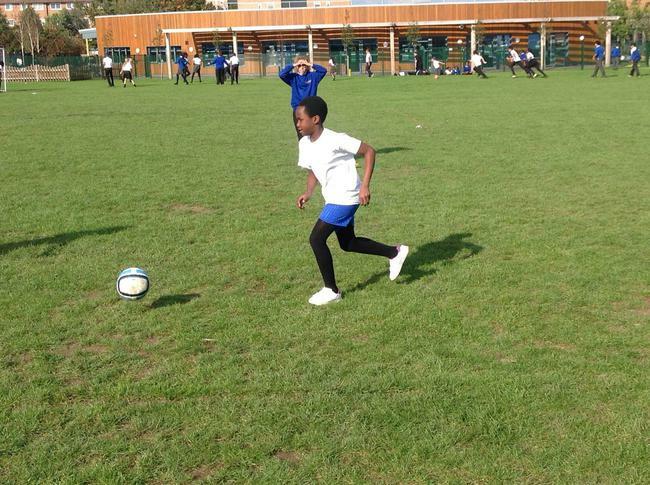 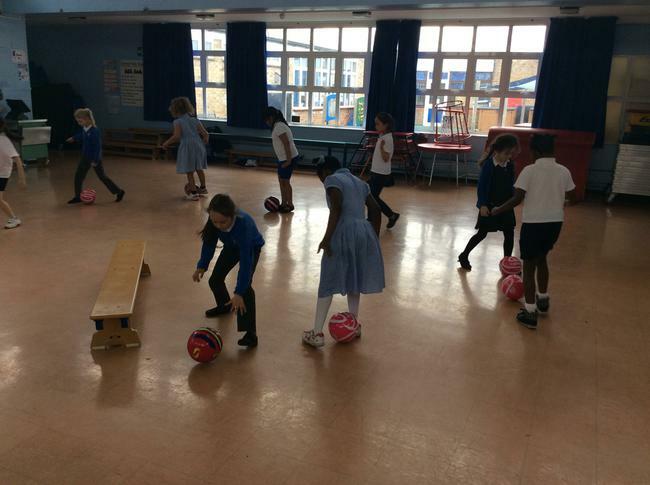 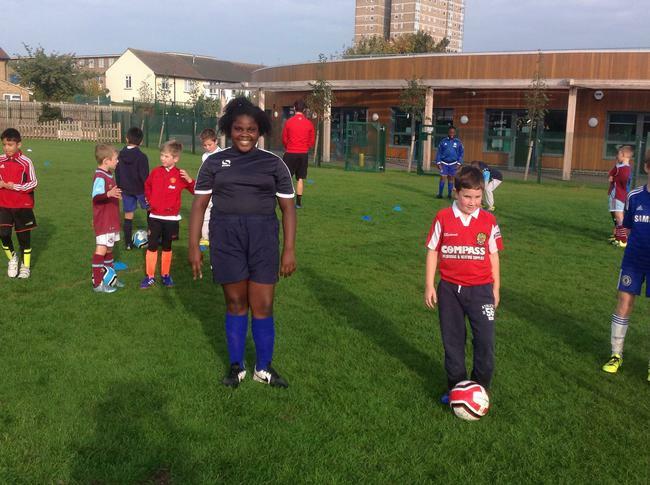 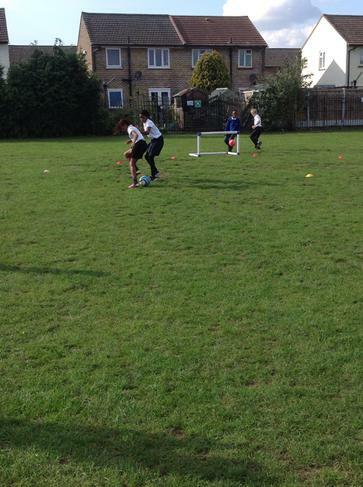 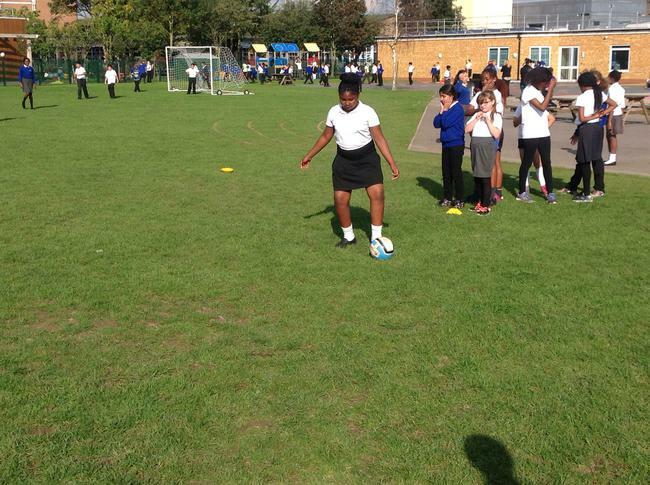 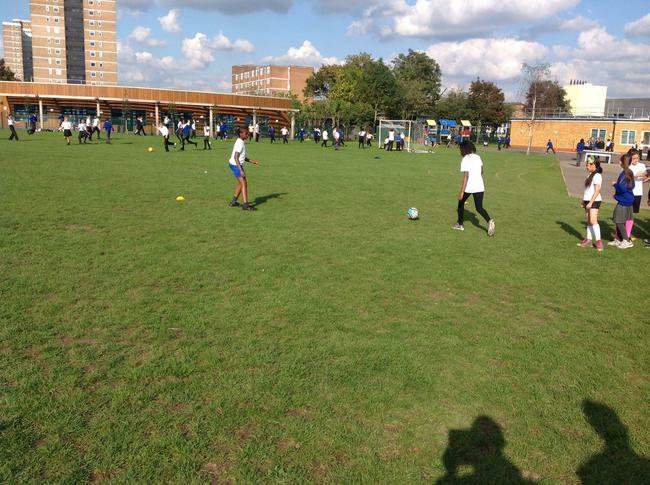 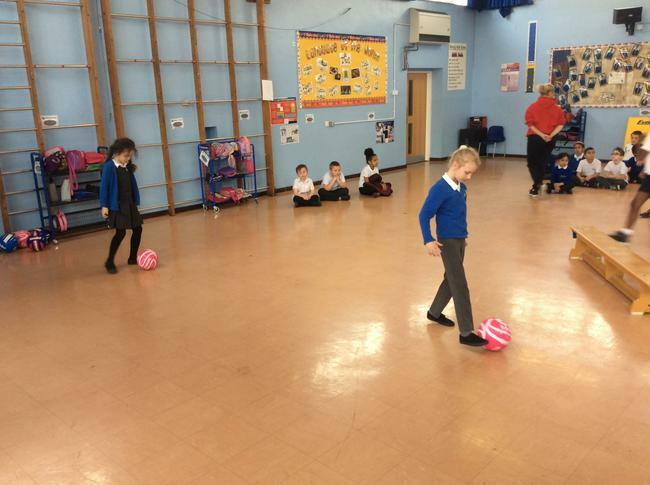 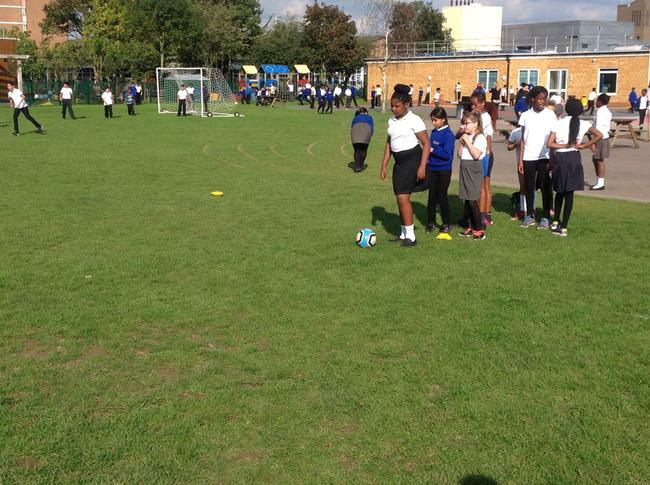 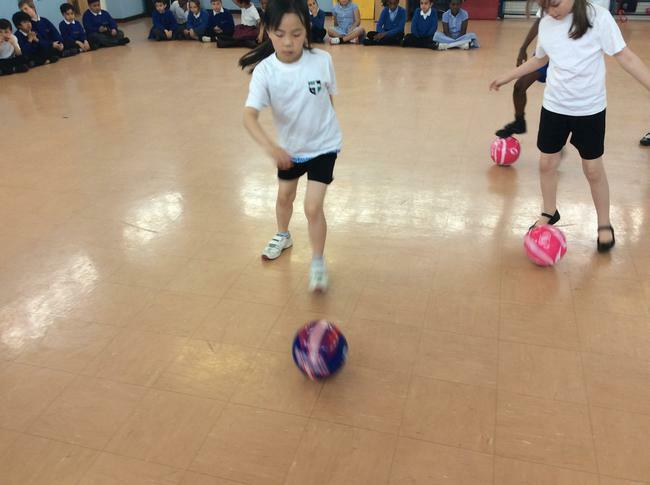 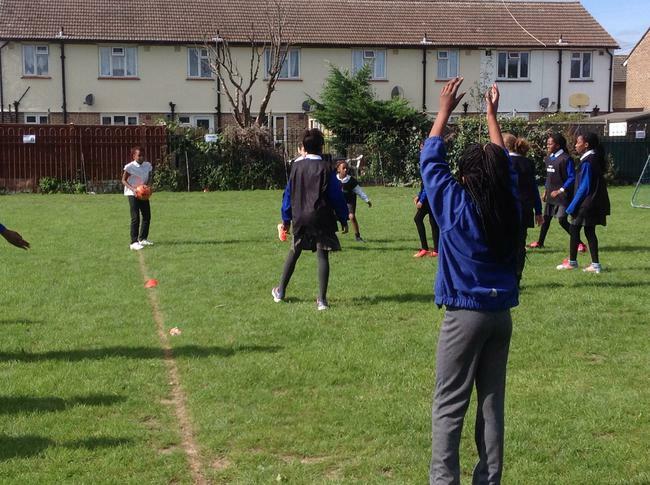 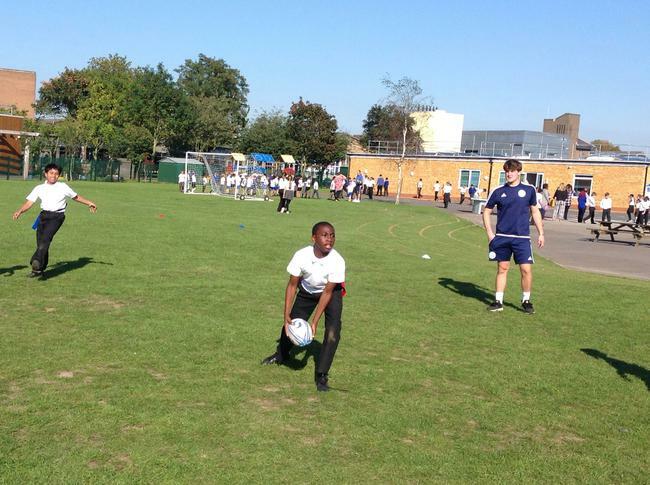 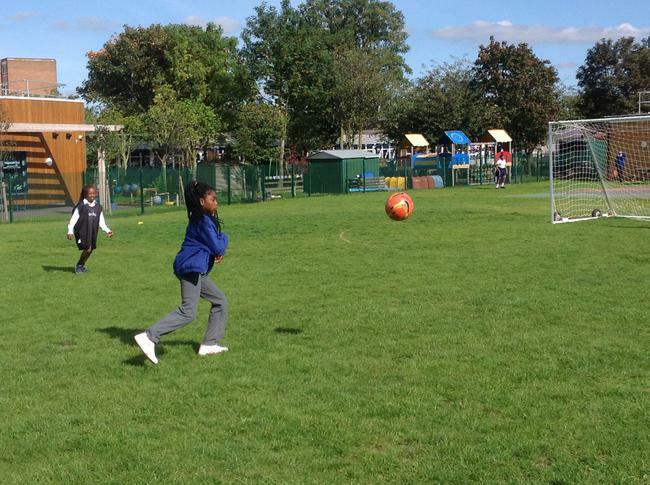 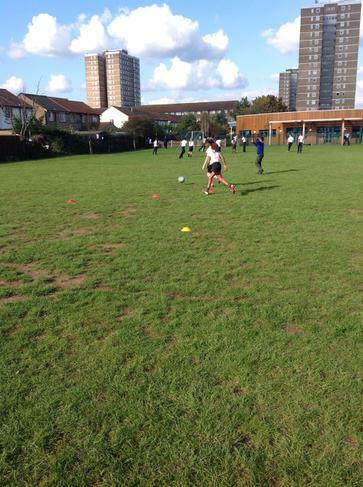 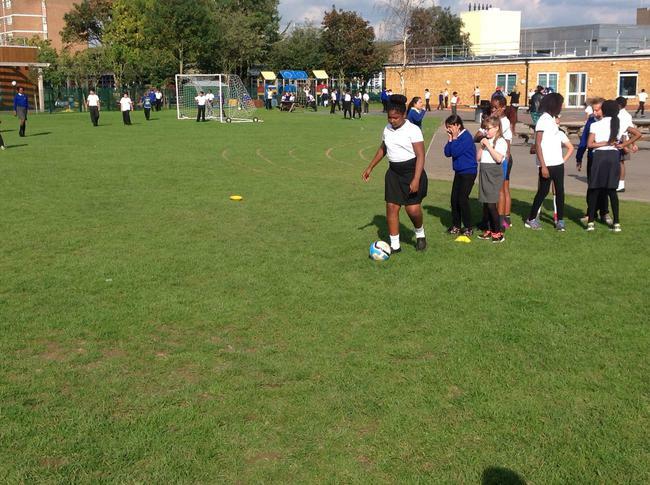 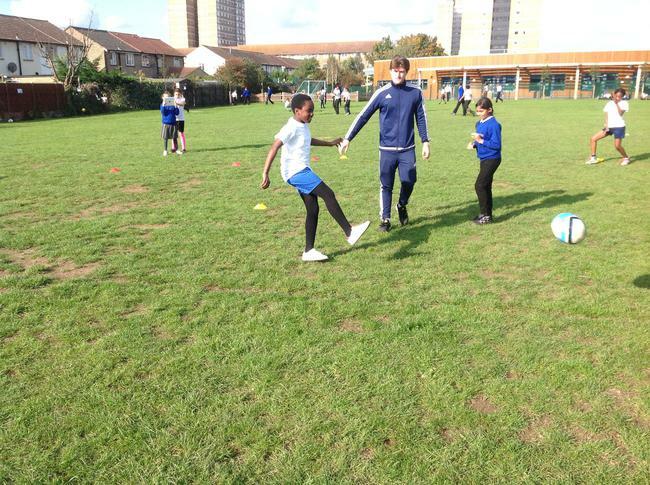 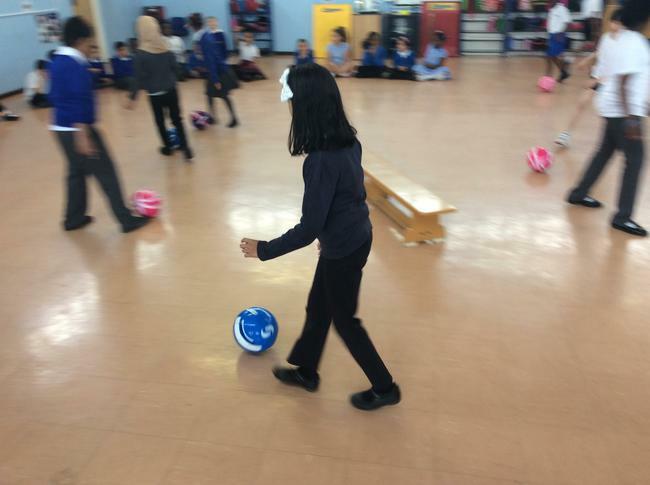 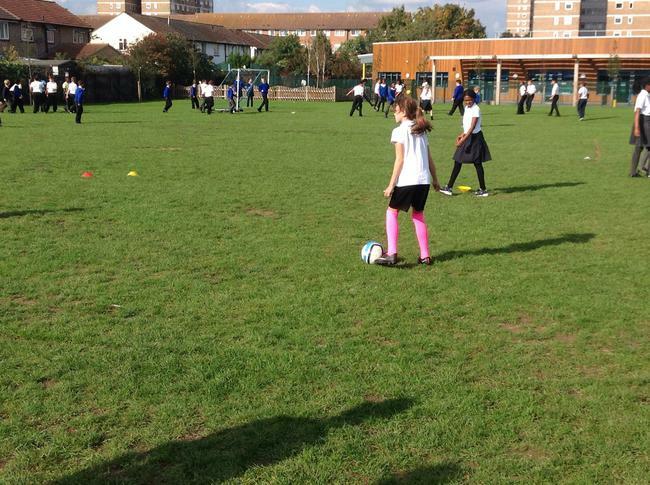 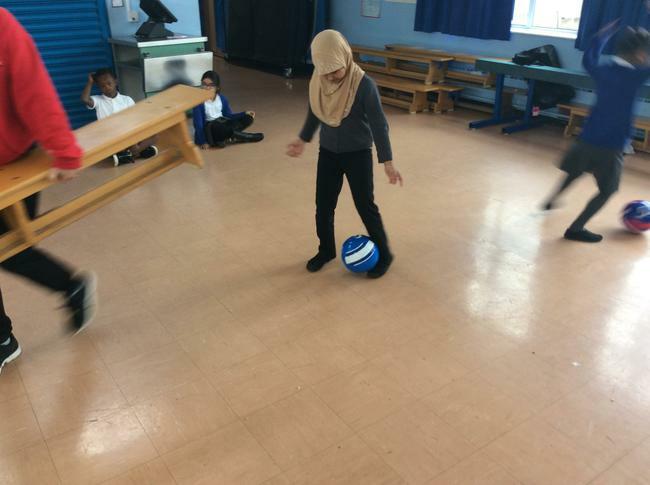 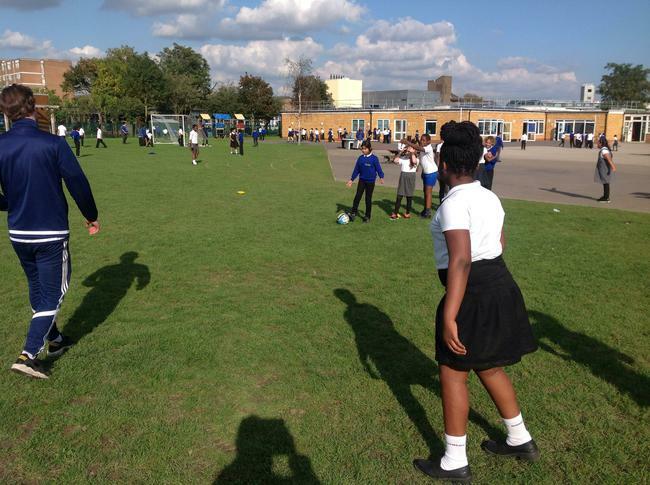 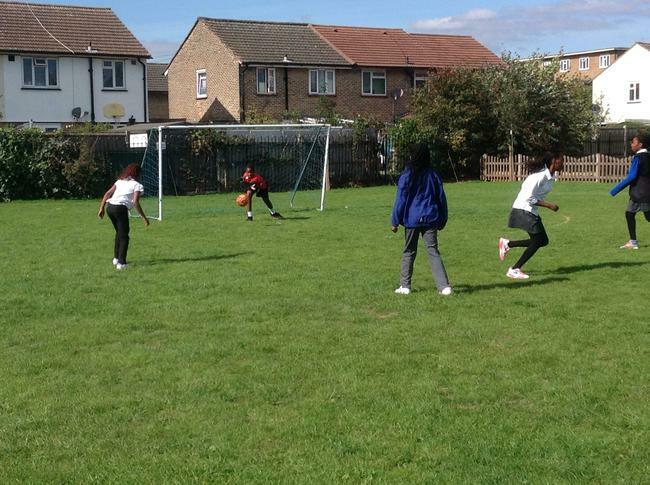 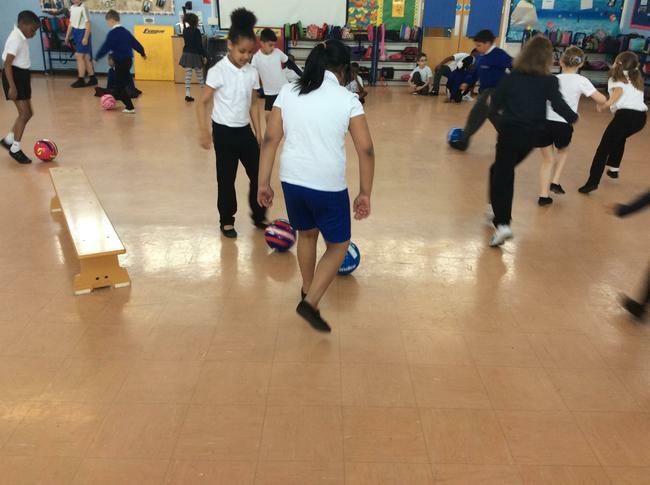 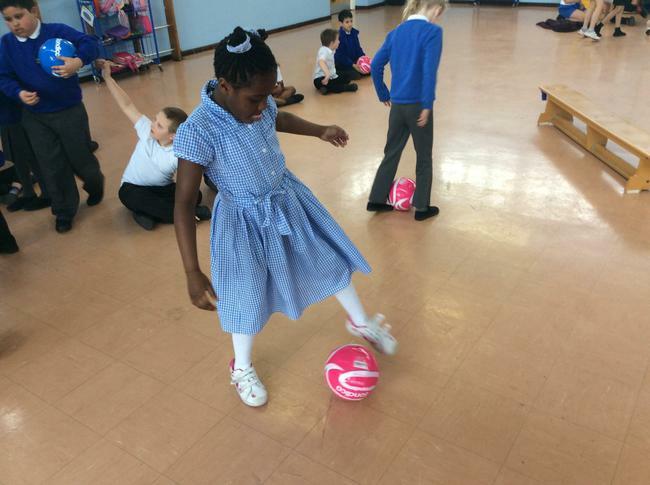 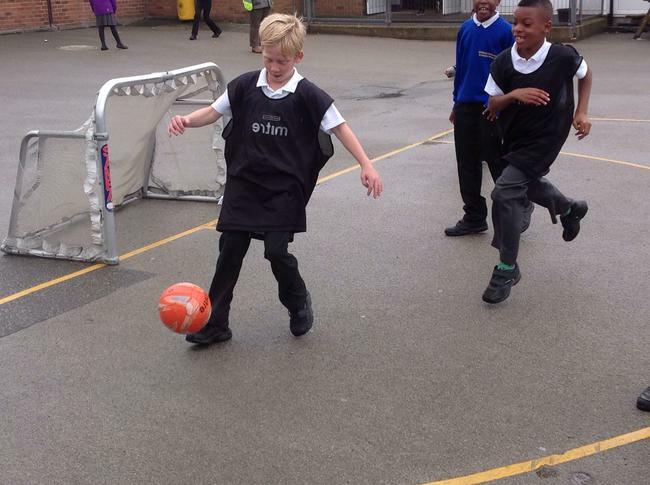 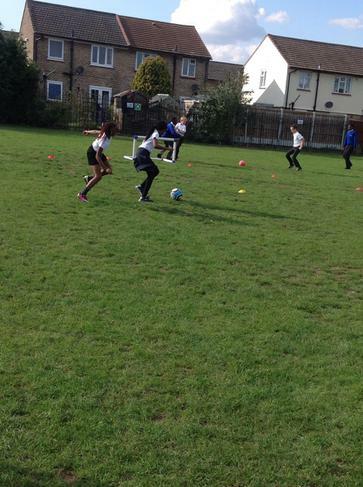 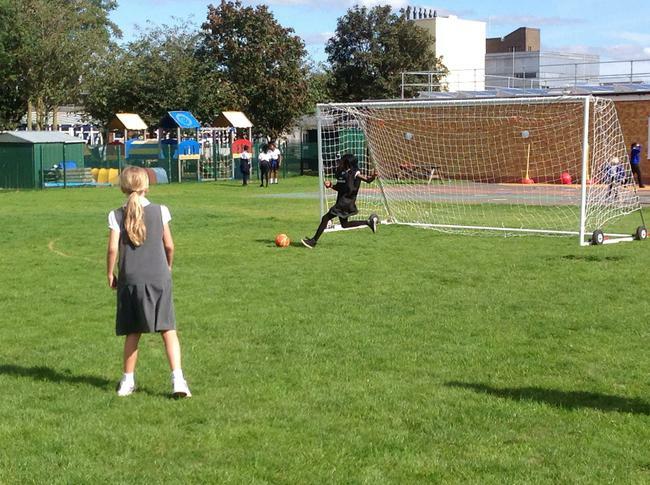 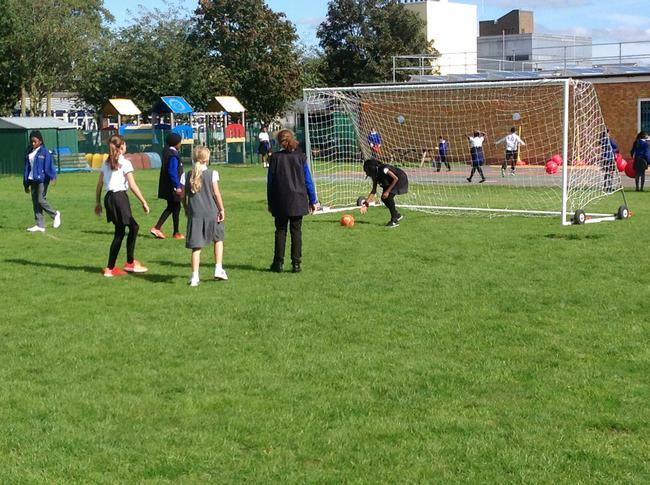 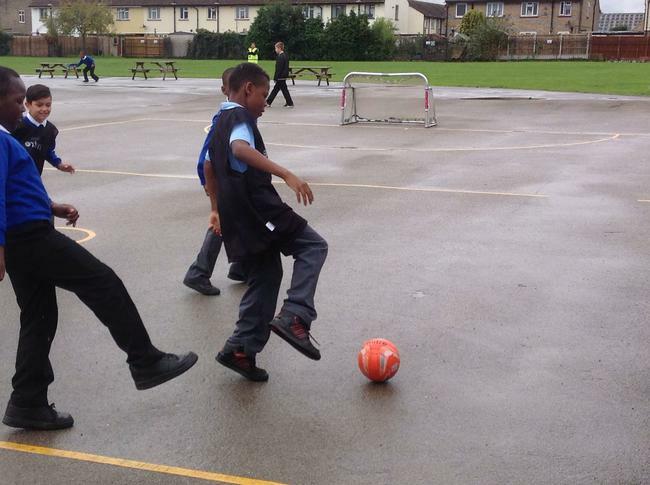 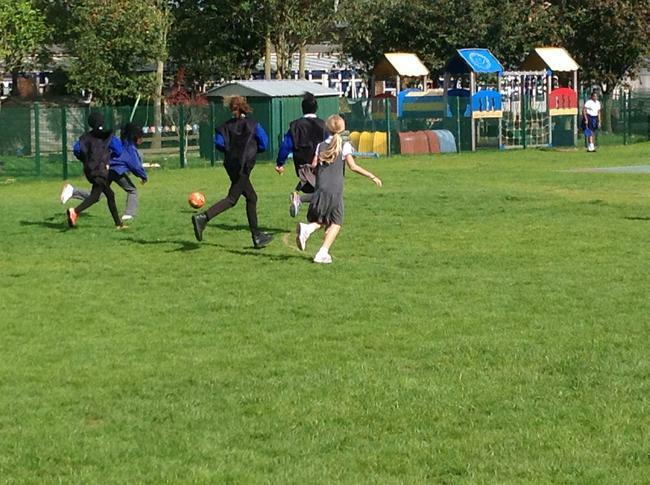 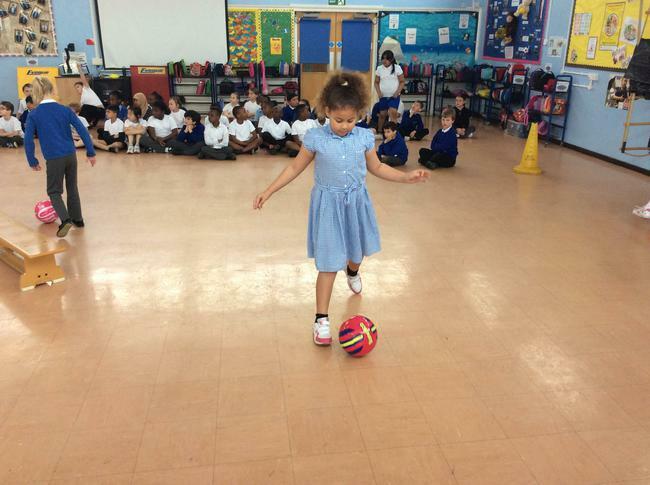 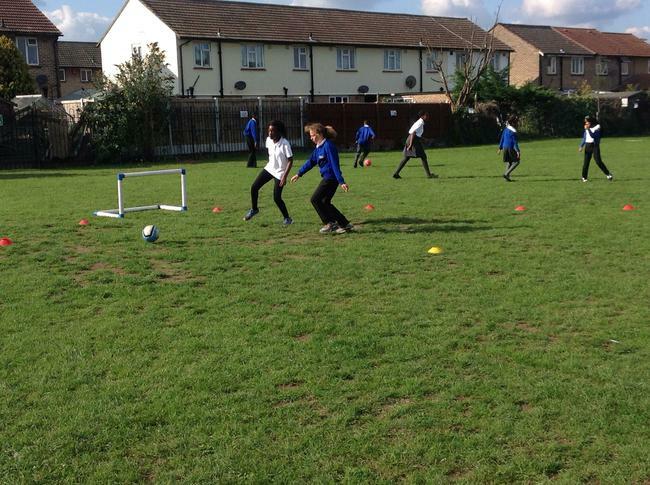 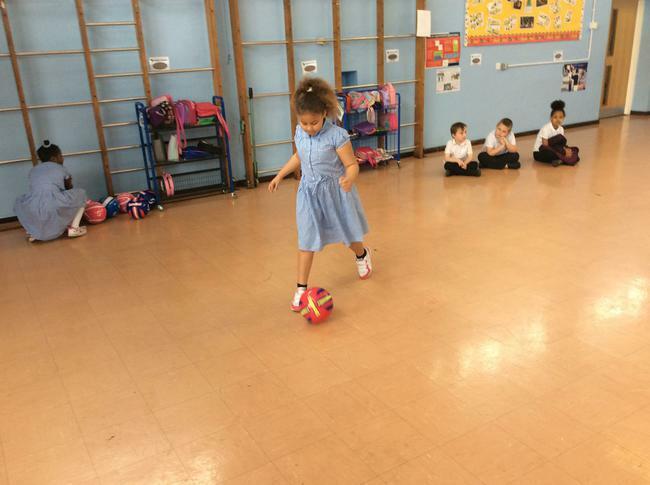 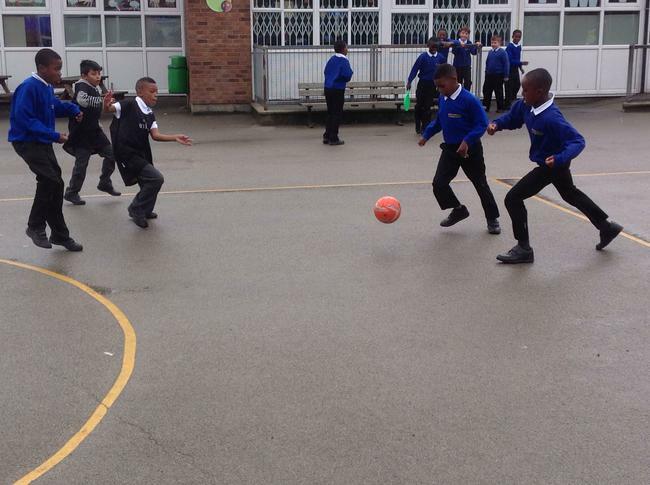 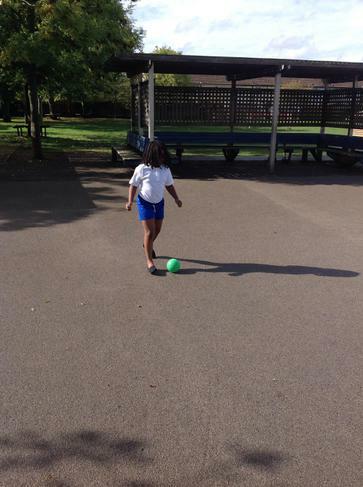 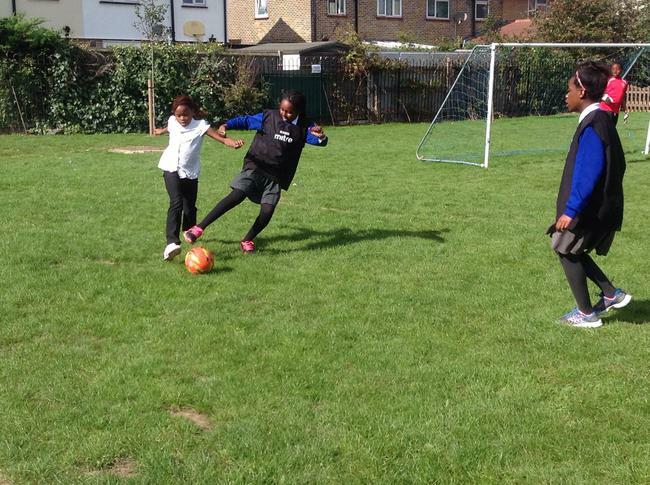 Our pupils trying out football. 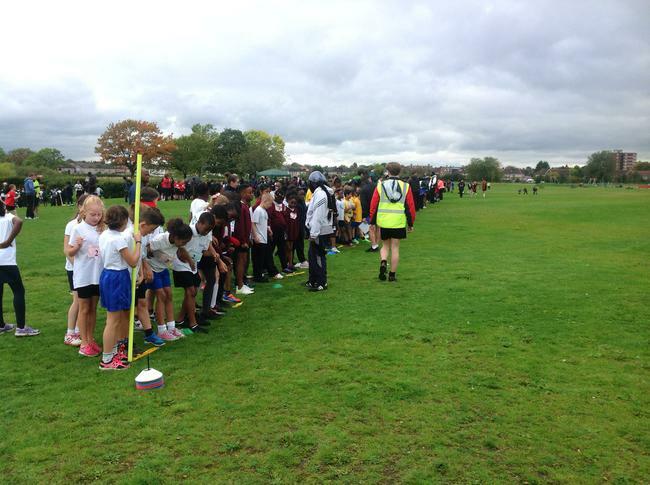 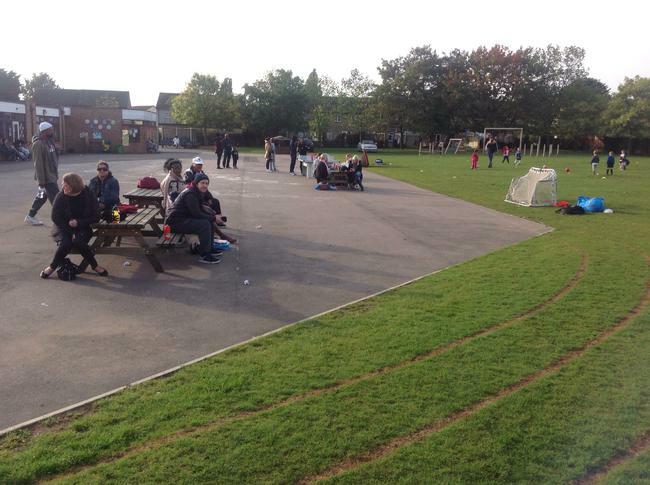 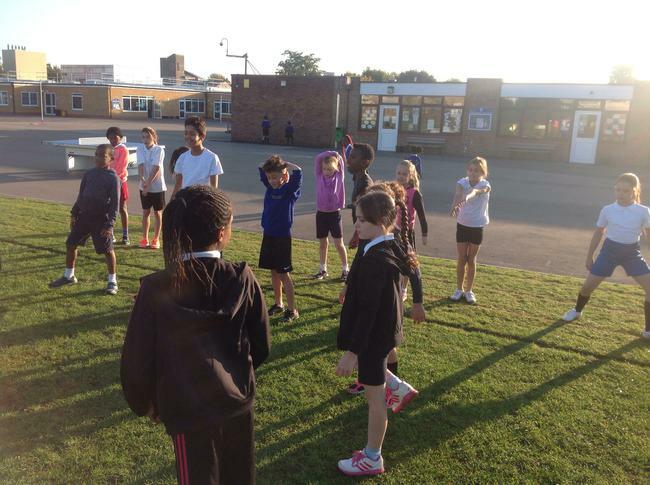 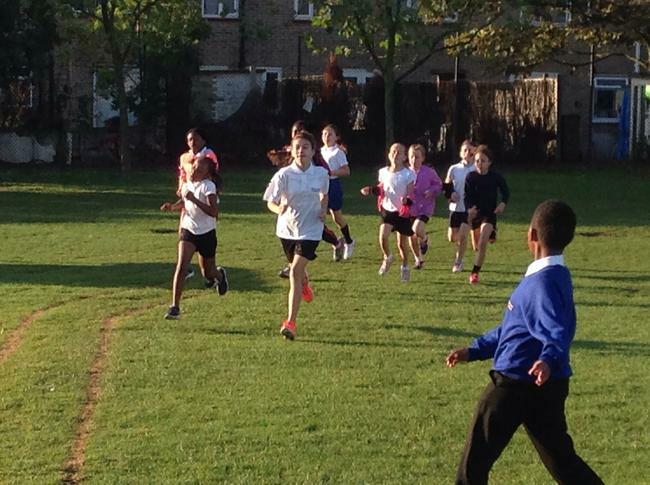 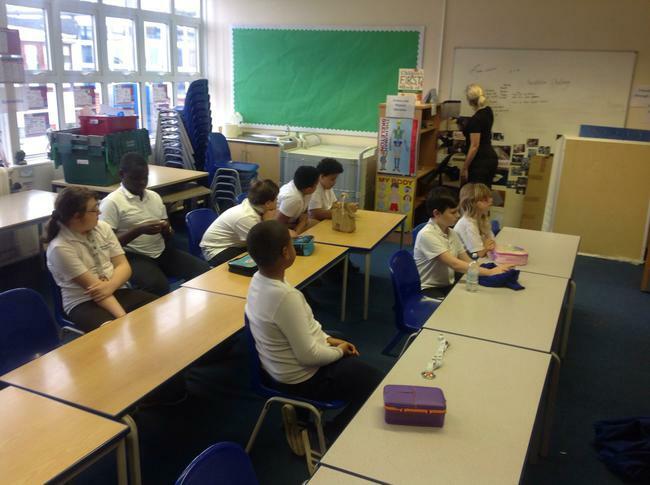 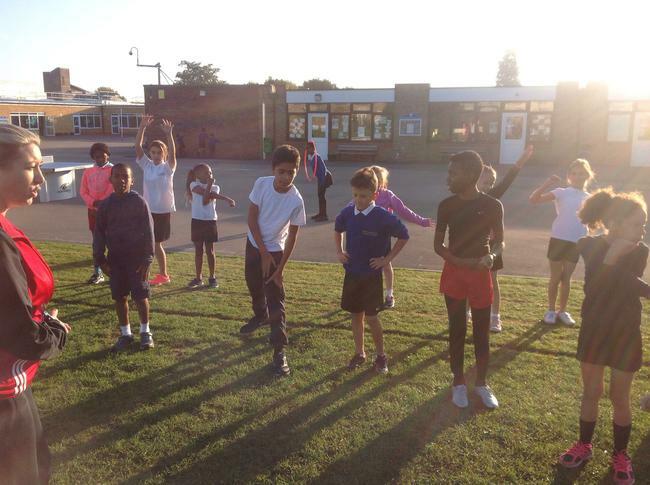 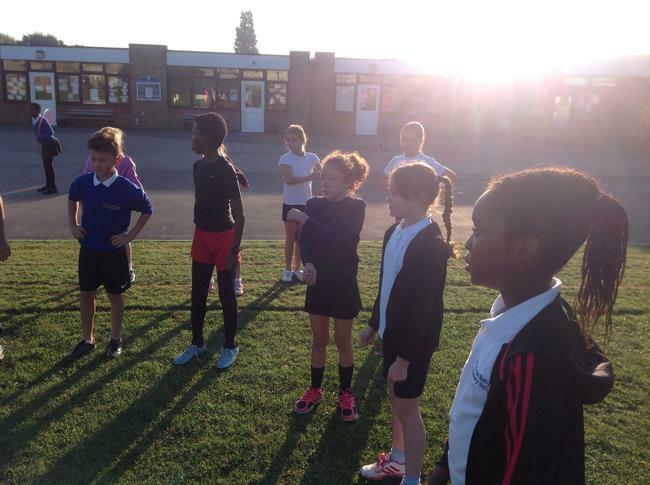 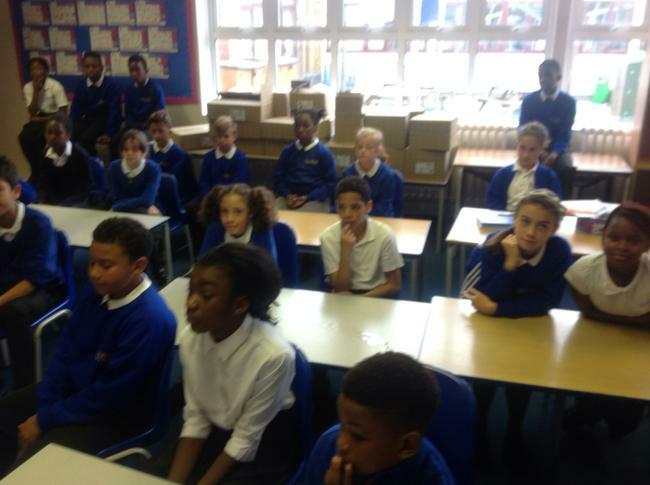 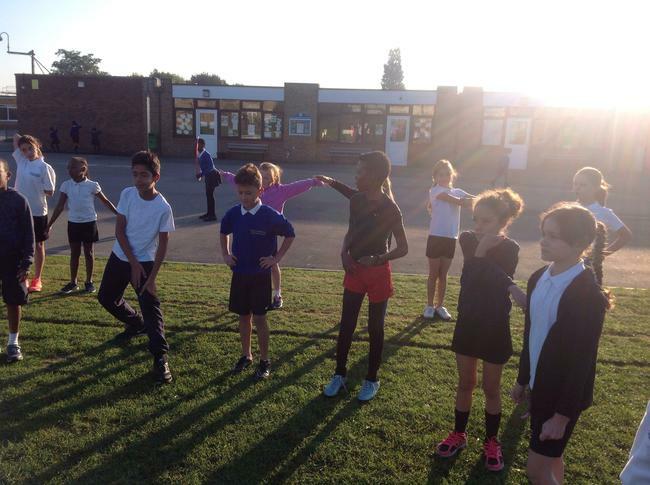 The year 4, 5 and 6 cross country team had a meeting in preparation for their competition on Wednesday. 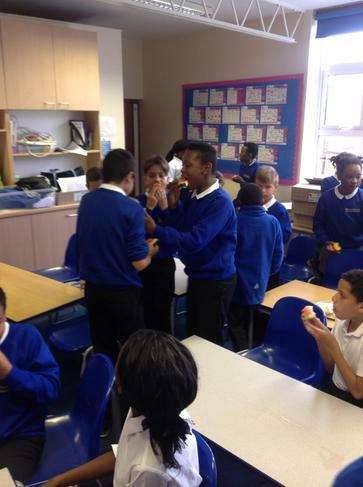 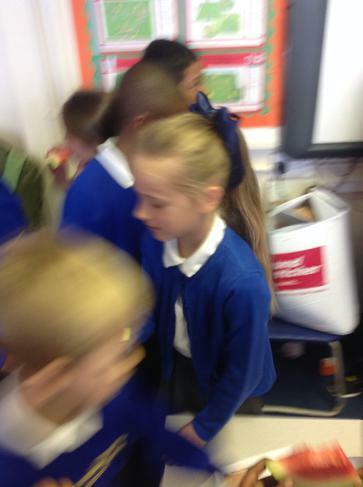 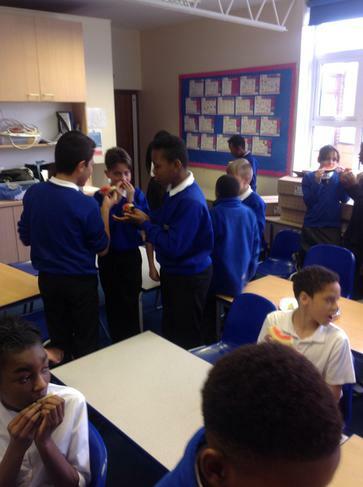 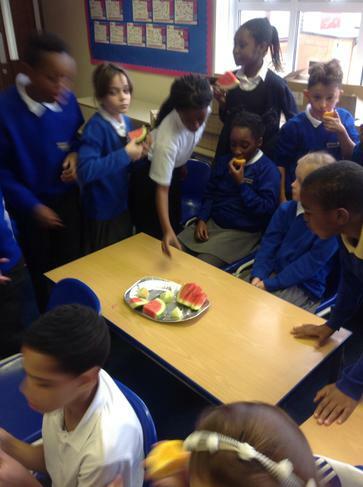 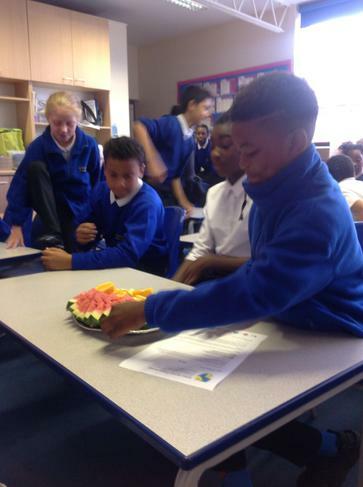 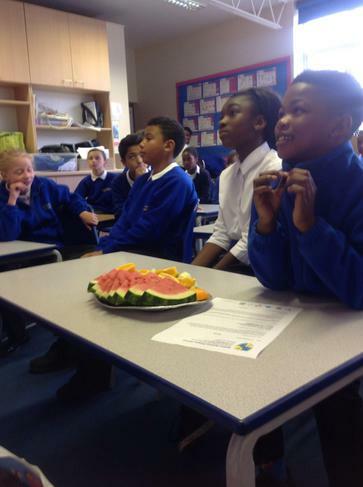 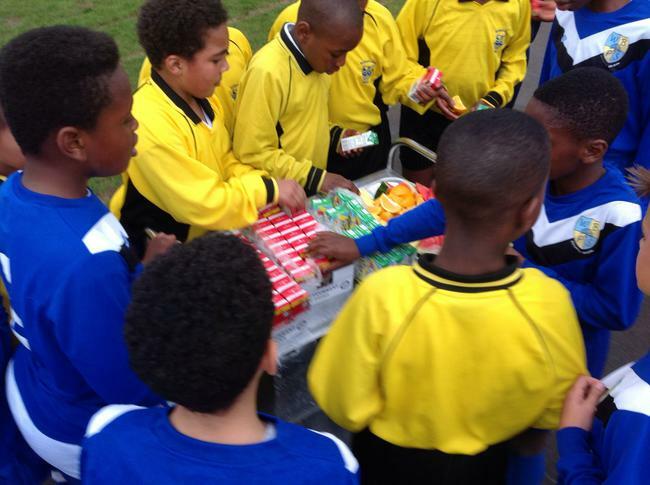 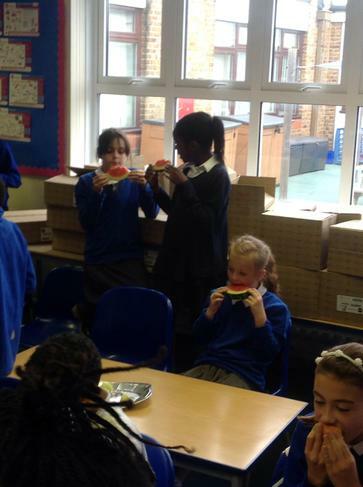 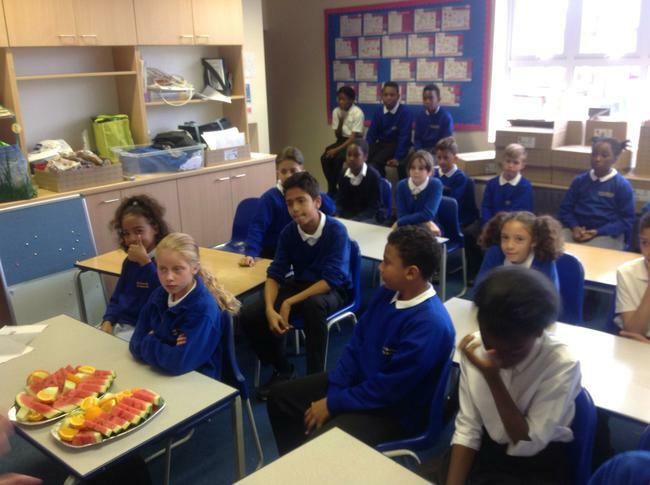 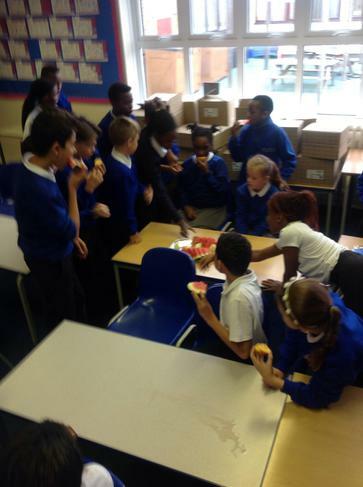 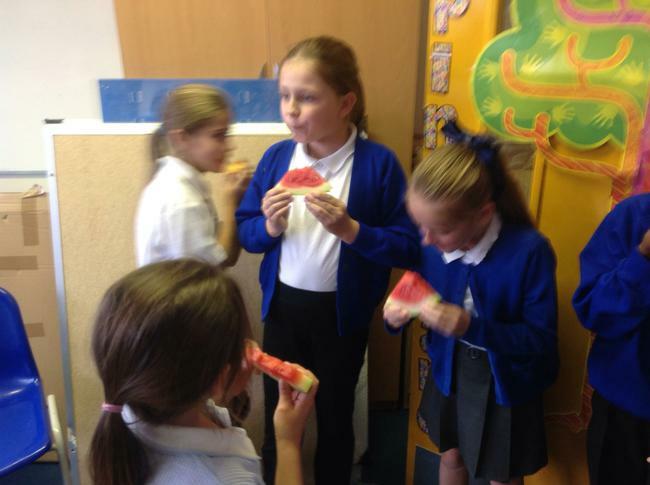 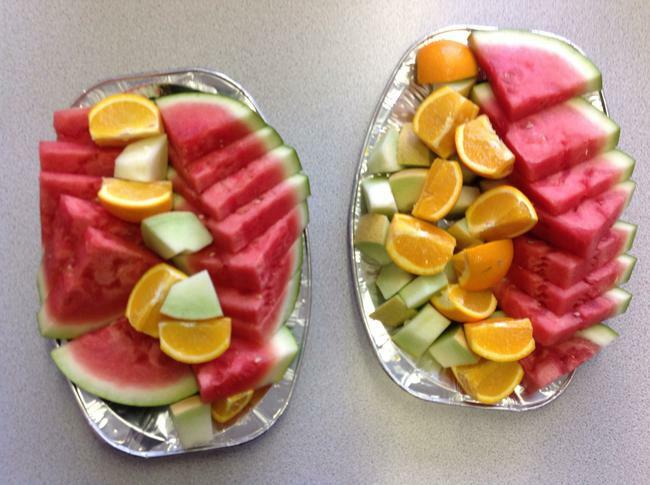 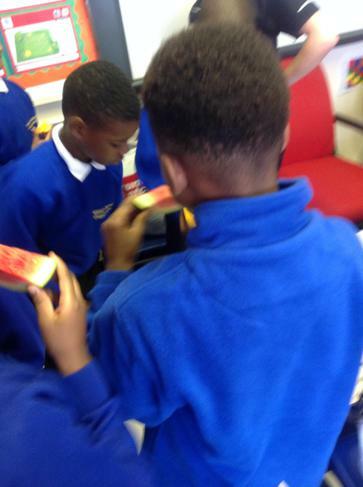 All the children enjoyed a free fruit platter while they socialised with each other's teams. 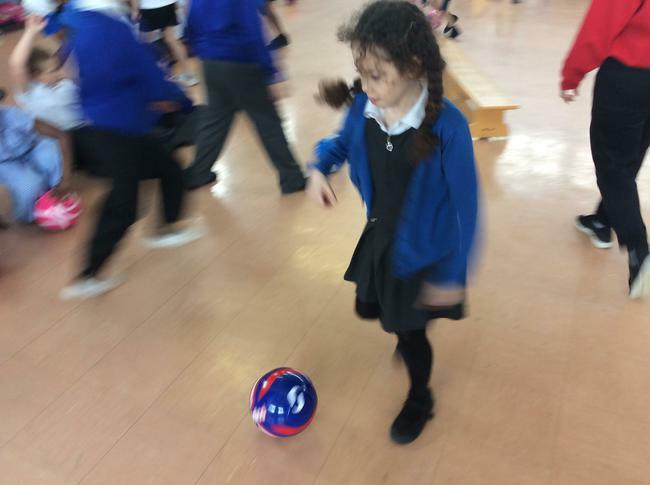 Good luck for Wednesday! 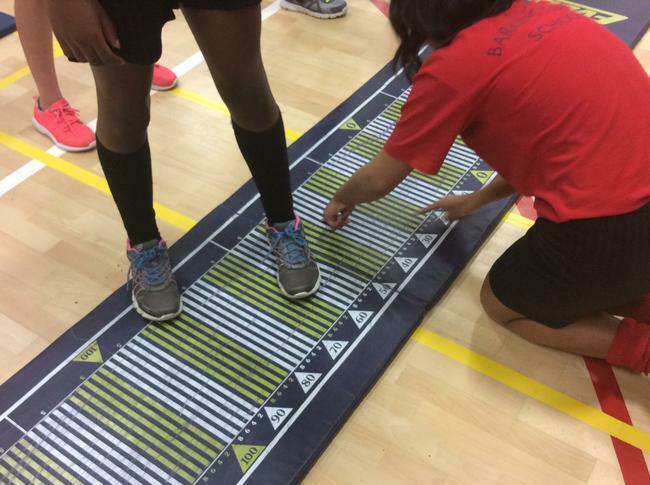 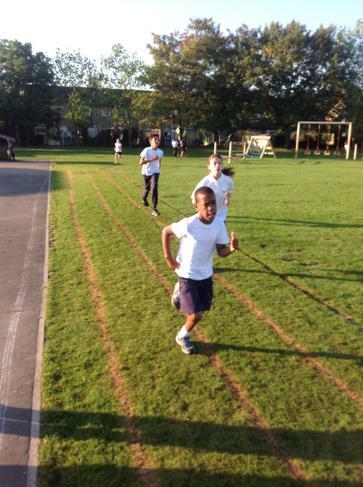 Every Friday afternoon our school pupils will be participating in an Intra school competition. 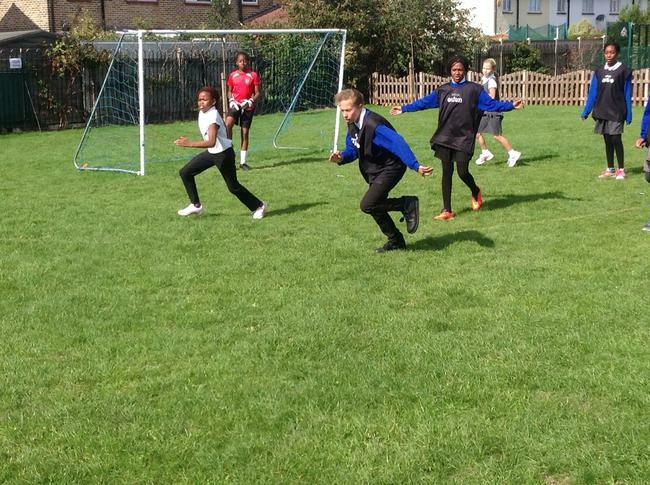 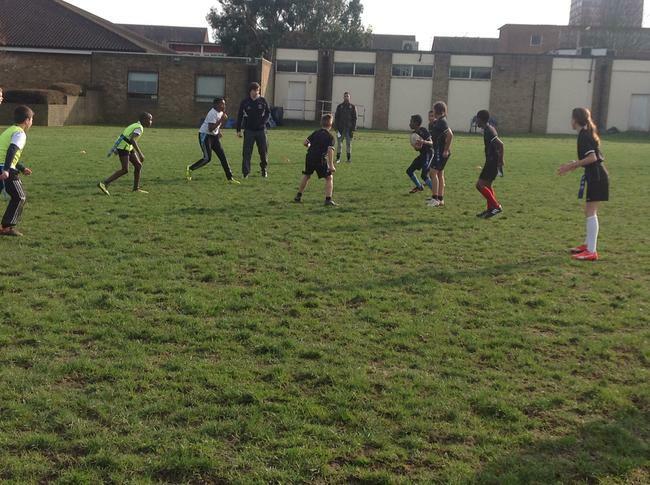 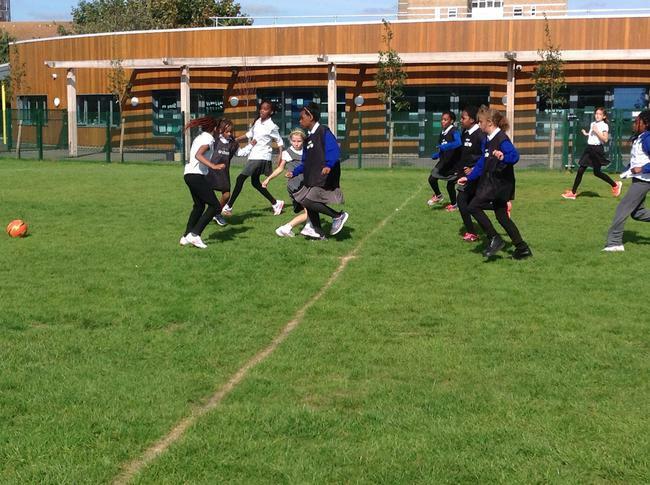 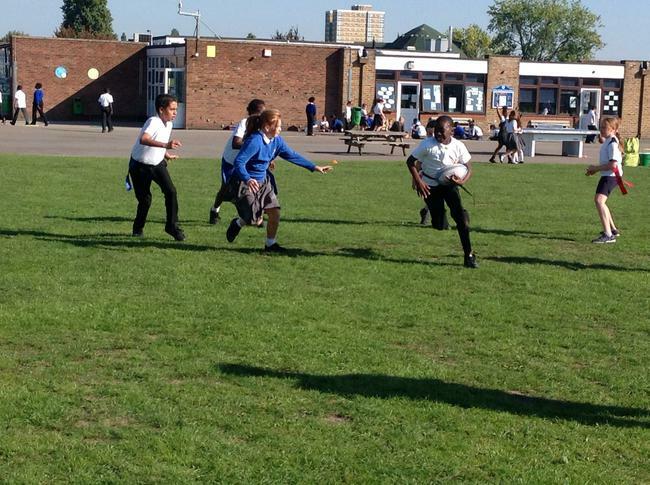 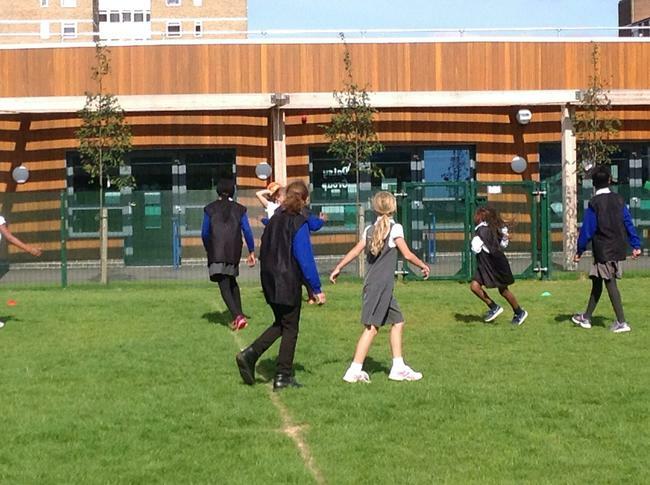 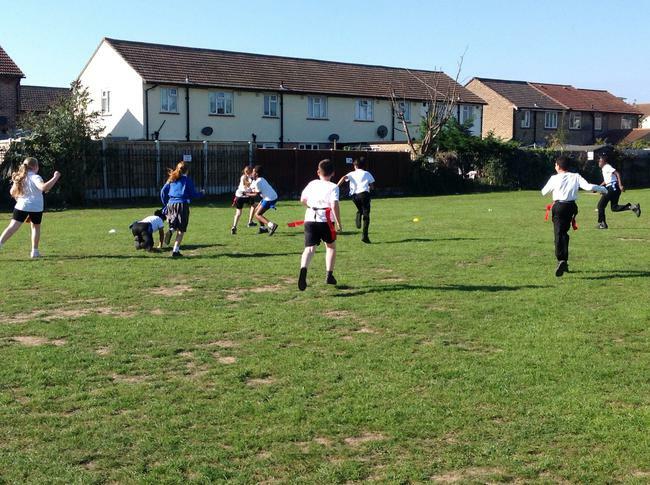 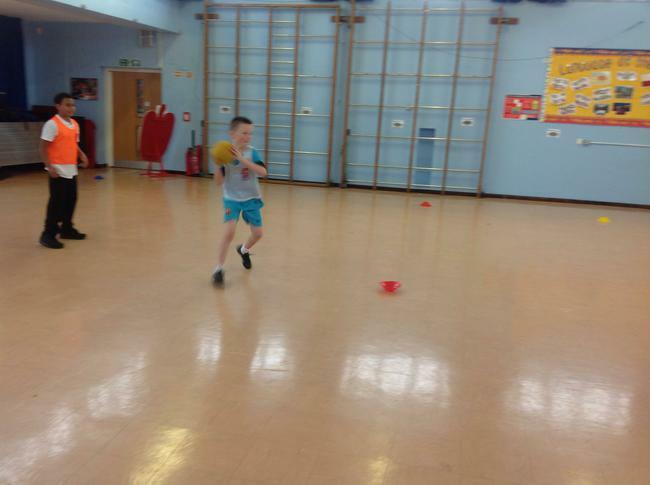 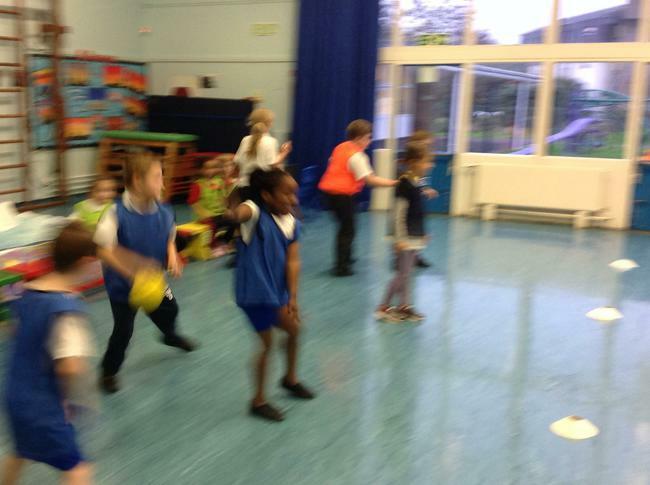 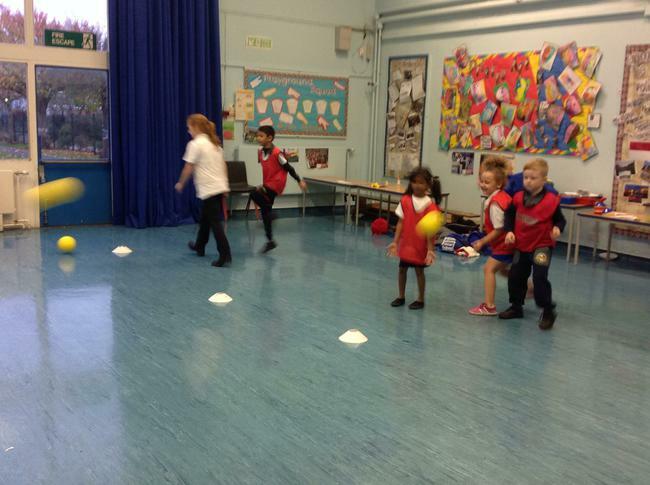 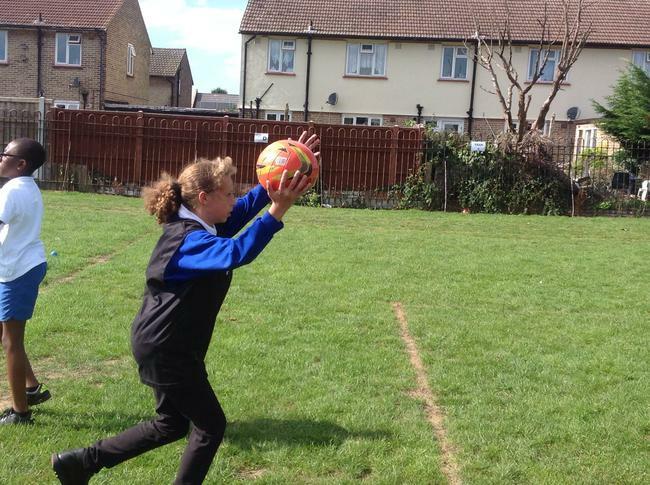 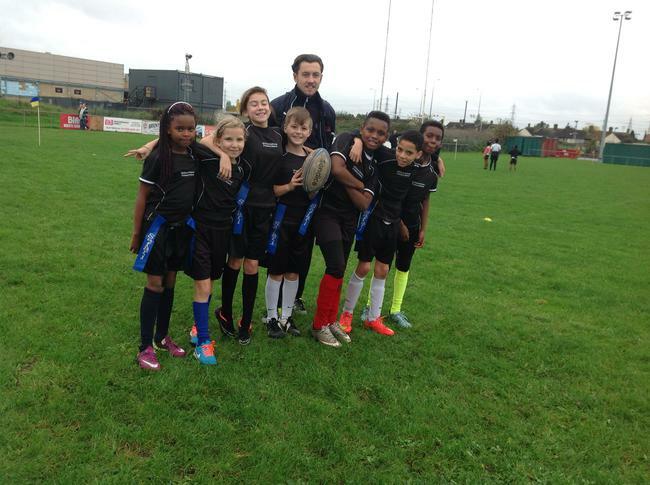 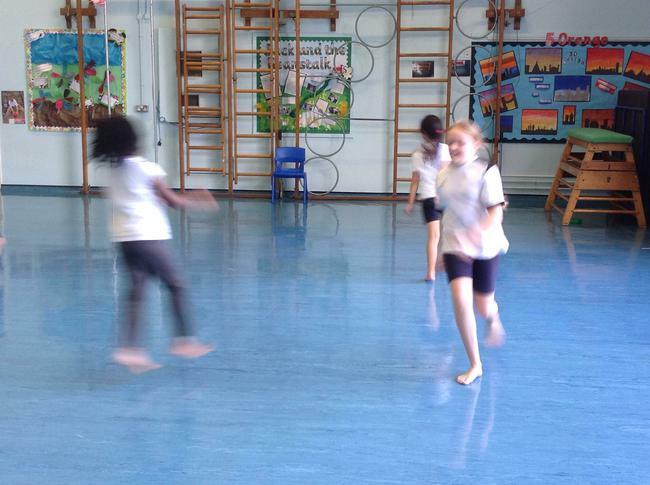 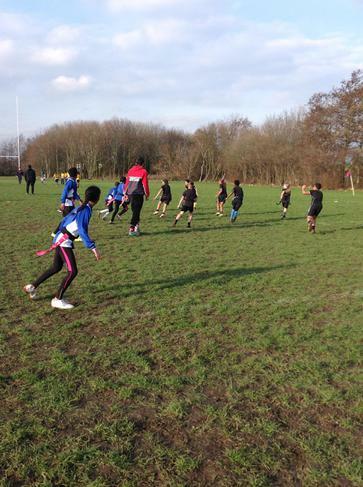 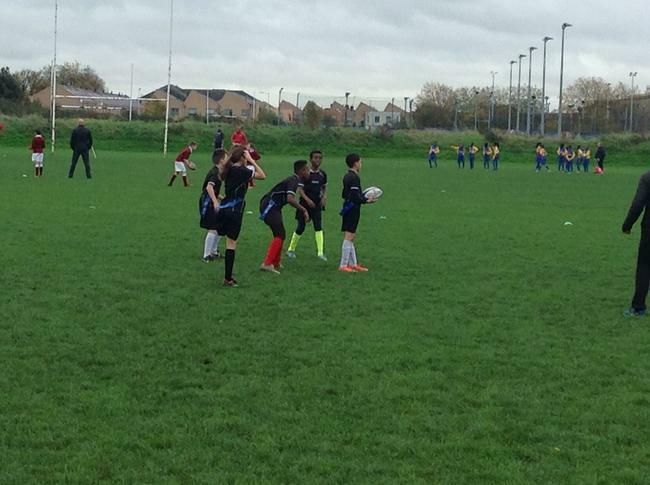 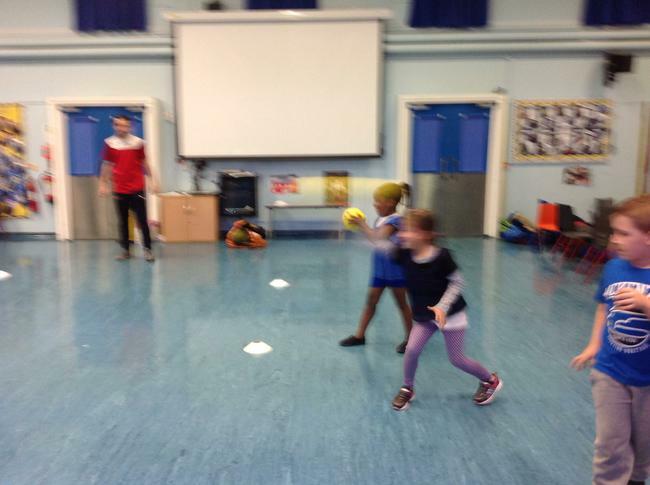 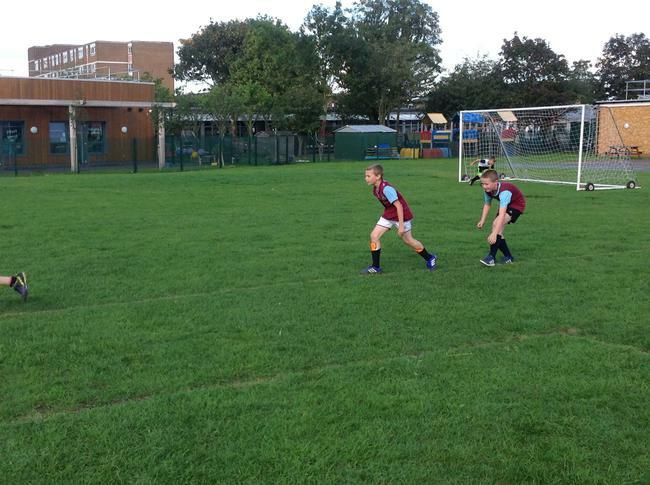 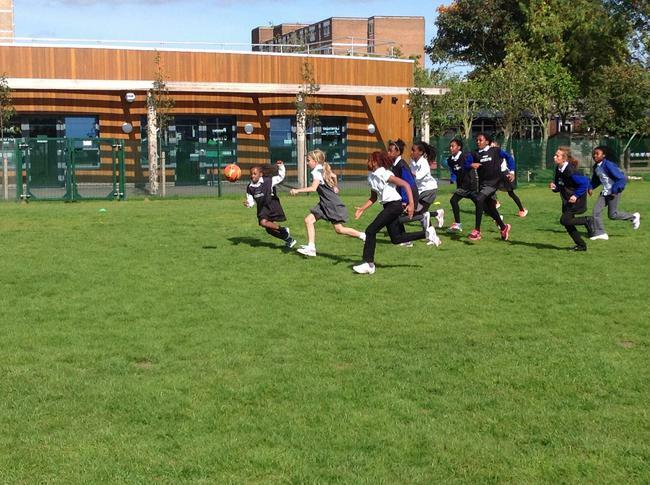 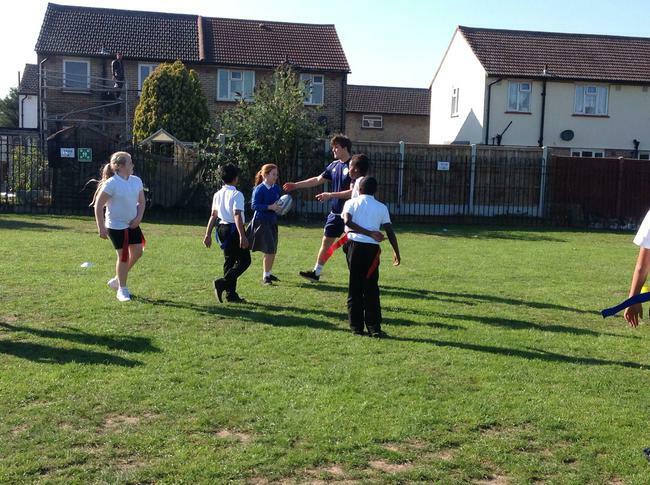 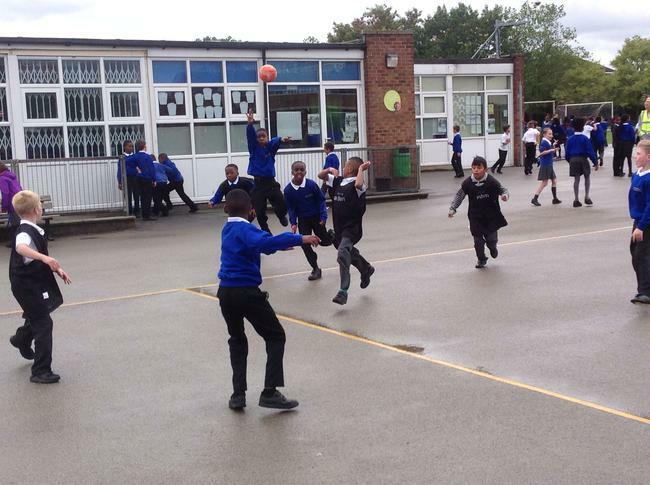 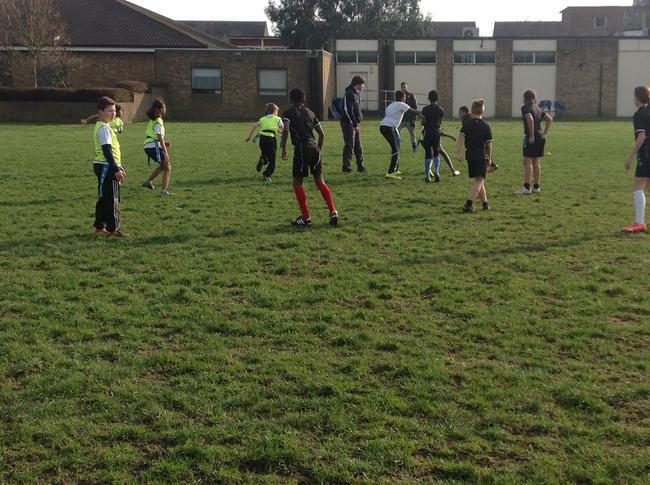 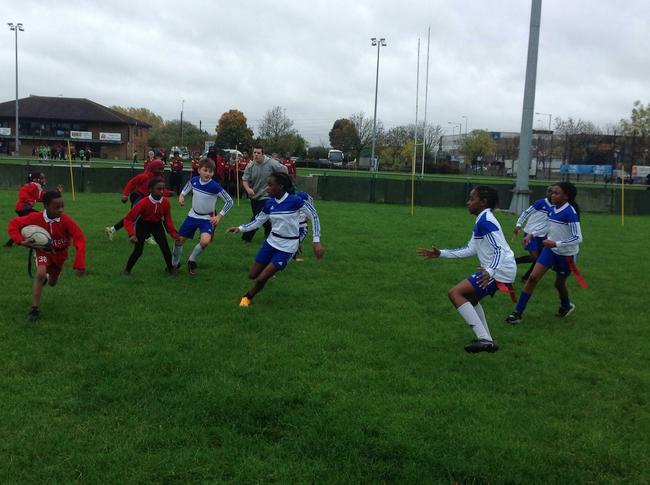 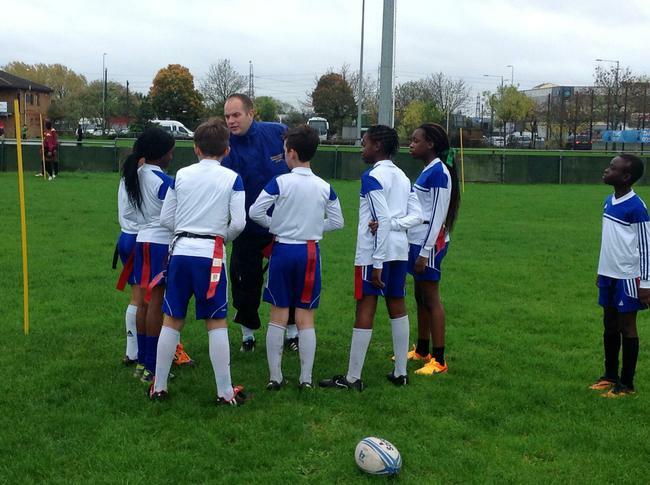 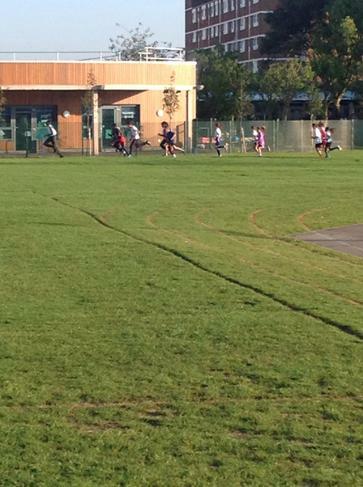 To celebrate the Rugby World Cup we decided that our first competition should be tag rugby. 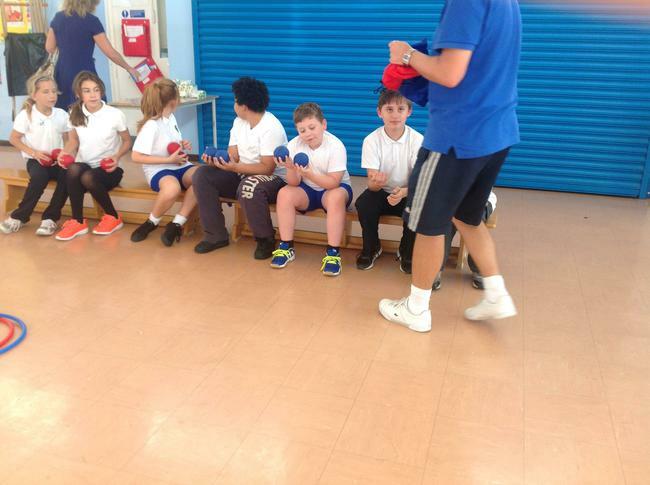 Congratulations to Gold class who won the competition. 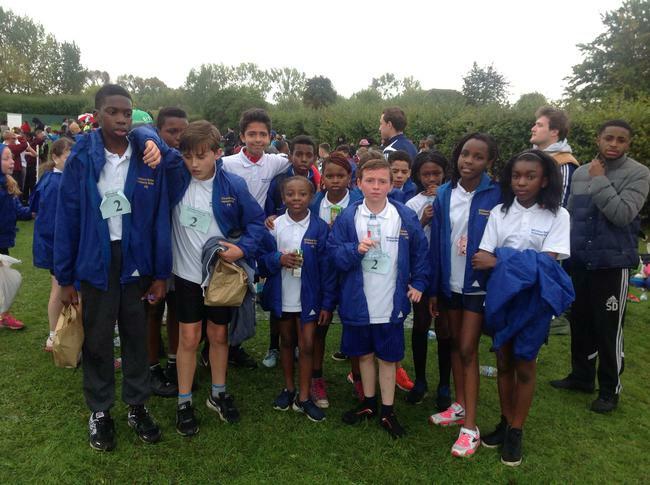 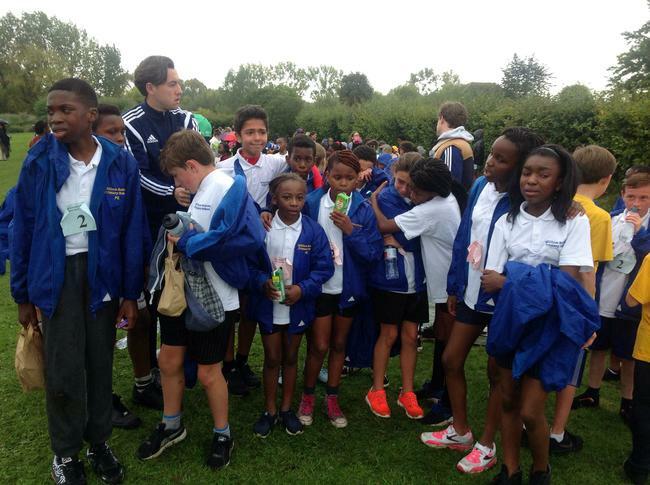 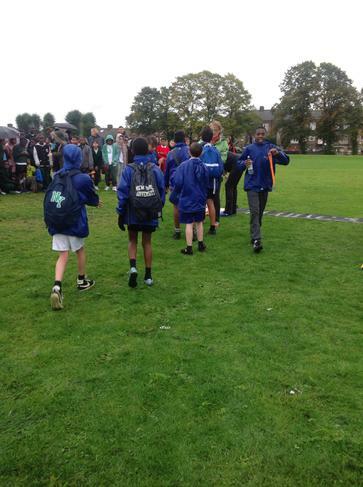 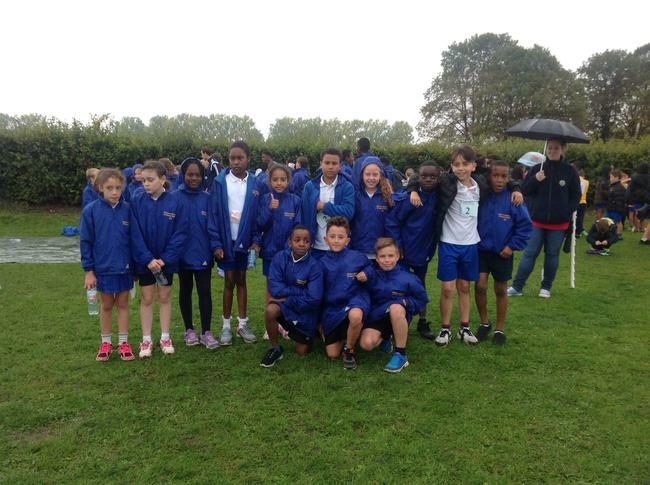 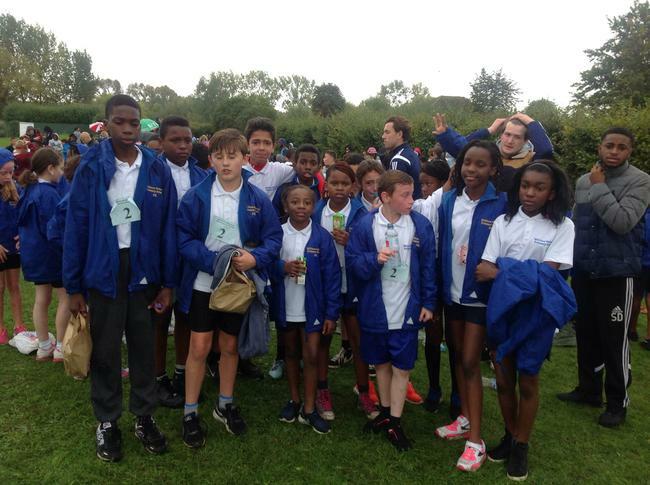 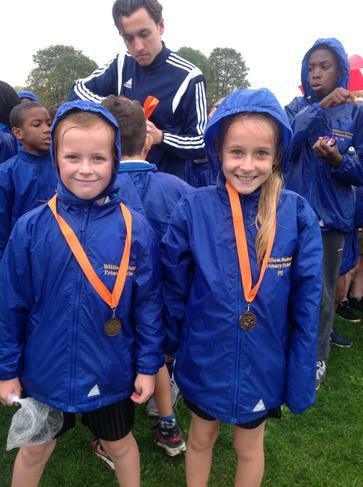 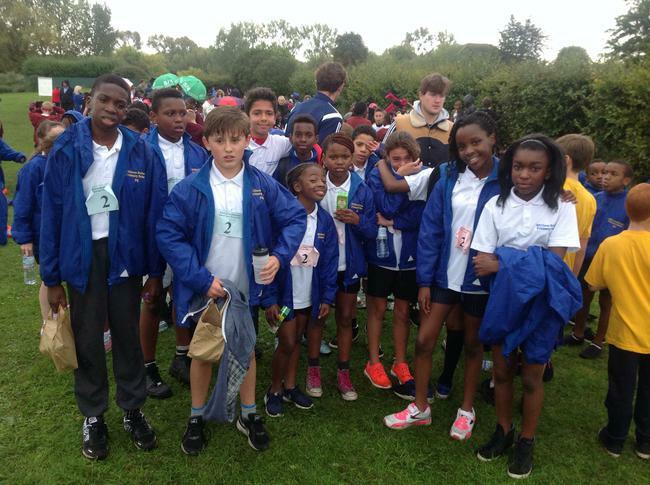 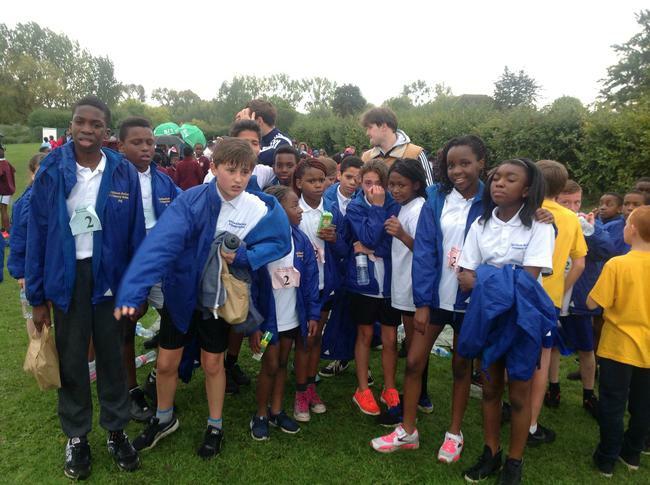 Well done to the final year 6 cross country squad. 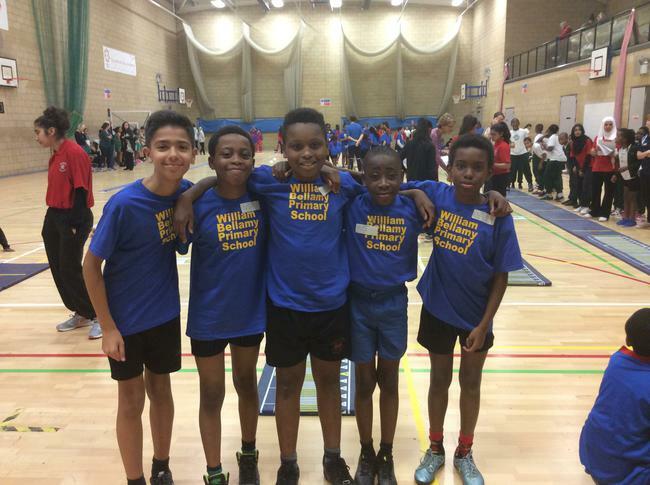 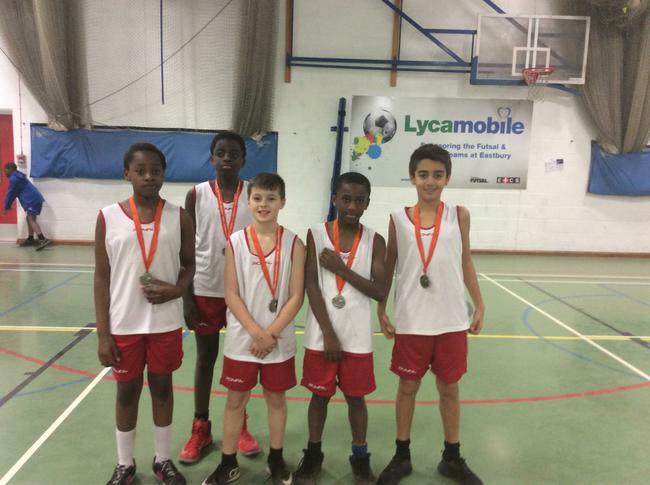 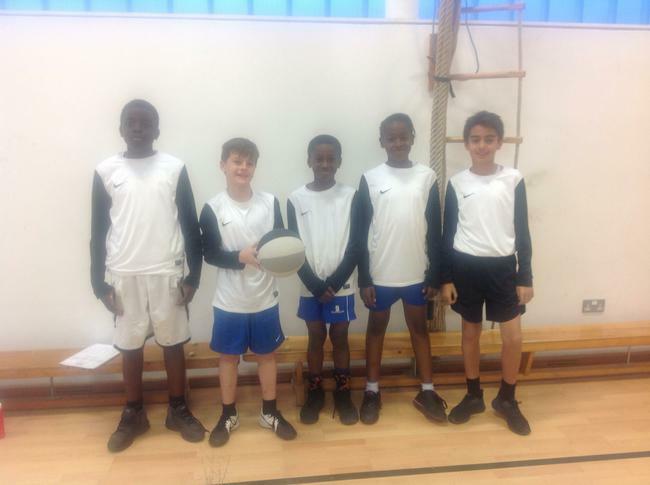 The boys' team who will be representing our school on 7th October at the borough championships are Sid, Sion, Joshea, Nehemi, Joshua A and Joshua. 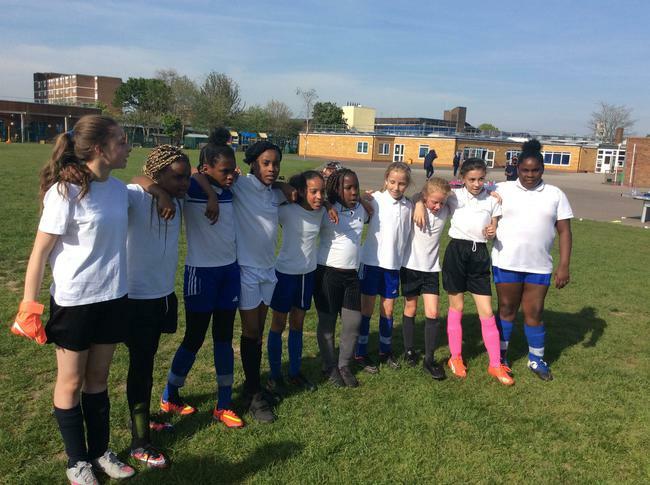 The girls' team who will also be representing our school at the same event are Libby, Aliyah, Goodness, Bright, Ire and Kyra. 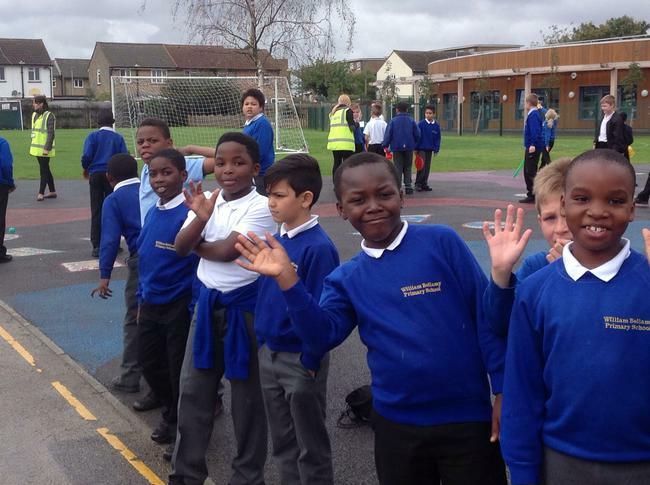 Good Luck from all of us at school. 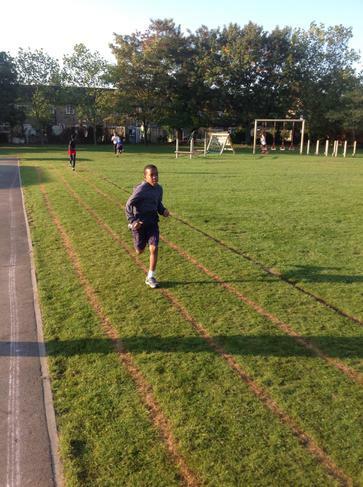 Be the best you can be! 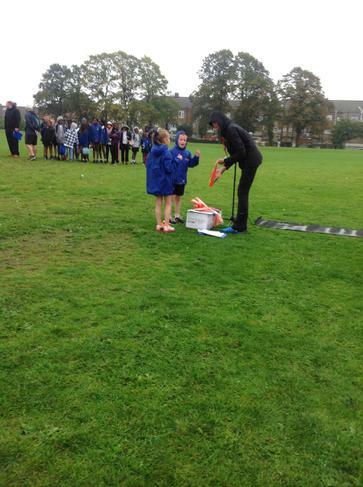 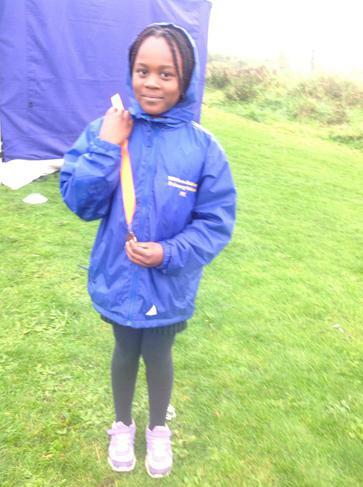 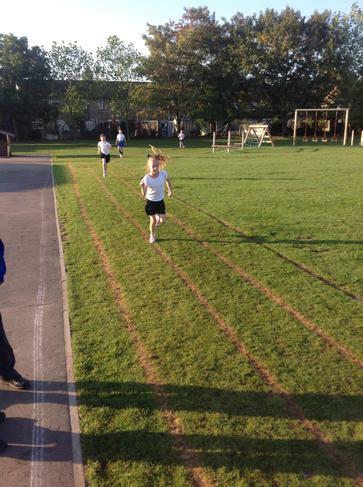 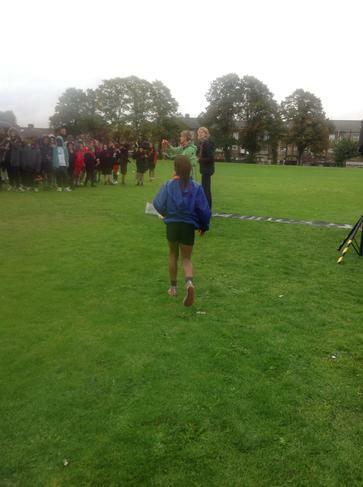 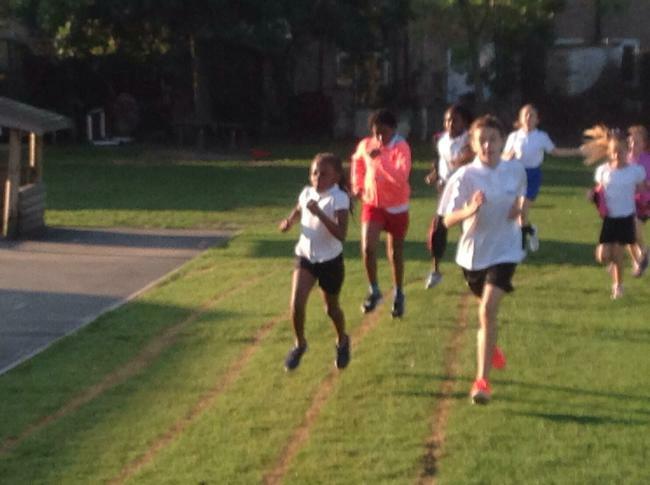 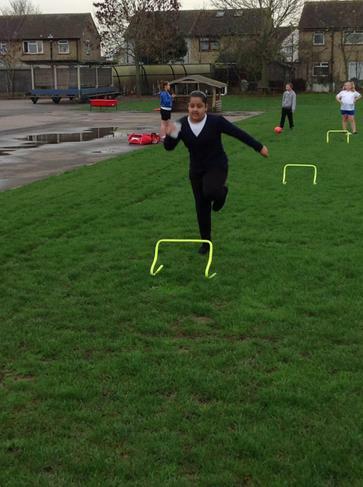 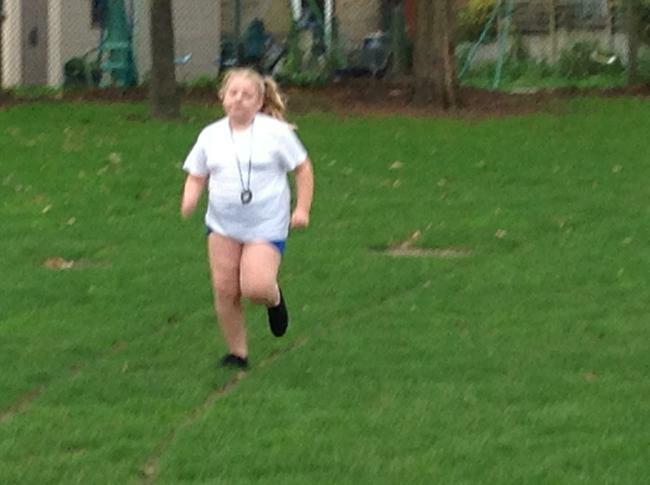 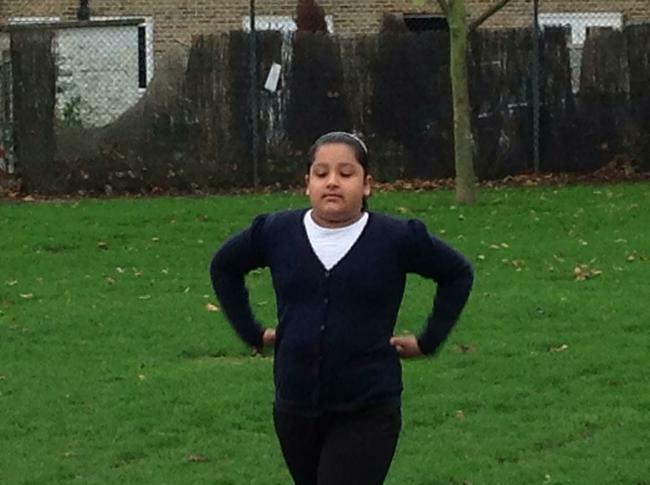 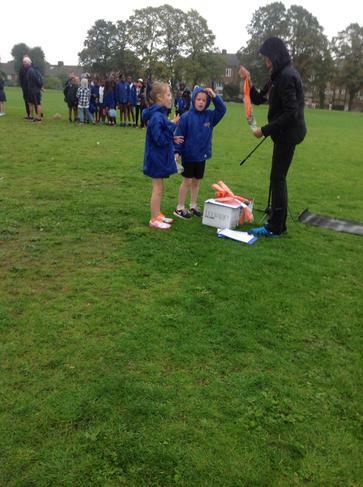 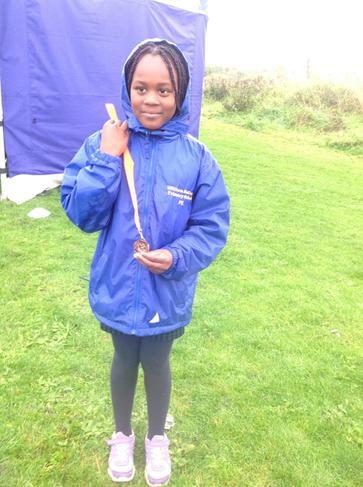 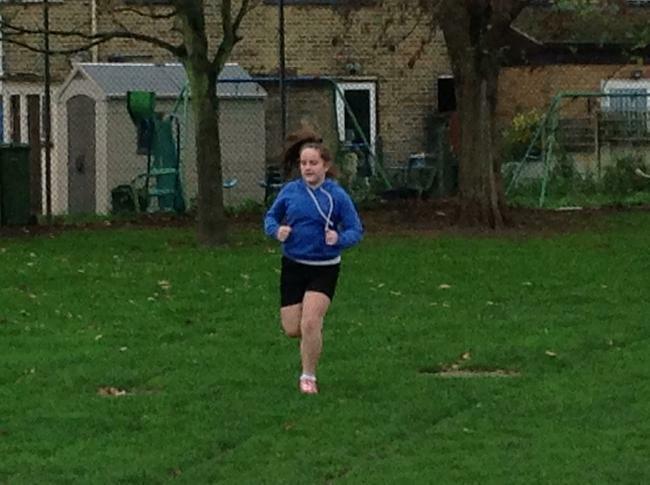 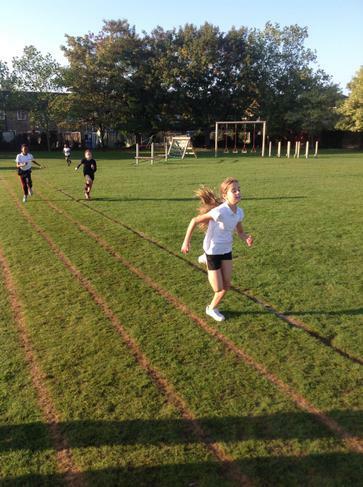 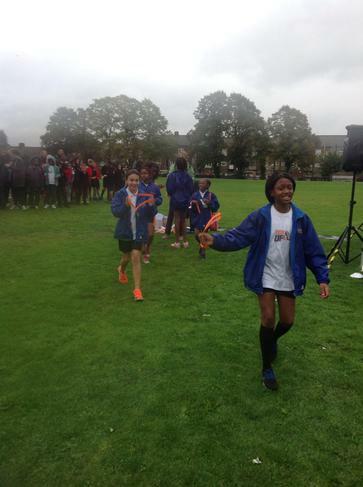 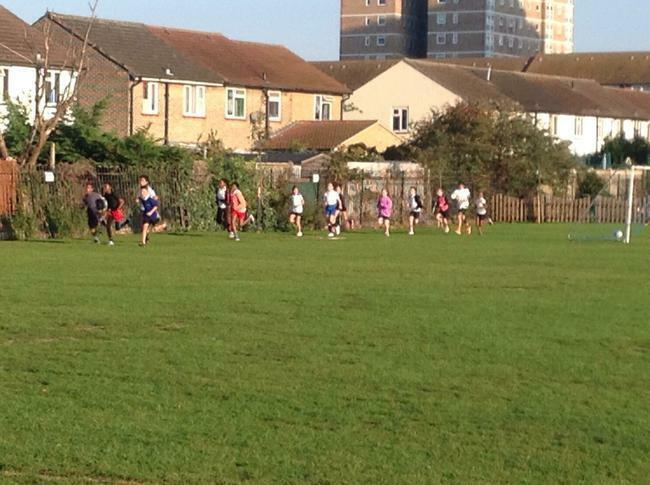 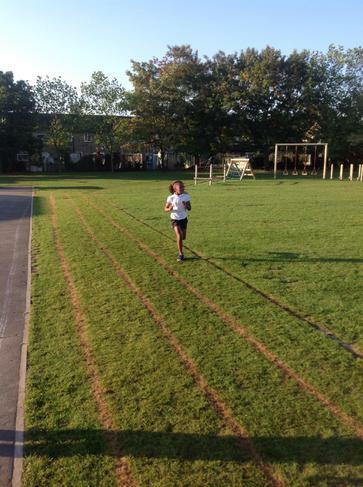 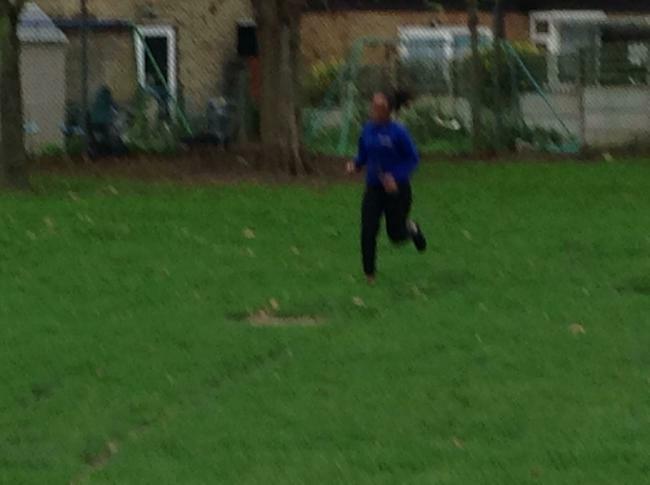 Well done to Bright who amazed all of us with her fantastic cross country run. 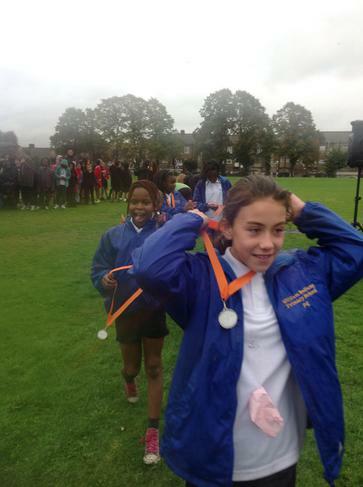 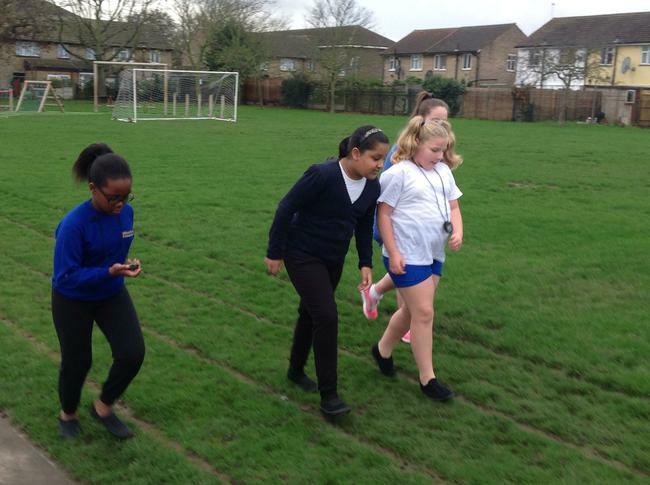 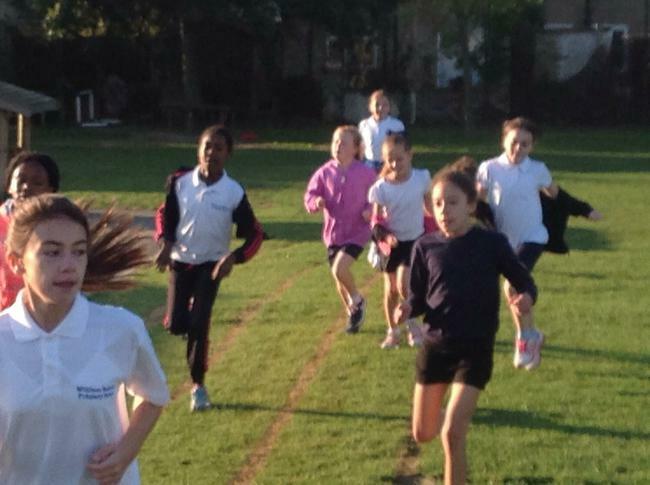 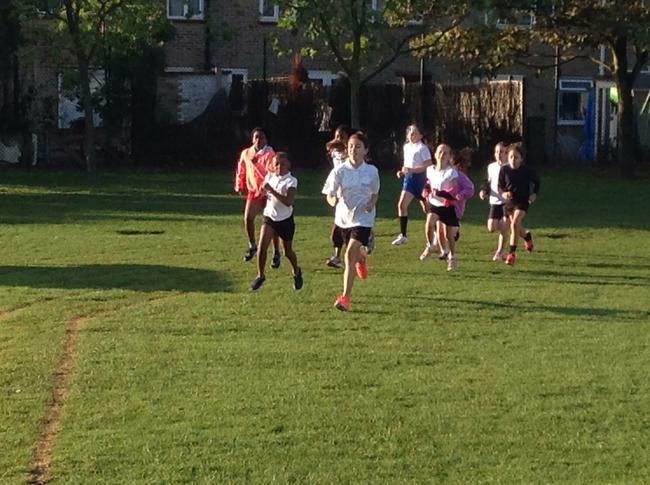 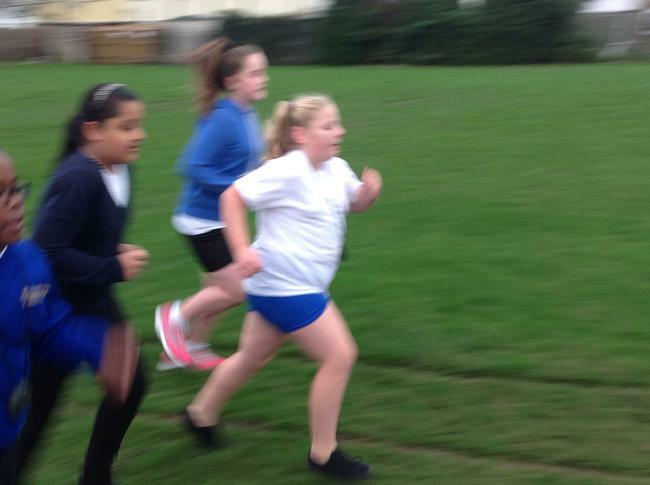 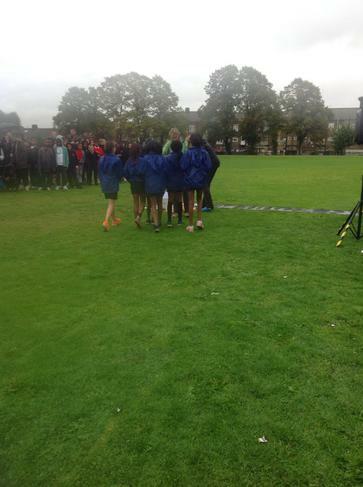 The year 6 girlss had to run a distance of 1.3 miles and the first 6 would qualify for the borough cross country championships. 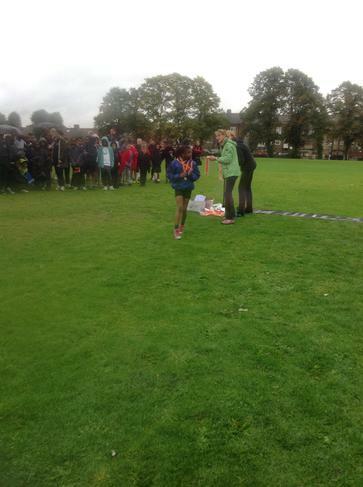 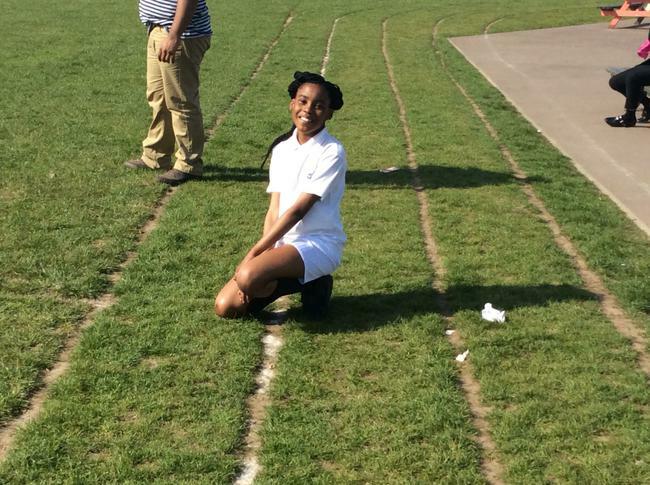 Bright ran an amazing race and finished in 1st place. 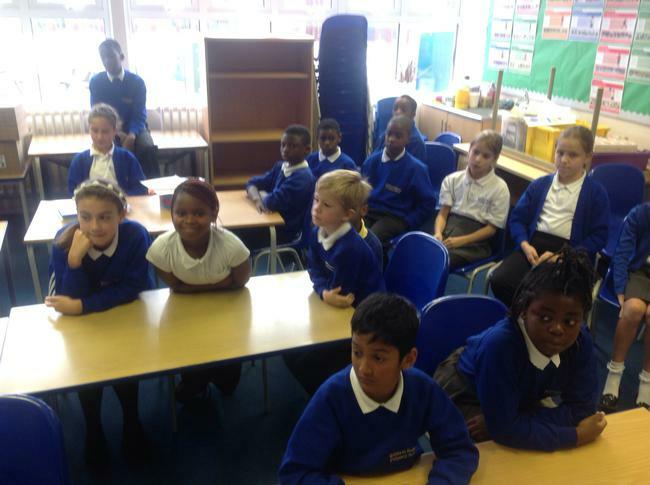 Congratulations to Bright and Gold Class. 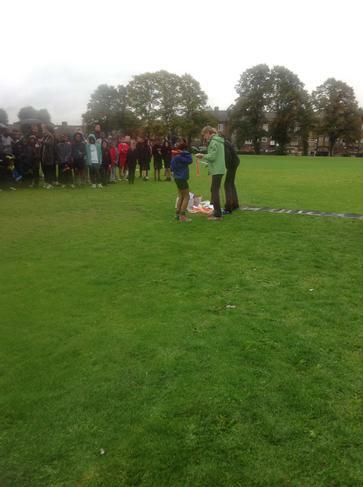 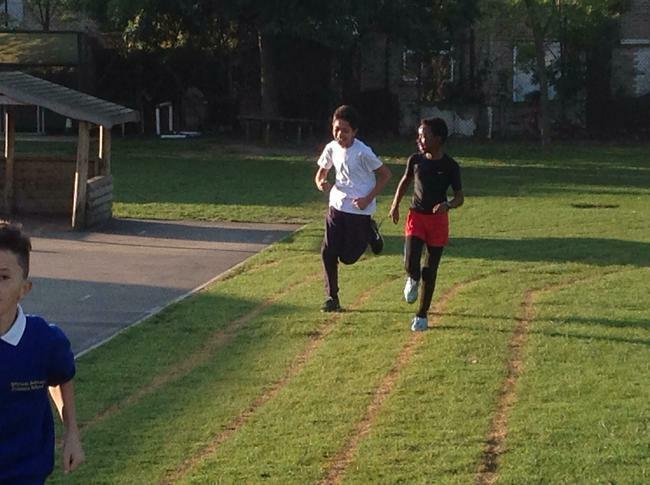 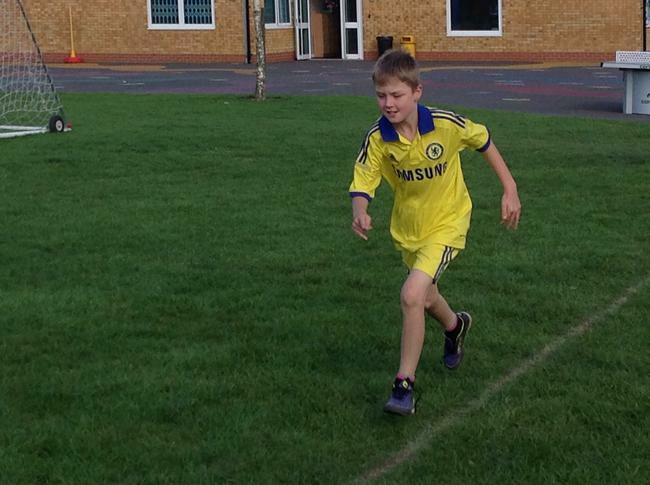 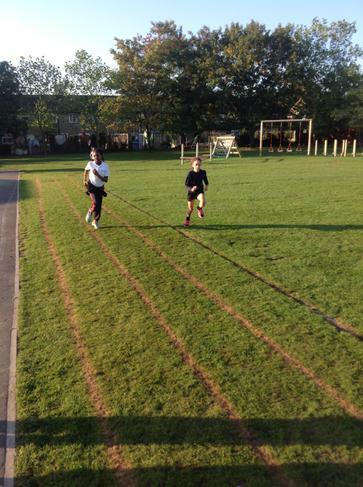 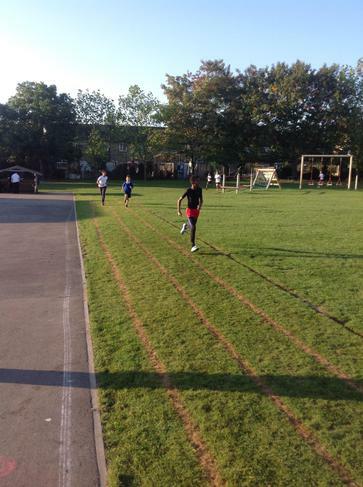 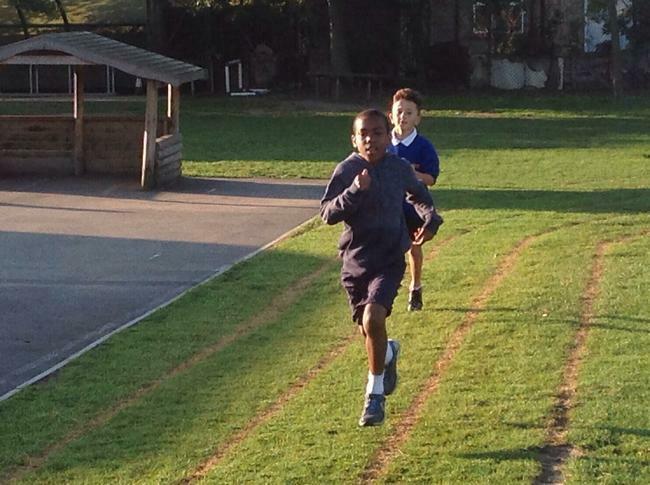 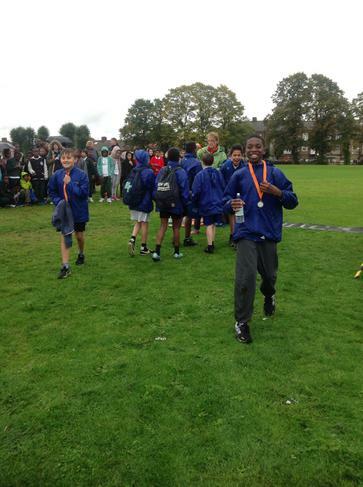 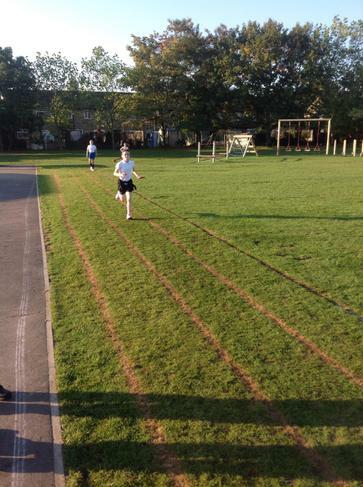 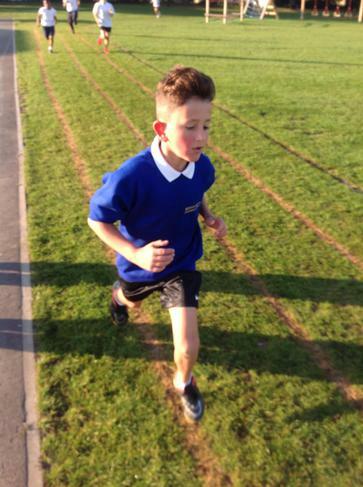 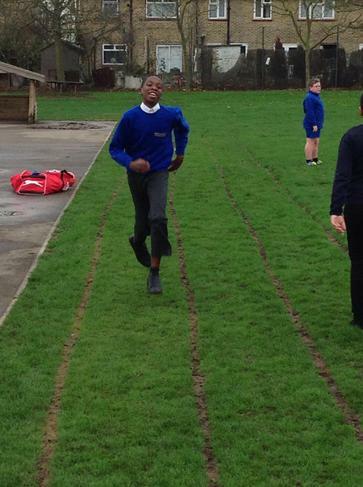 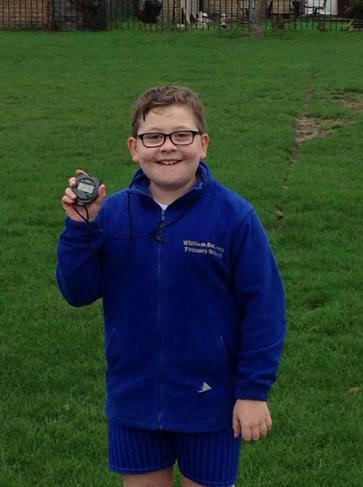 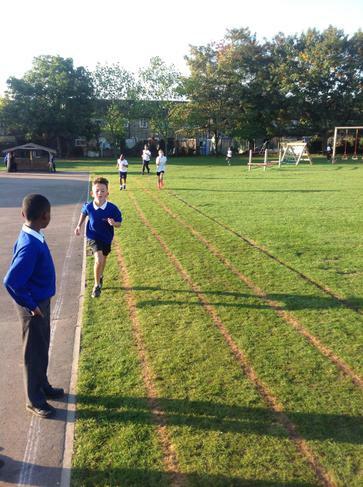 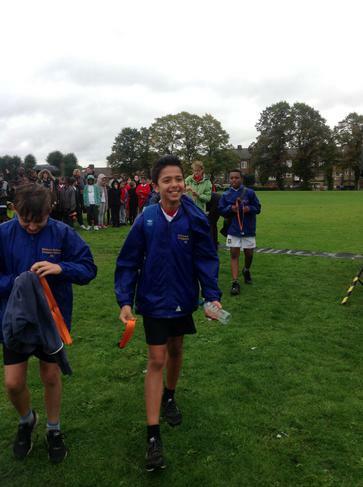 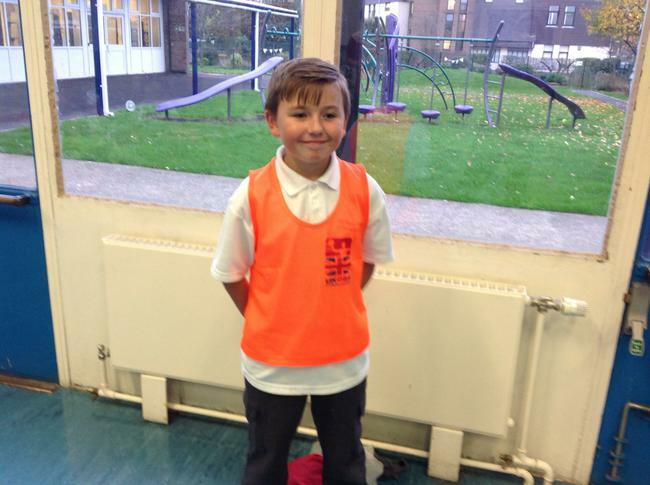 Well done to Joshea who stunned all of us with his fantastic cross country run. 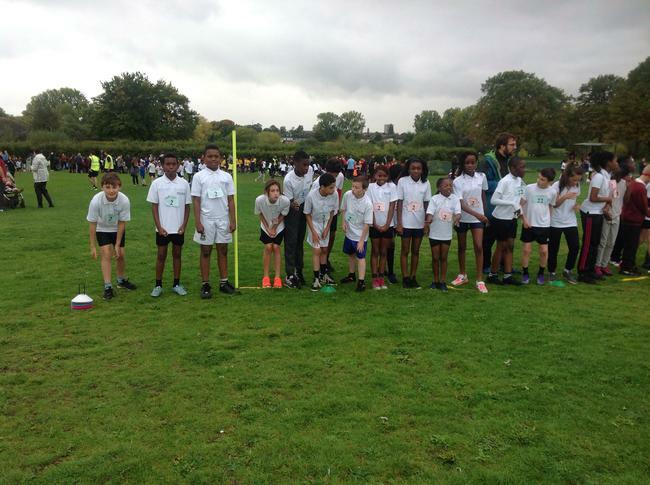 The year 6 boys had to run a distance of 1.3 miles and the first 6 would qualify for the borough cross country championships. 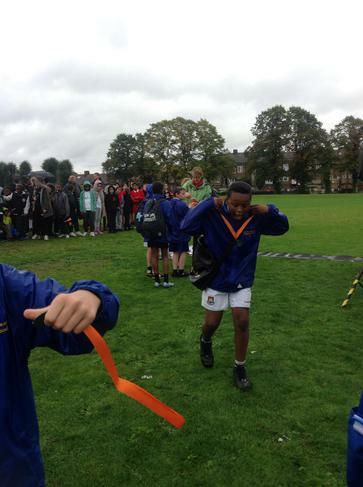 Joshea ran an amazing race and finished in 1st place. 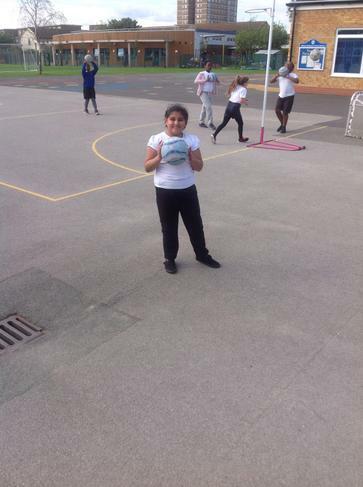 Congratulations Joshea and Gold Class. 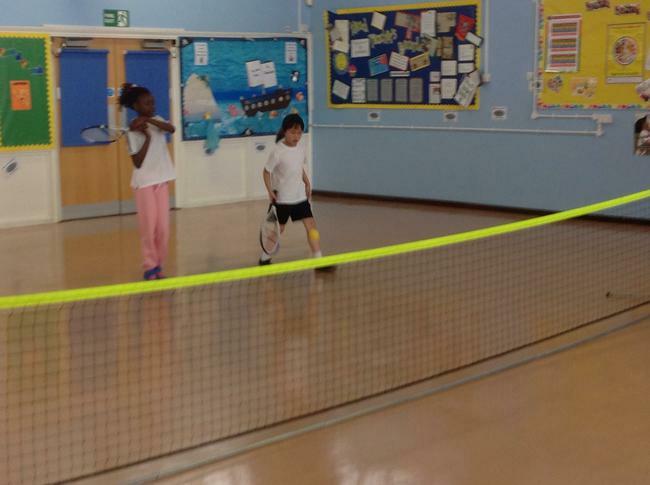 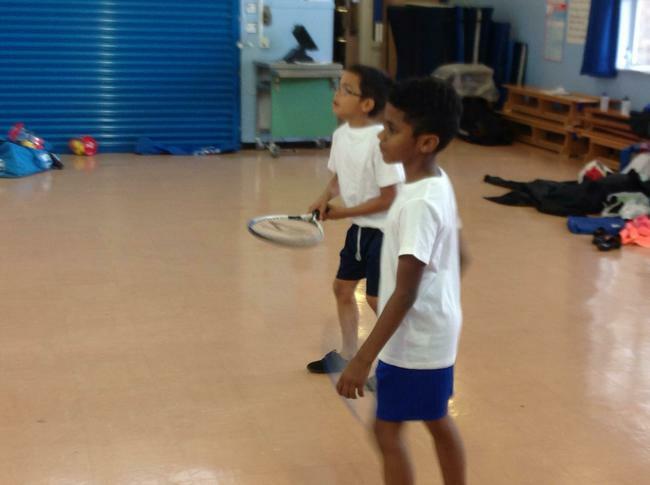 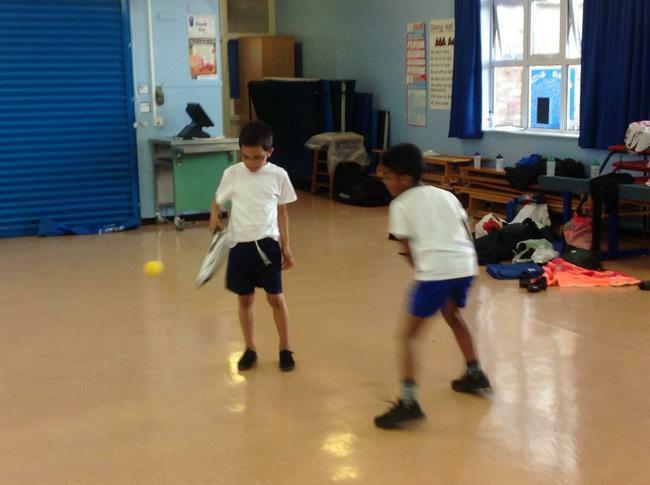 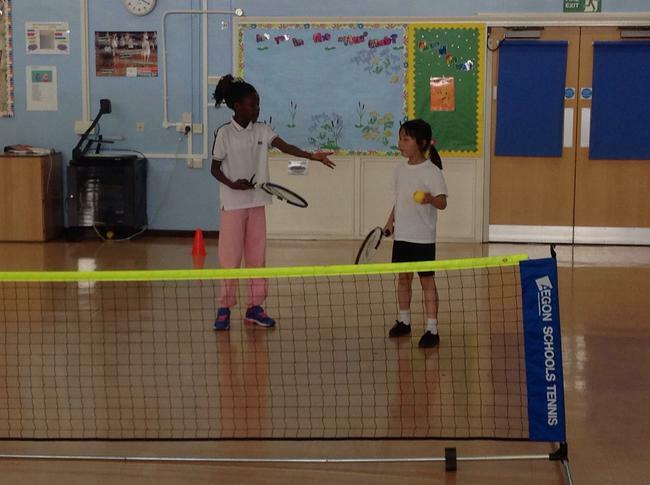 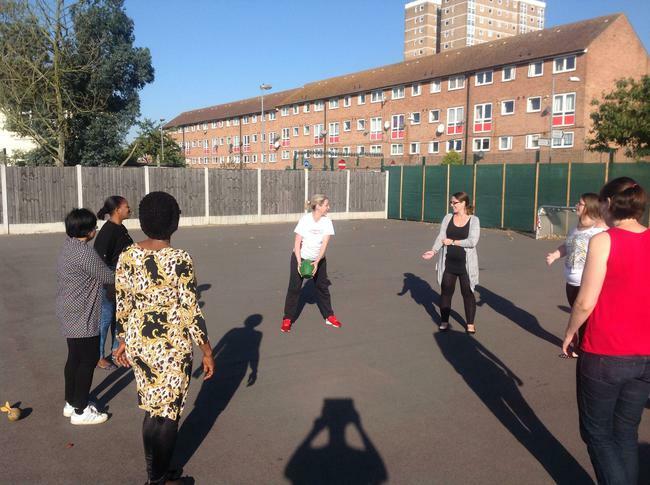 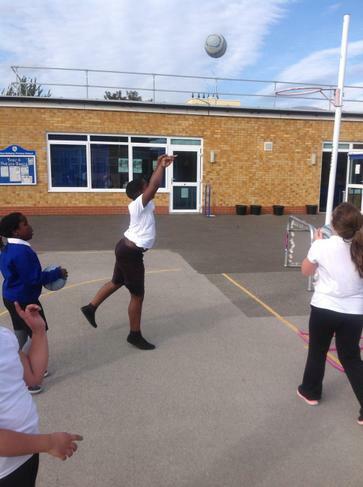 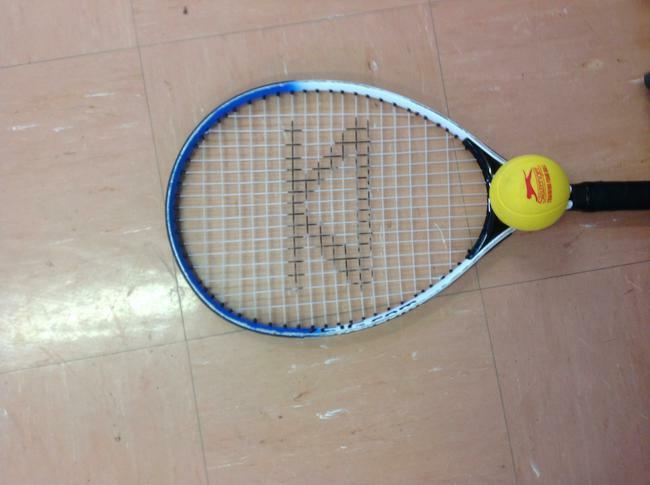 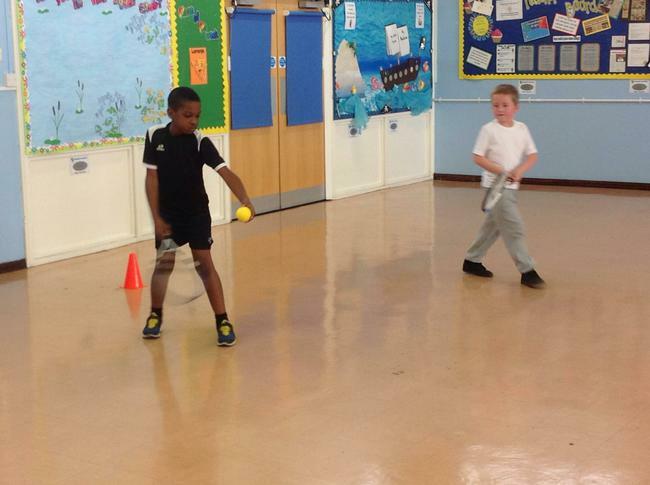 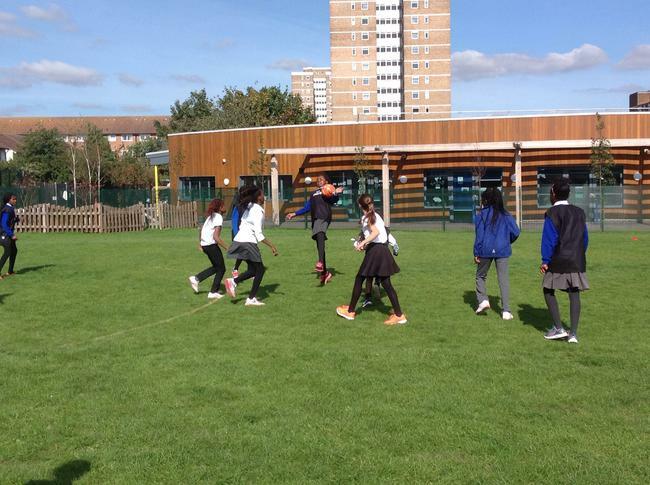 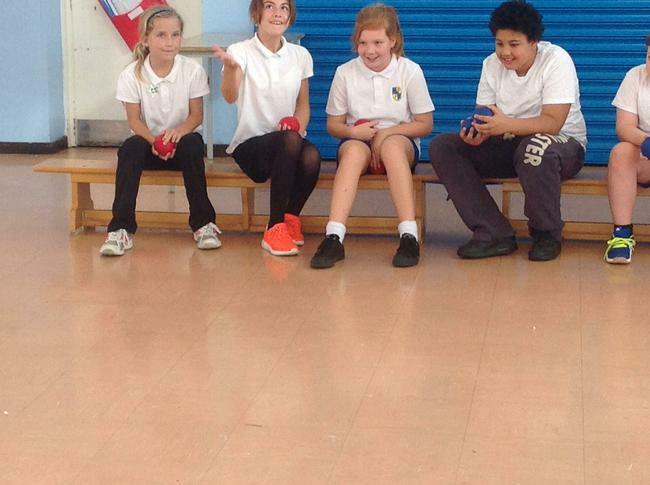 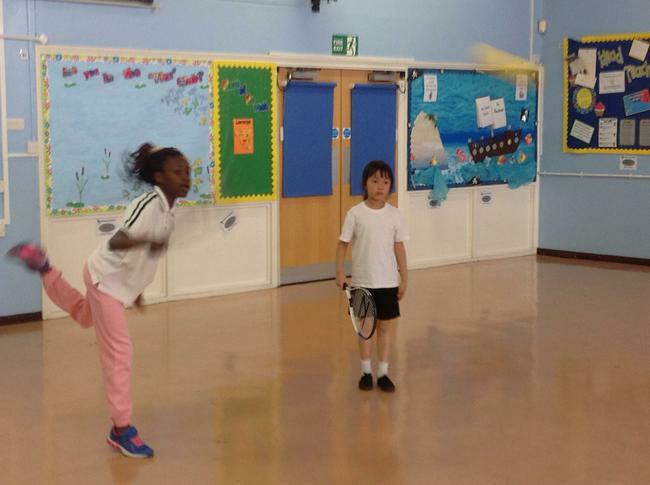 Last year the pupils from William Bellamy asked for a tennis club. 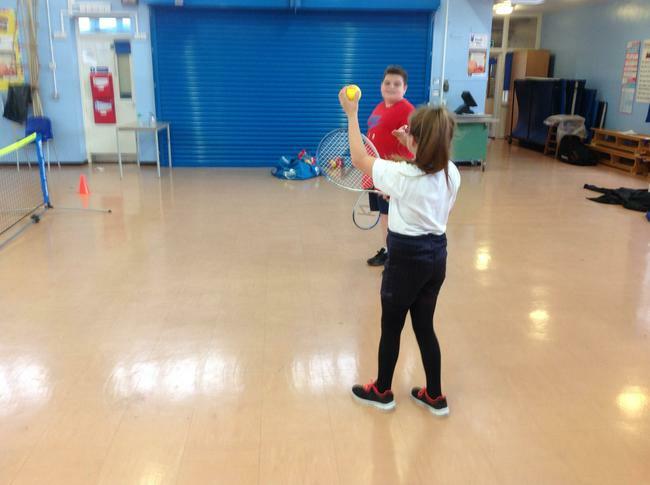 Listening to our pupils we decided to trial and after school club and introduce some tennis style activities at lunch time. 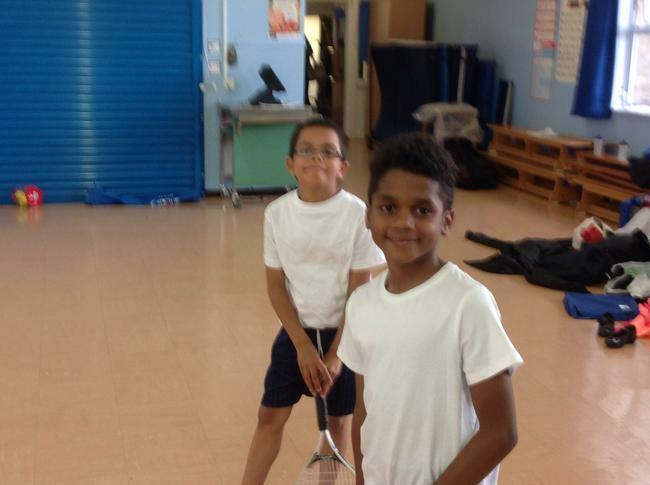 Due to the success of this club and the increasing interest of tennis at lunchtimes we are offering a tennis club as part of our afterschool opportunities. 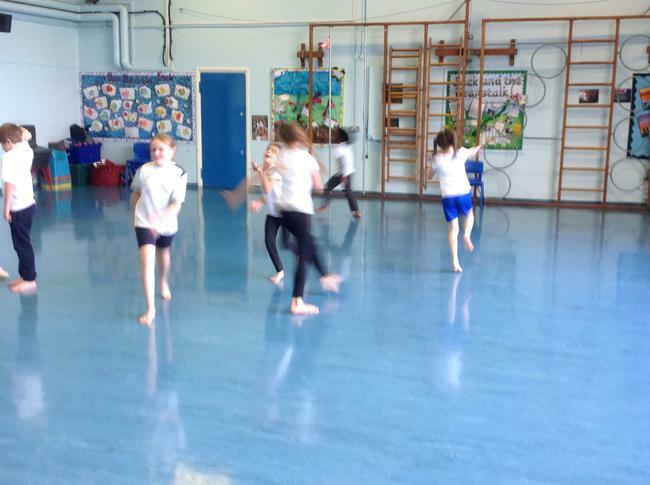 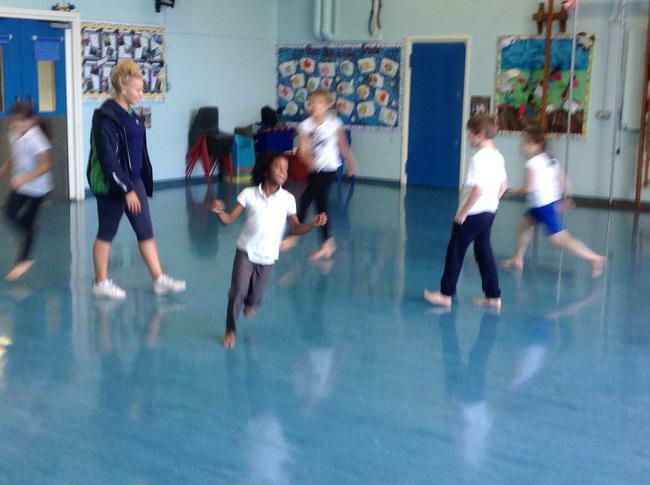 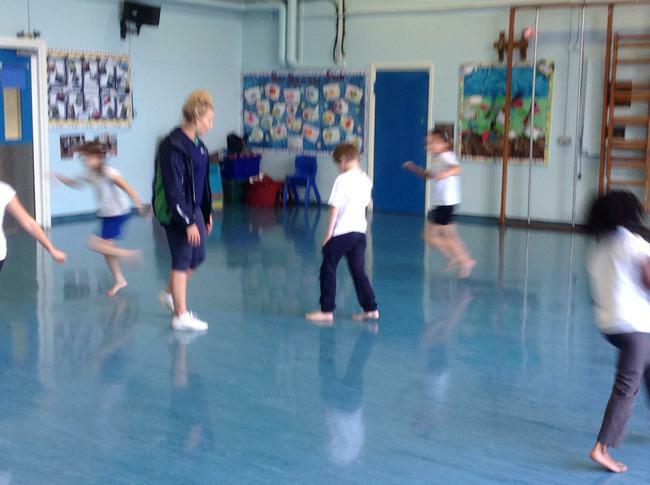 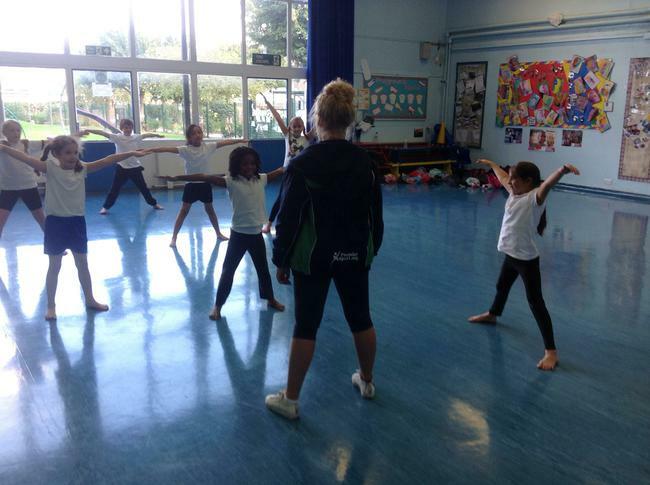 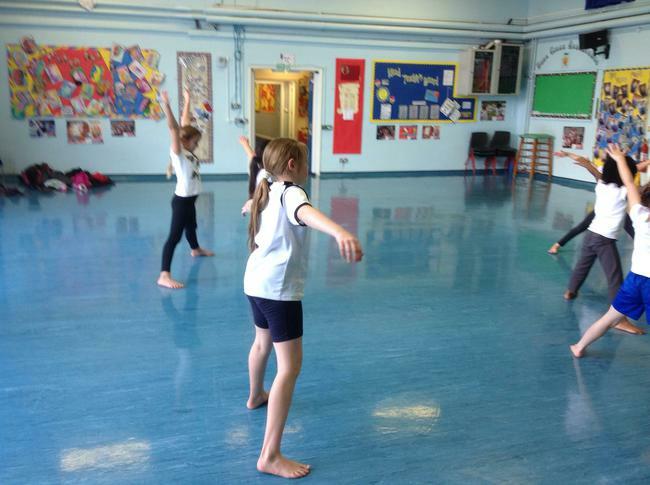 Our pupils from year 3-6 meet very week and are learning new skills. 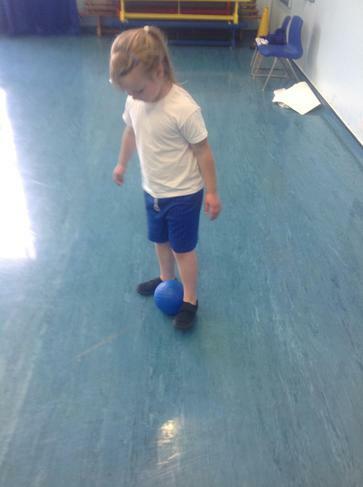 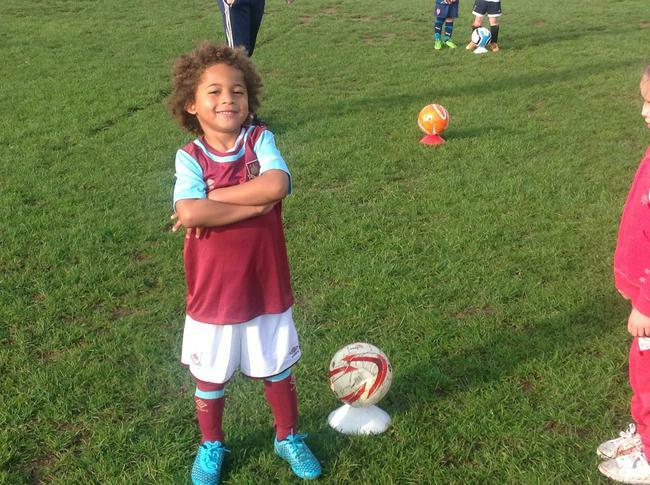 One parents told us how she has always encouraged her son to play different sports but he has never really seemed interested. 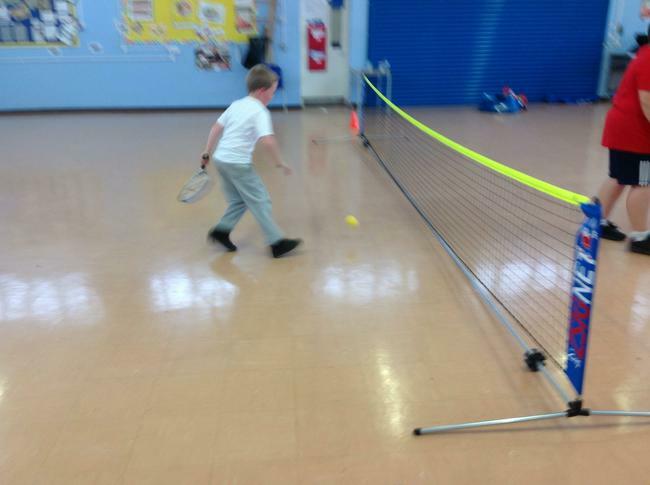 She continued to say how much he enjoys the tennis club and looks forward to attending each week. 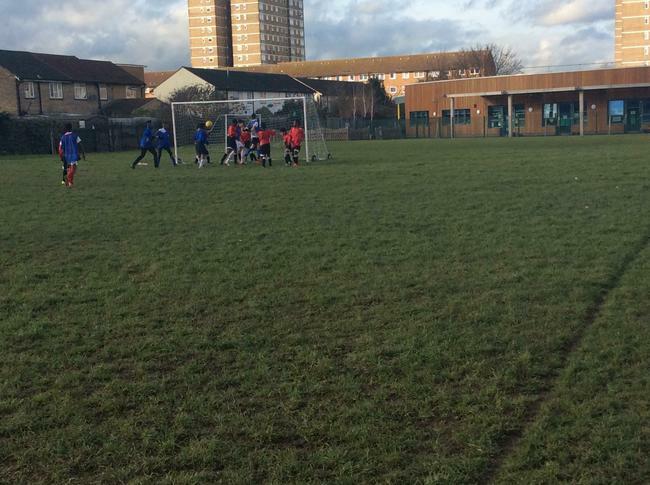 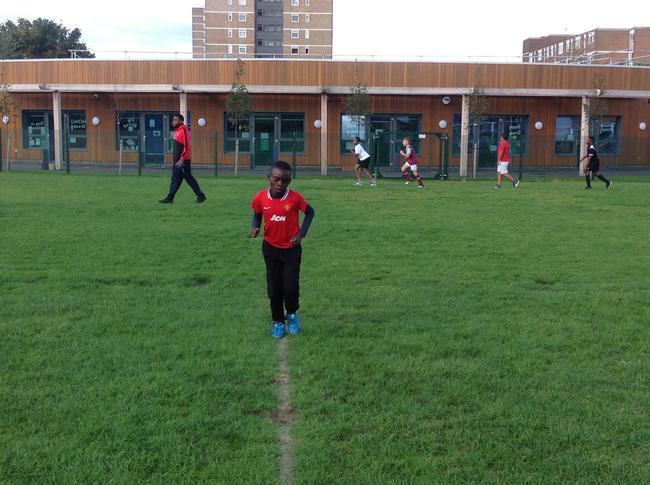 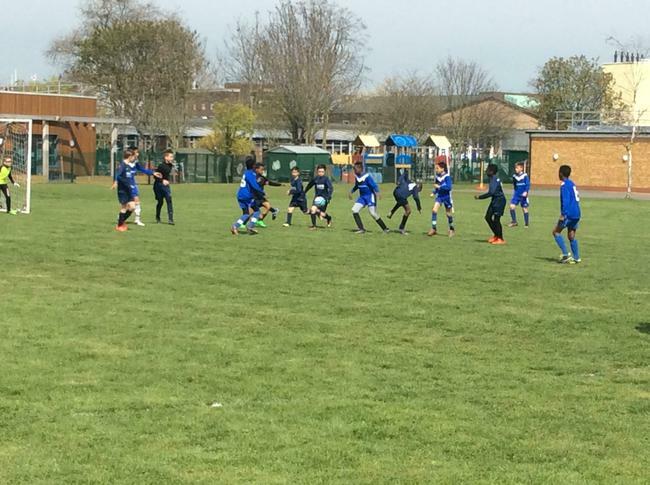 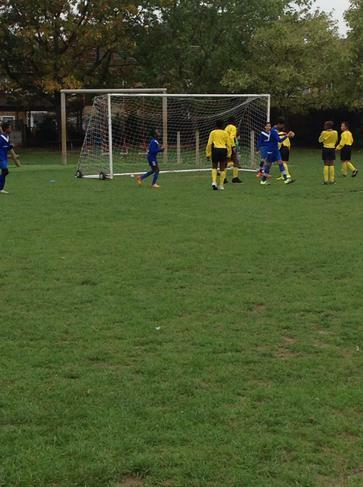 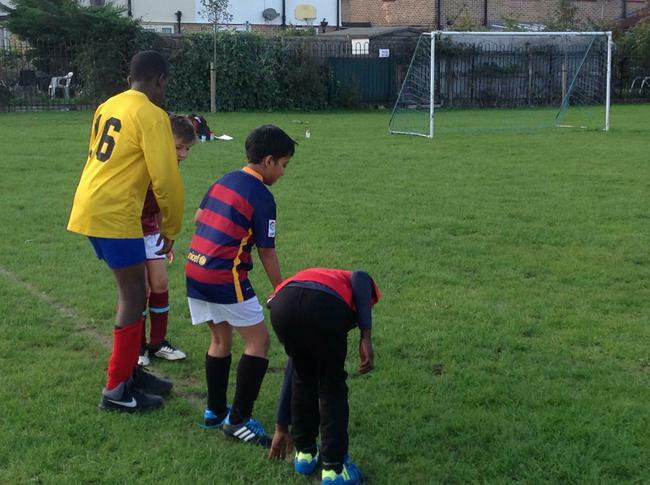 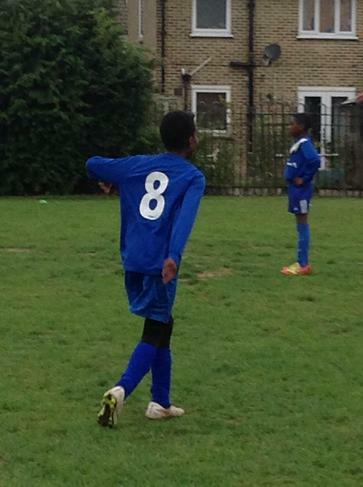 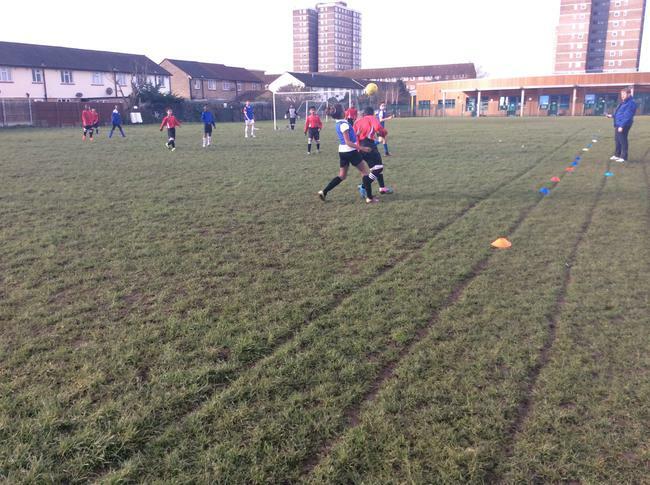 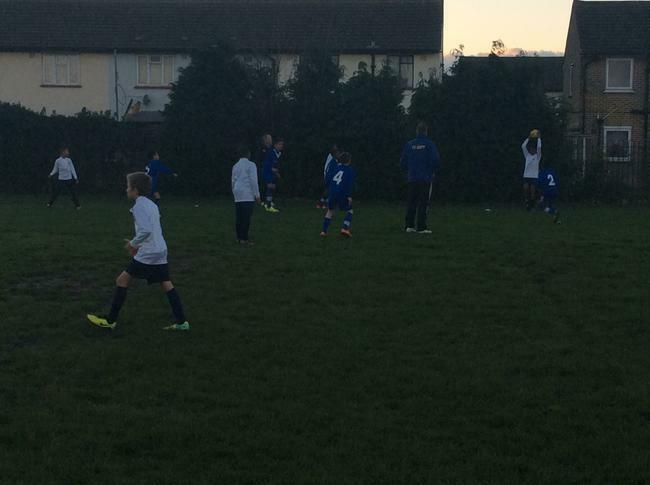 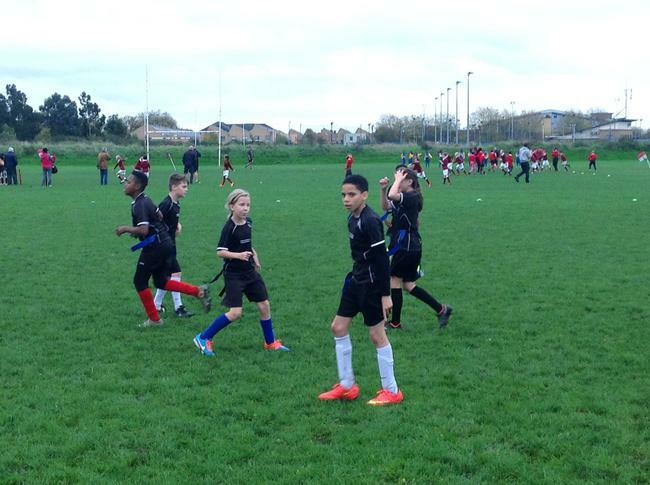 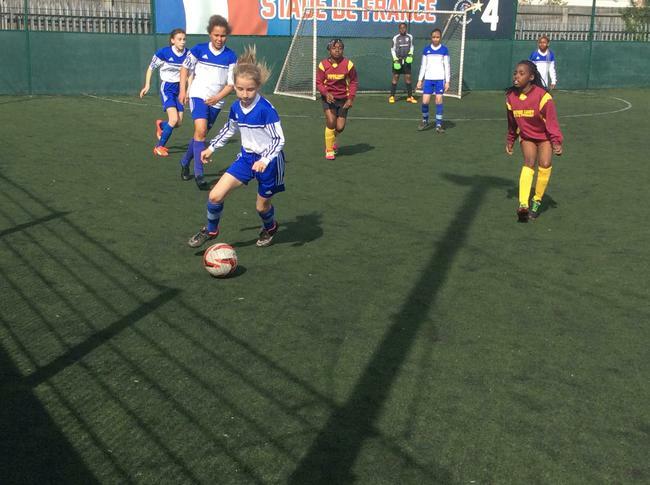 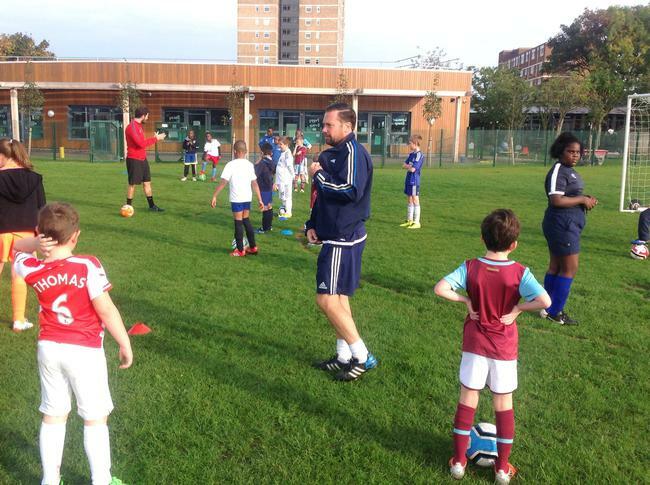 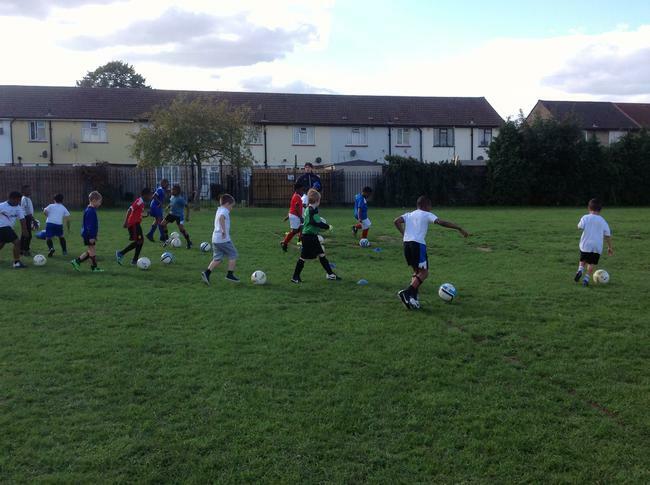 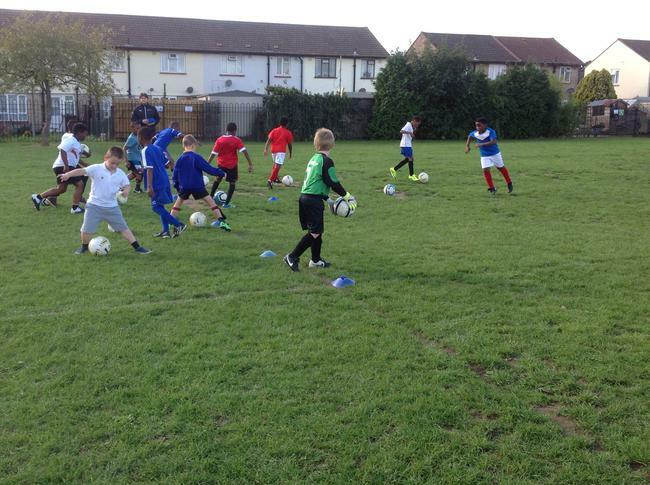 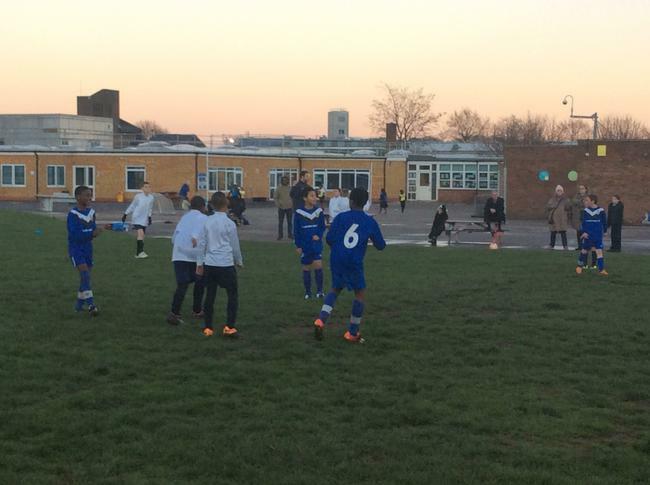 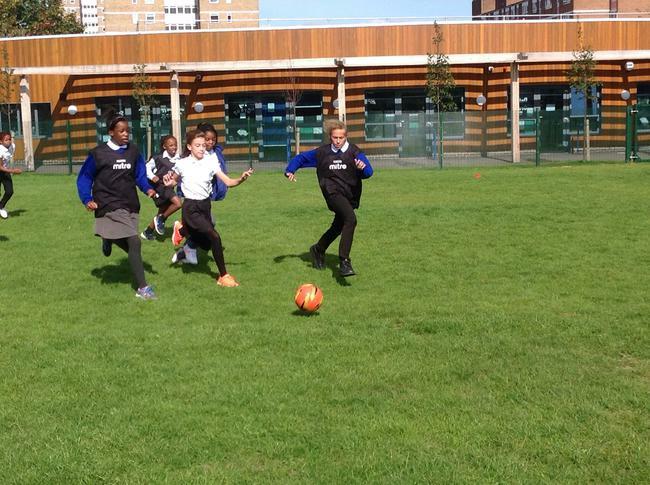 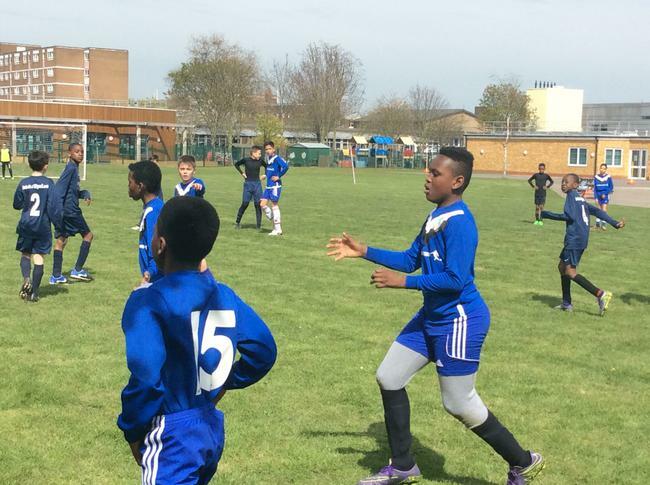 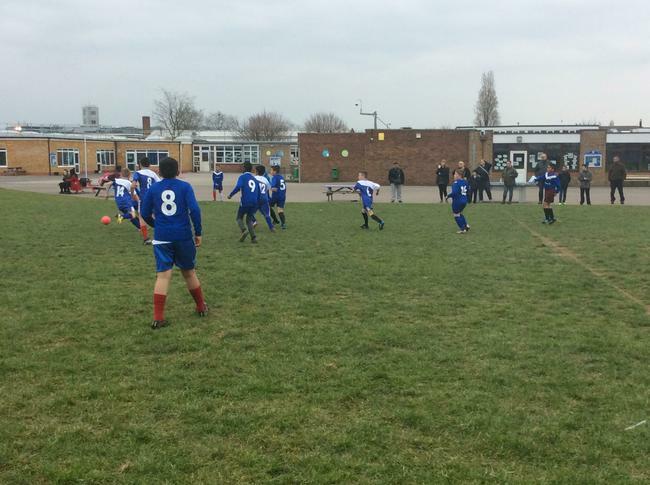 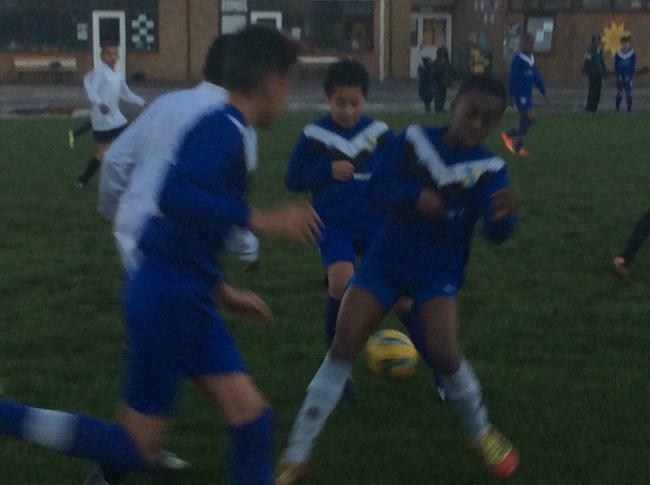 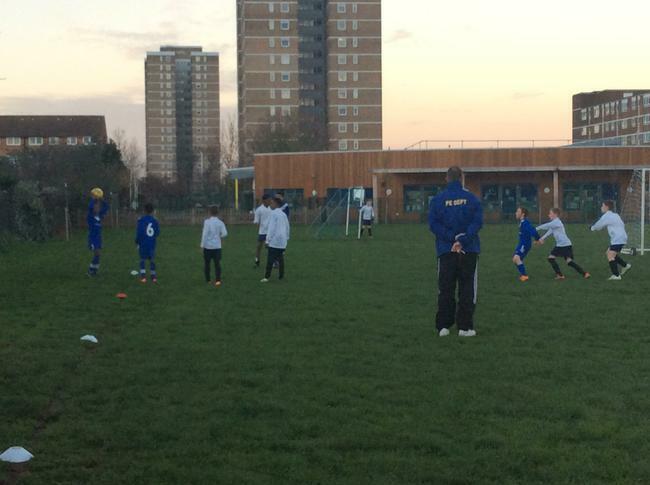 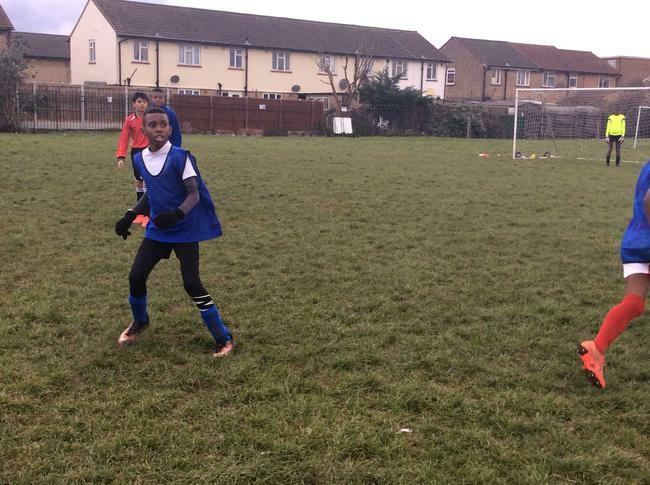 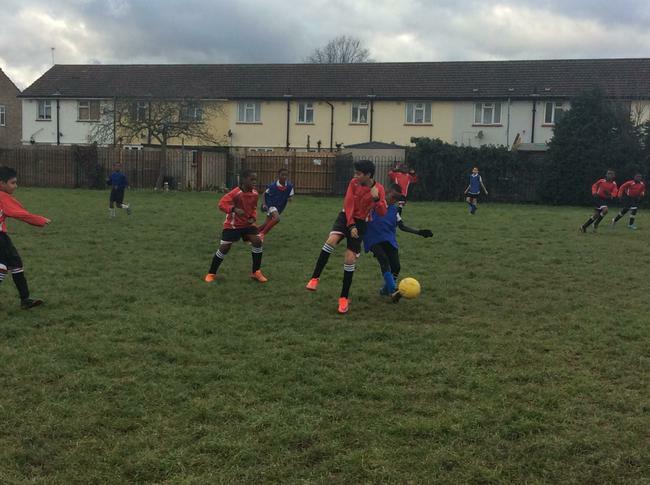 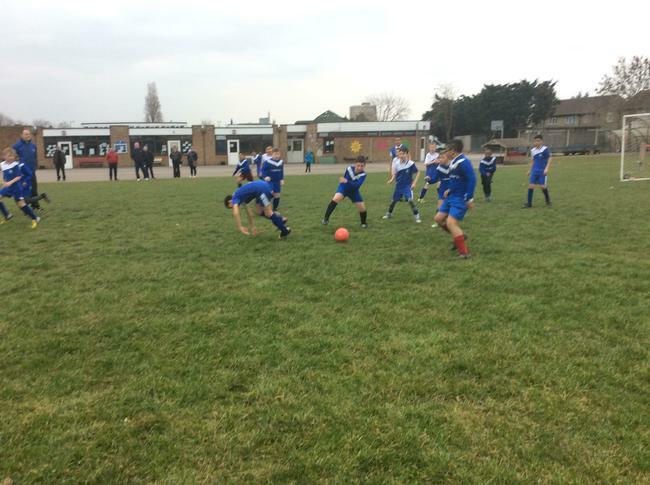 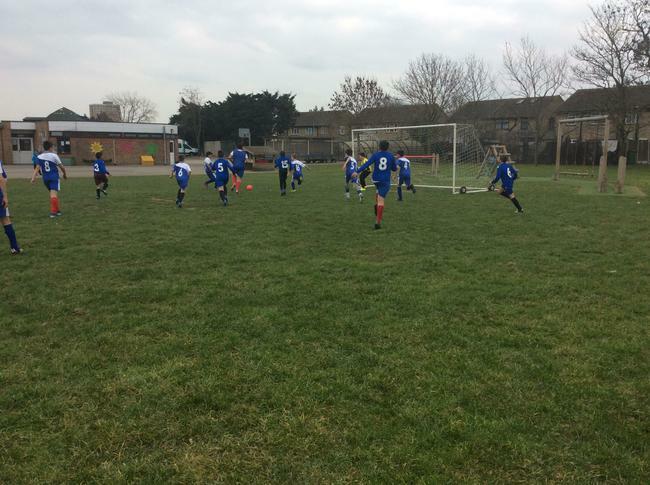 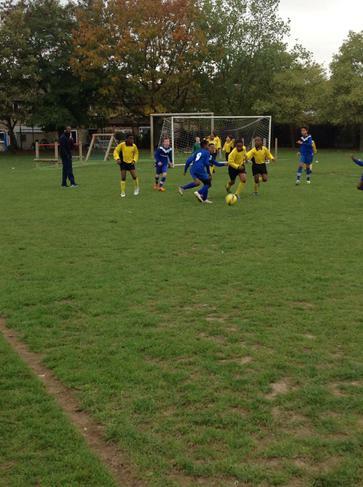 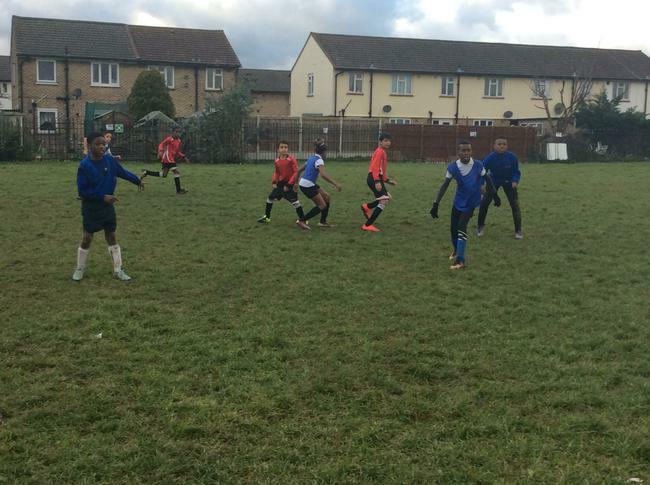 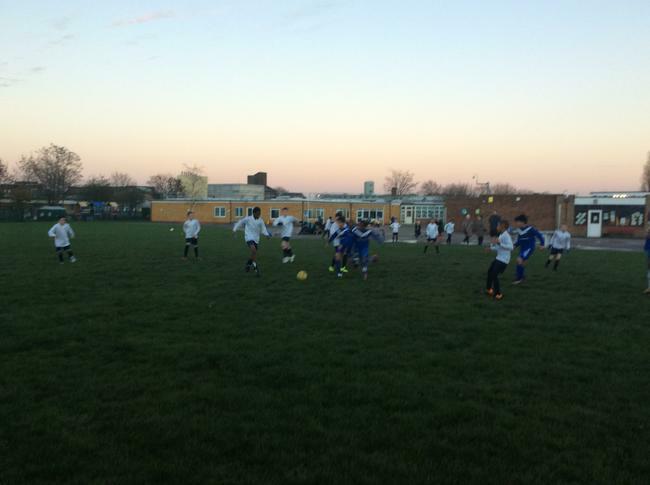 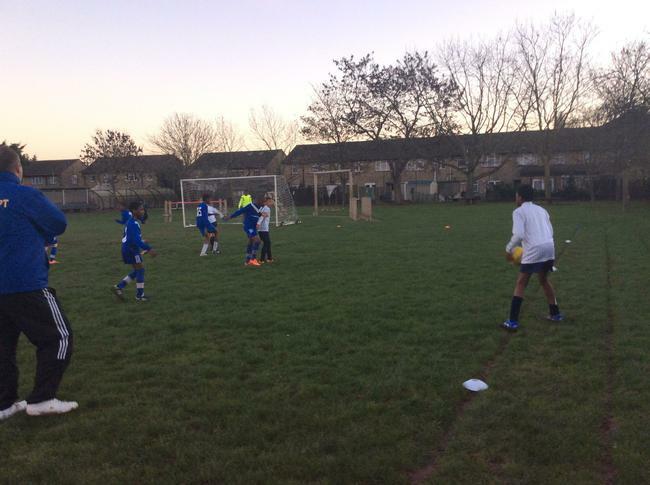 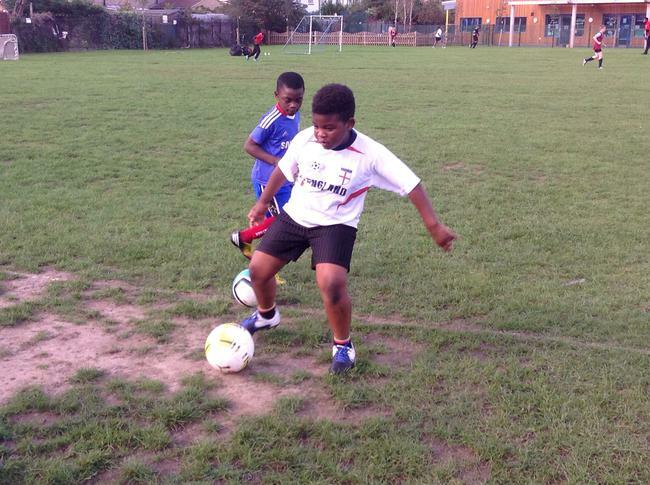 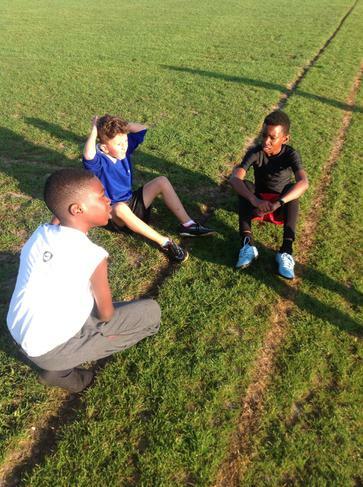 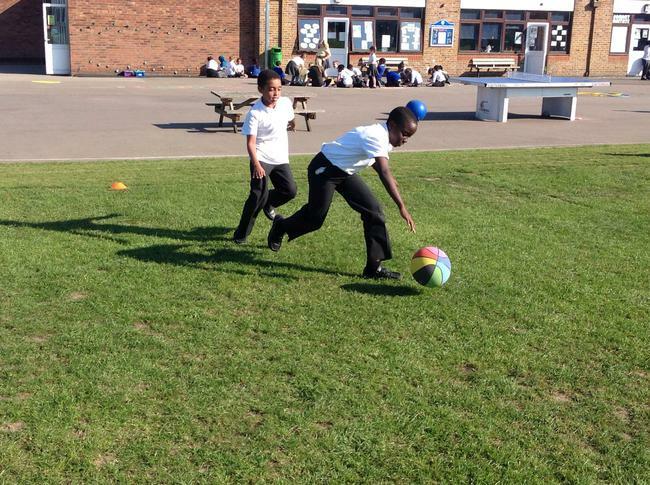 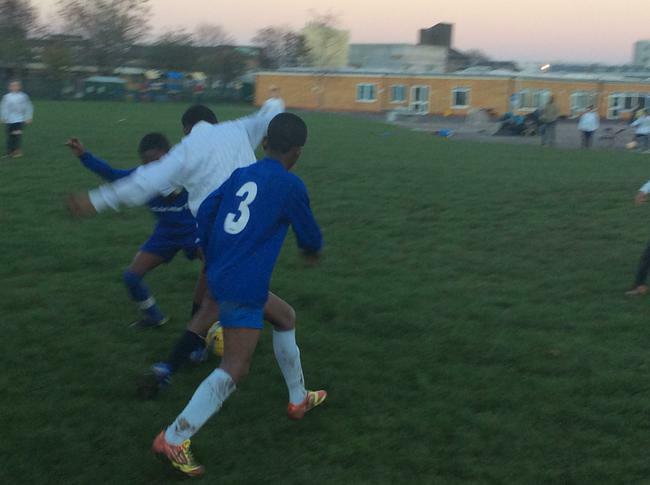 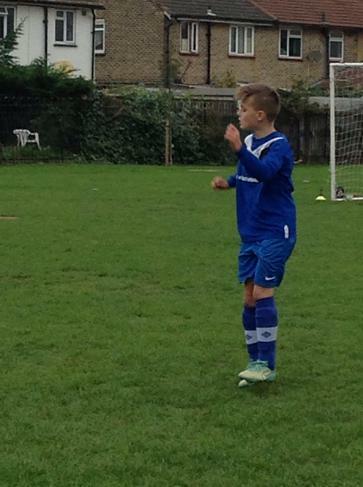 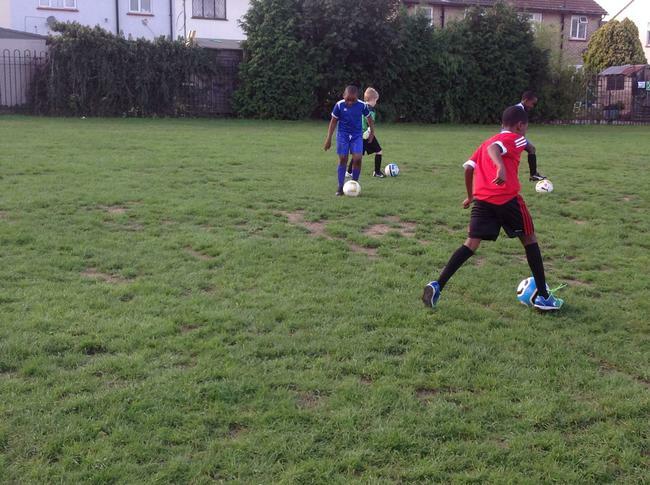 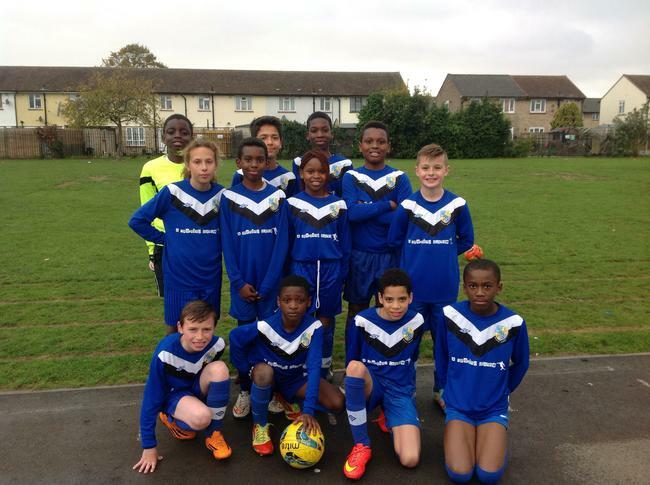 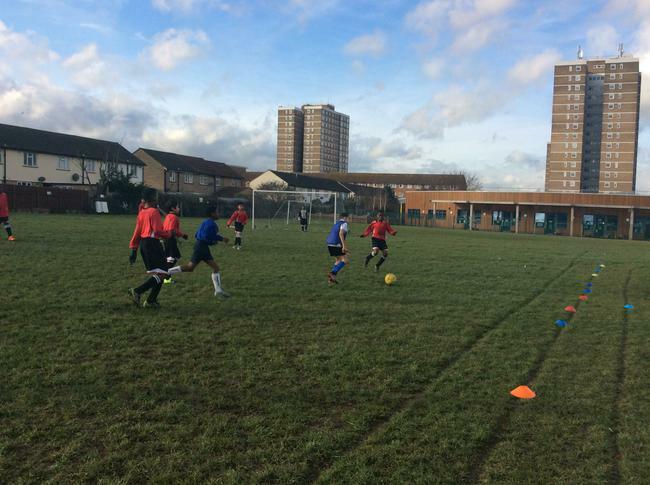 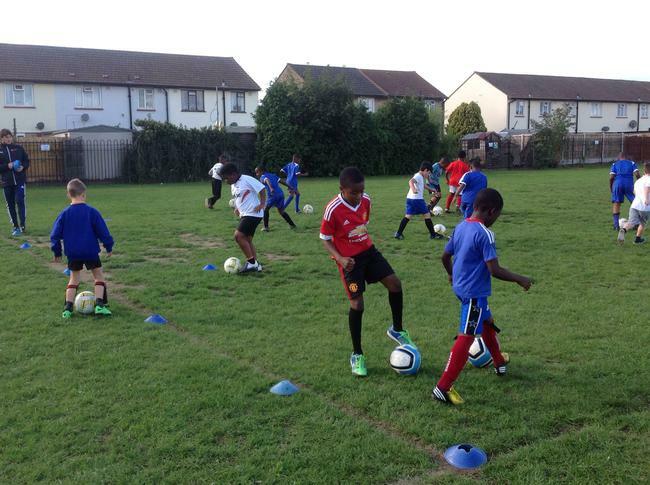 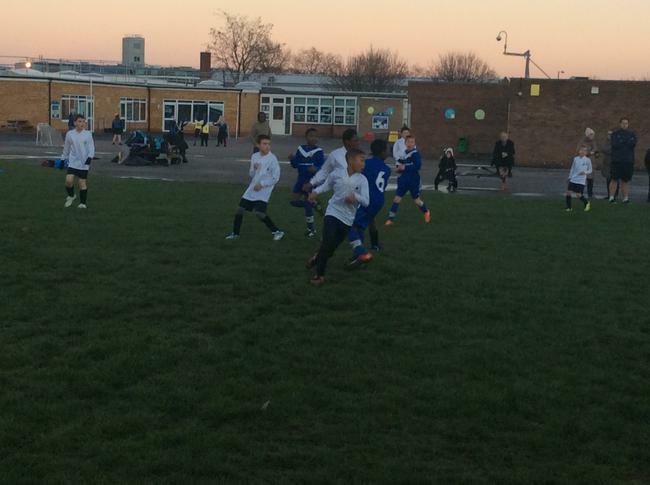 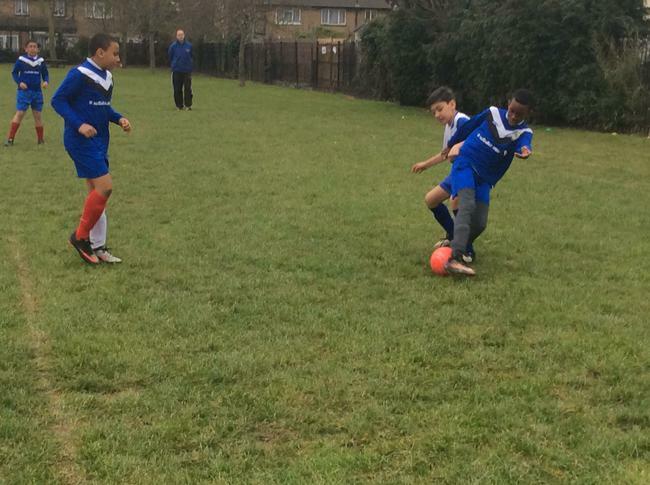 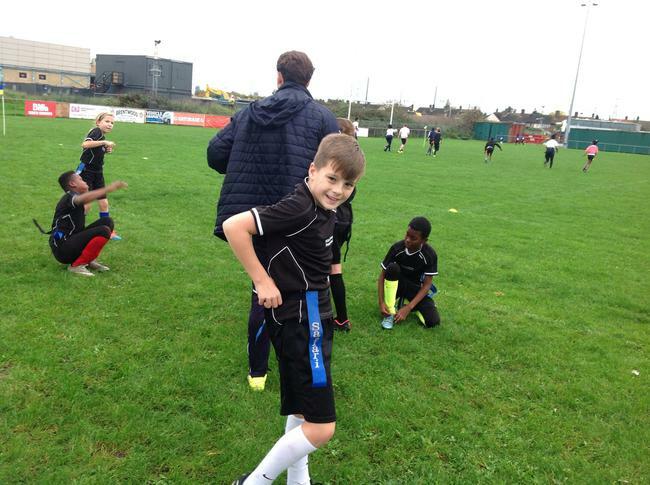 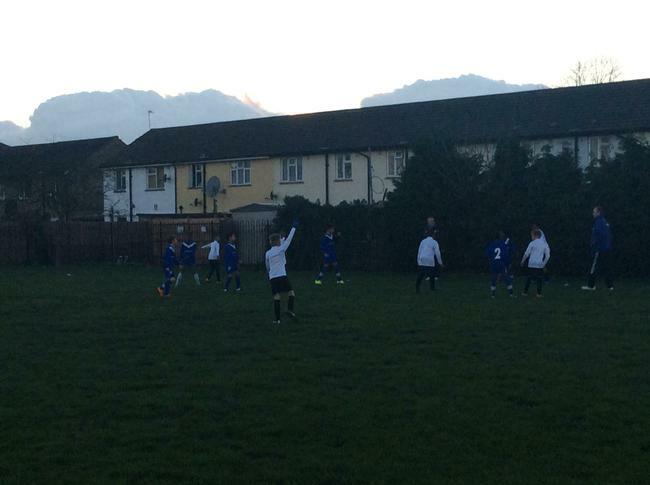 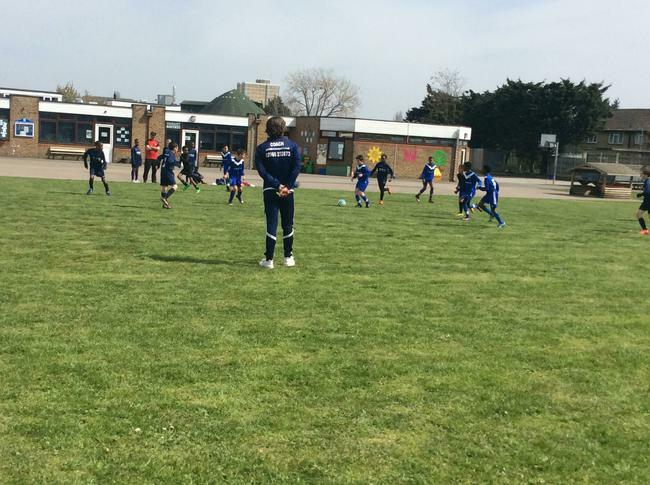 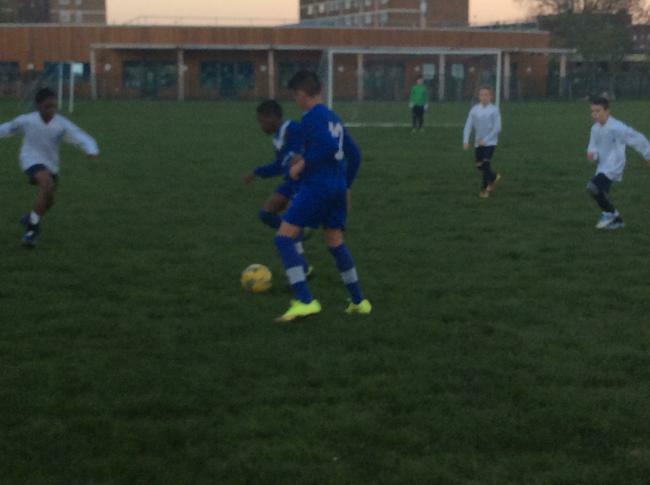 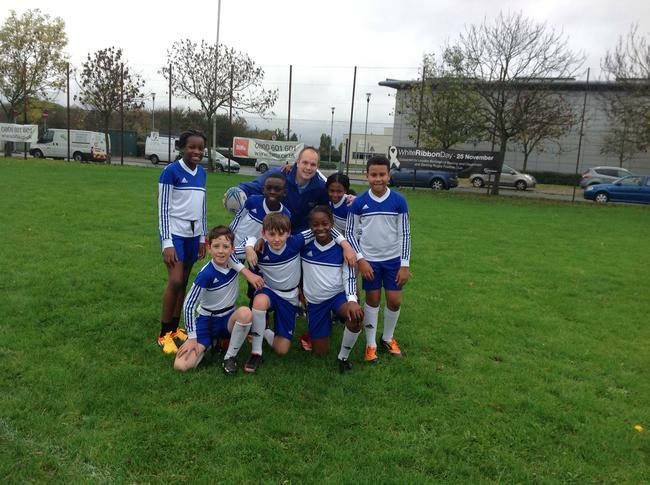 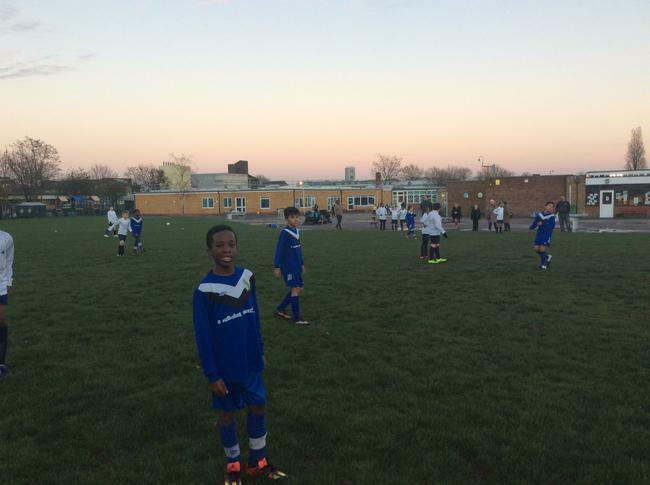 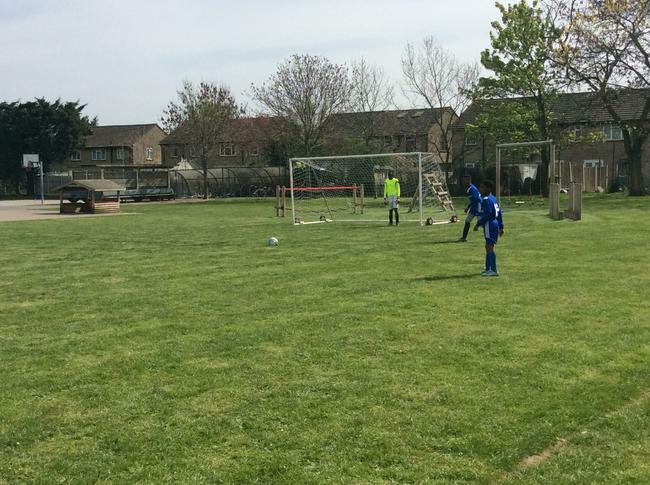 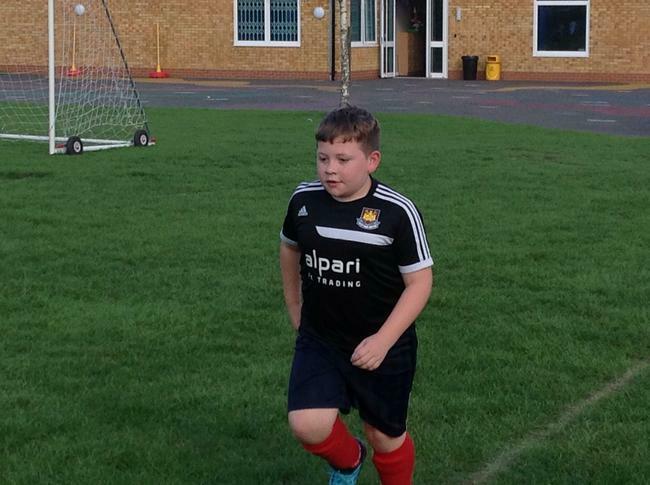 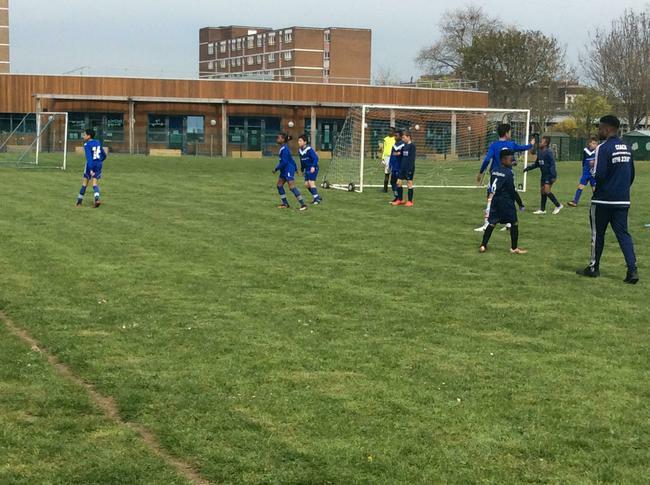 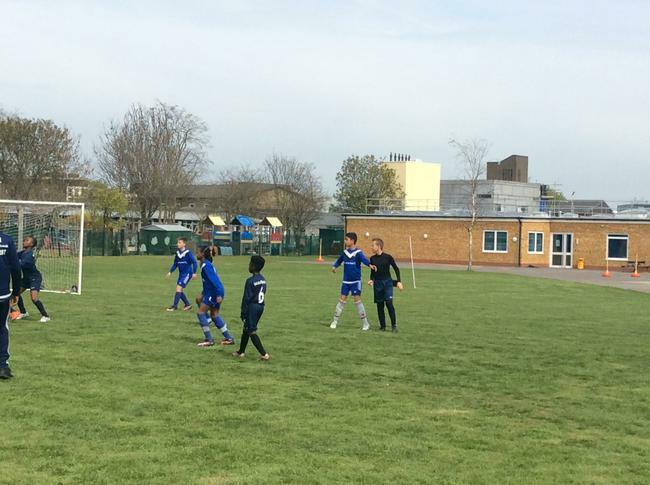 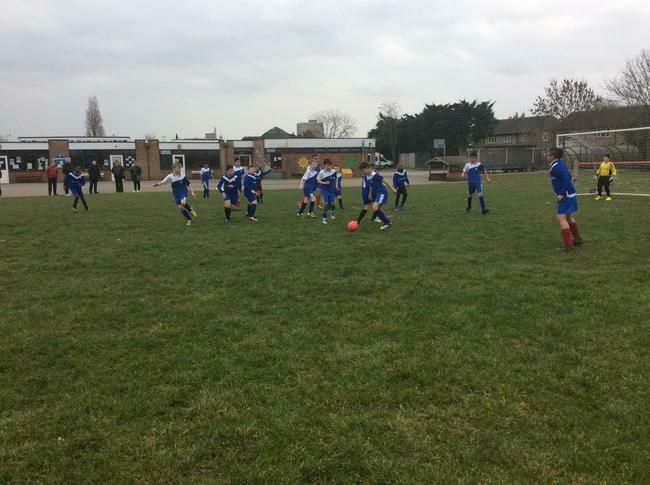 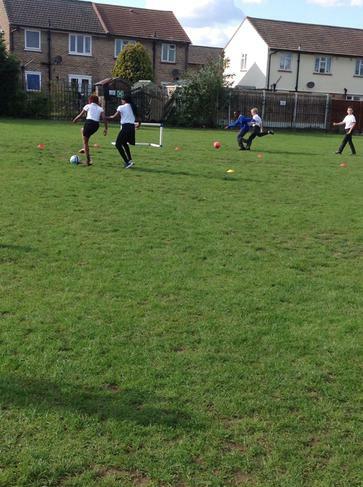 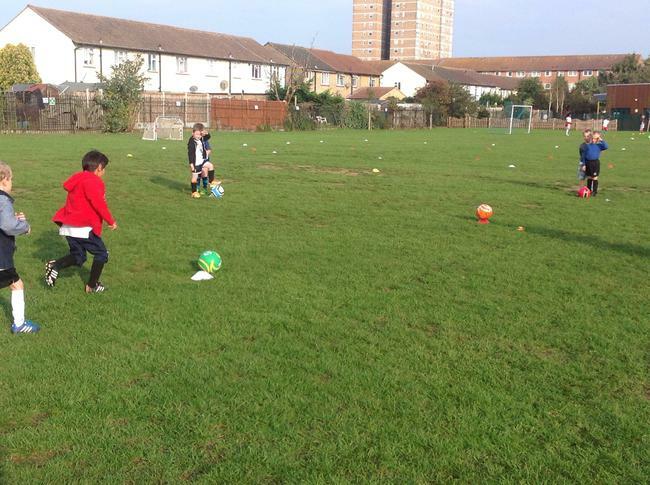 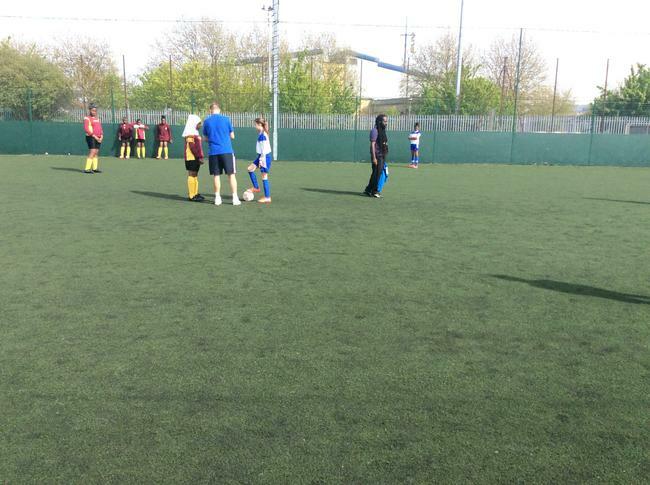 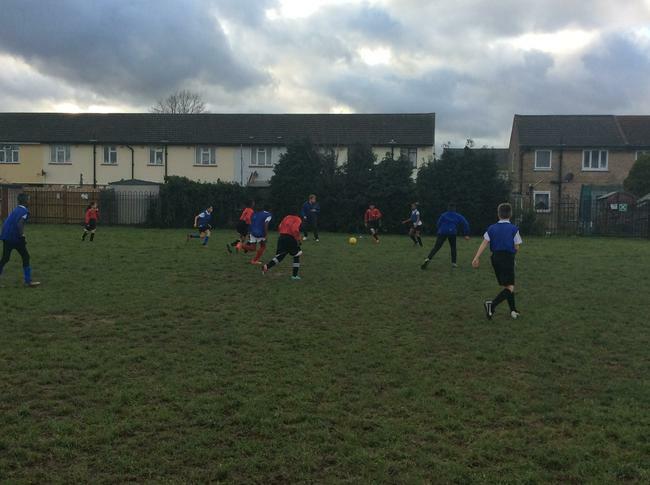 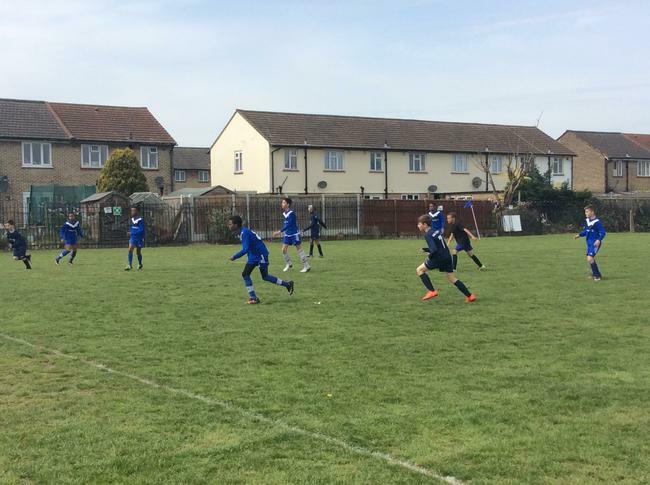 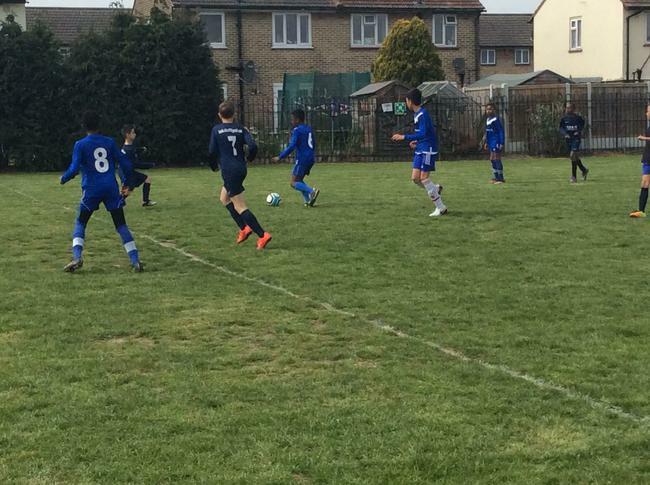 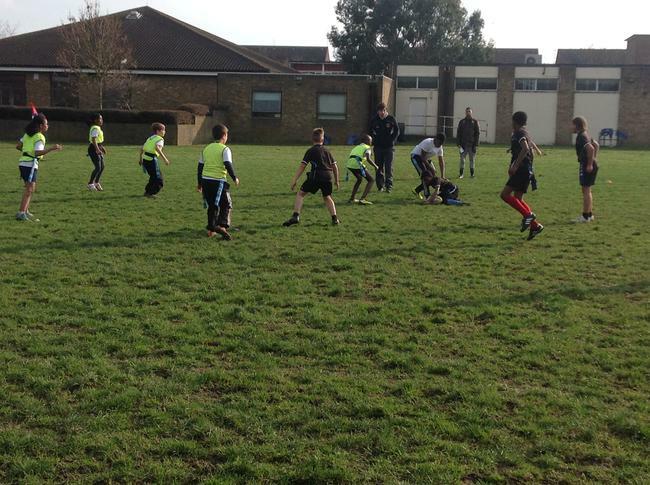 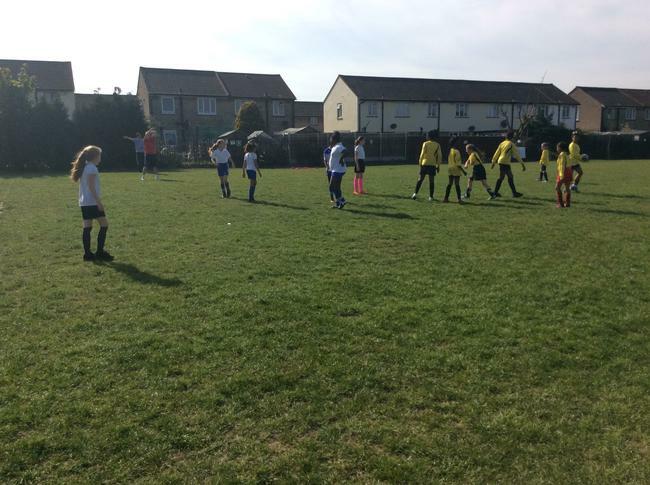 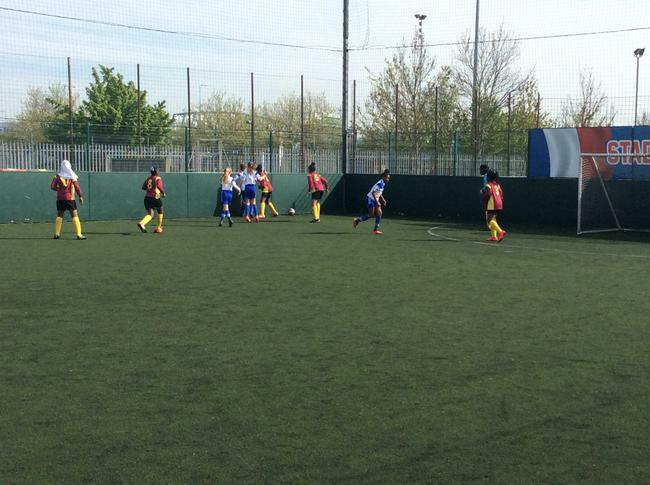 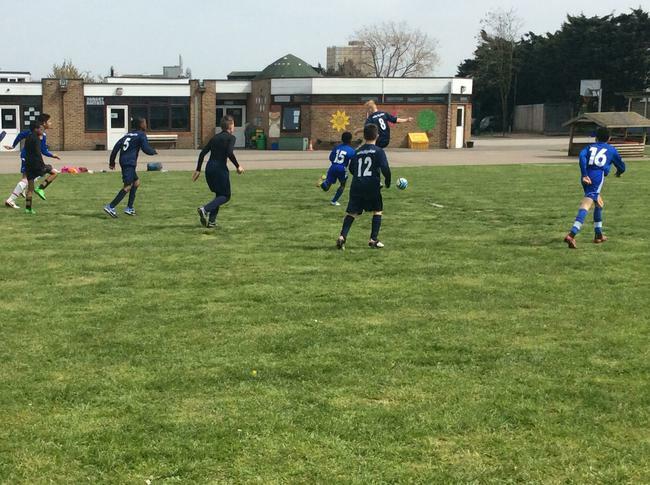 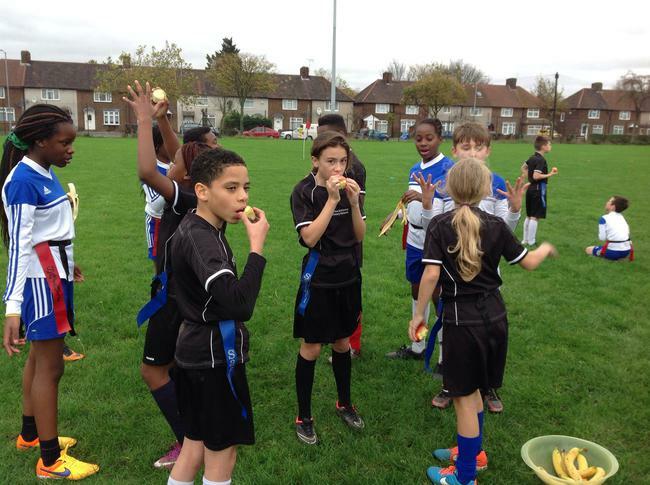 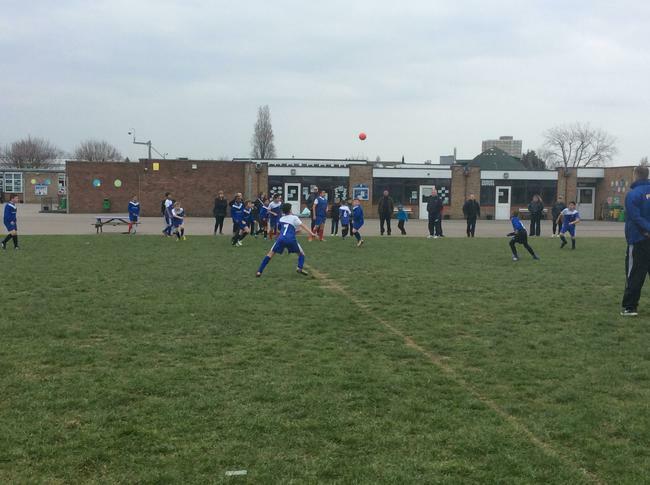 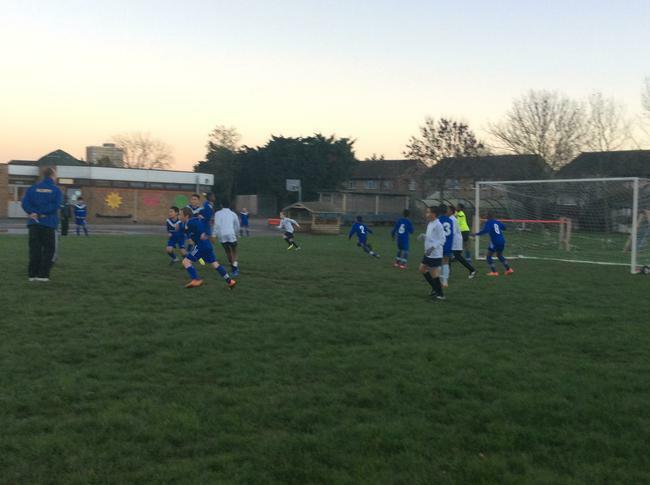 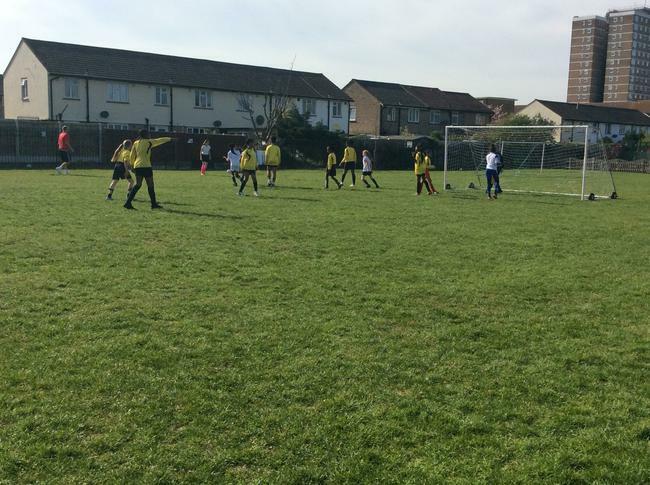 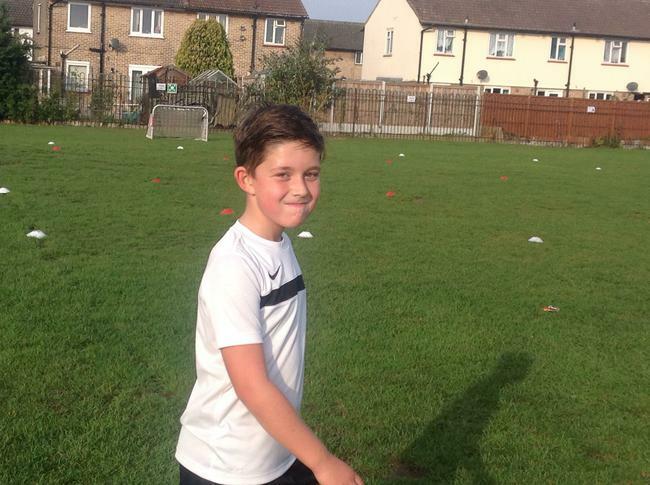 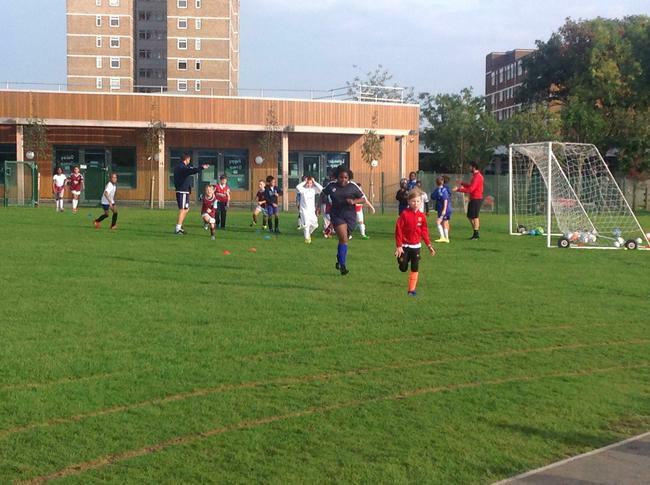 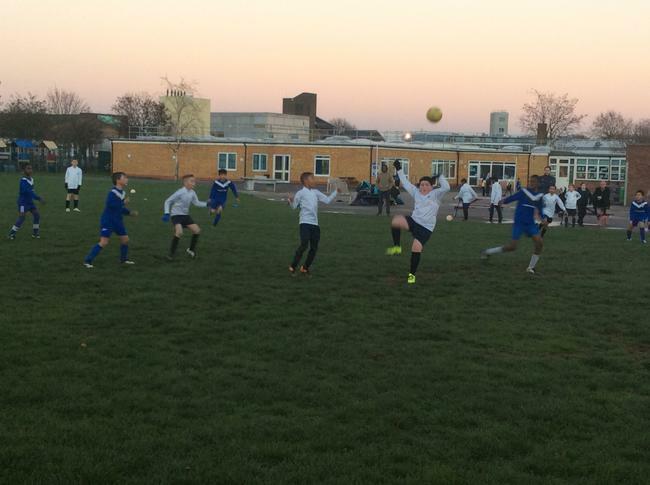 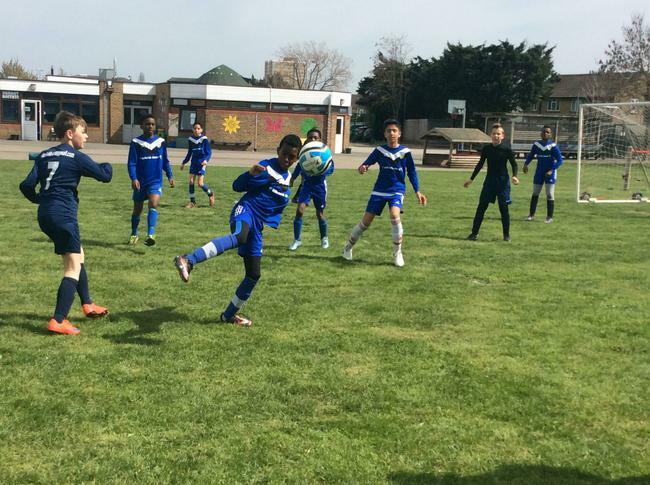 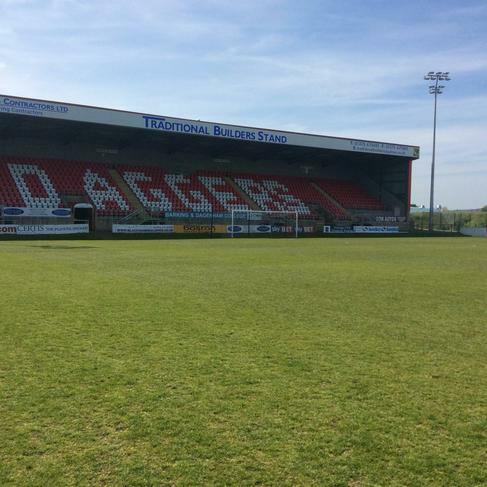 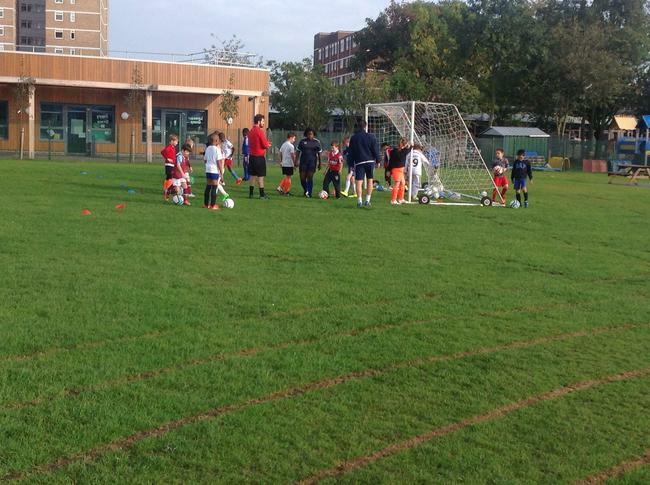 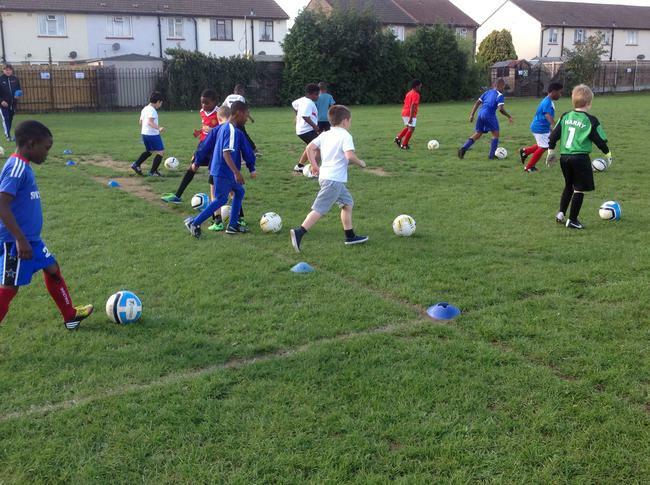 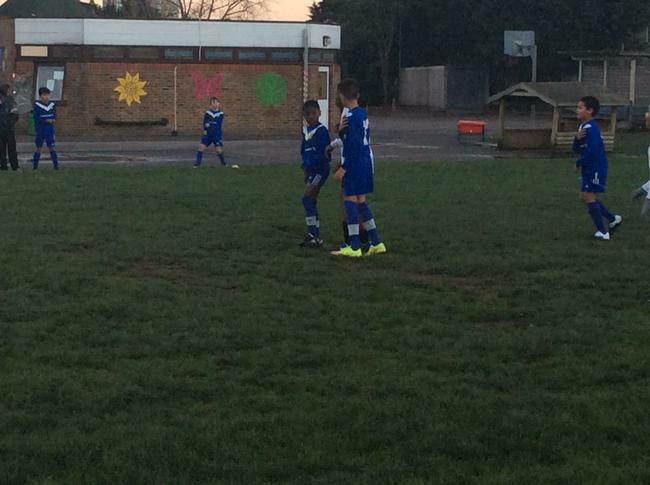 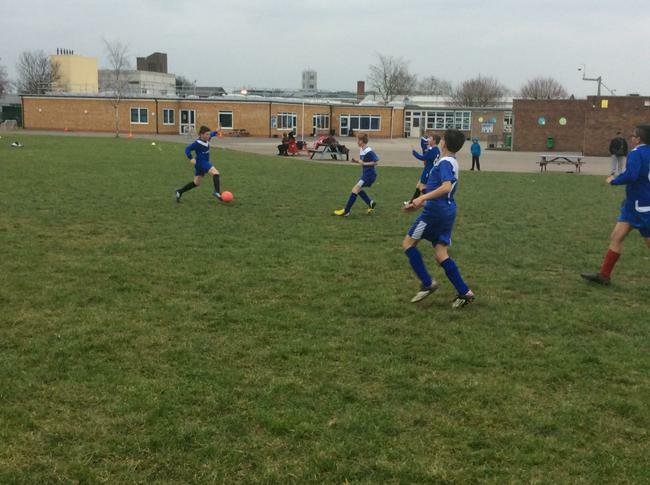 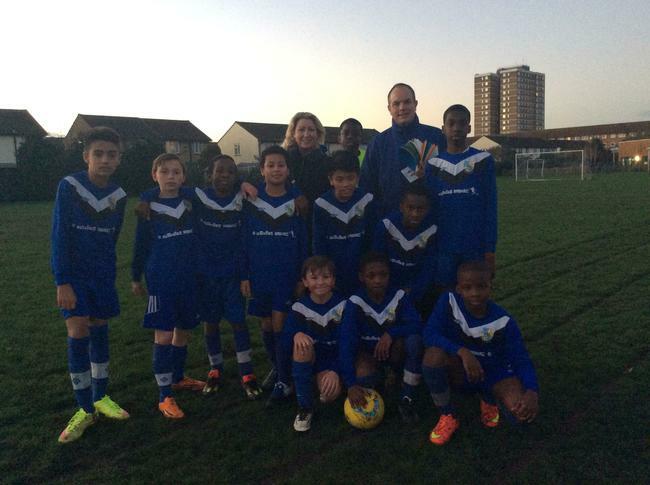 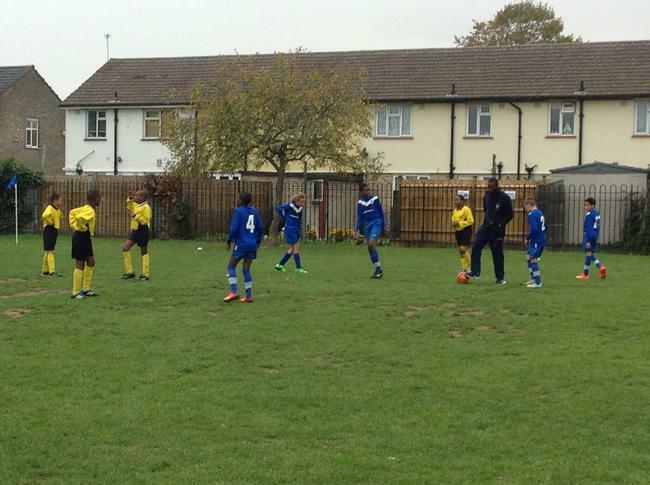 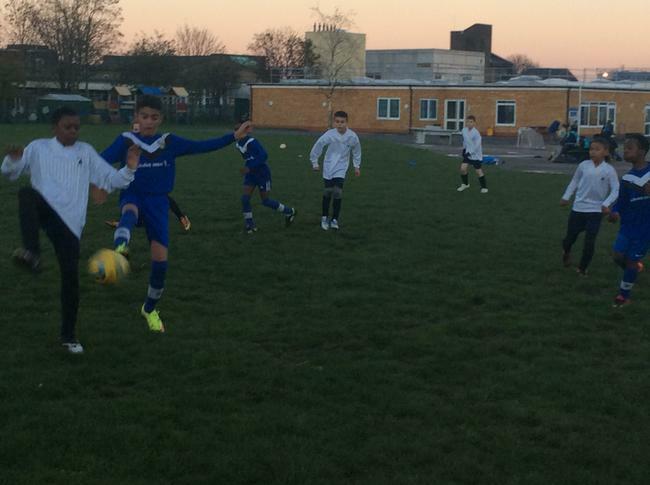 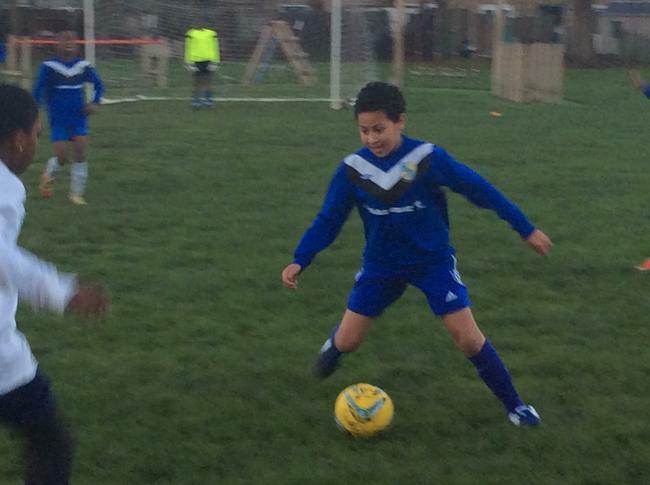 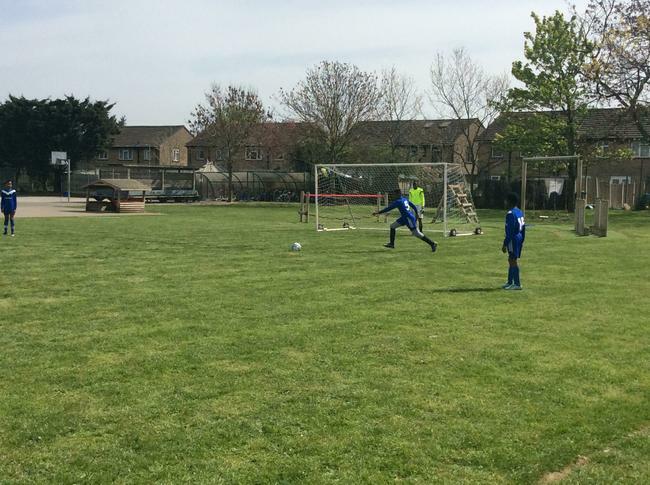 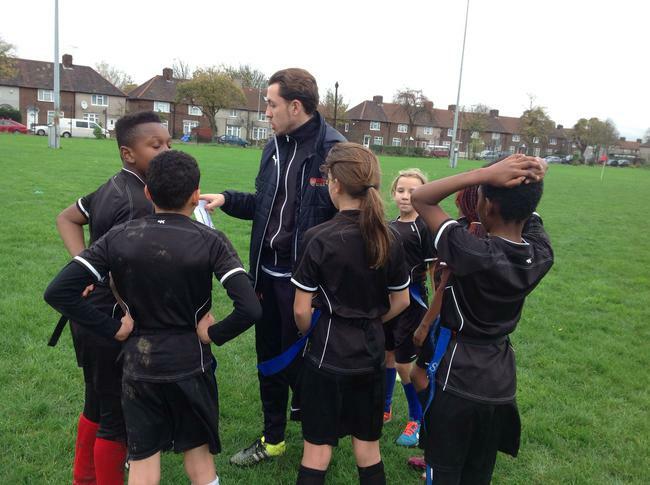 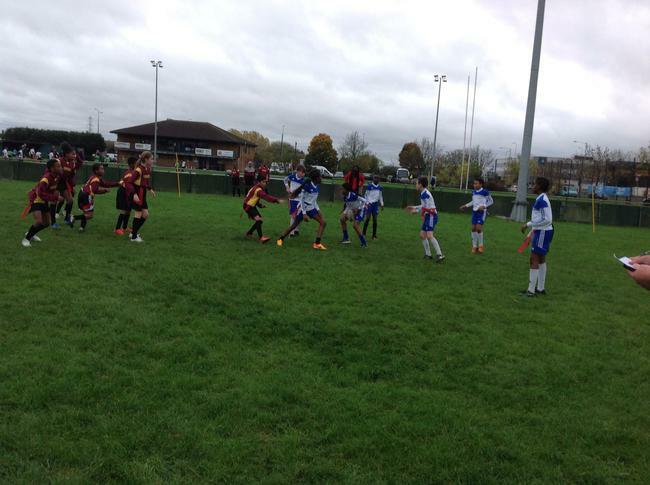 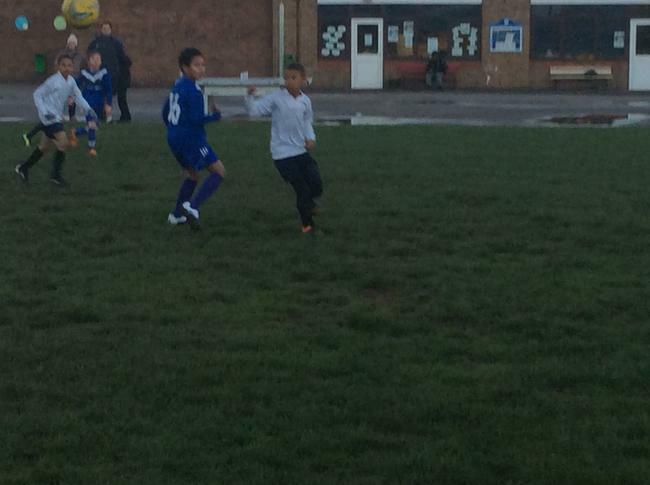 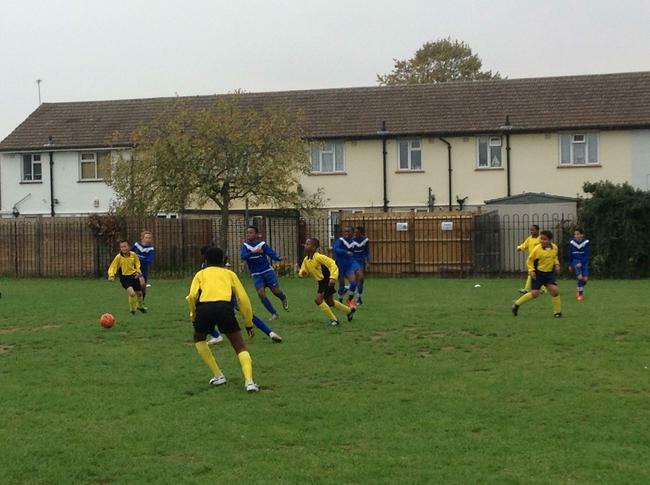 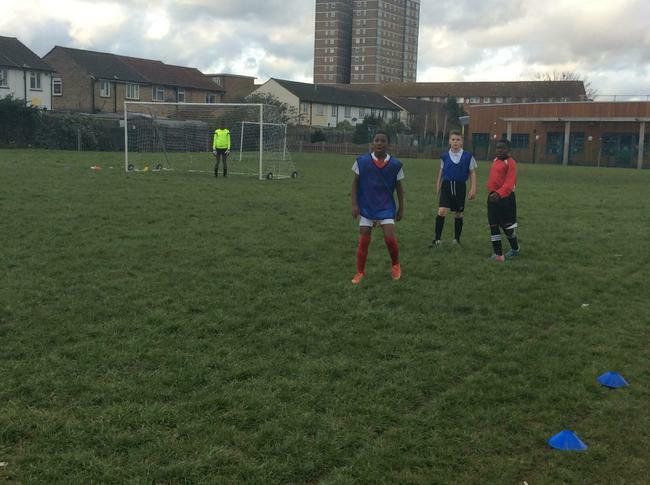 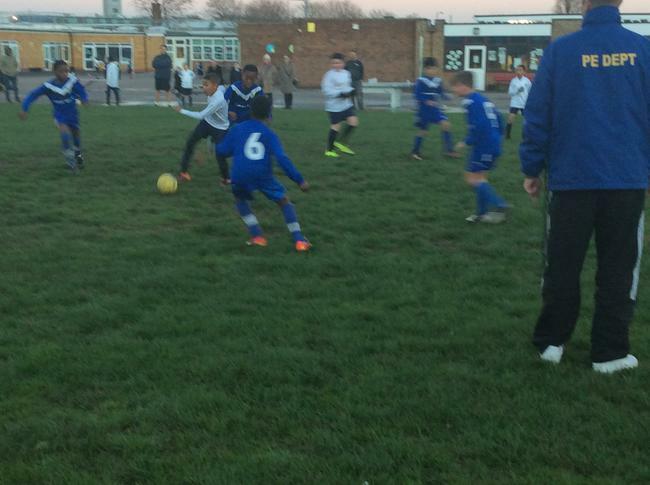 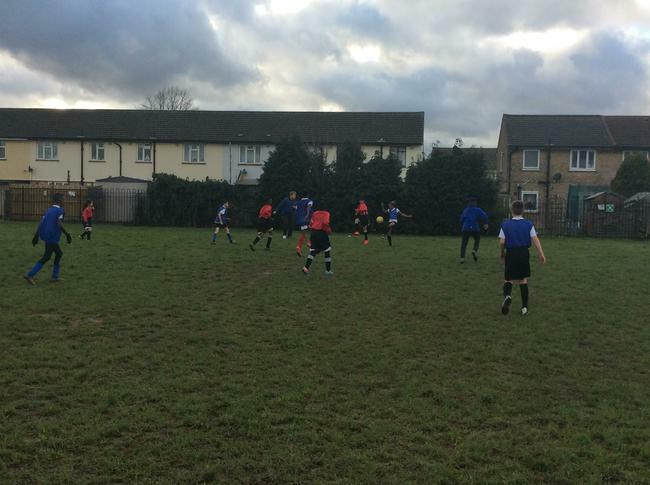 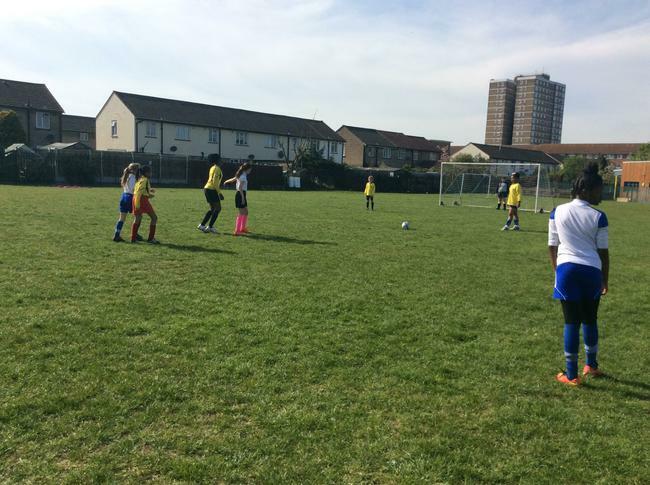 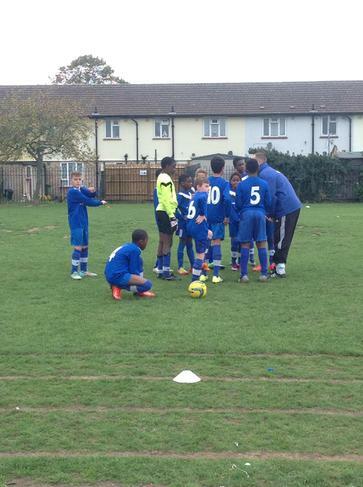 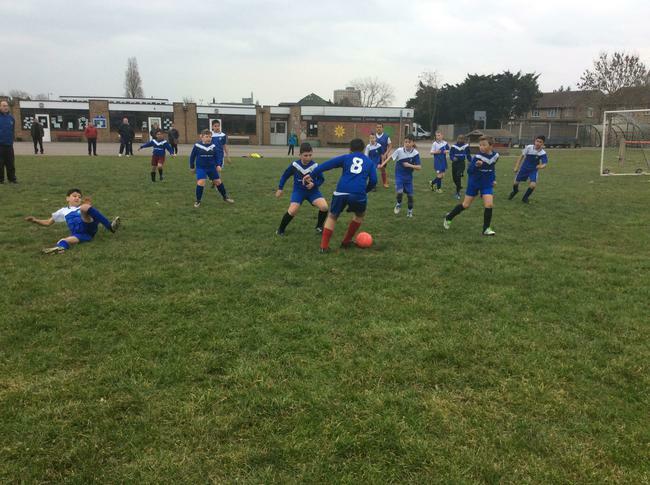 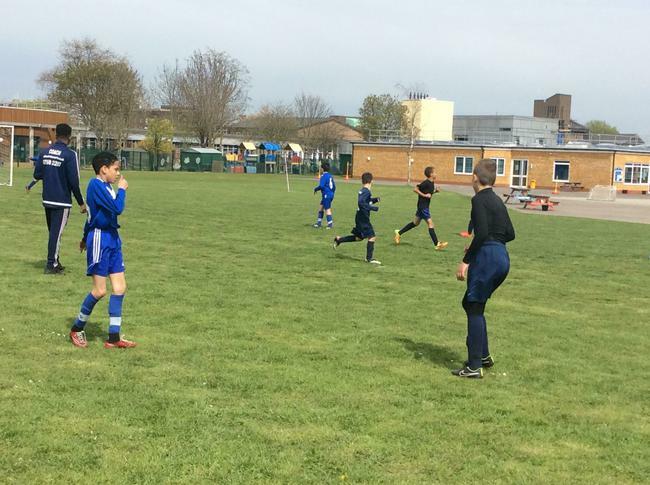 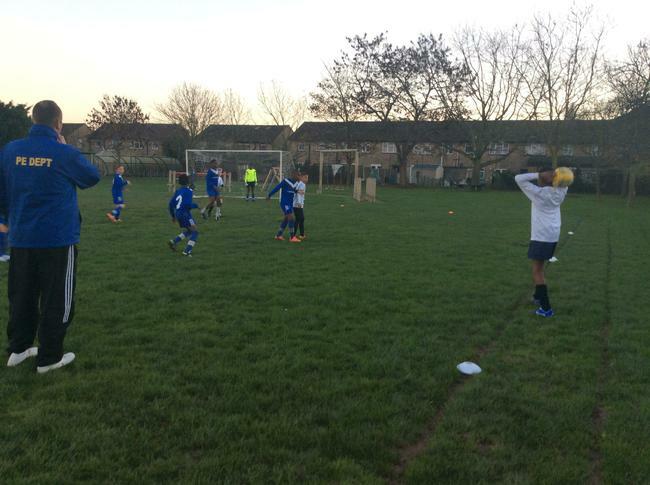 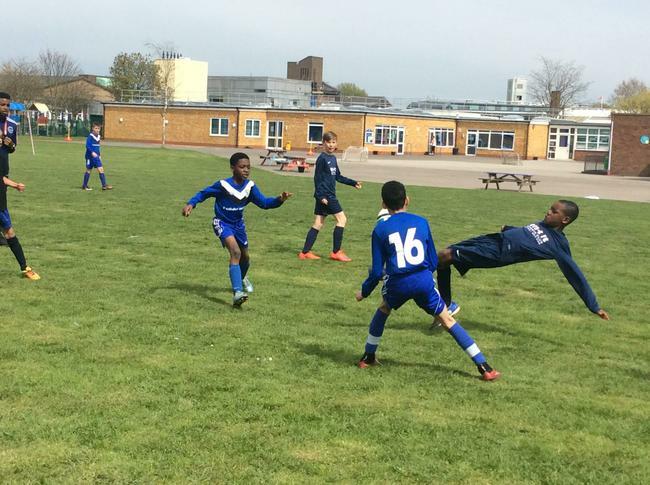 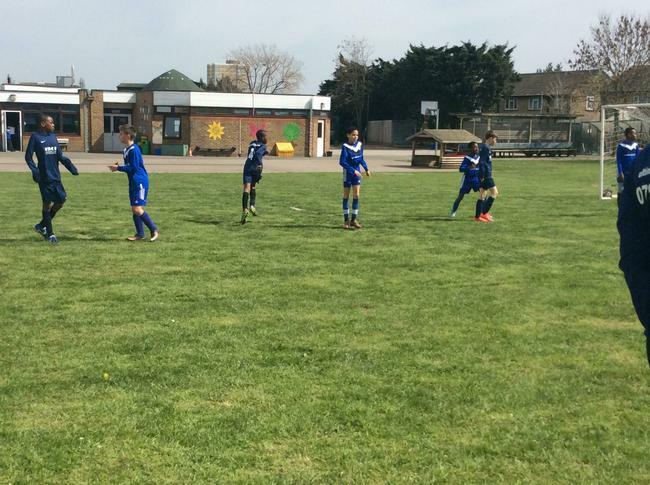 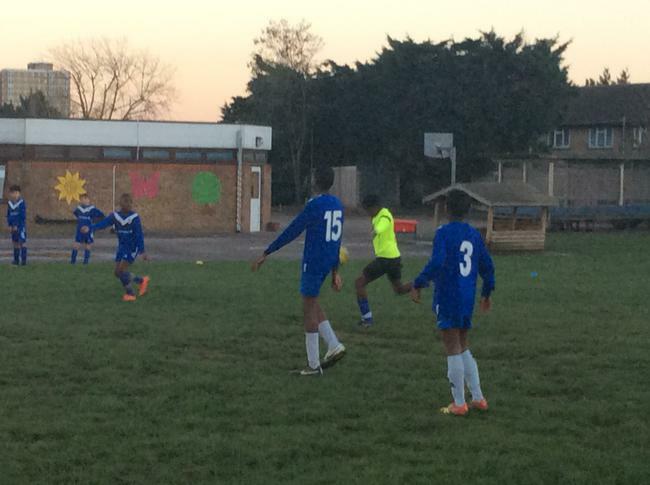 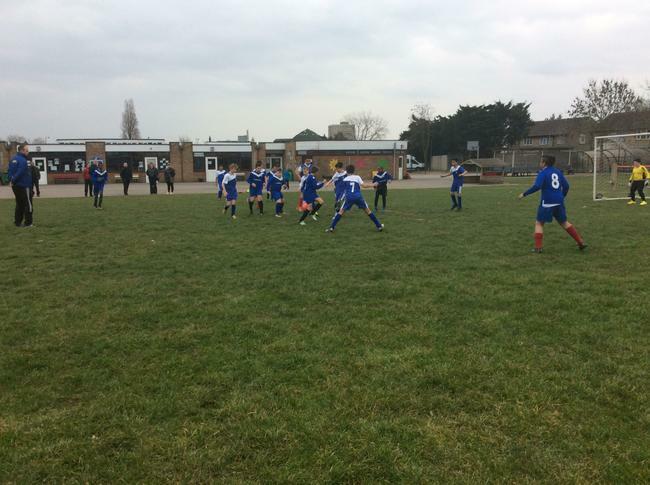 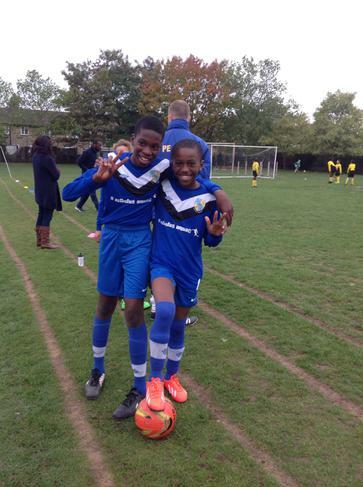 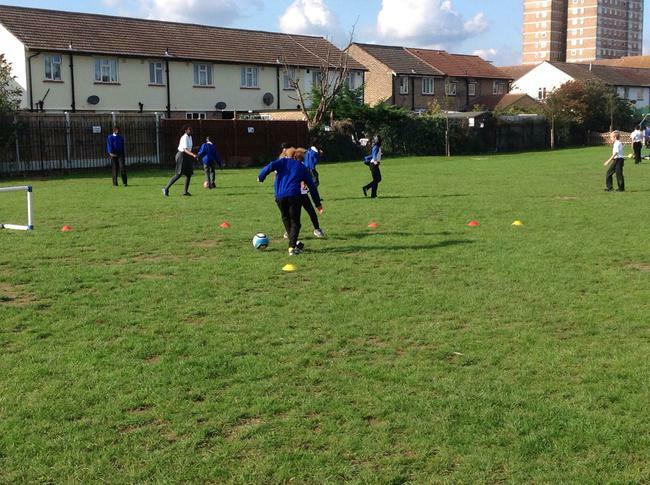 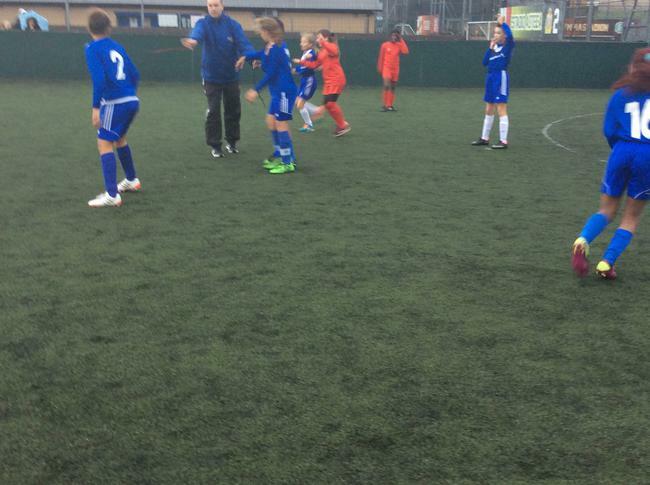 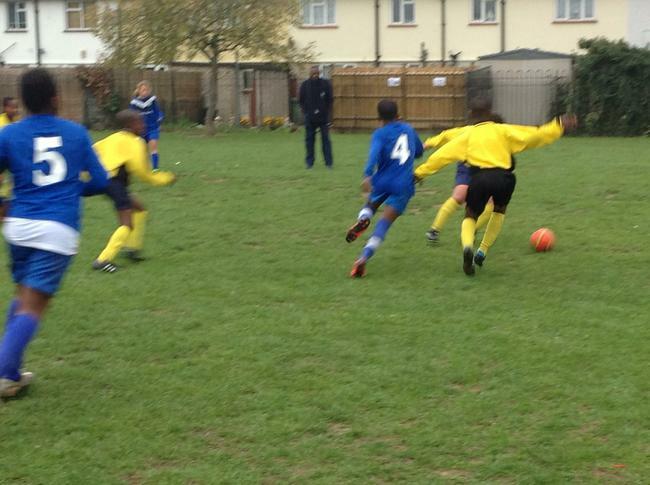 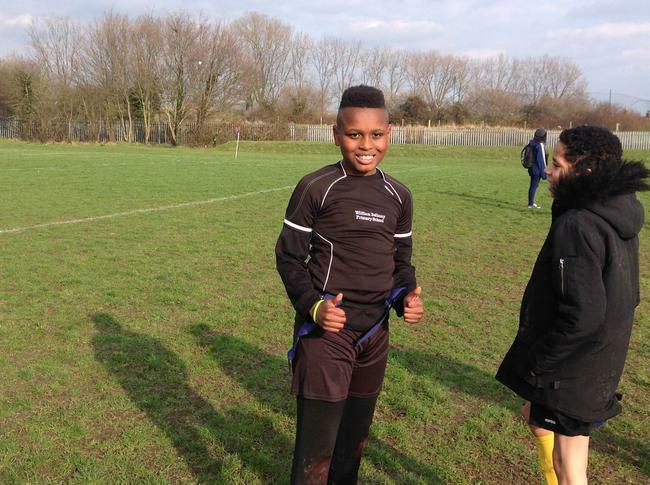 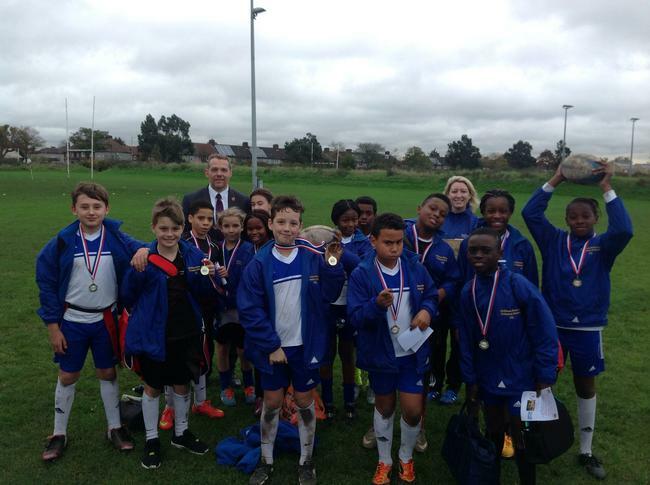 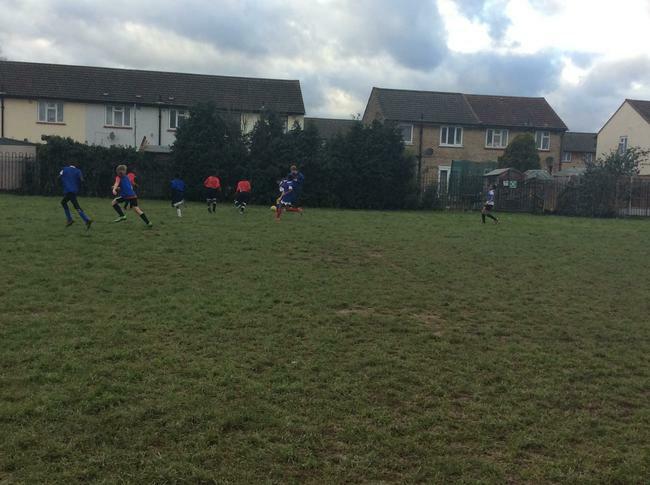 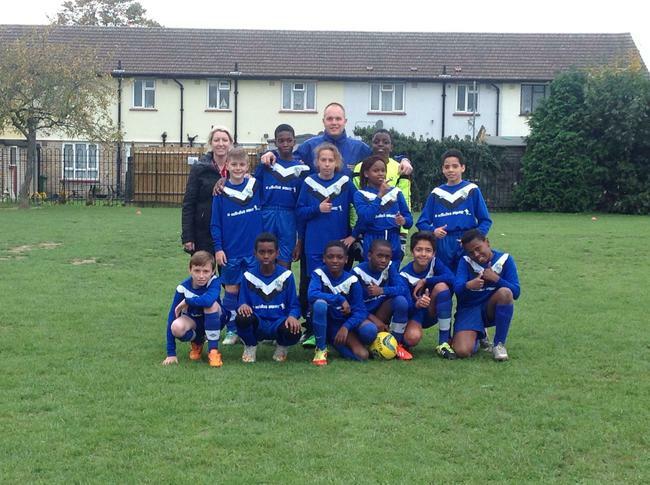 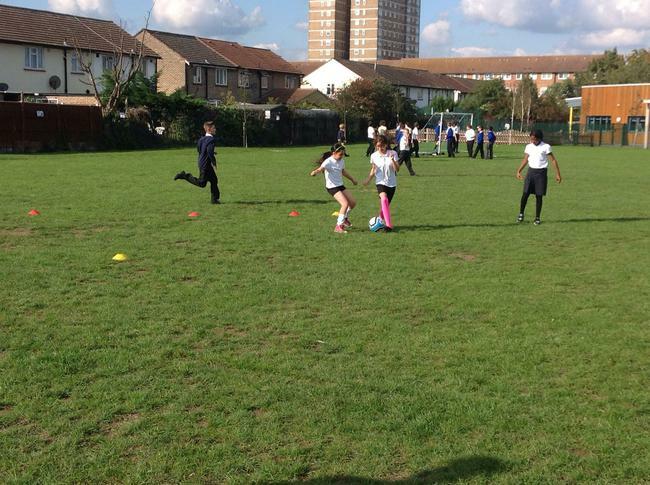 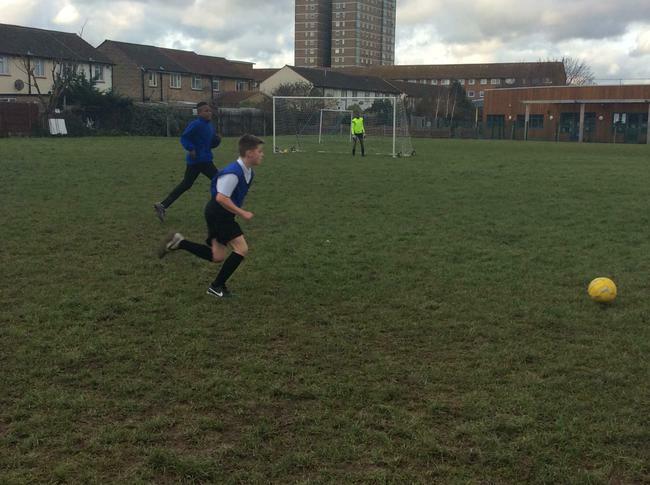 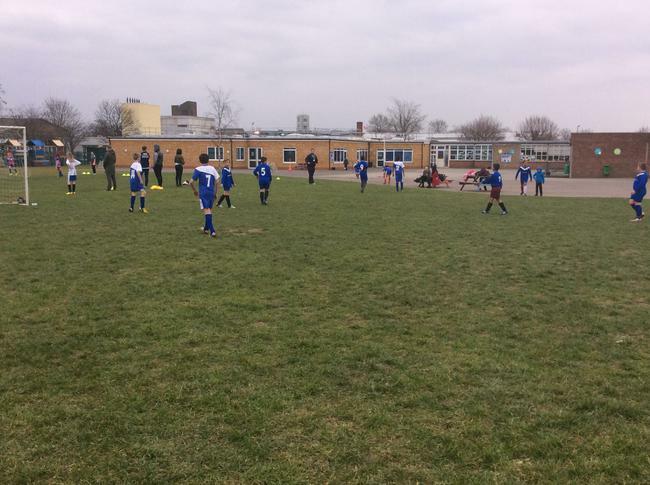 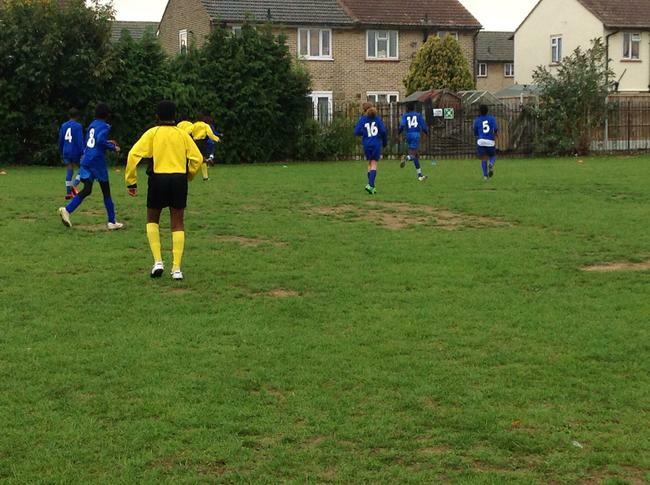 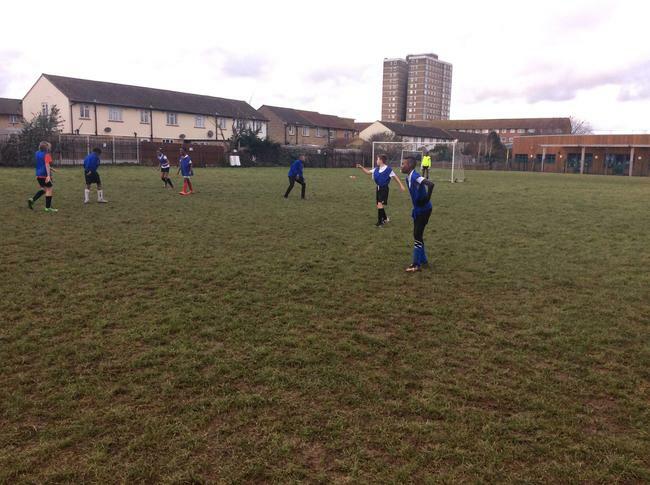 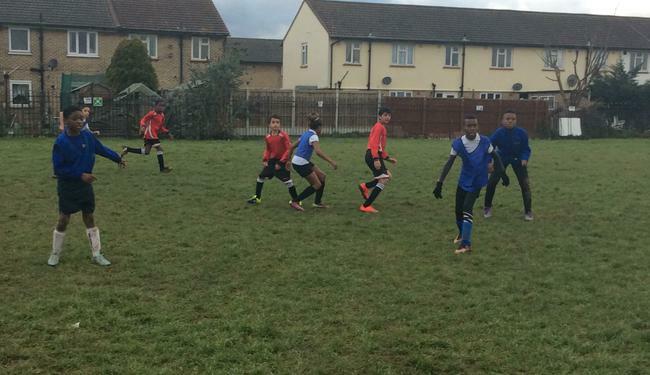 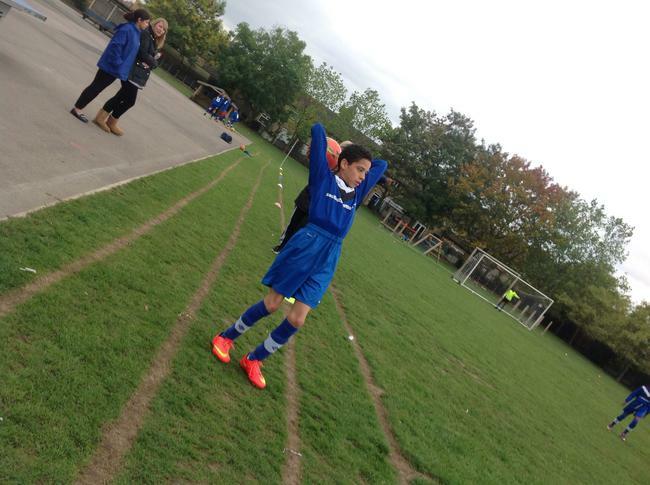 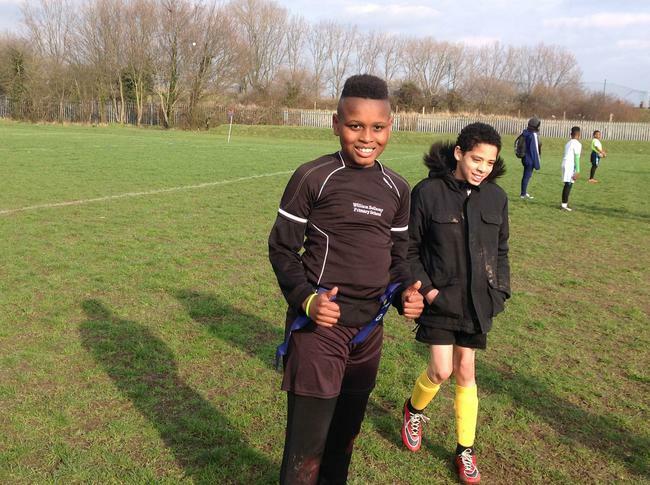 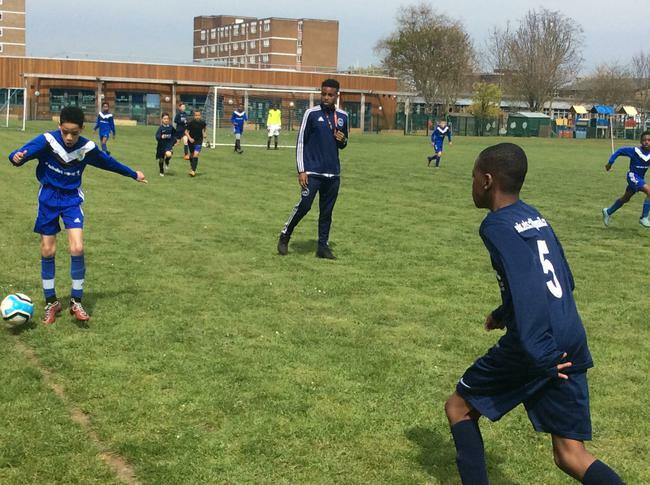 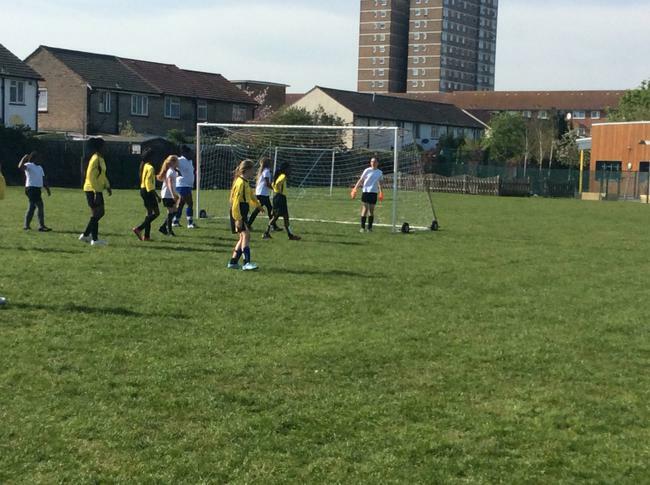 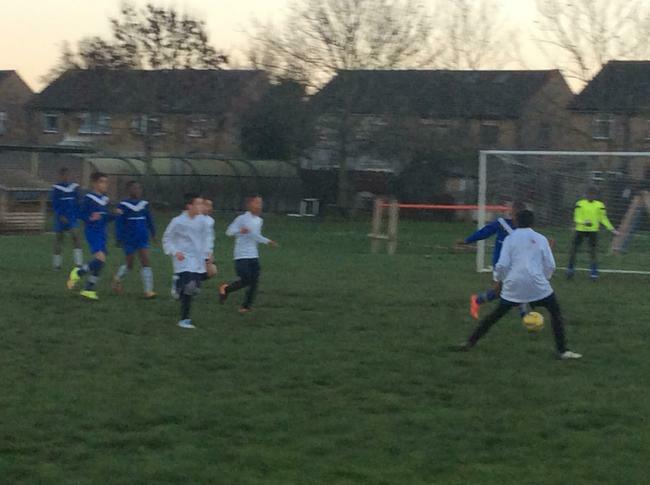 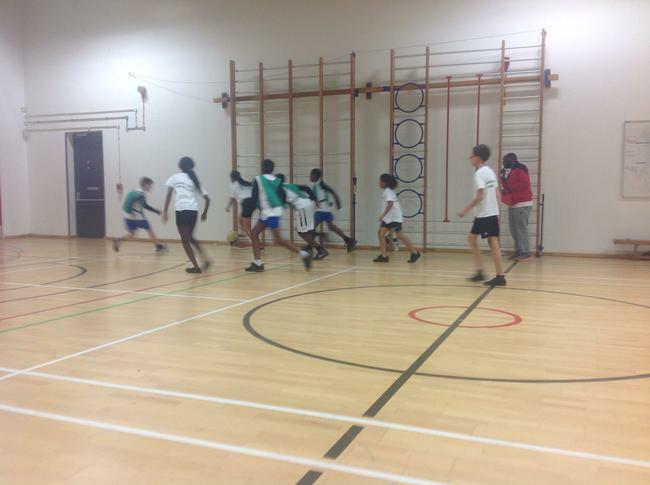 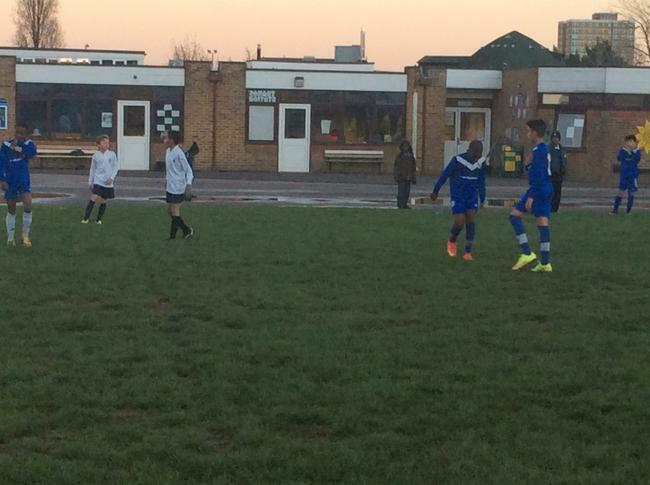 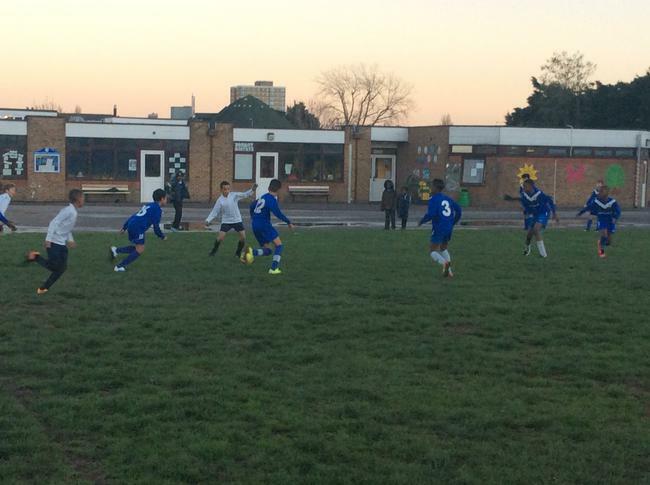 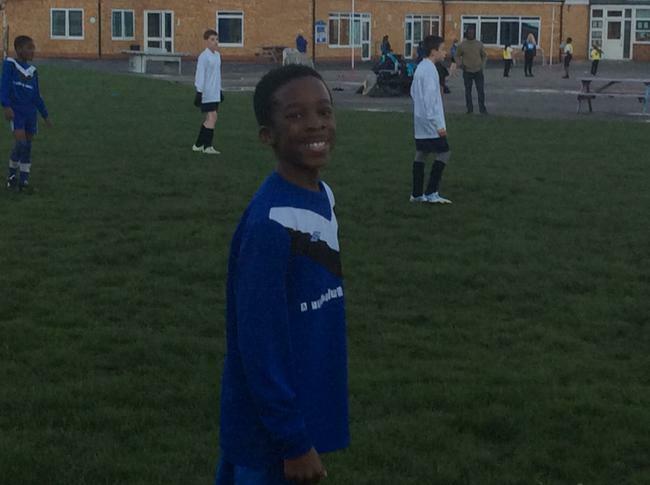 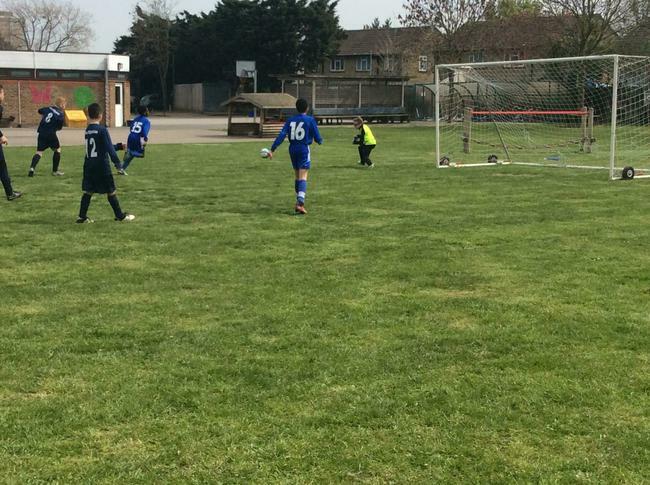 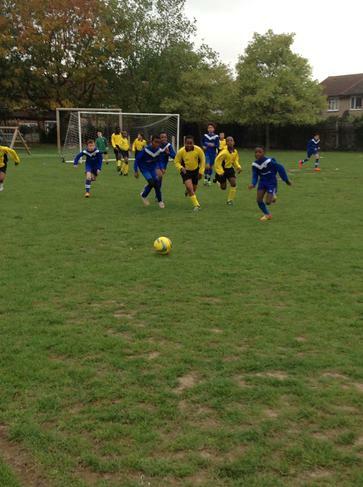 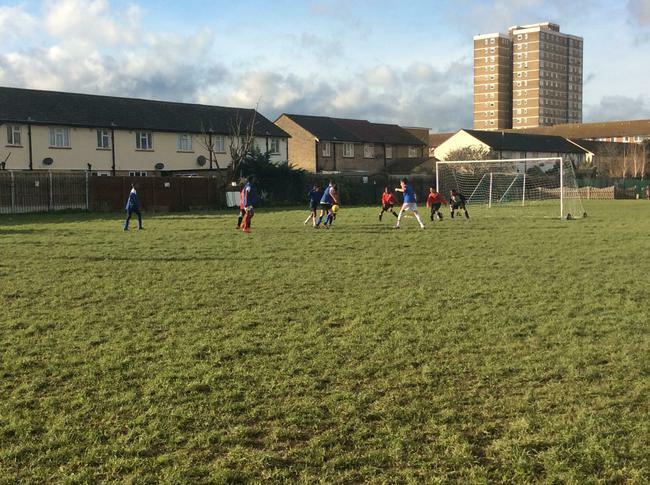 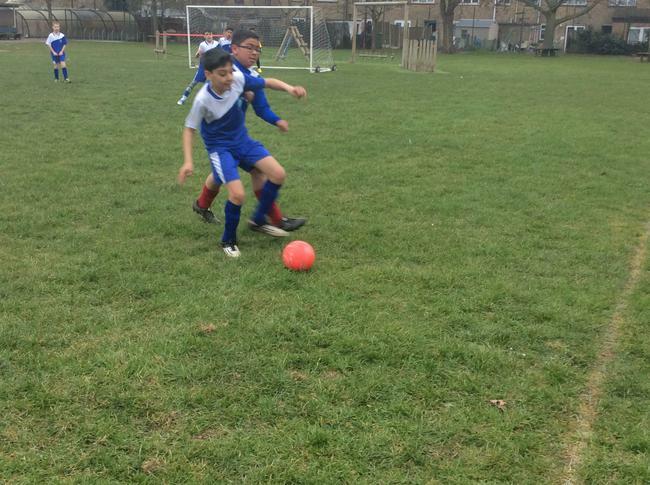 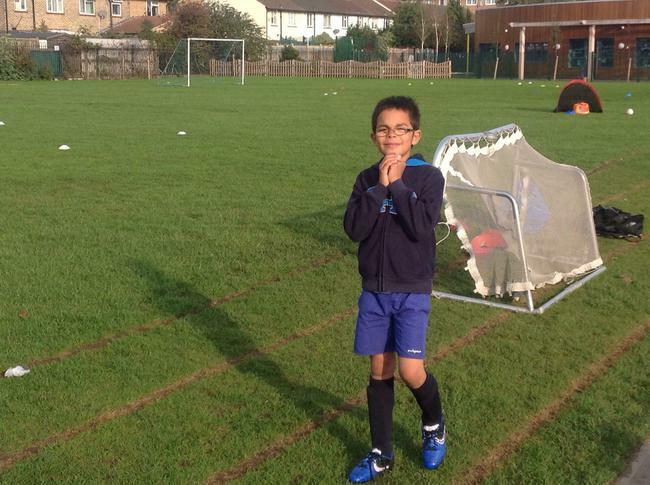 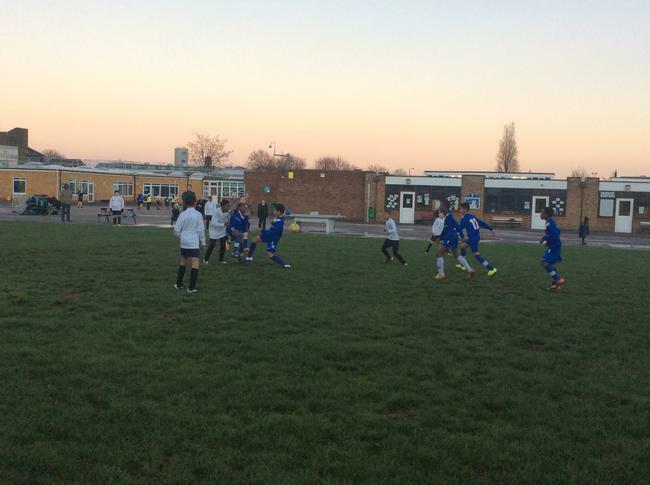 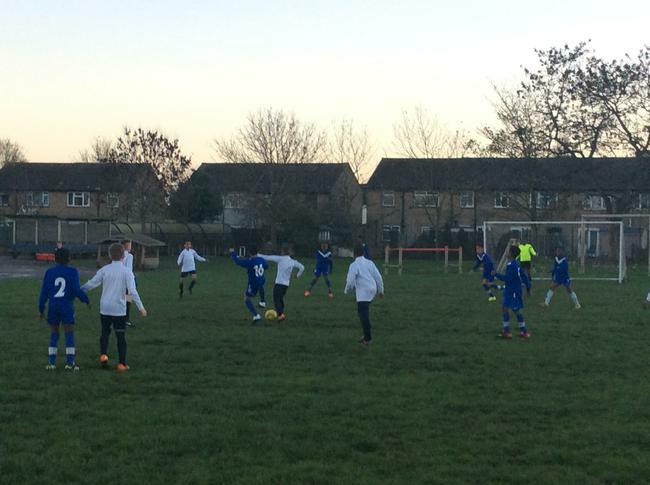 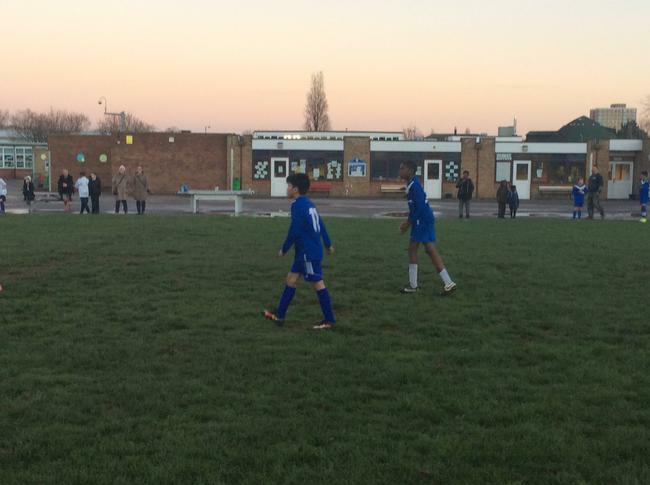 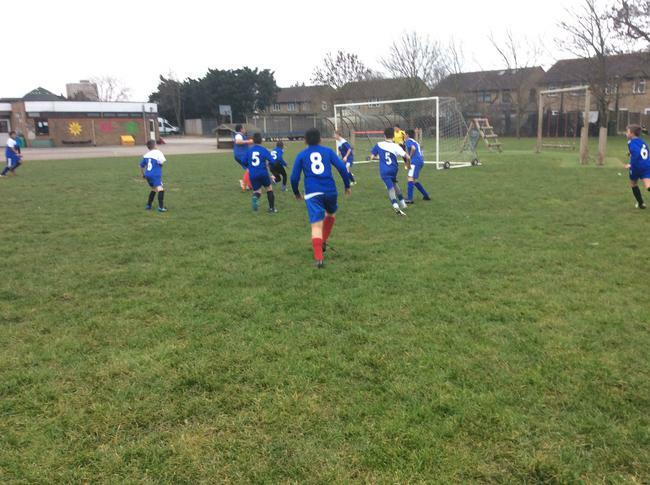 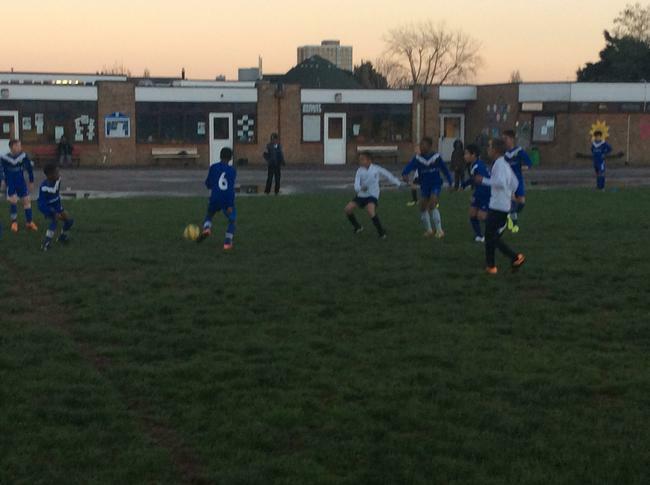 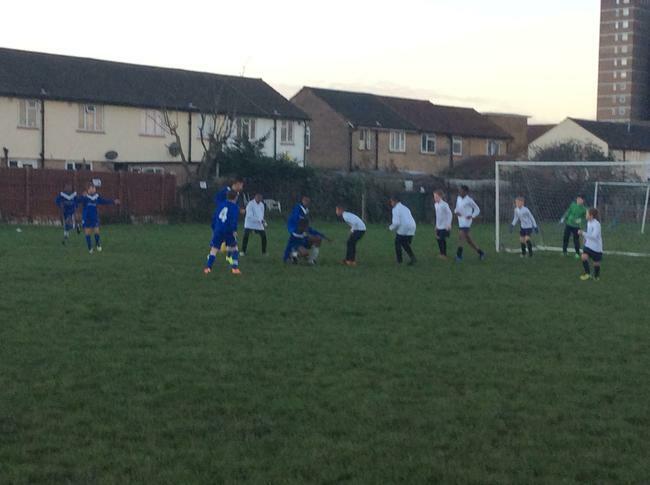 Well done to the year 6 boys who were sent to the Barking and Dagenham schools' district football trials. 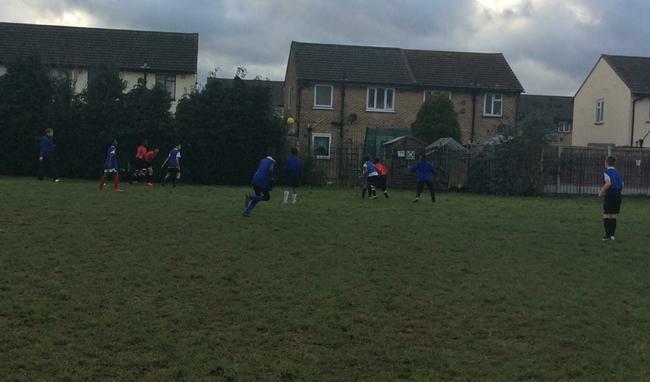 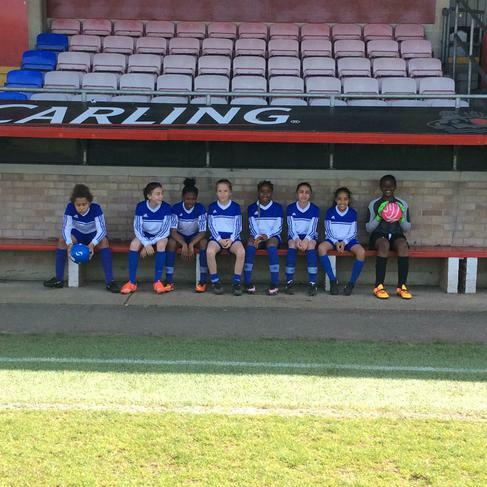 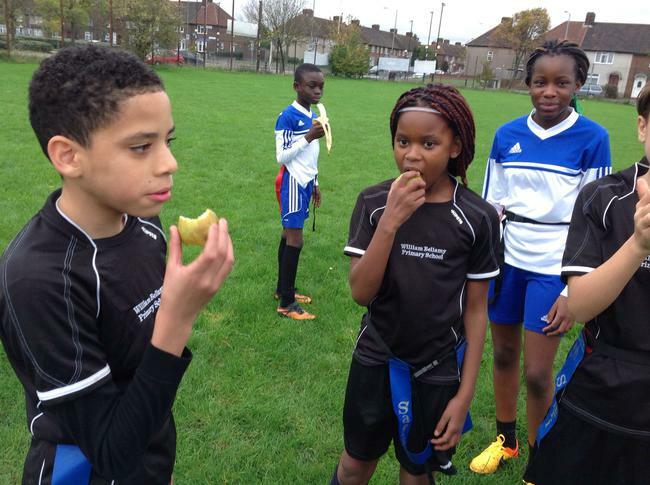 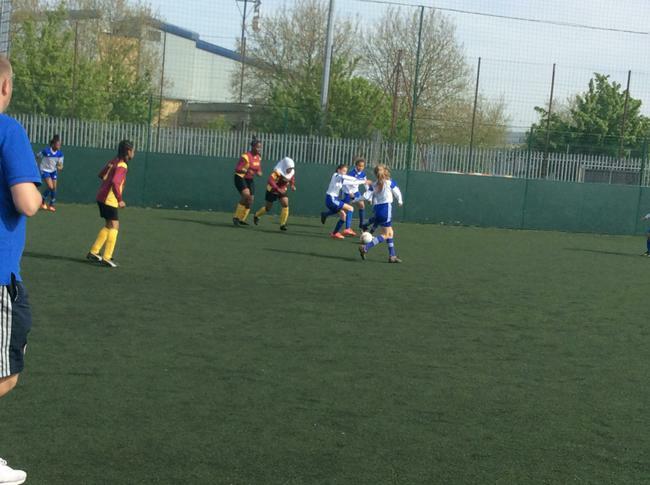 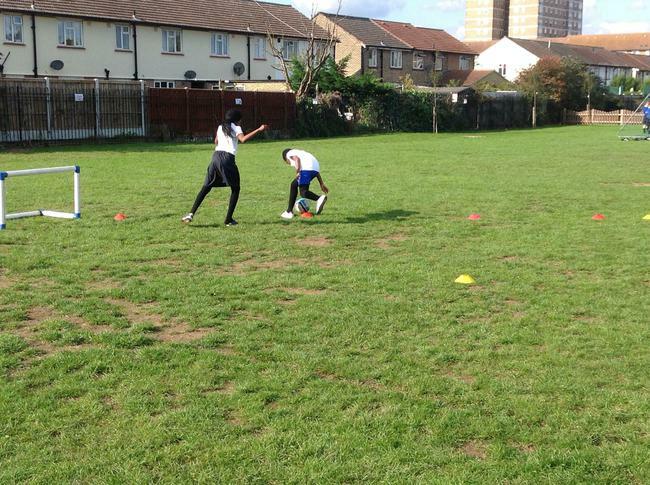 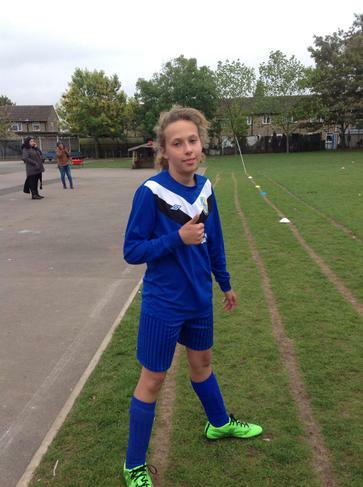 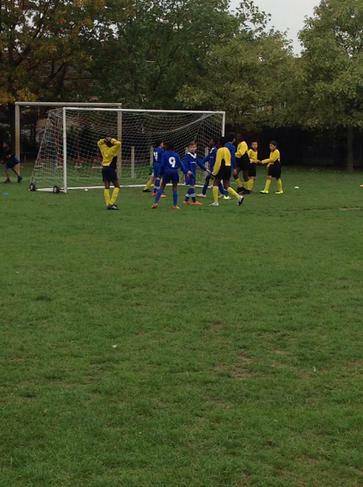 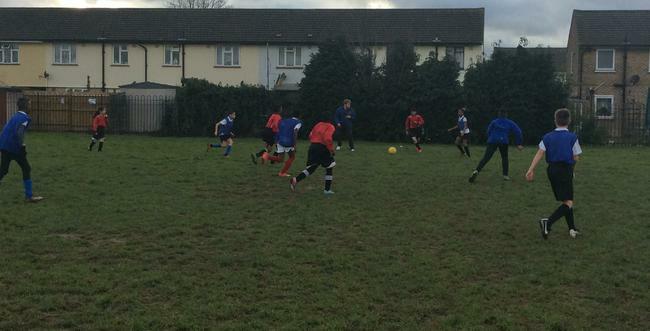 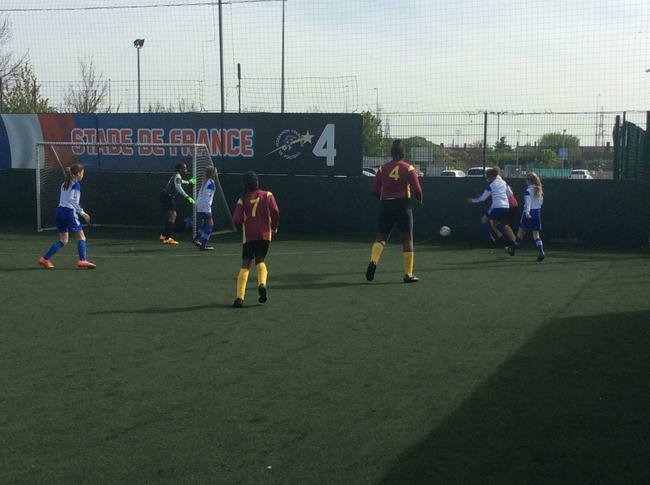 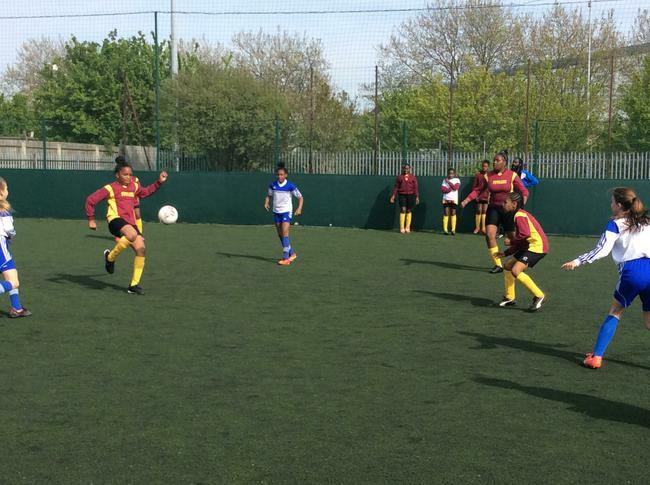 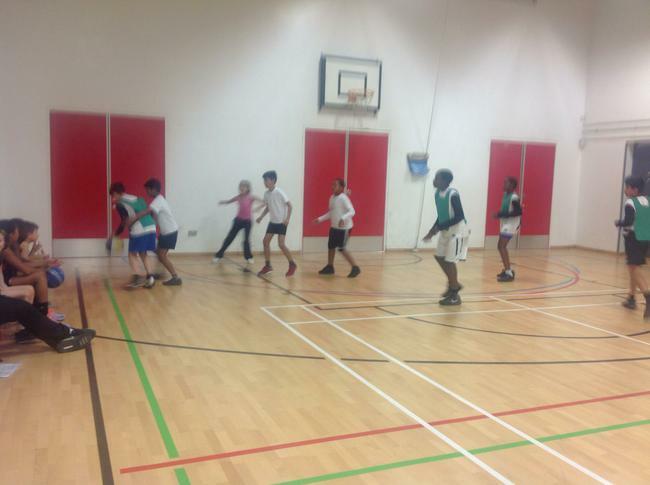 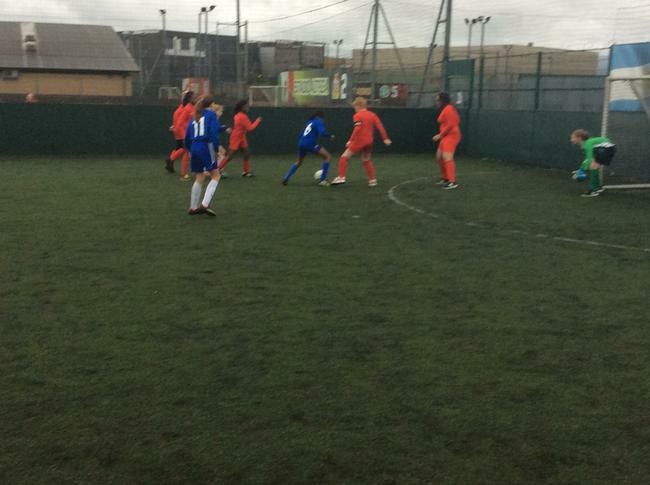 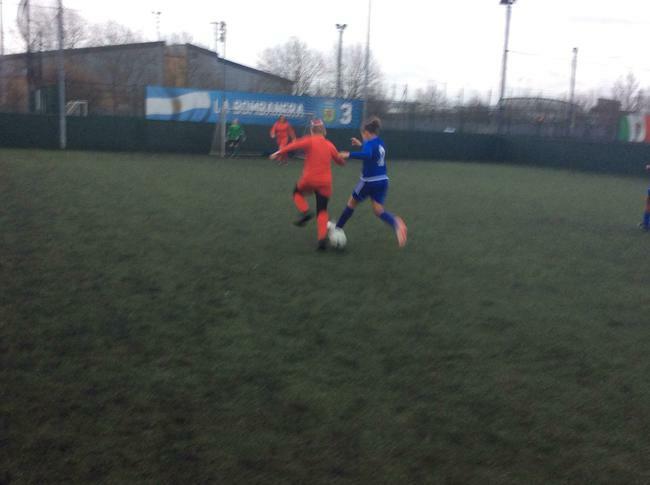 Sion, Sid, Nehemi, Joshea and Kye were all selected to attend the borough's district football trials. 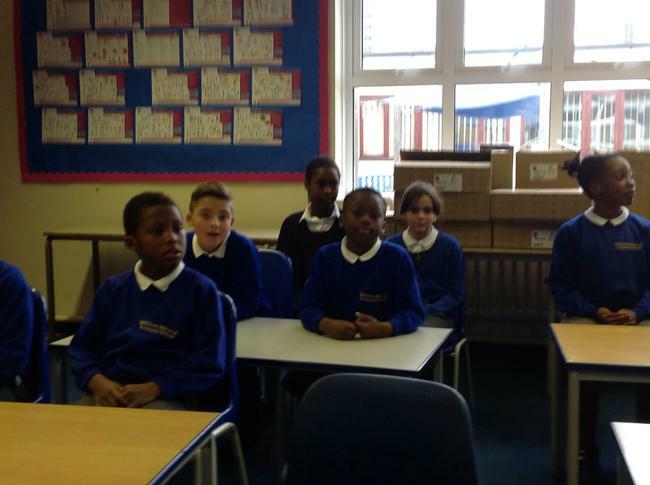 All boys were very well behaved and respectful. 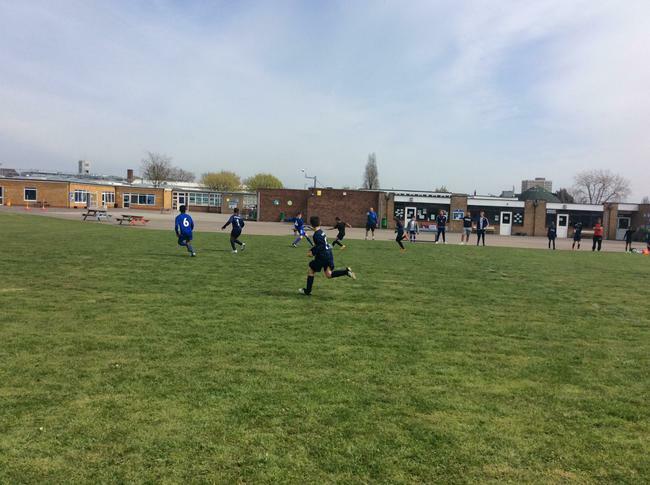 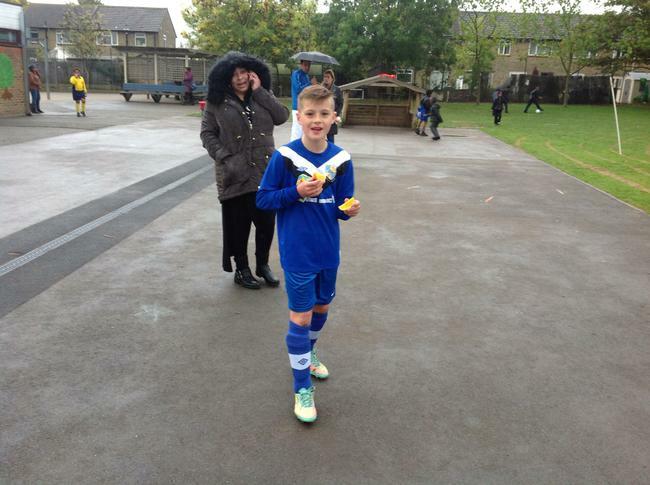 The football was at a very high standard and all the boys played very well. 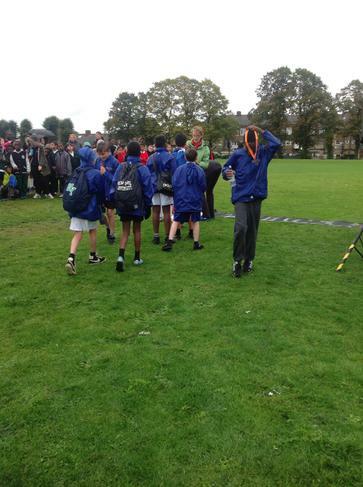 Unfortunately, only 3 of the boys went through to the second trail. 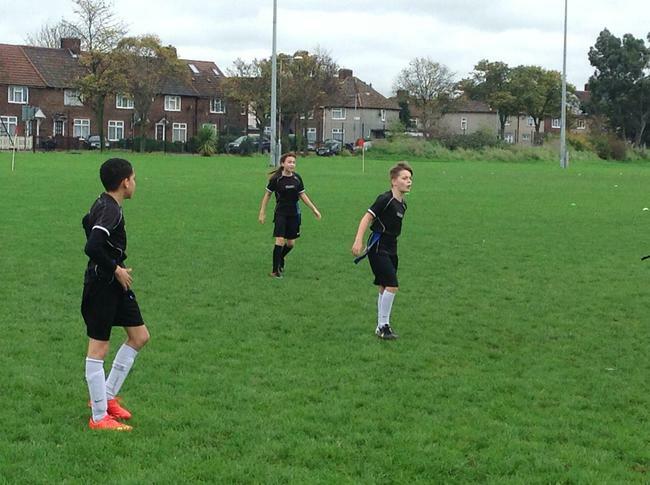 Again, all boys worked very hard and played well. 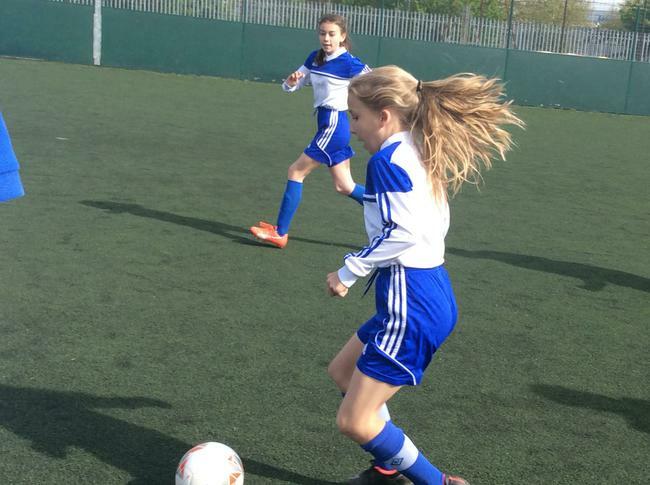 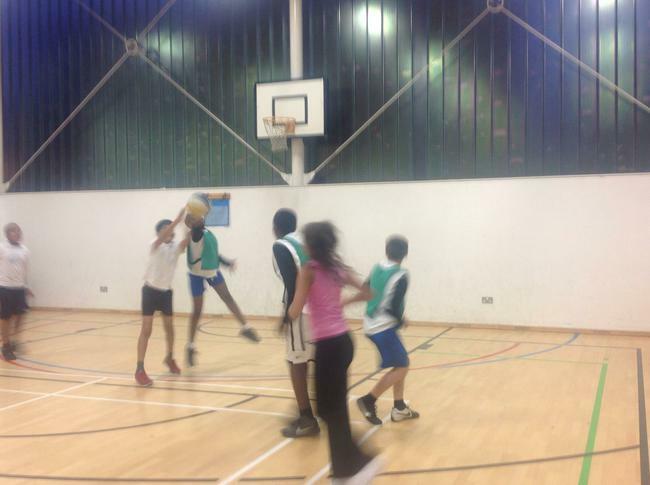 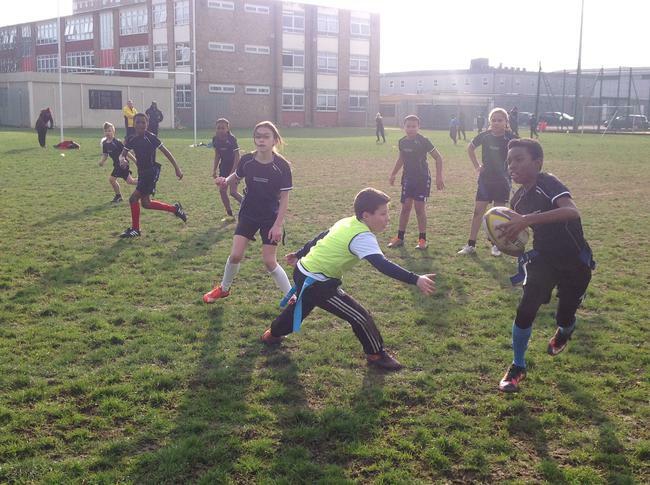 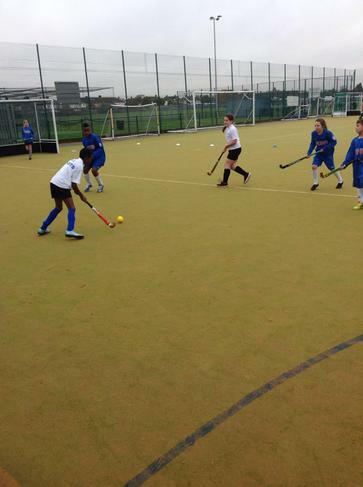 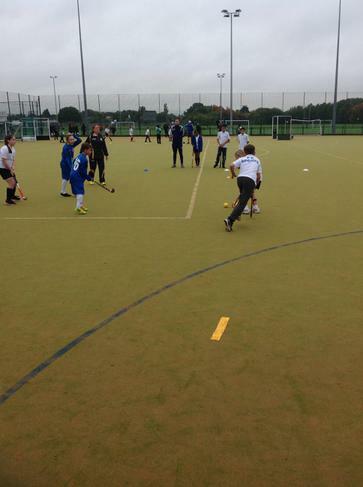 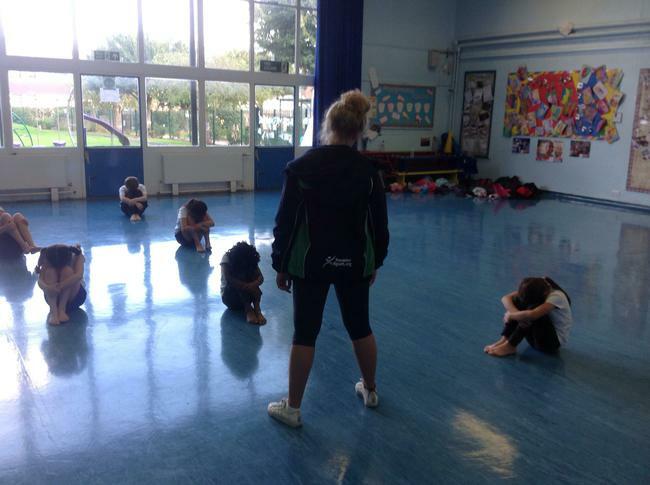 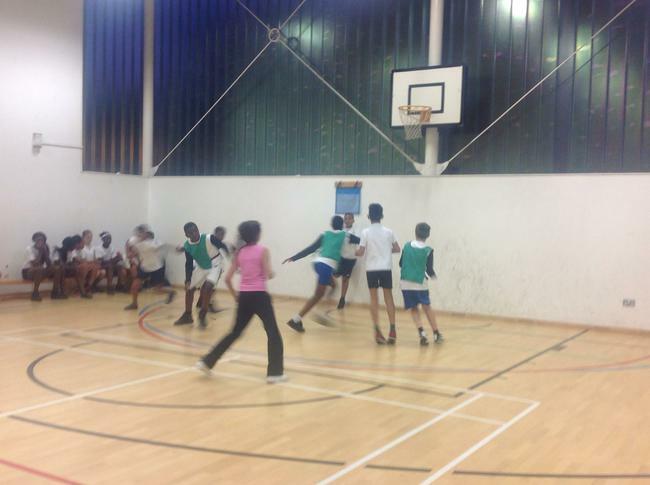 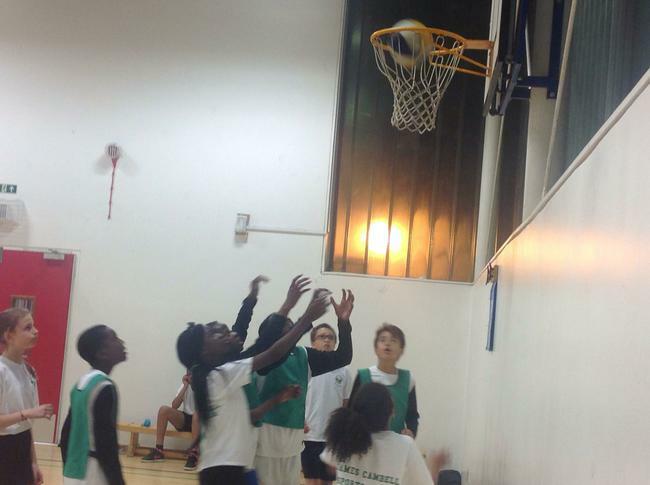 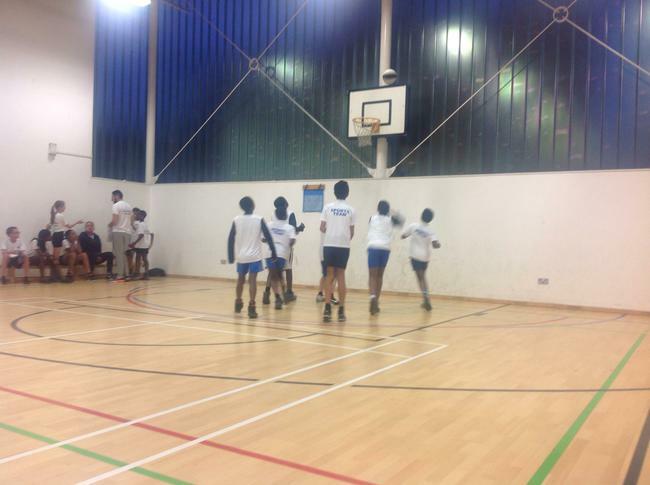 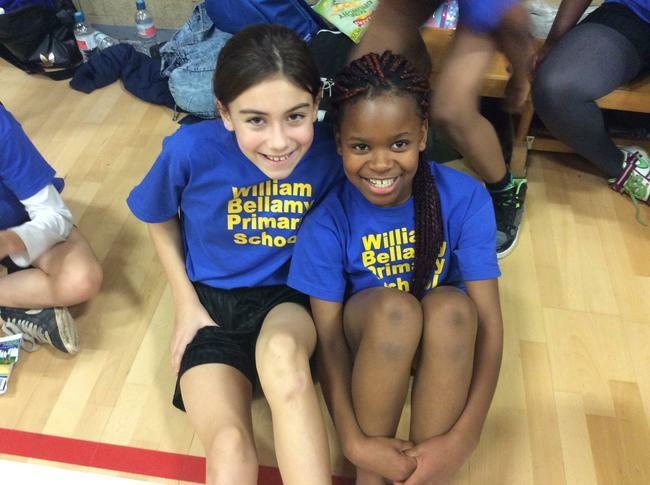 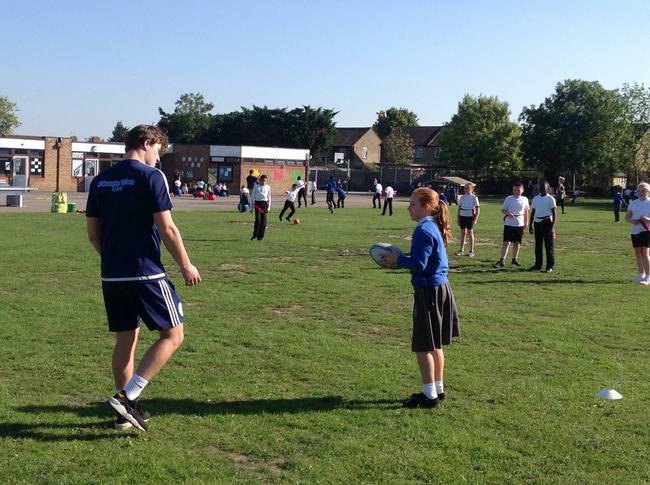 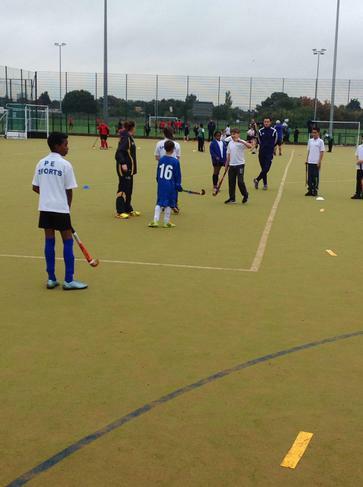 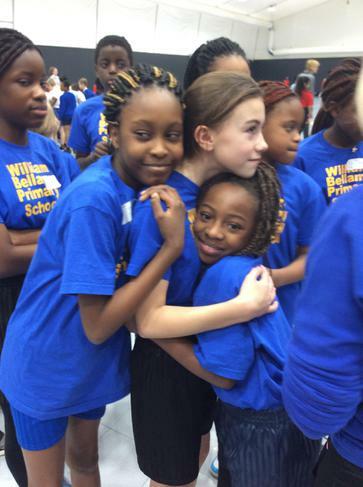 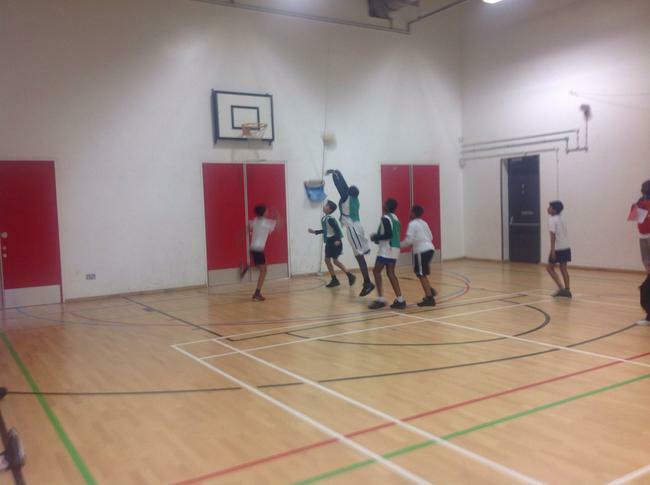 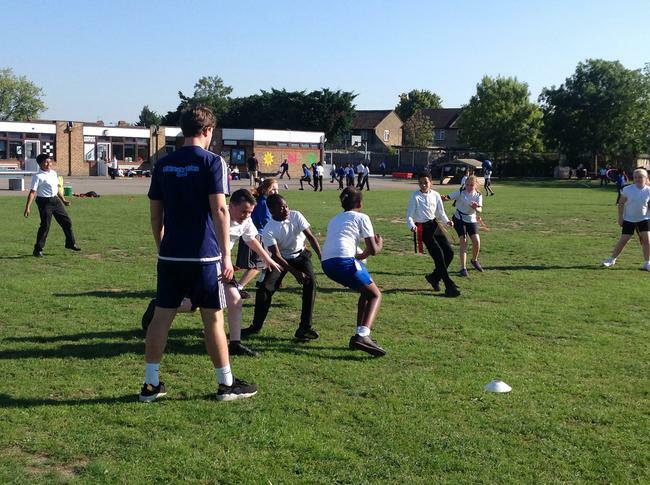 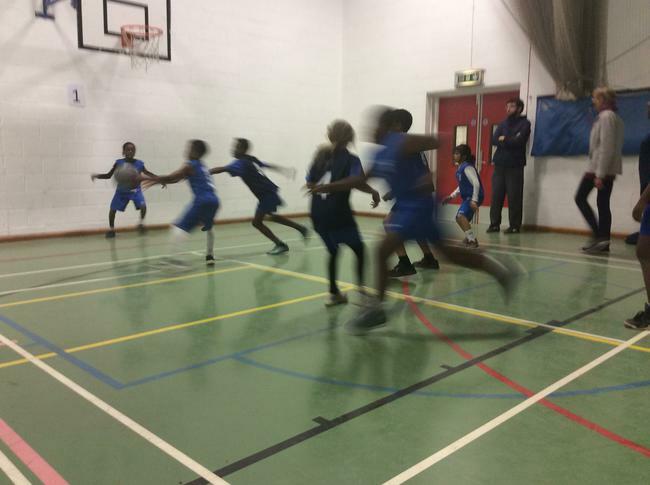 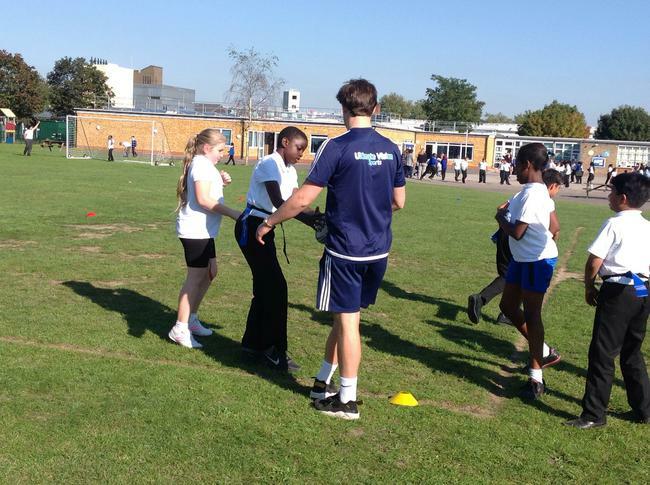 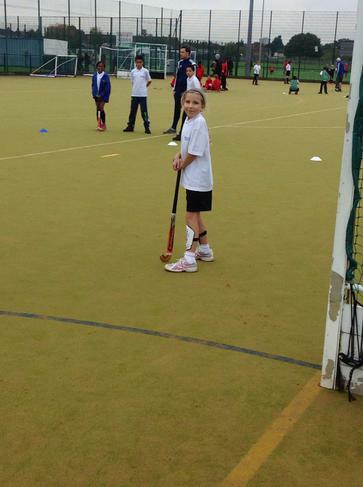 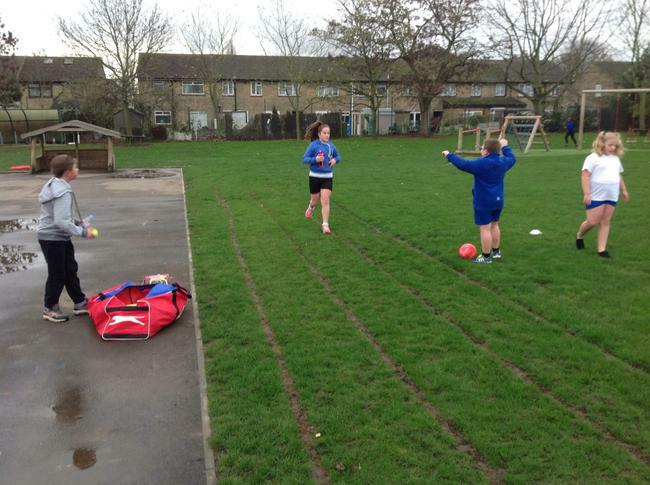 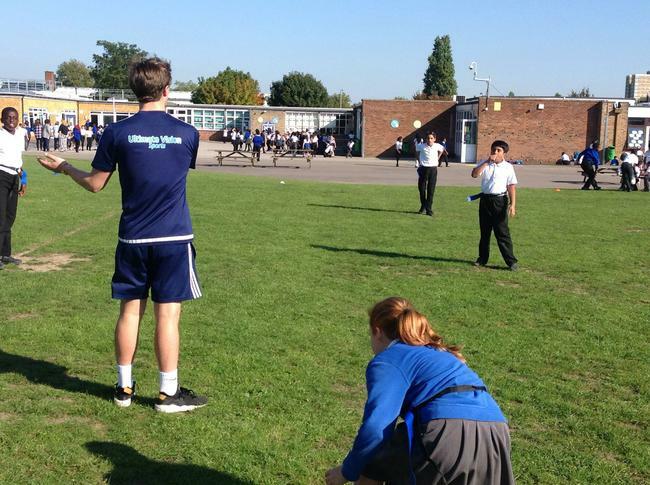 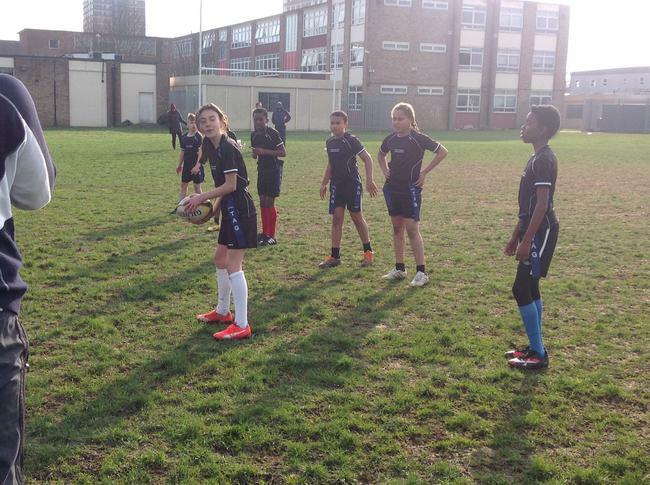 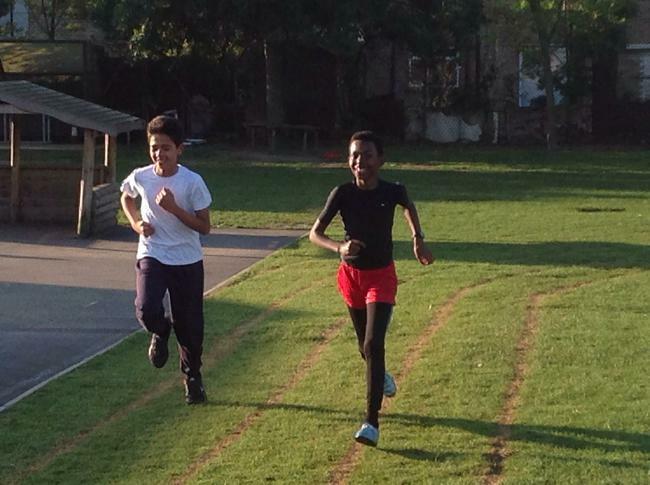 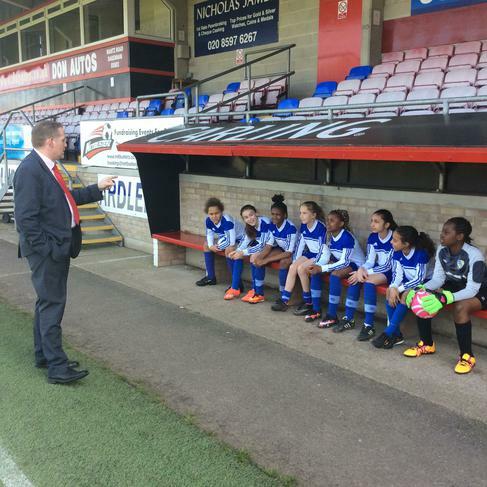 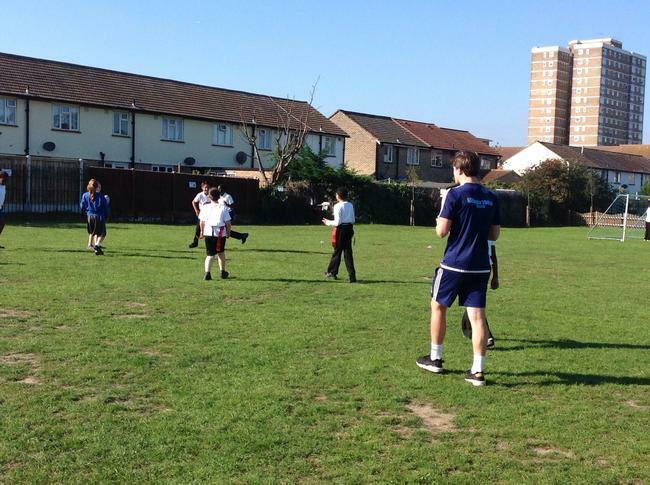 At William Bellamy we aim to provide our pupils with high quality extra curricular activities. 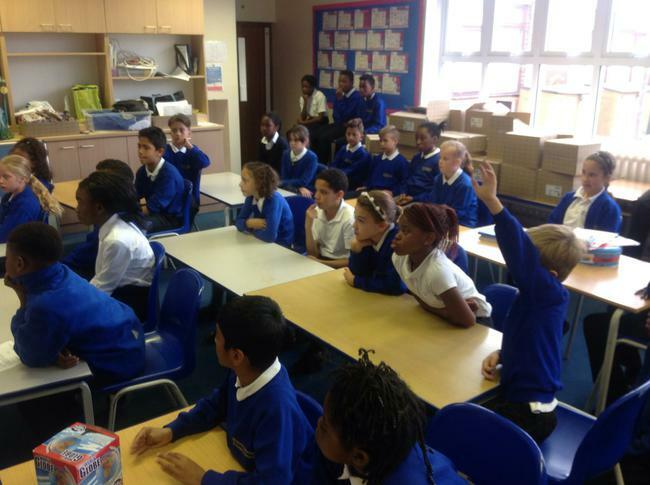 We regularly observe the companies and agencies we work with. 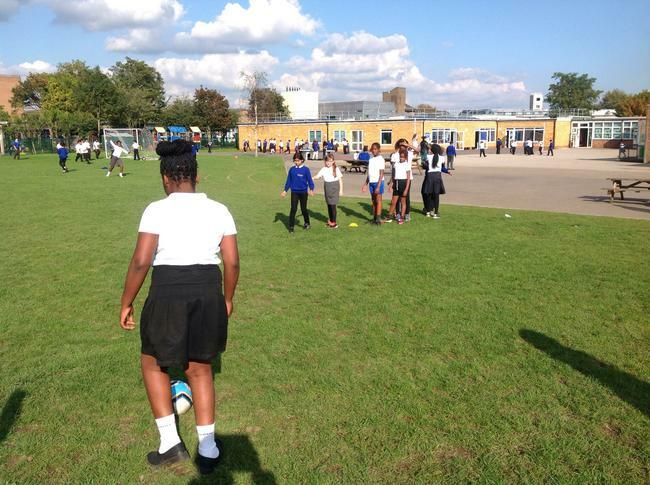 For this reason we only arrange an agreement with external providers for one term unless we feel it is in our pupils best interests to extend this.